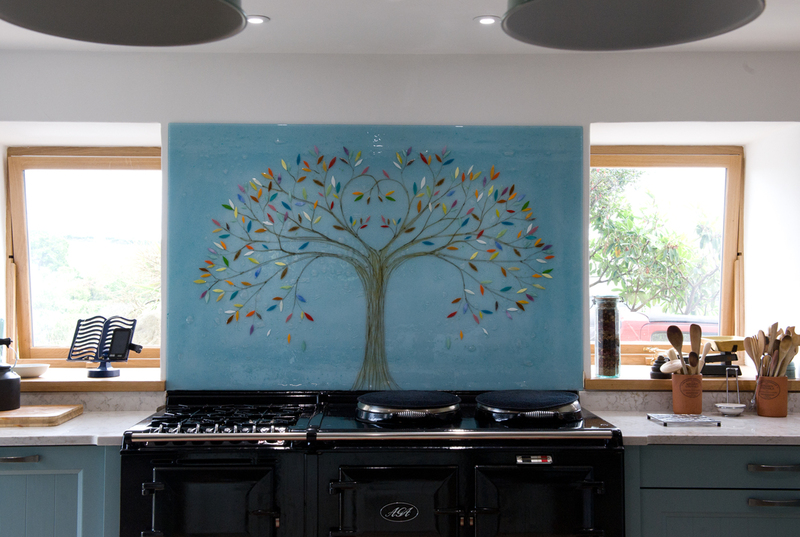 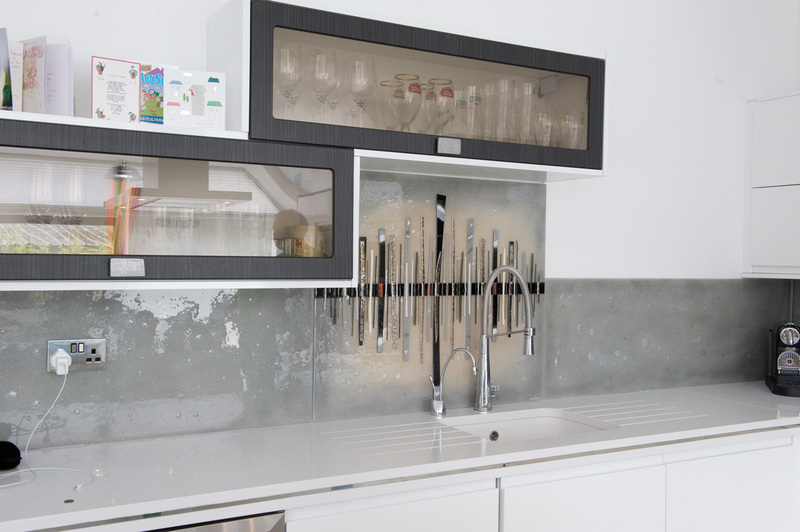 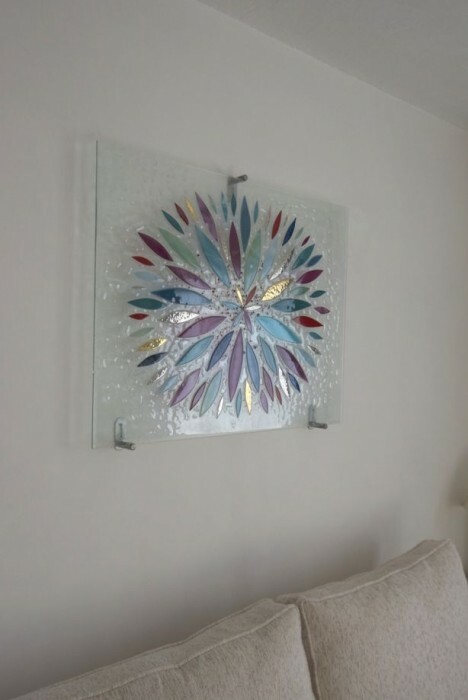 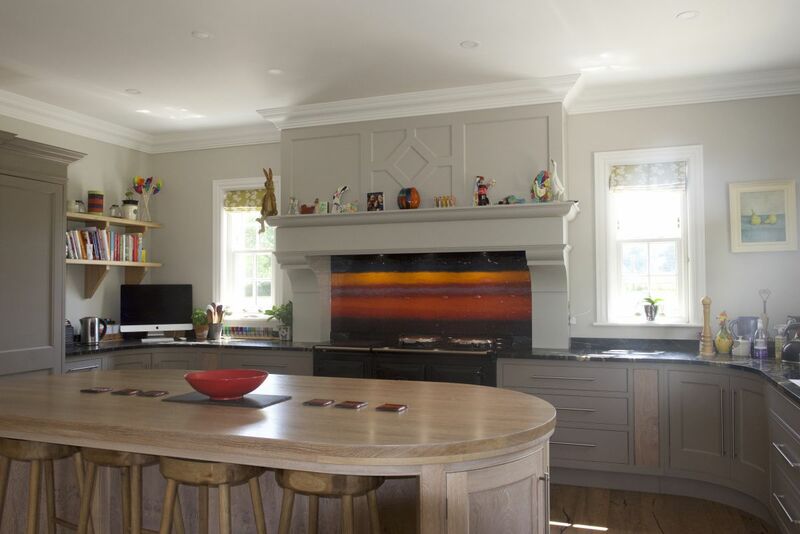 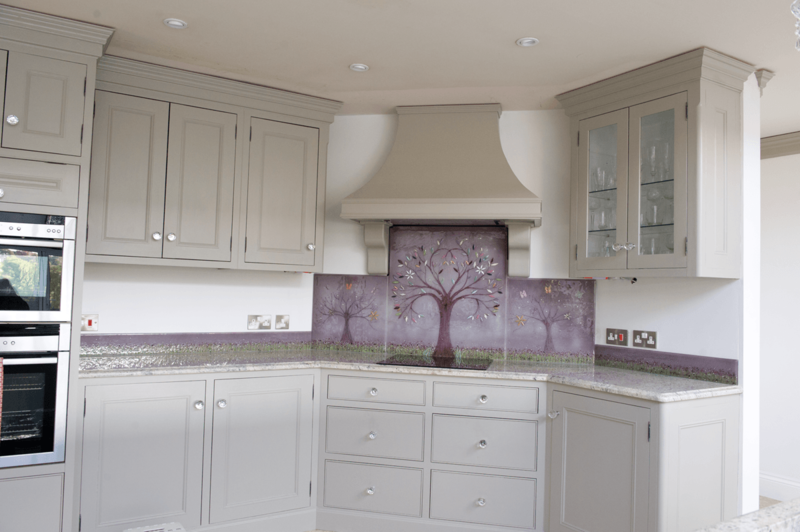 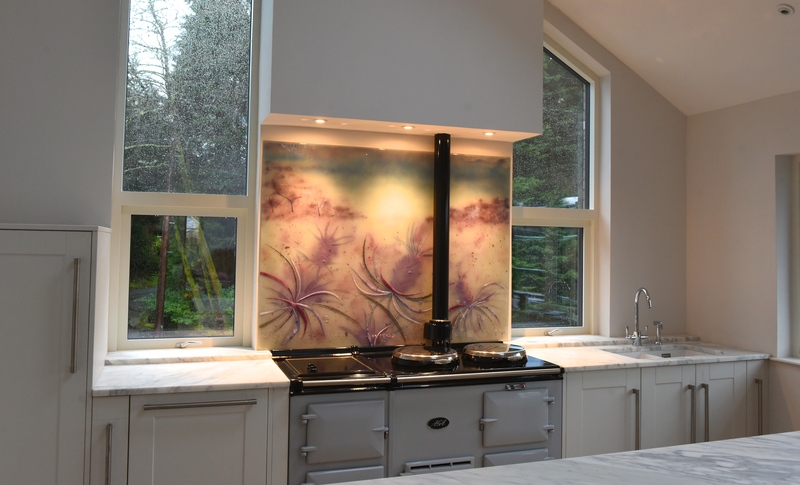 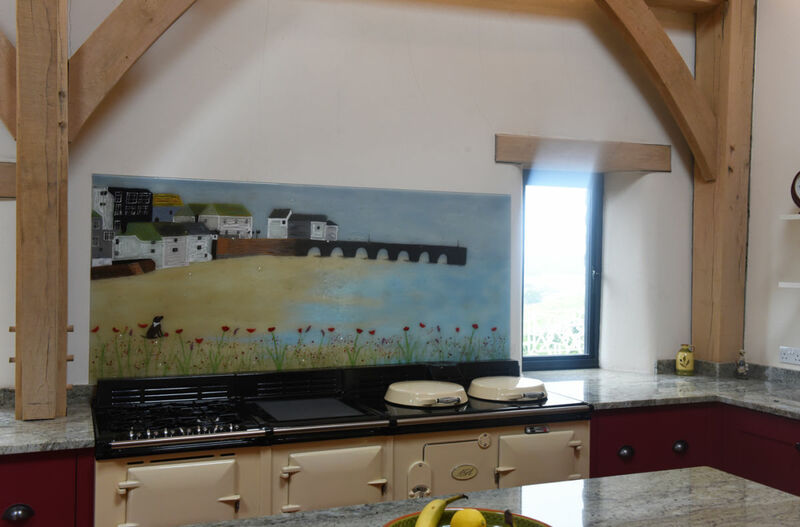 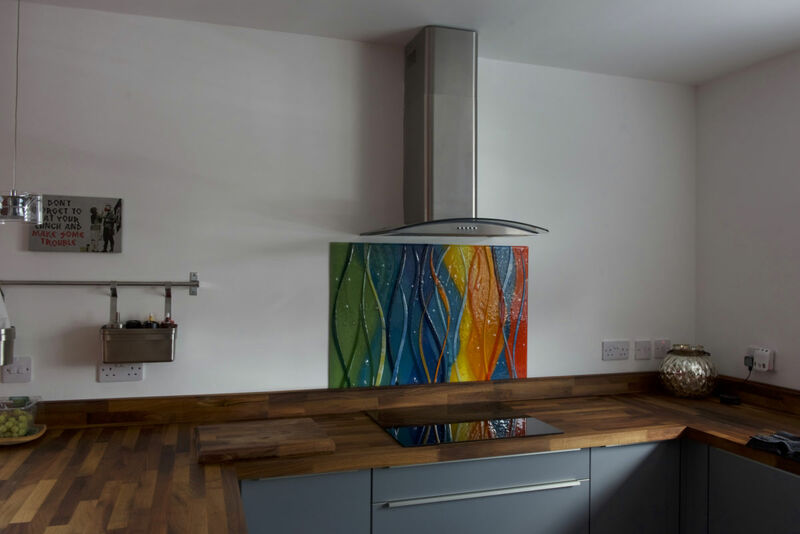 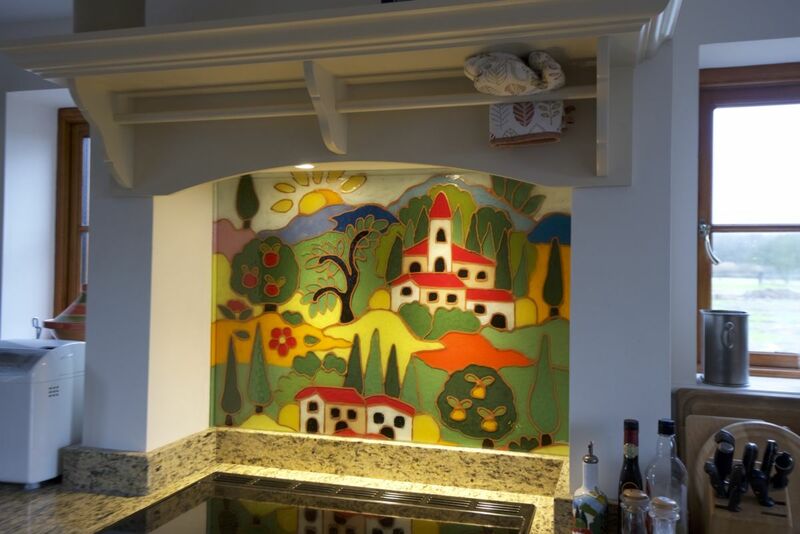 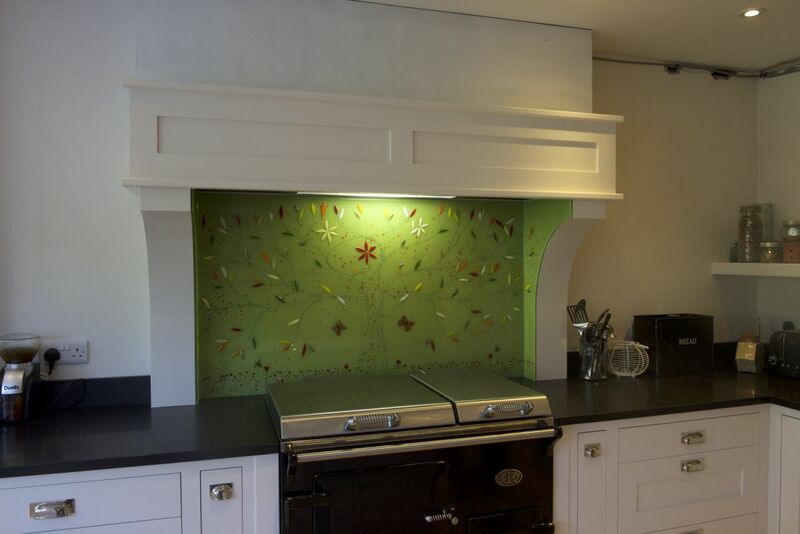 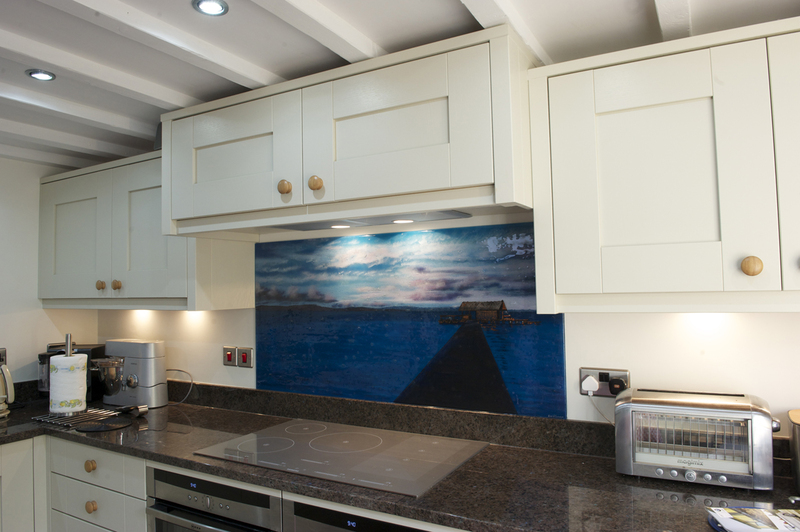 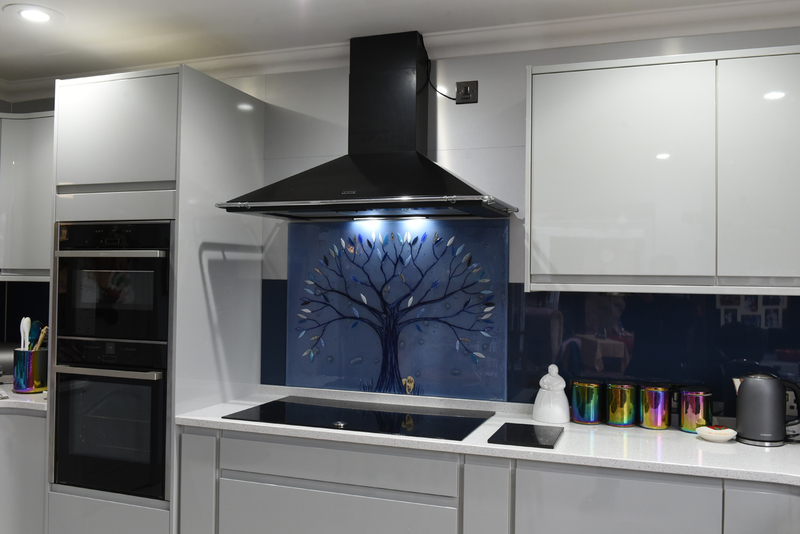 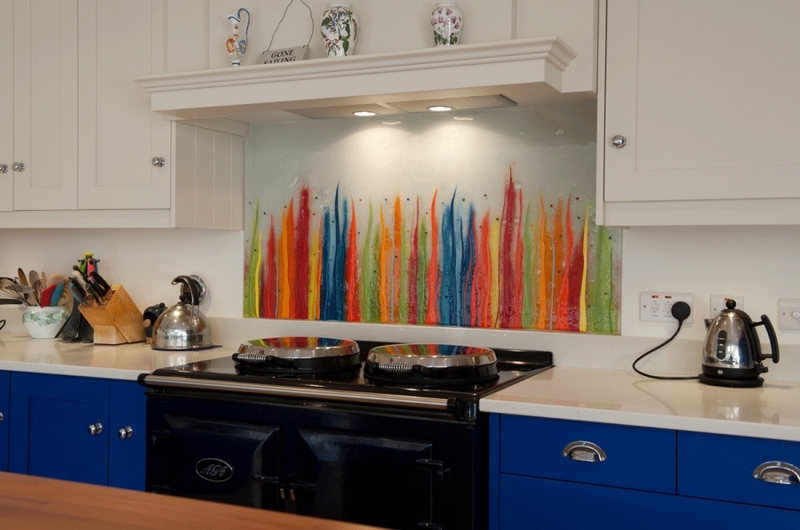 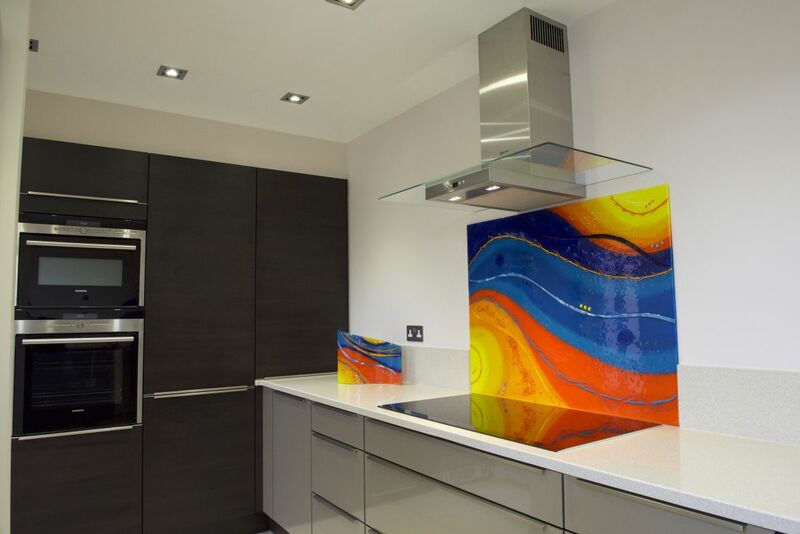 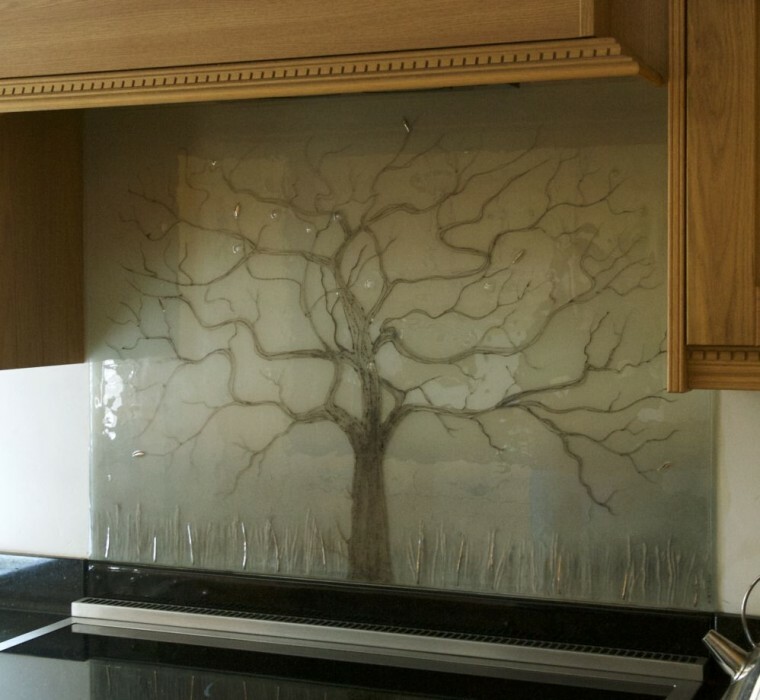 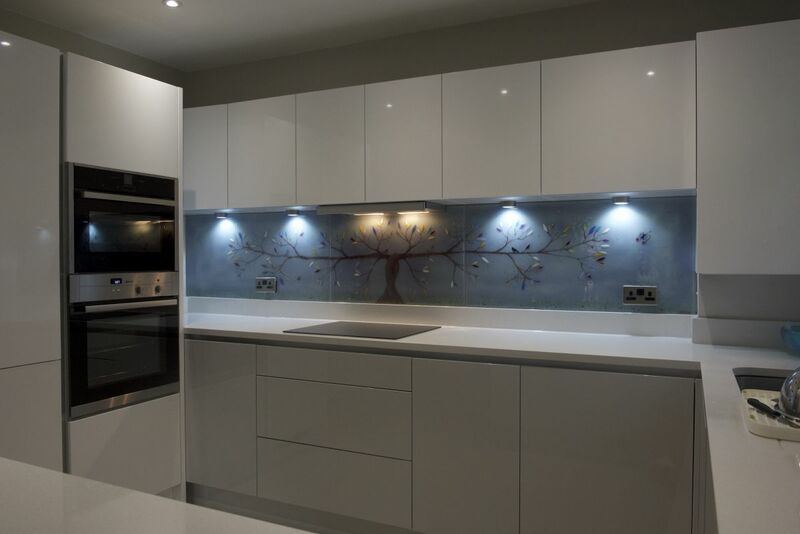 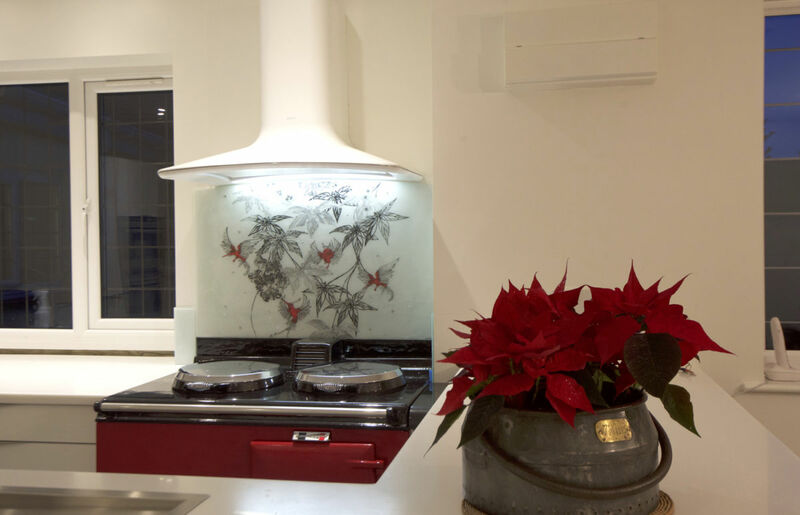 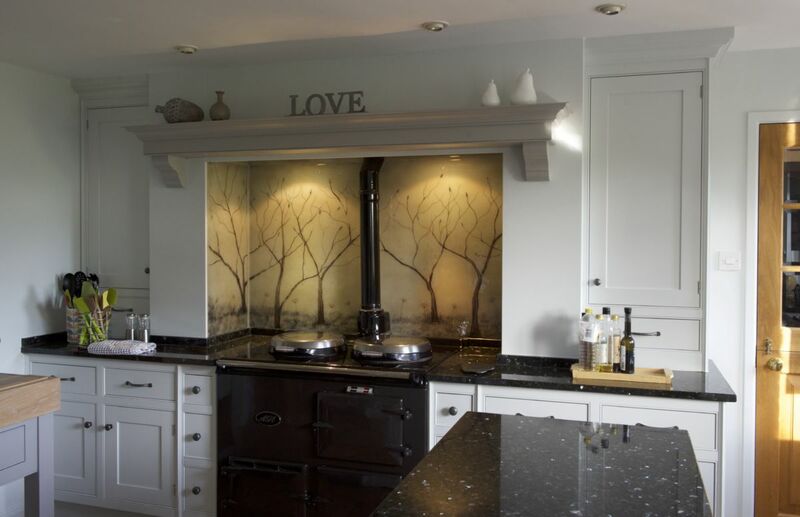 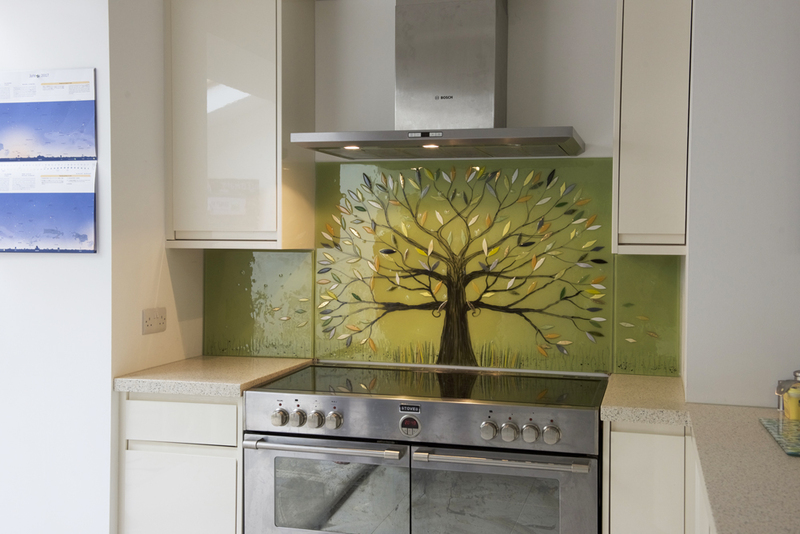 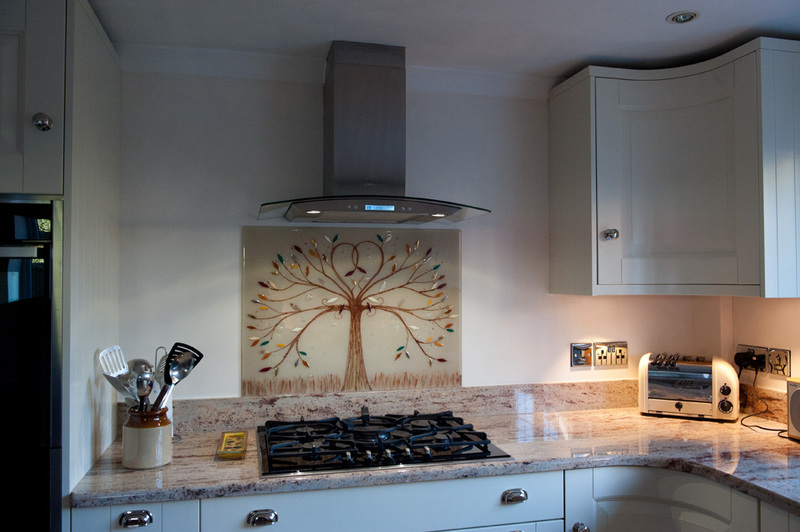 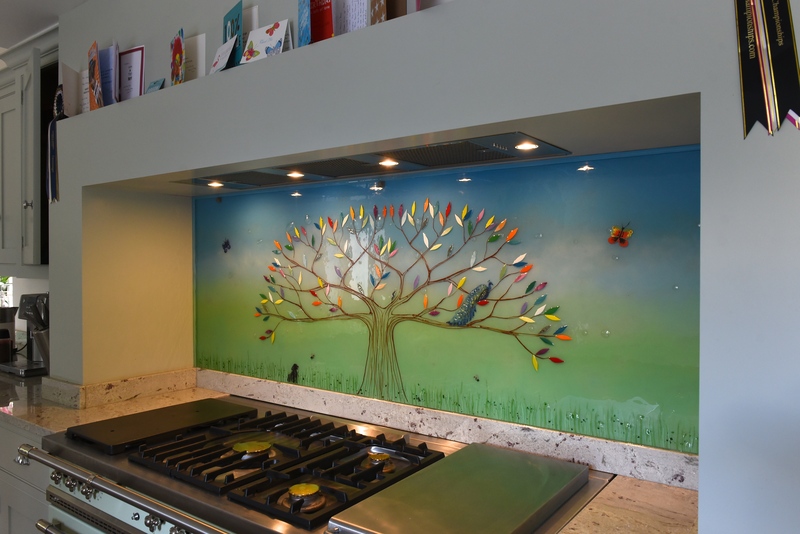 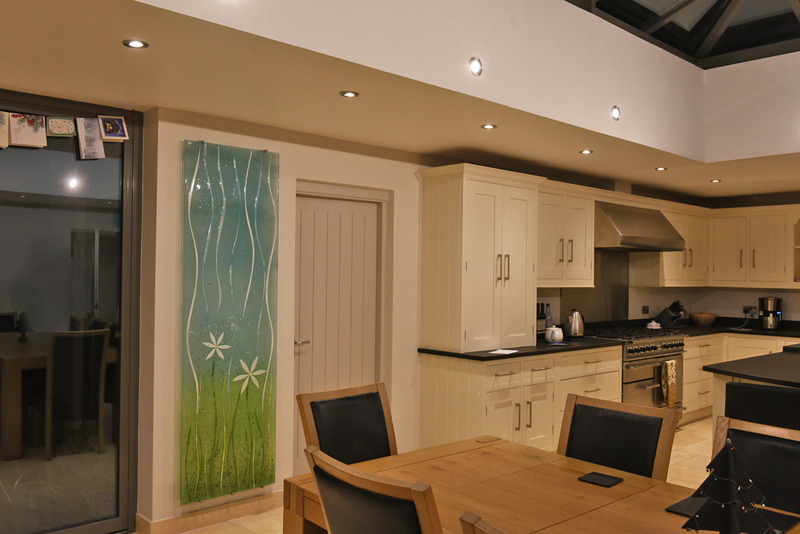 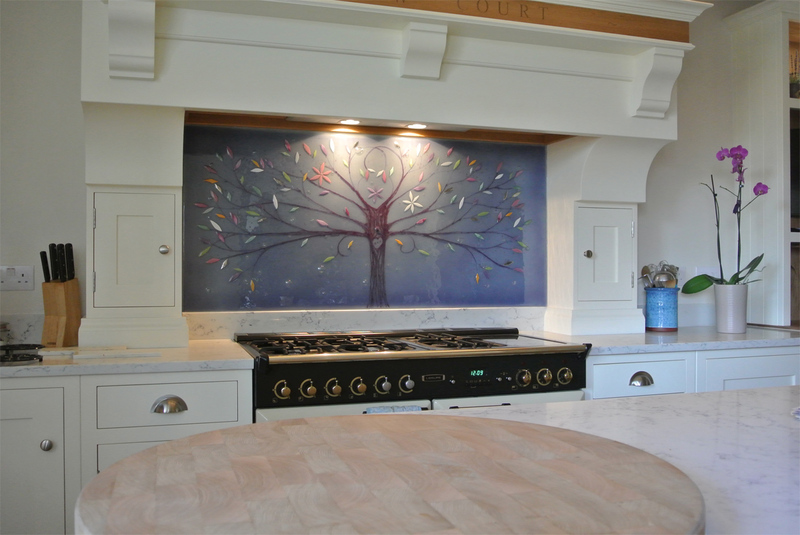 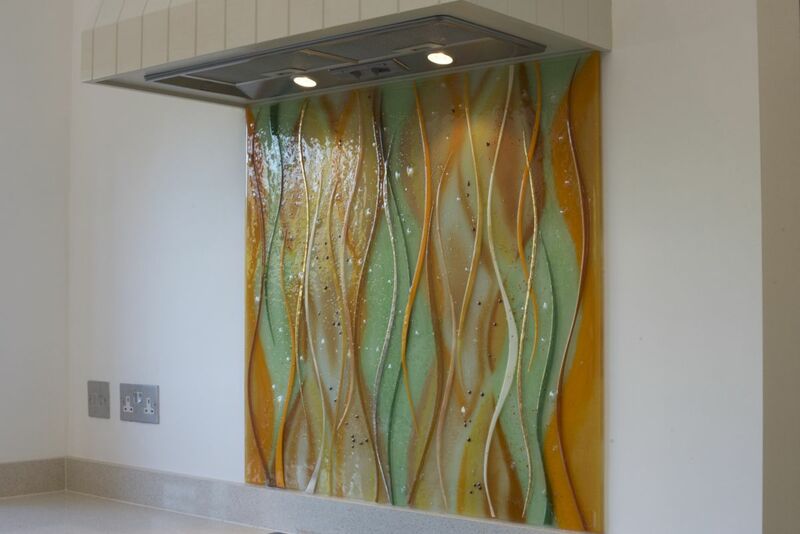 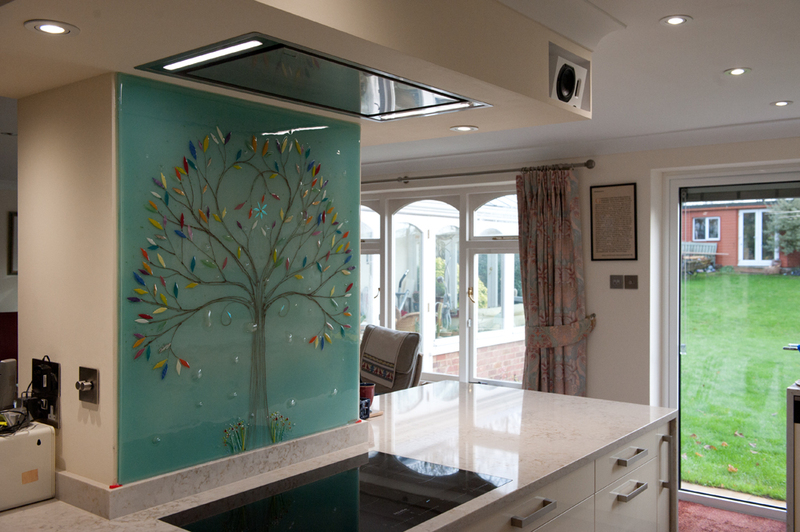 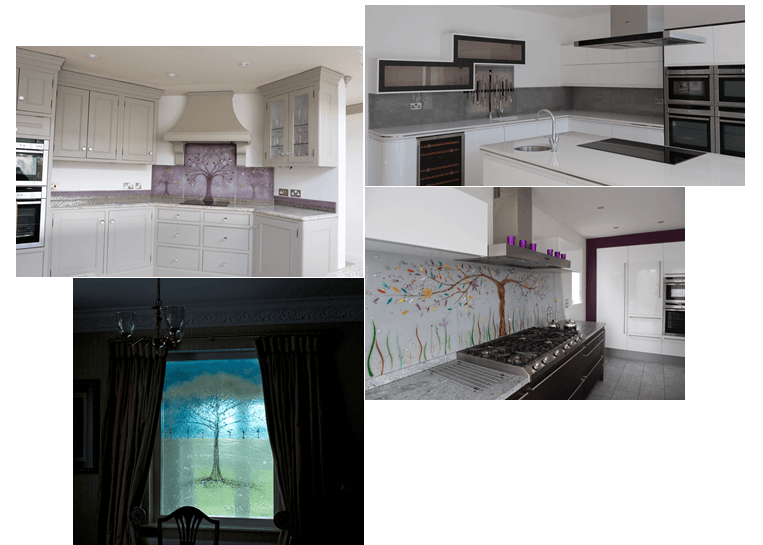 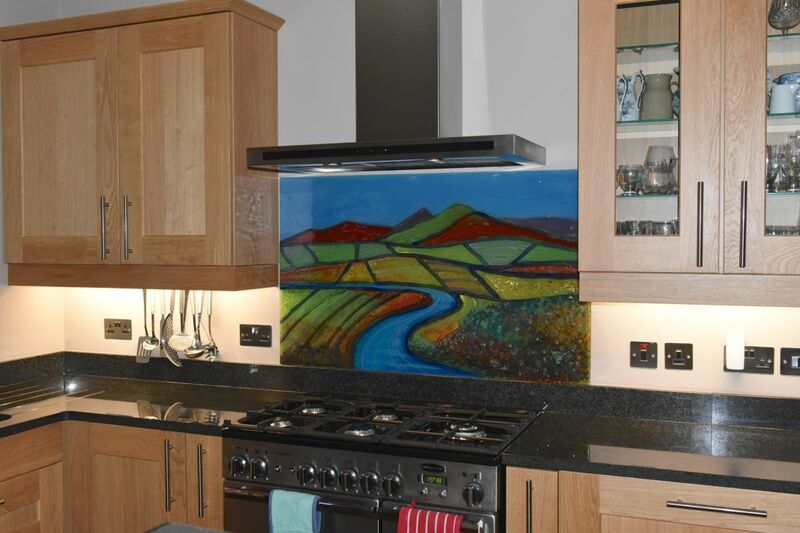 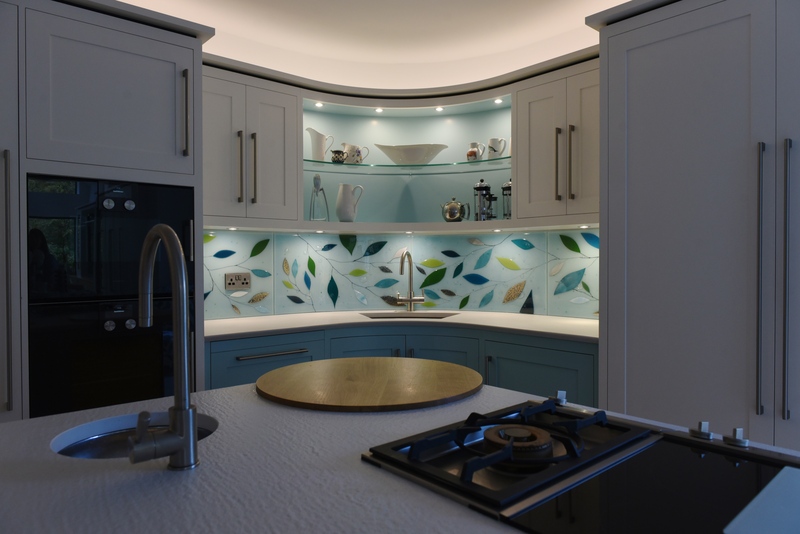 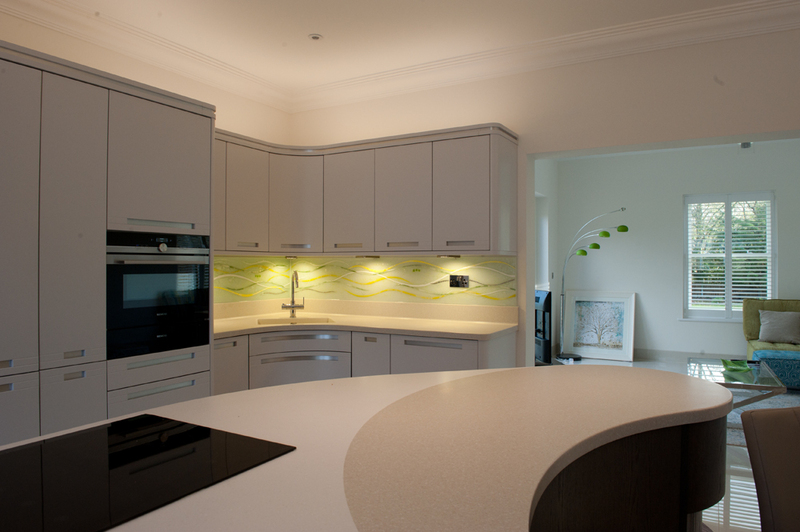 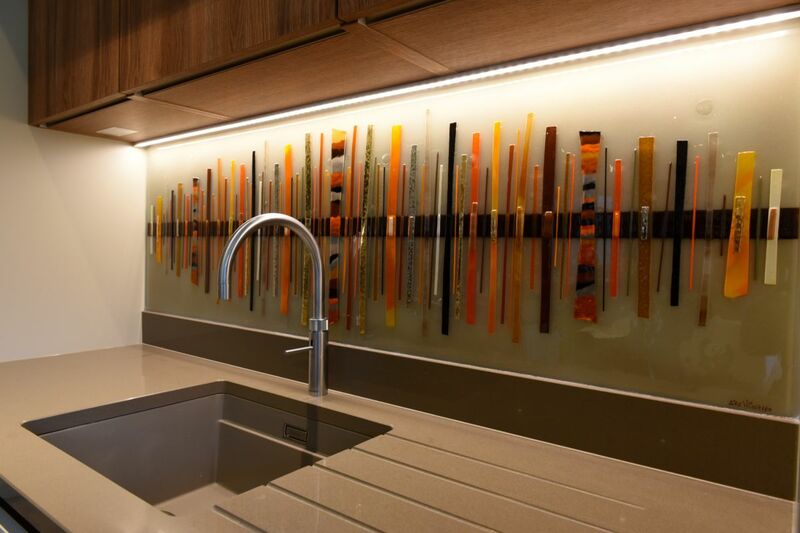 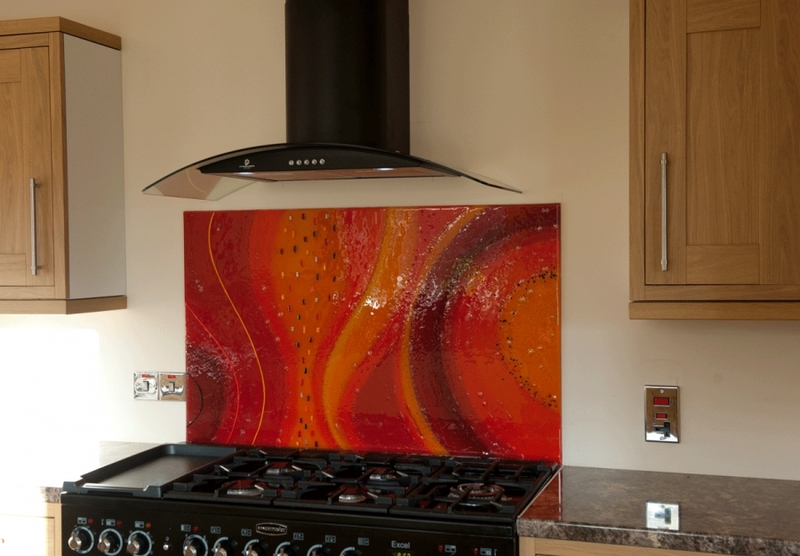 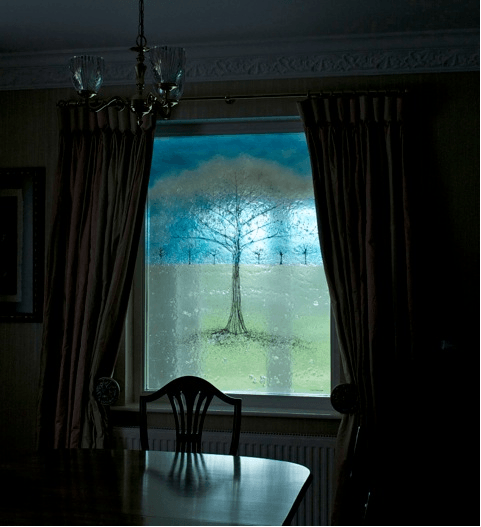 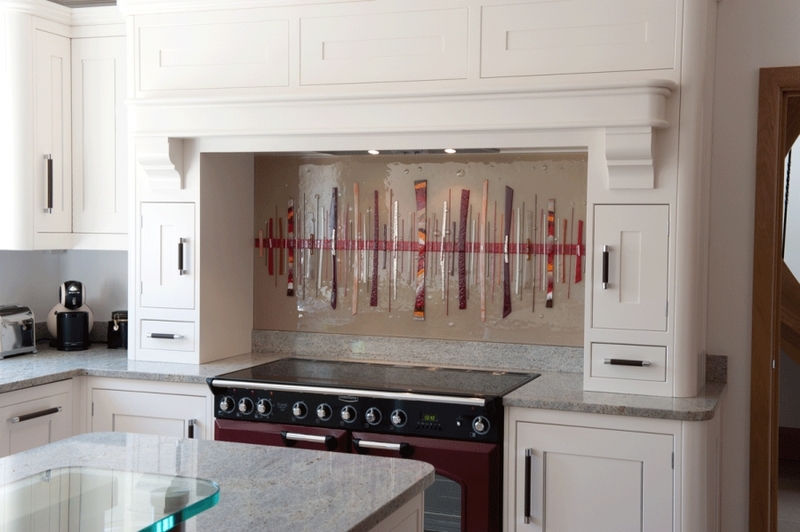 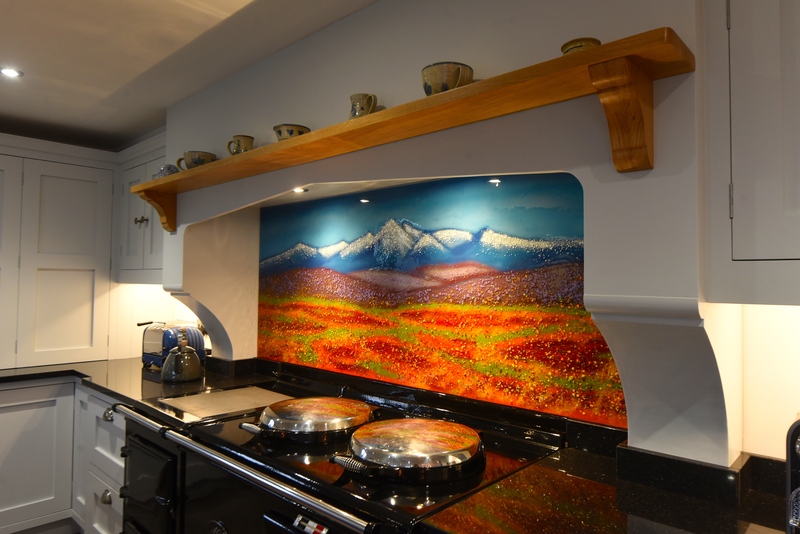 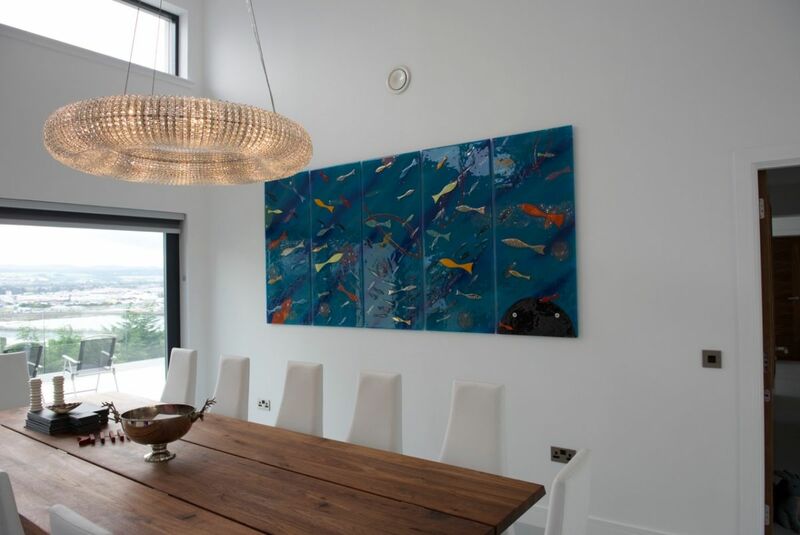 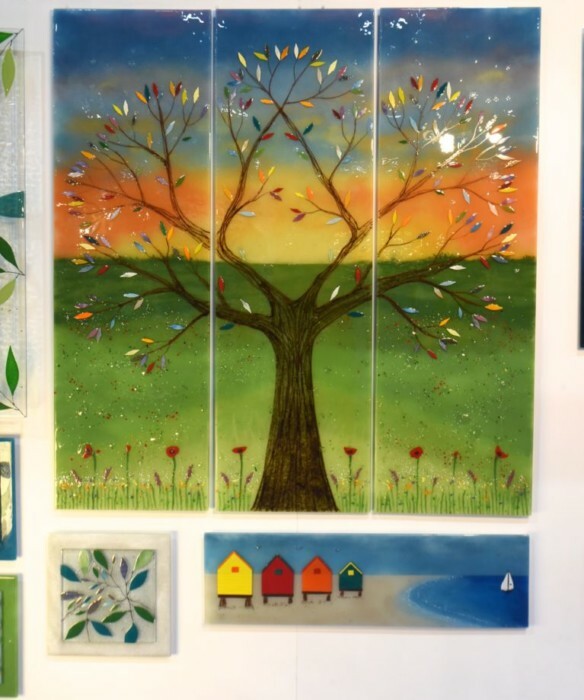 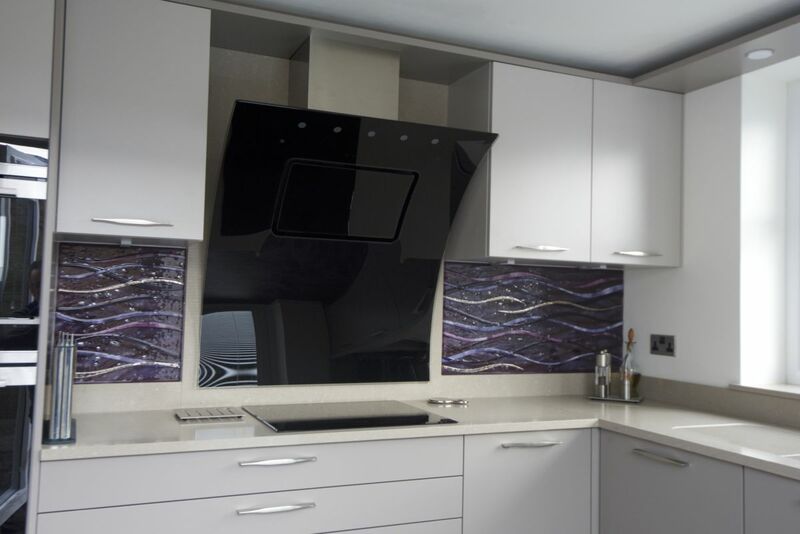 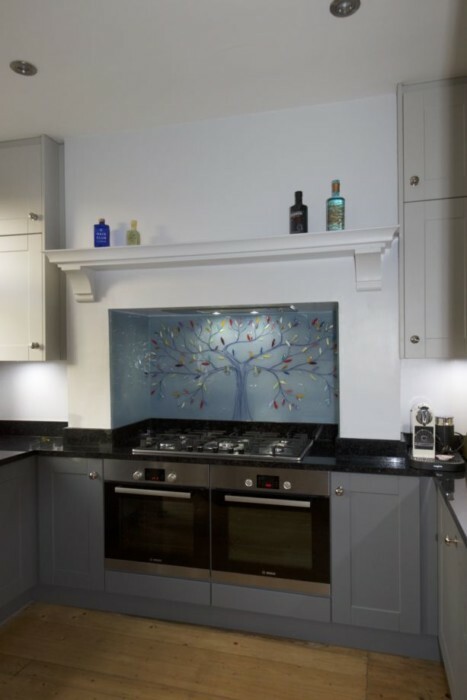 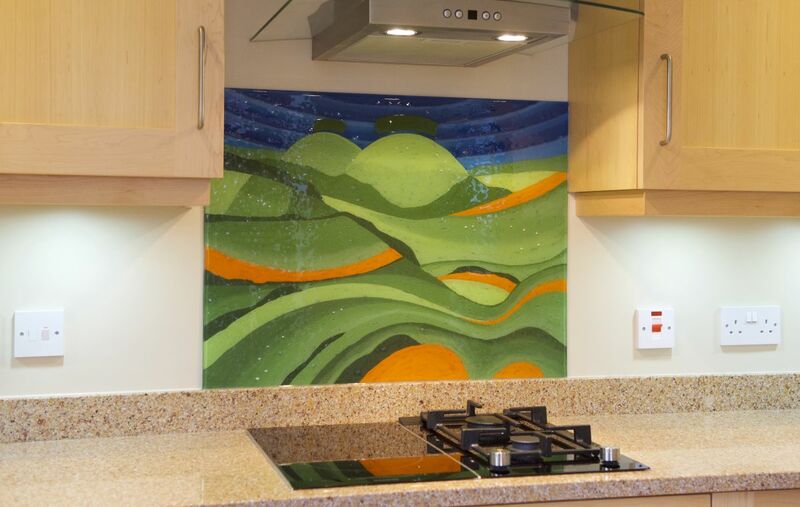 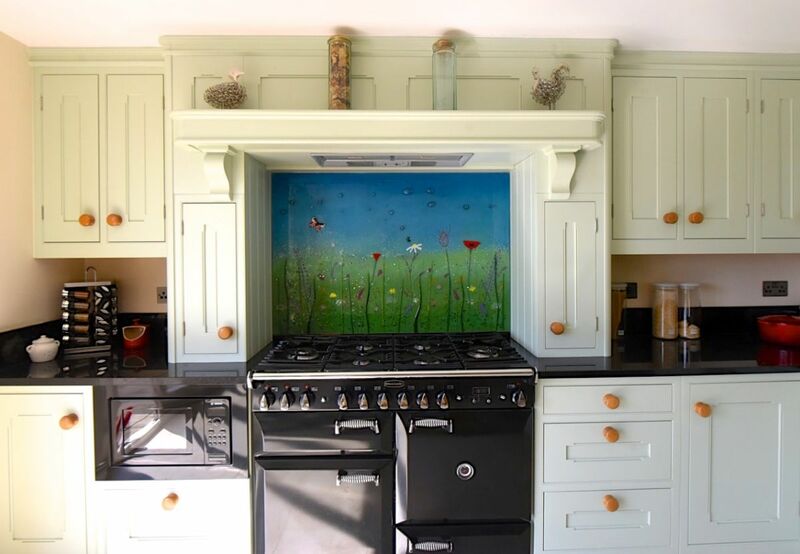 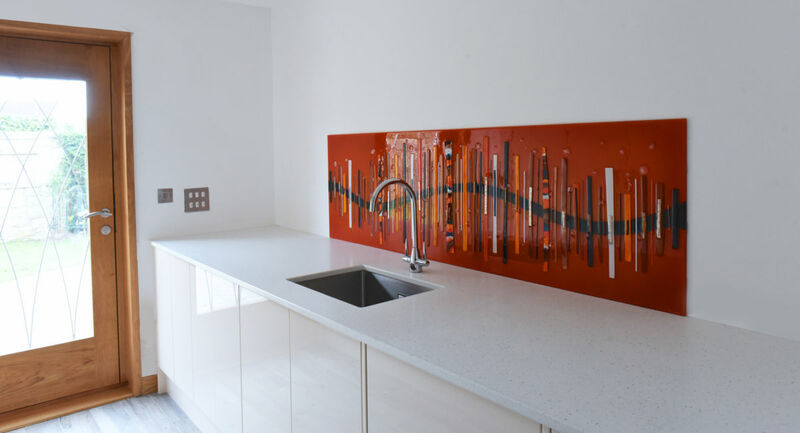 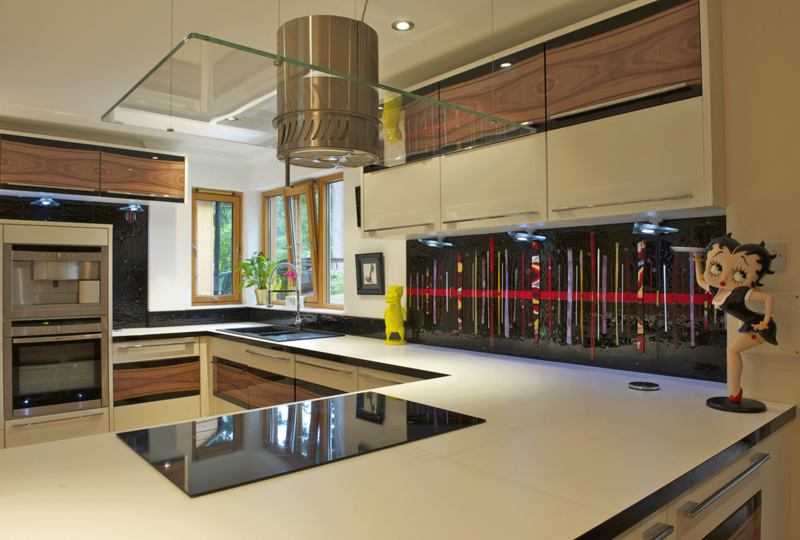 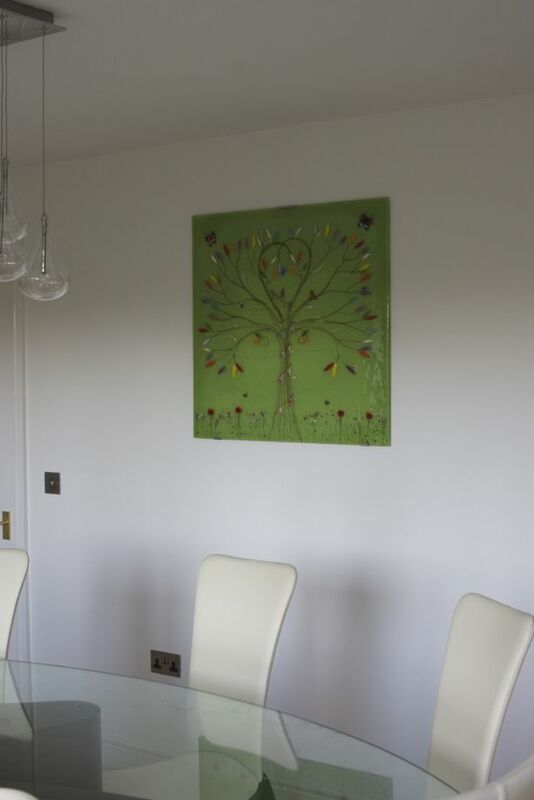 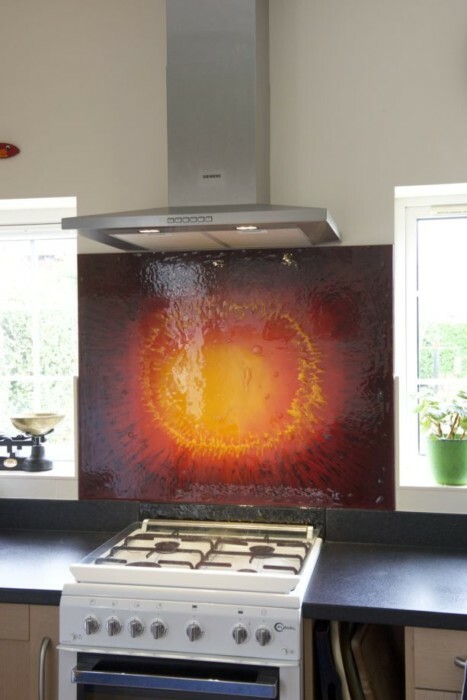 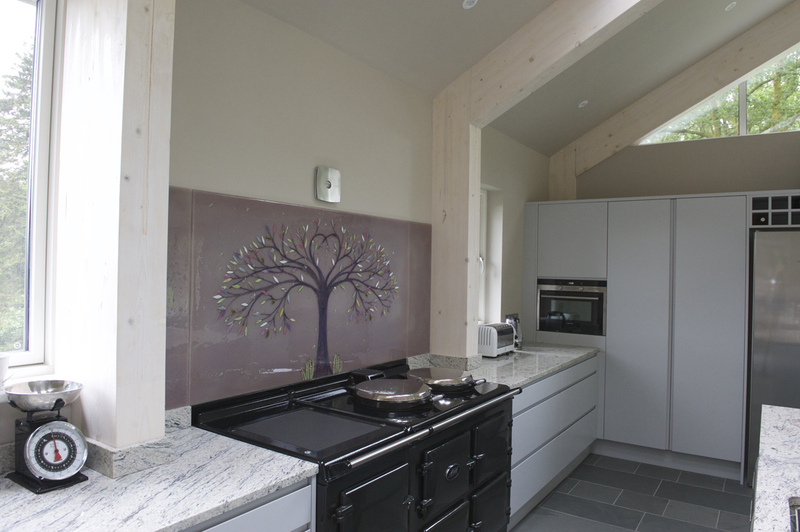 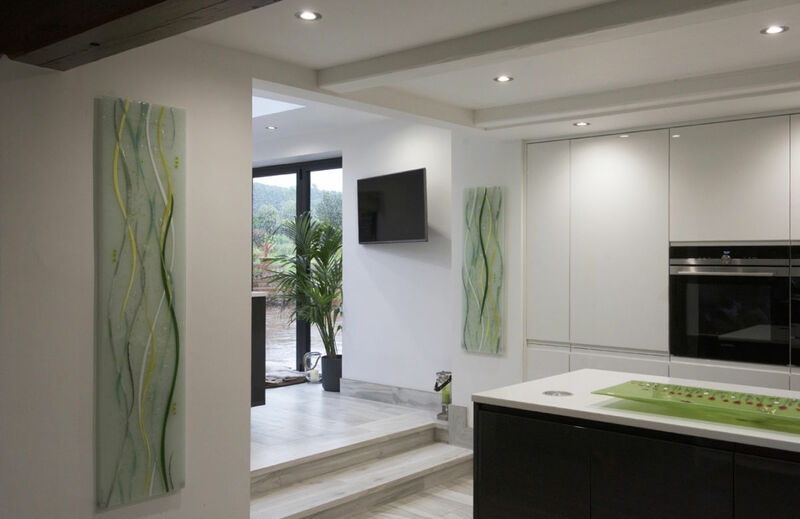 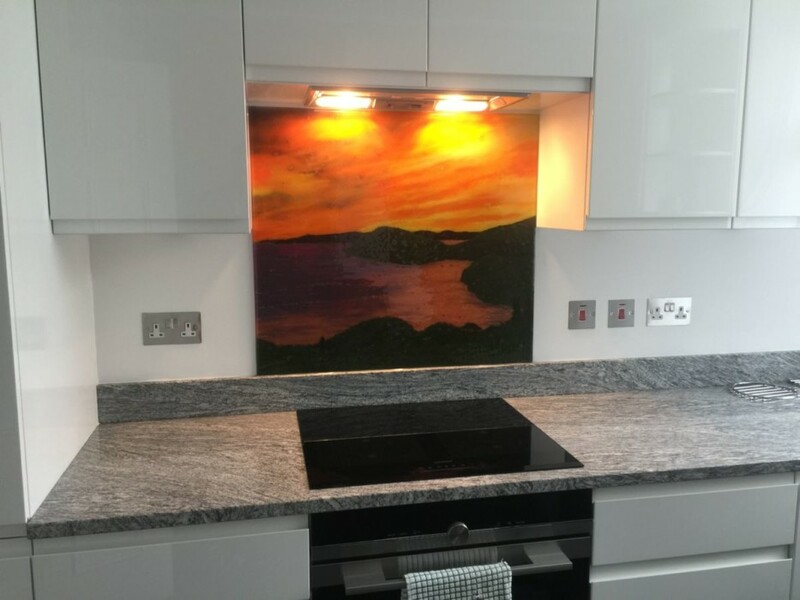 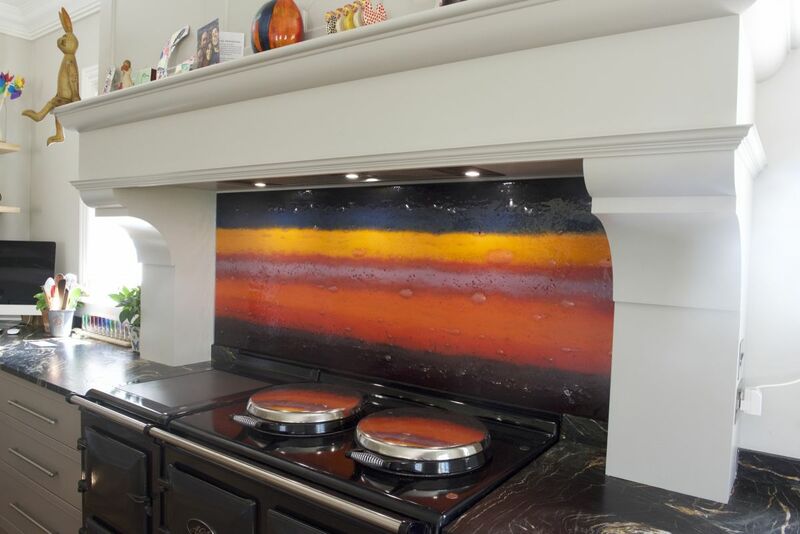 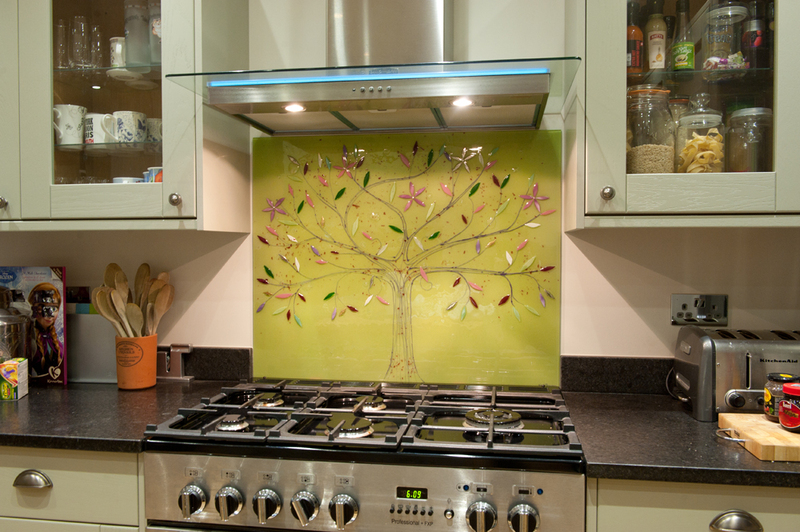 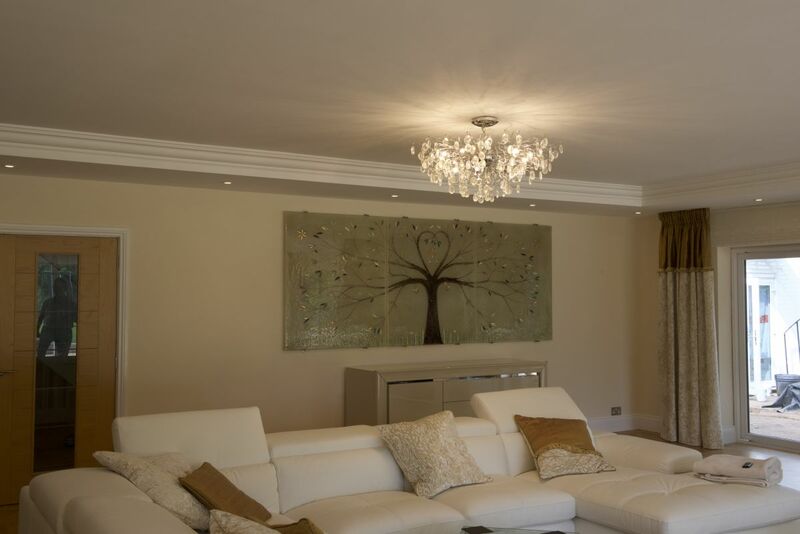 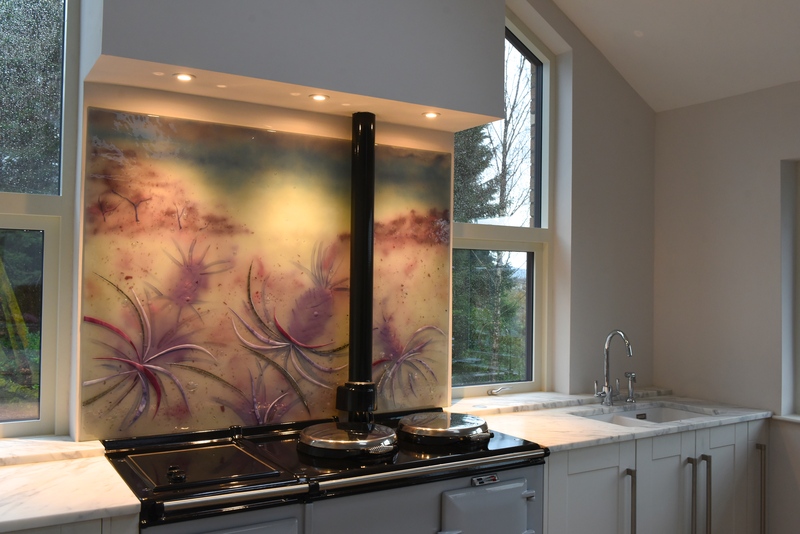 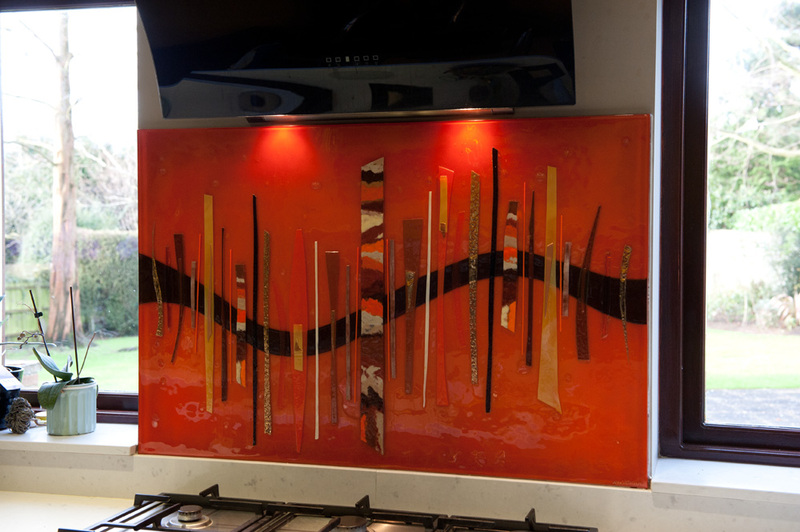 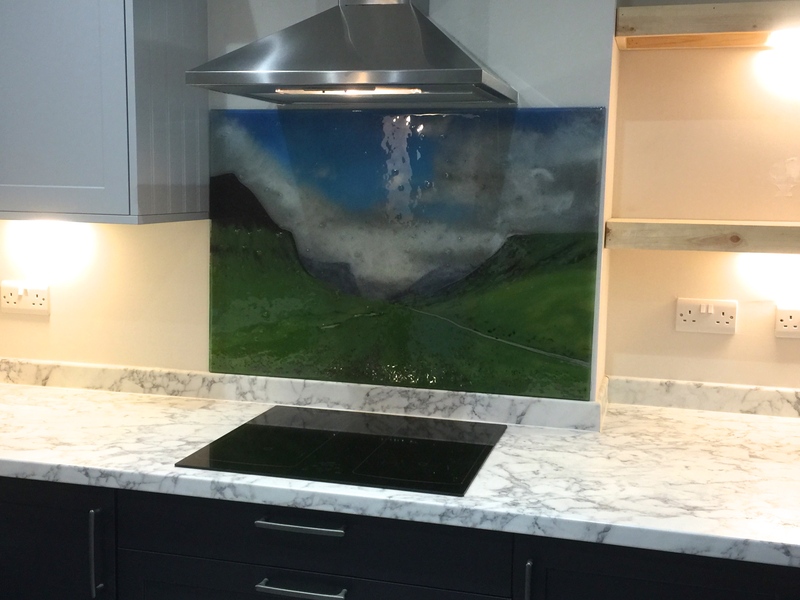 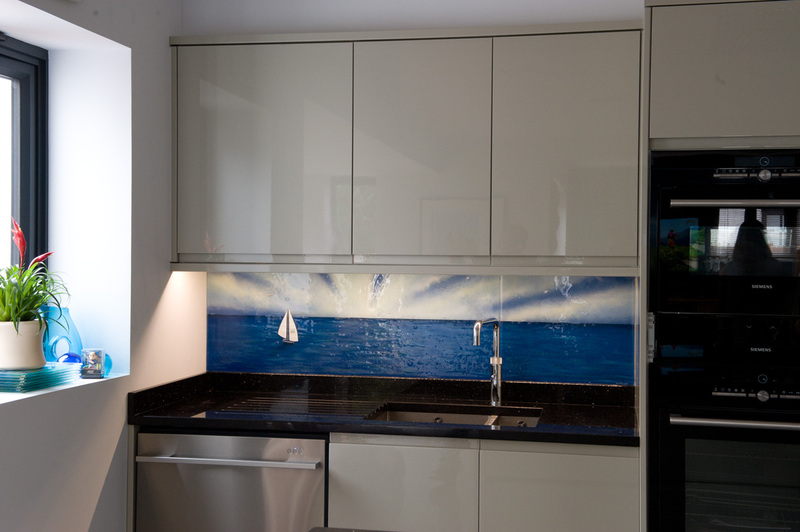 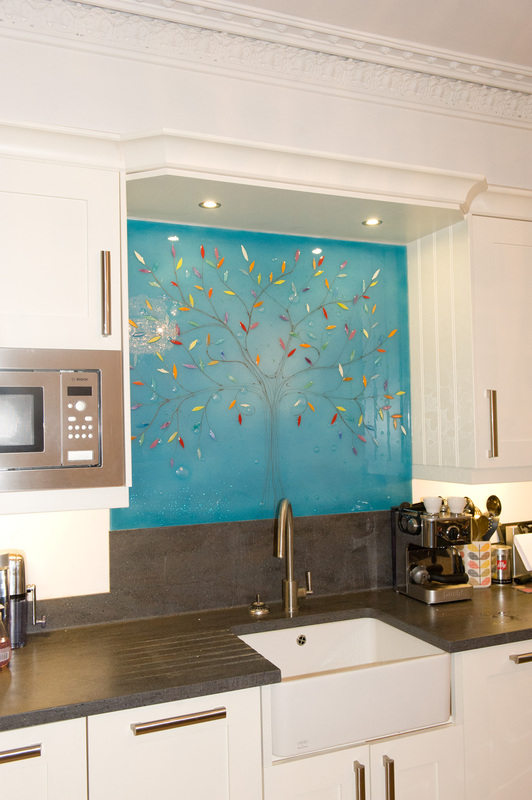 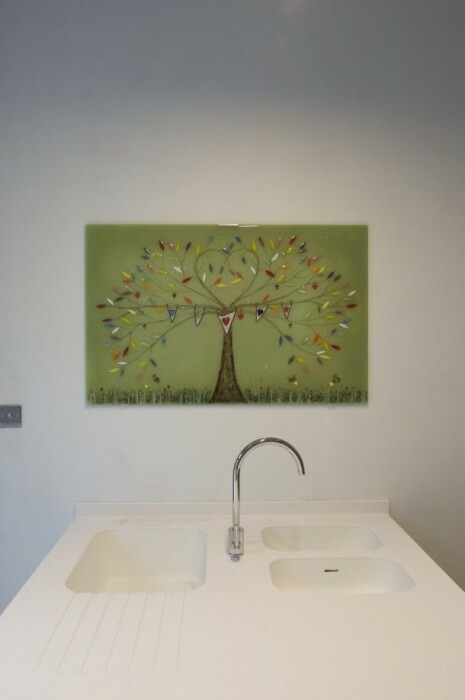 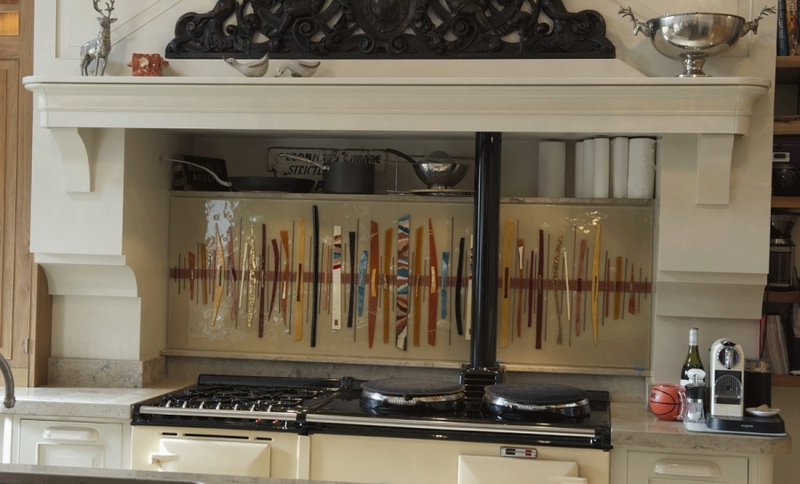 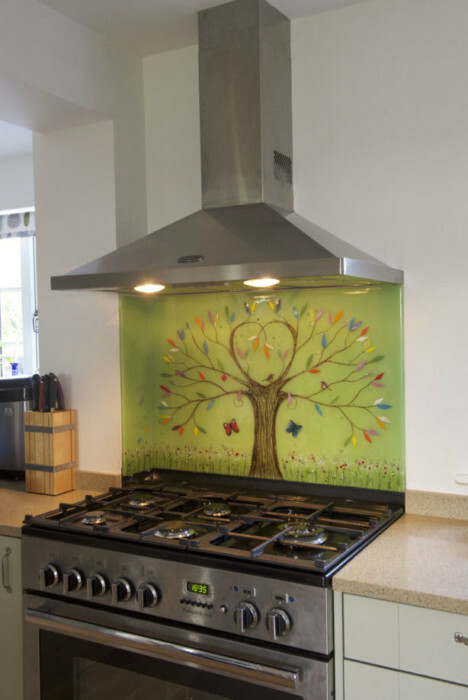 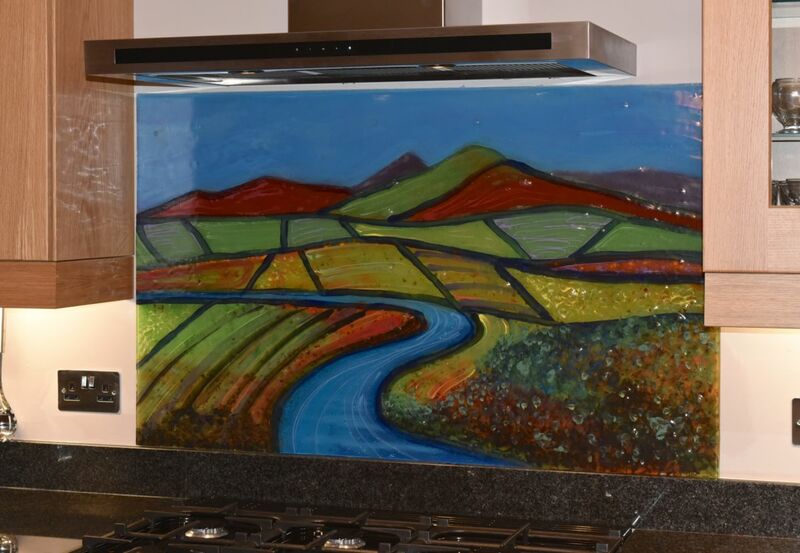 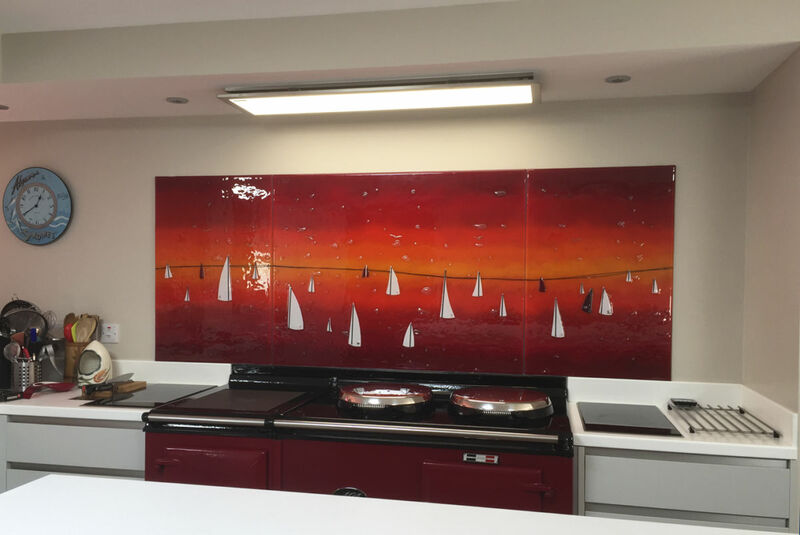 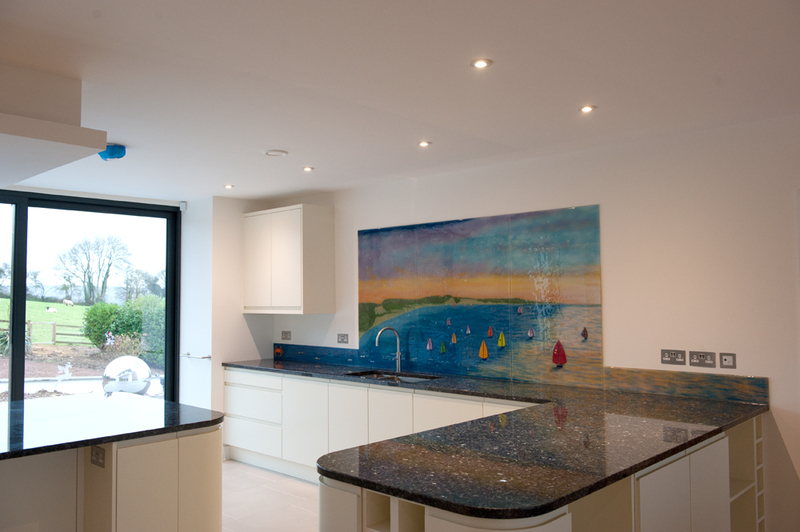 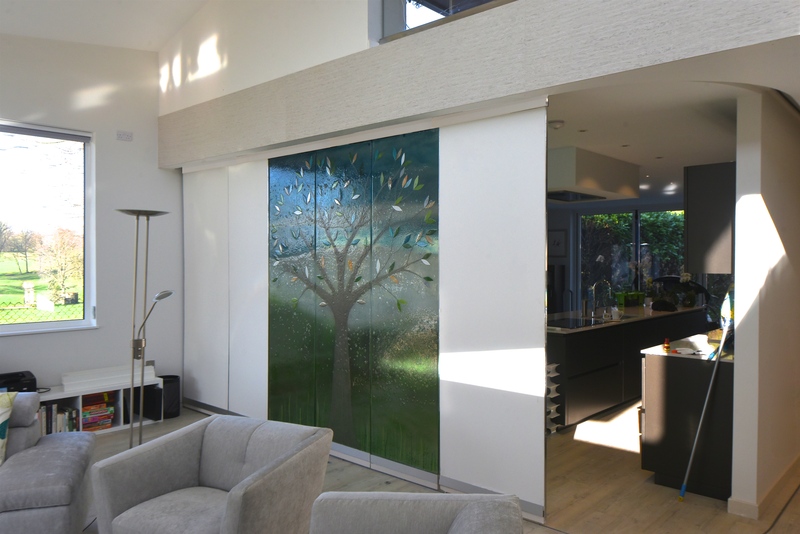 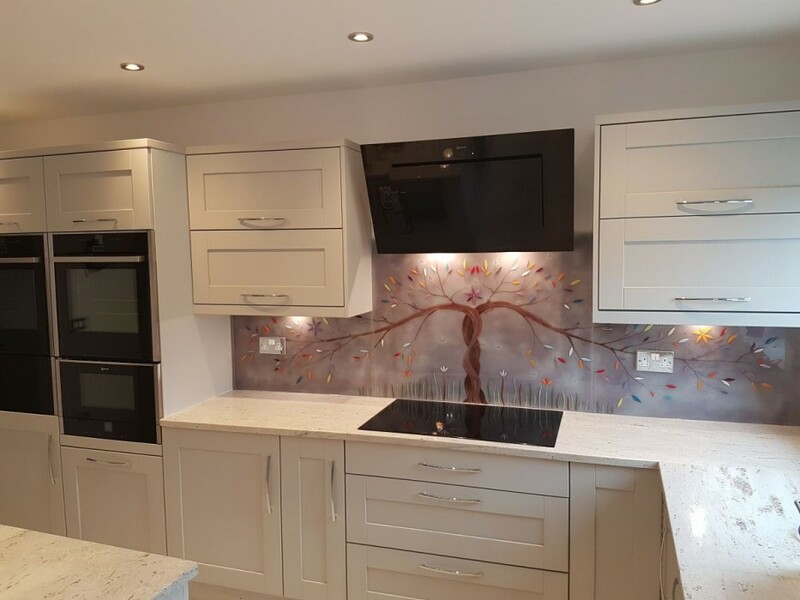 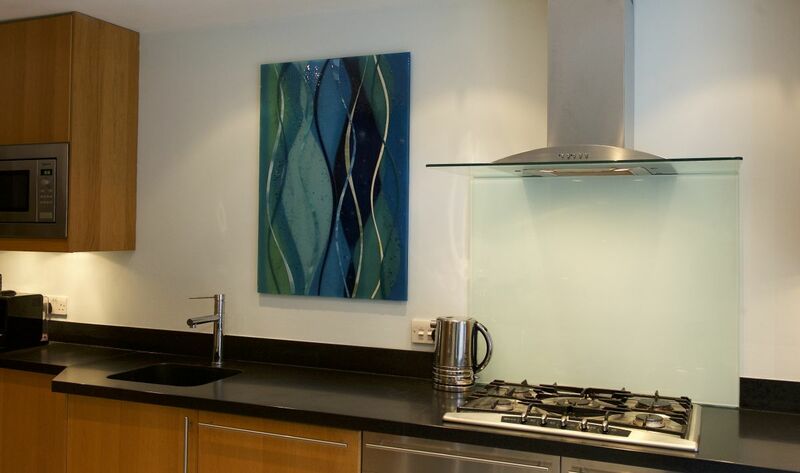 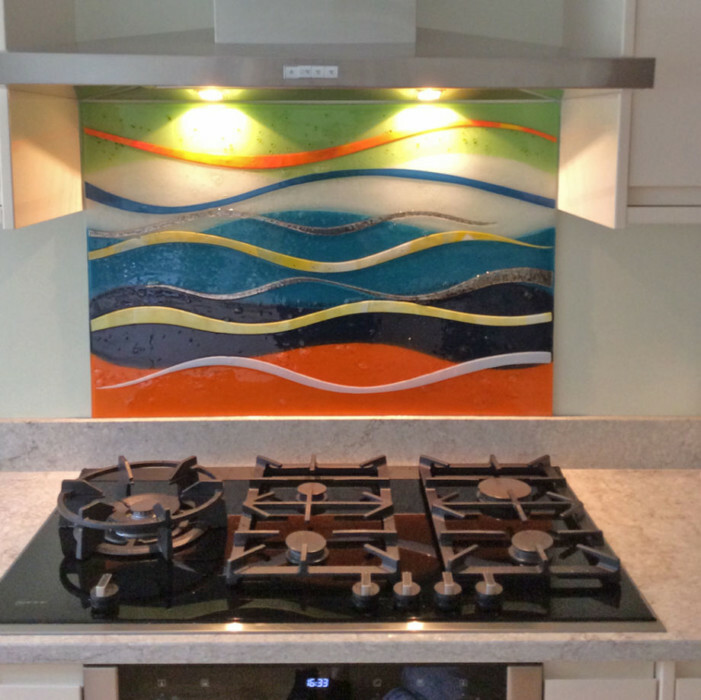 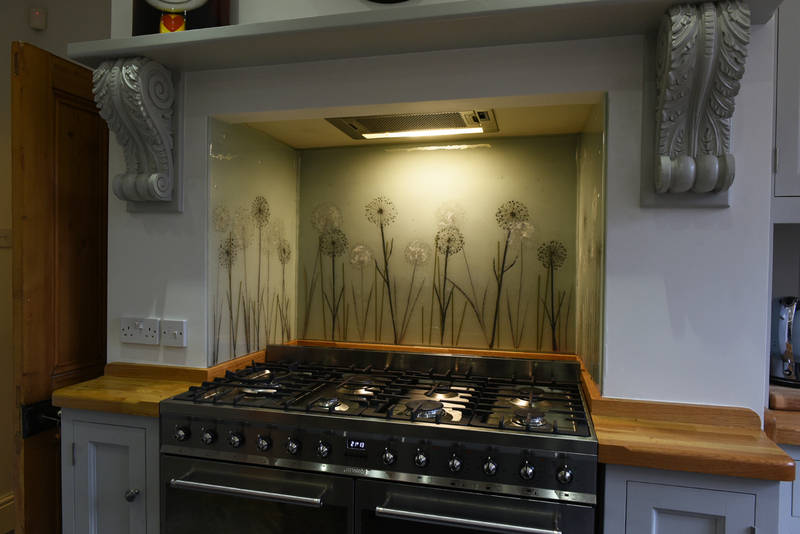 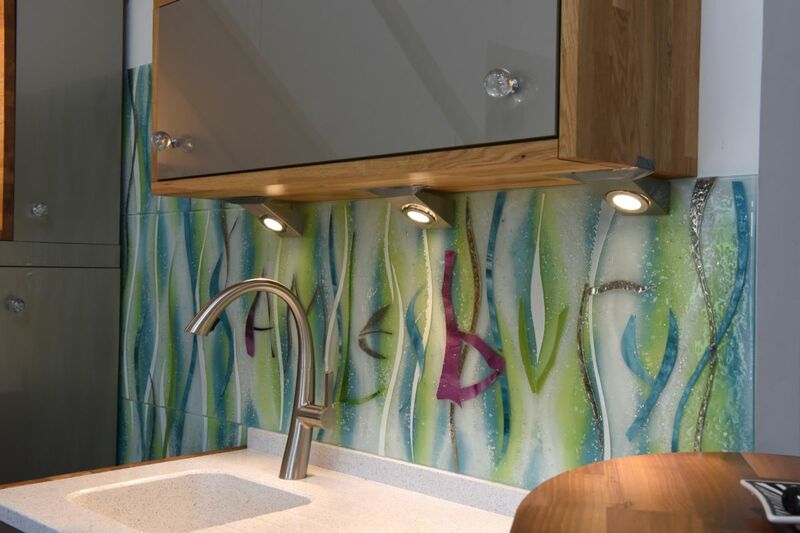 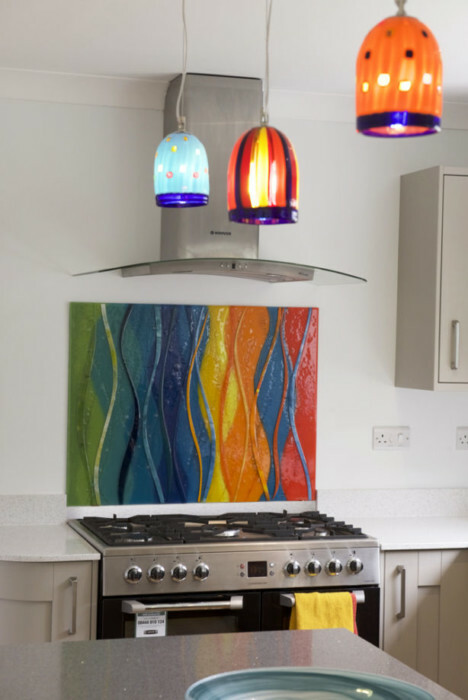 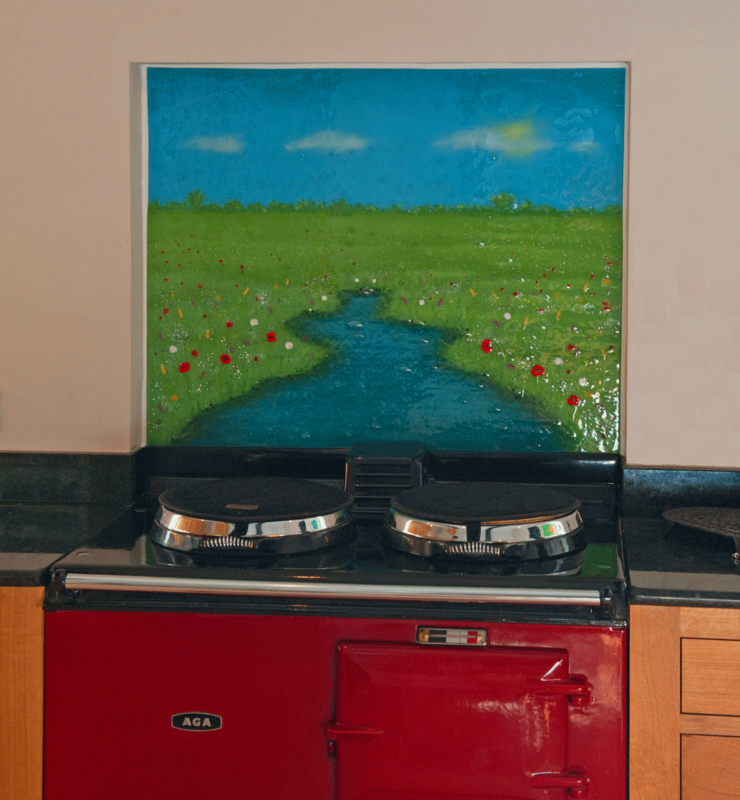 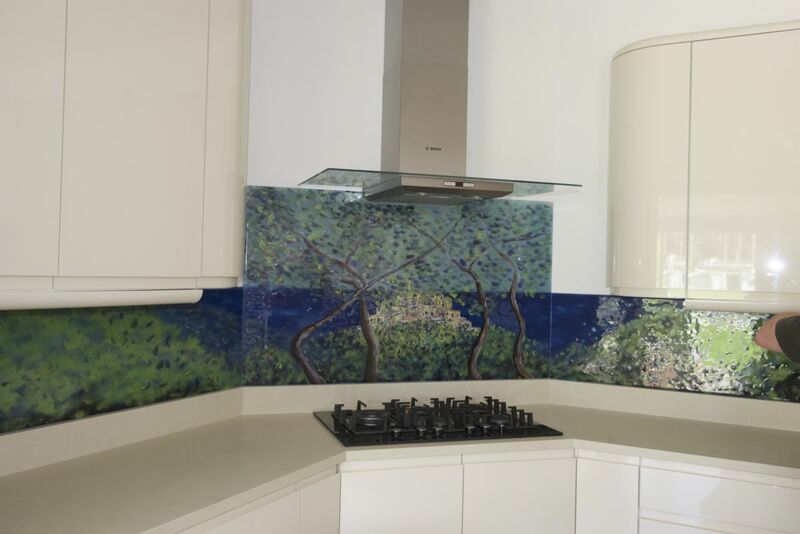 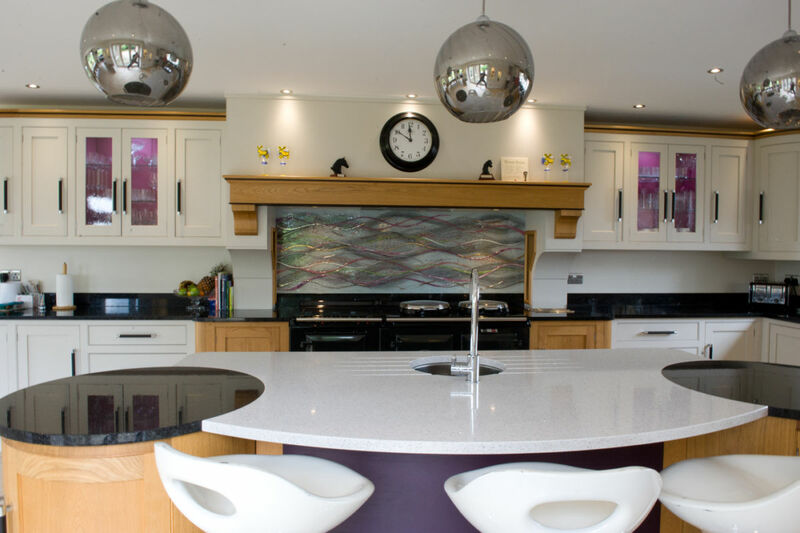 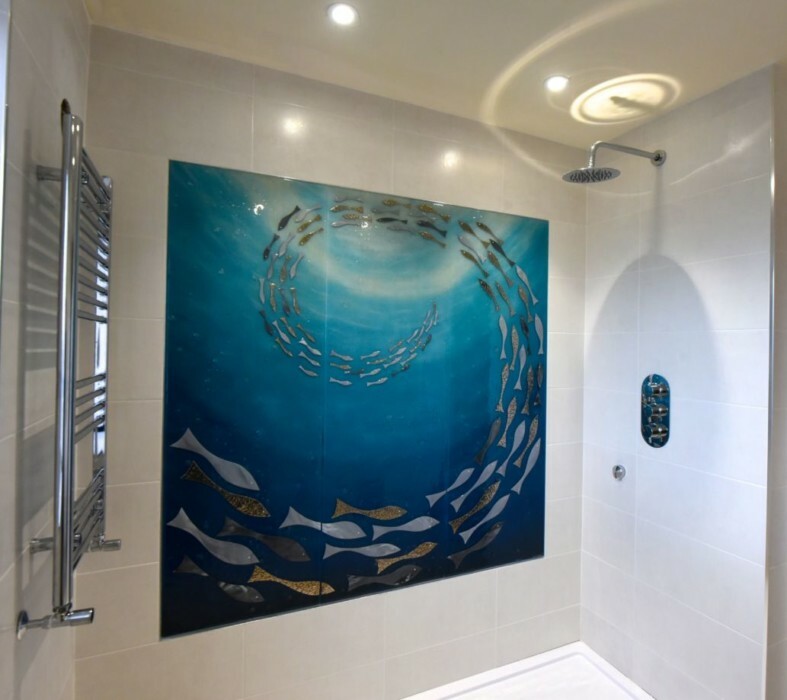 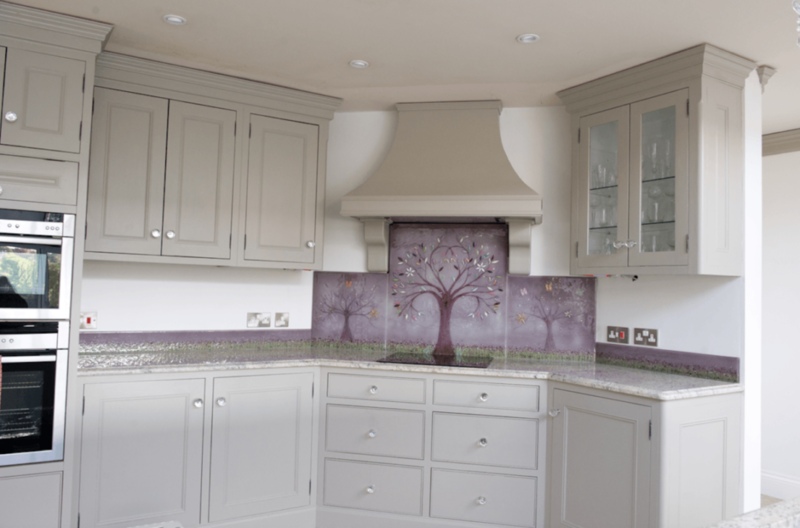 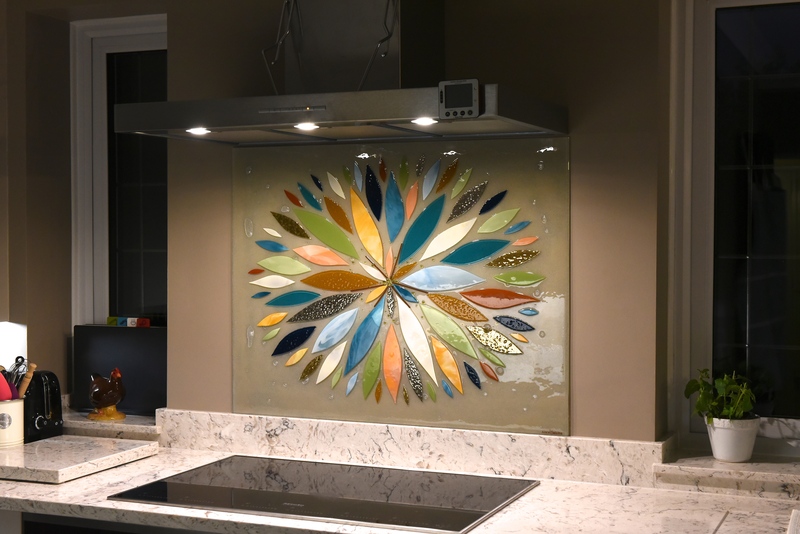 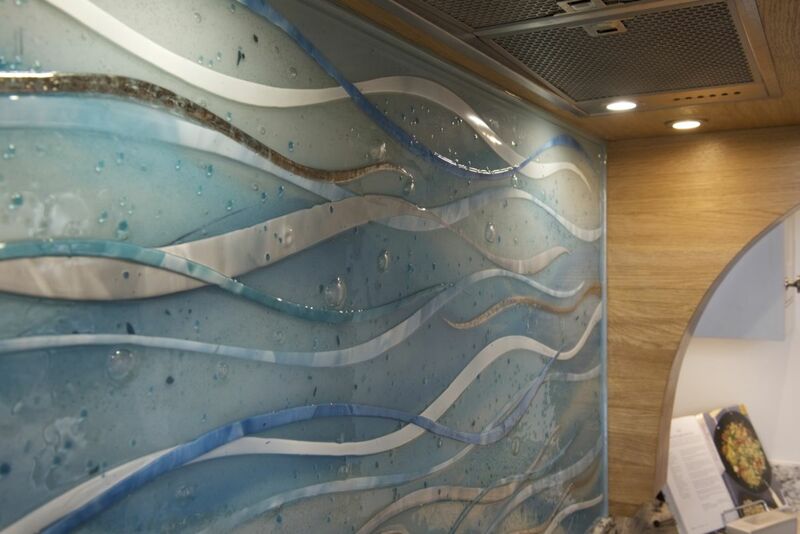 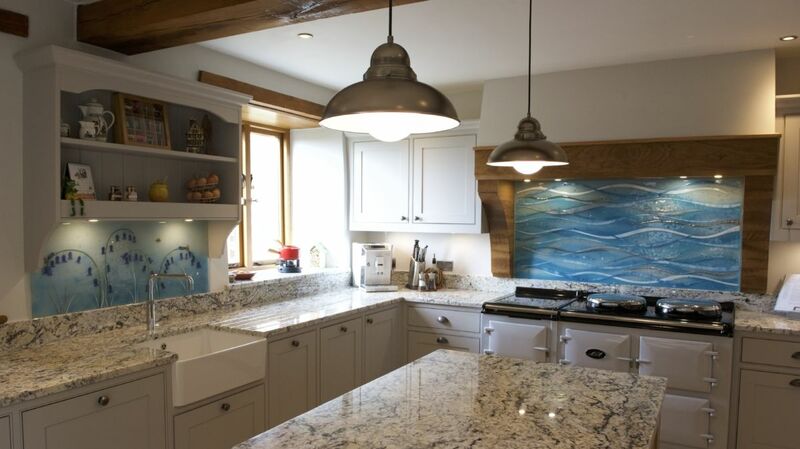 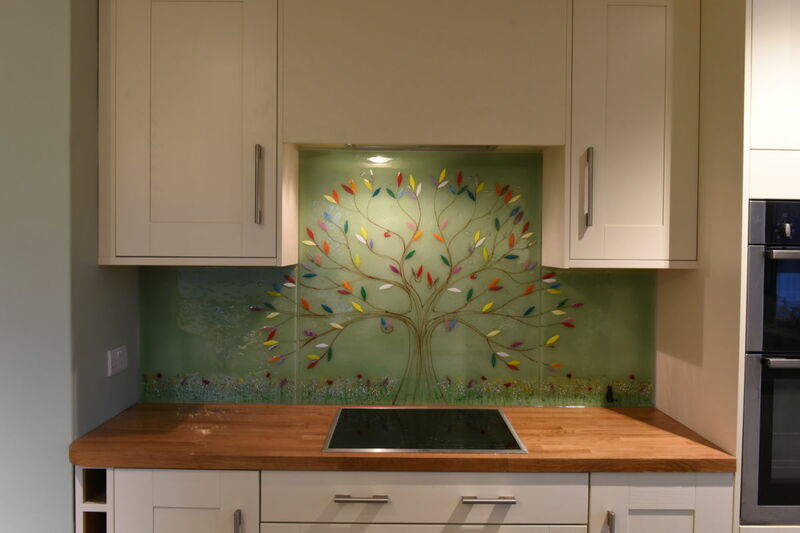 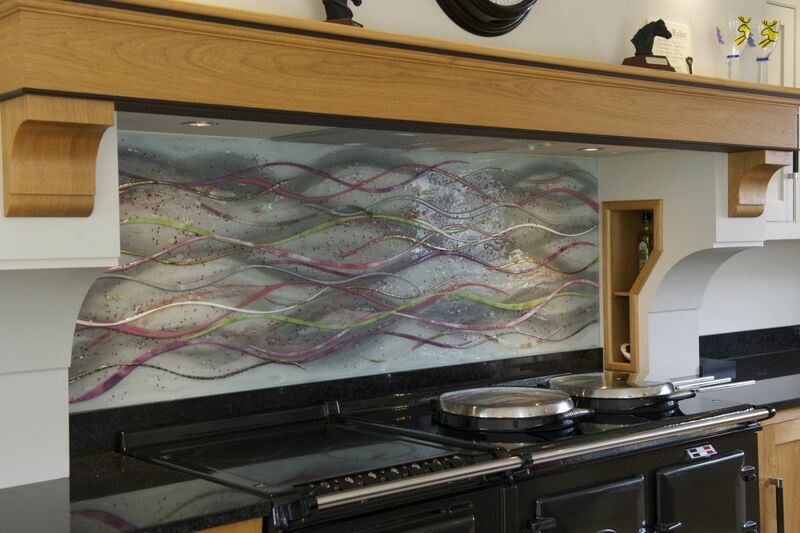 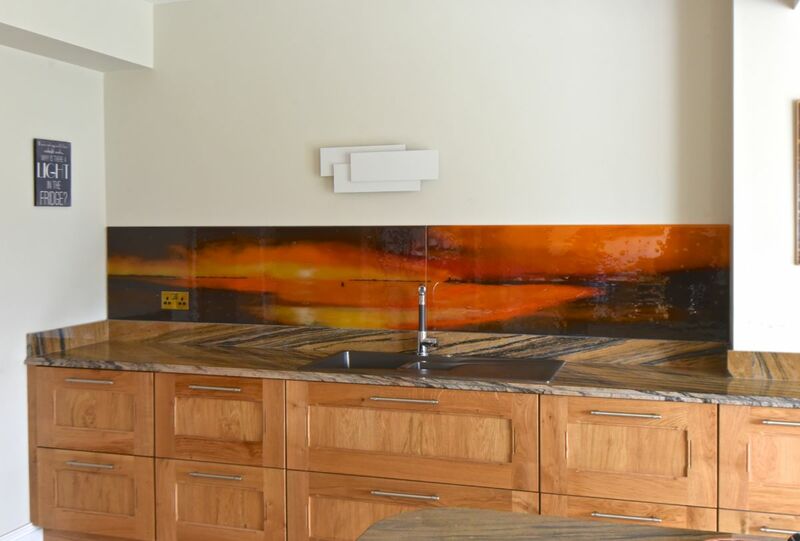 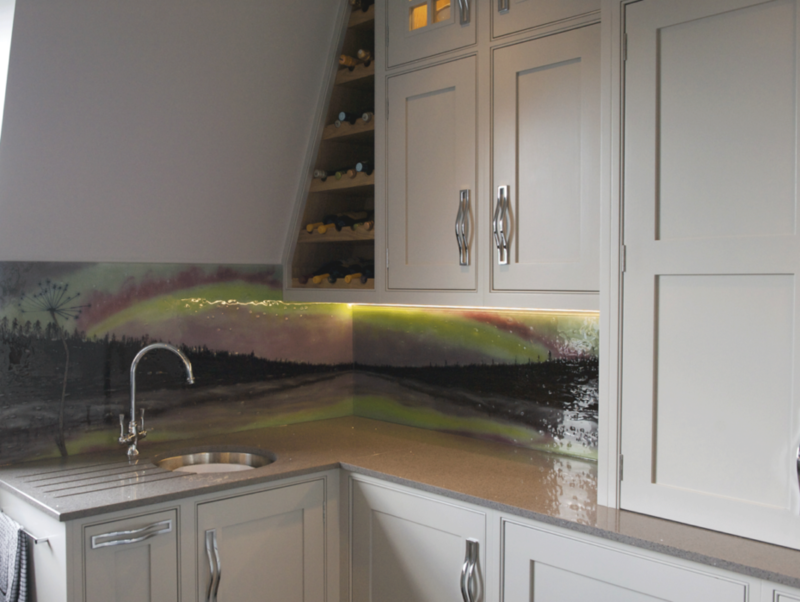 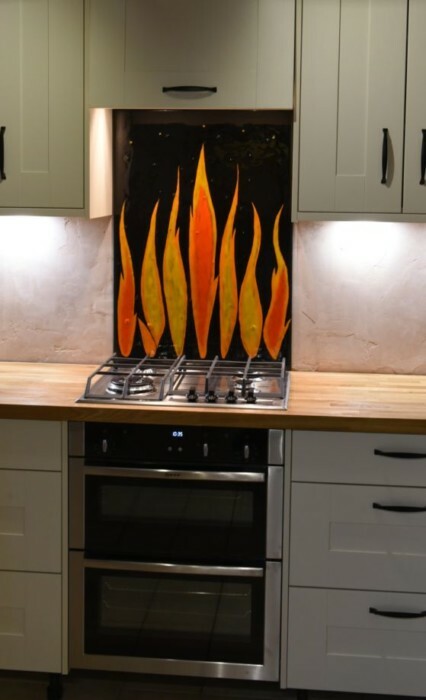 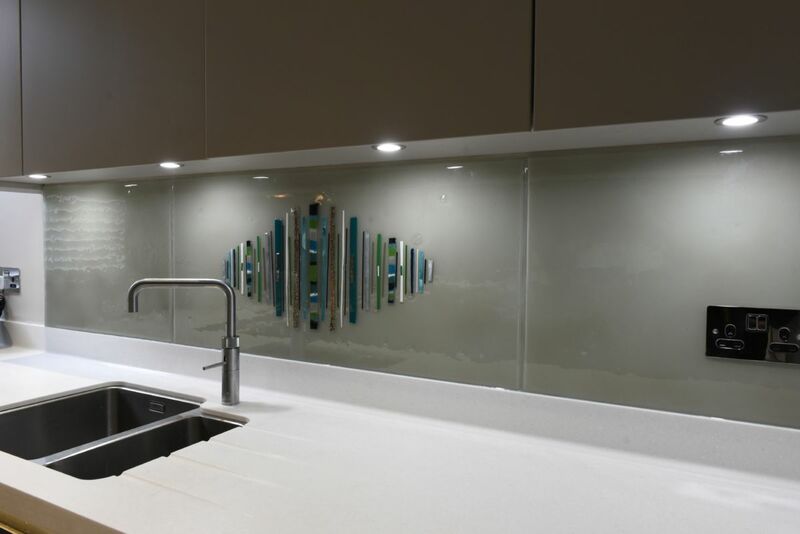 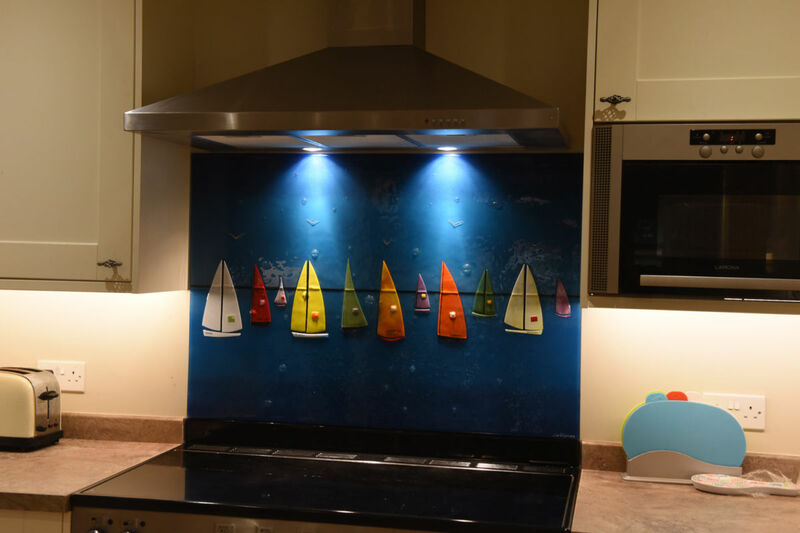 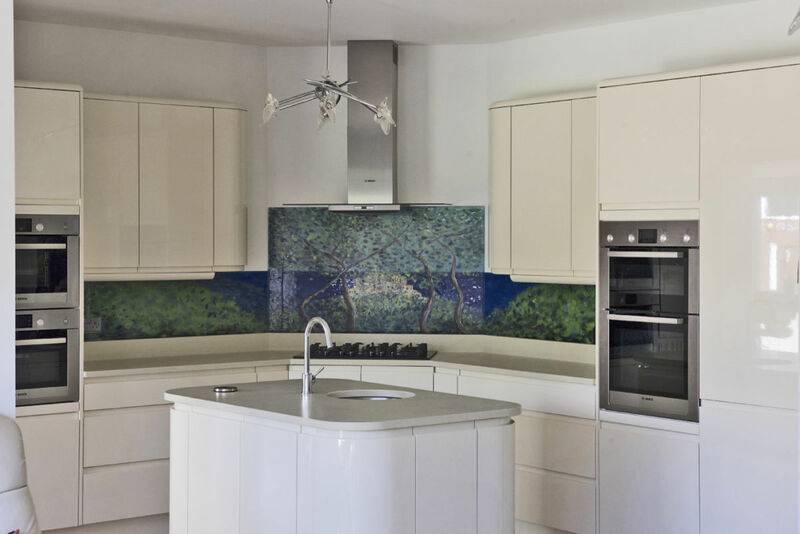 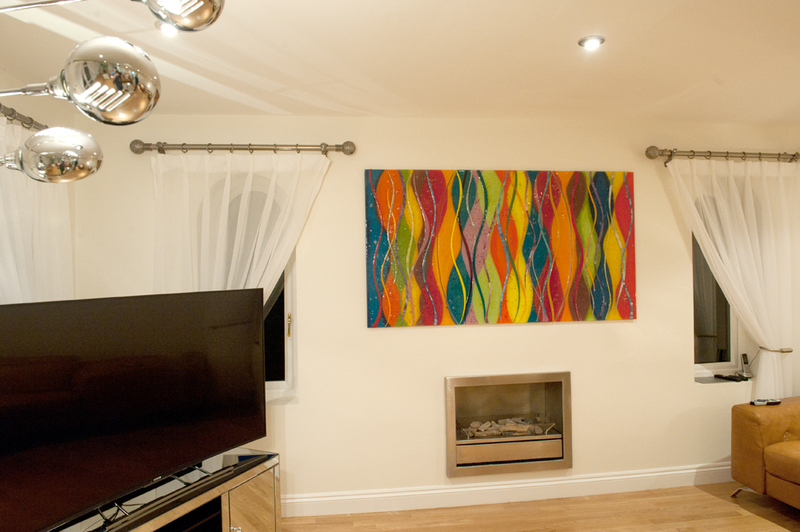 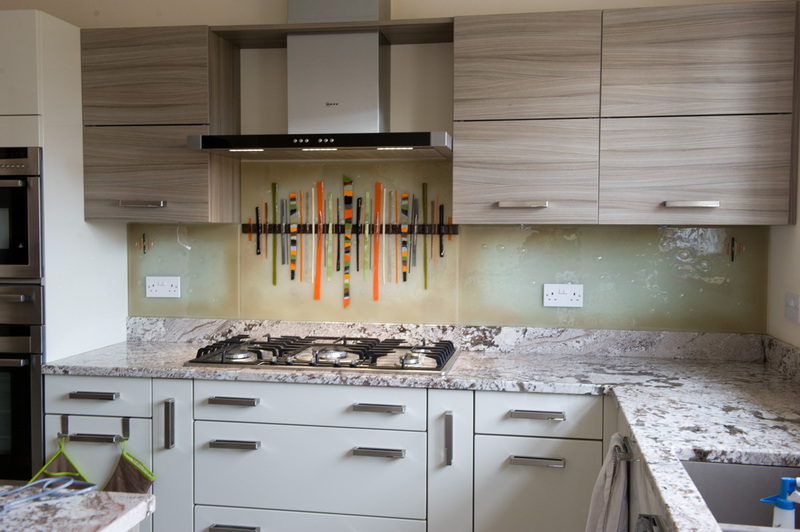 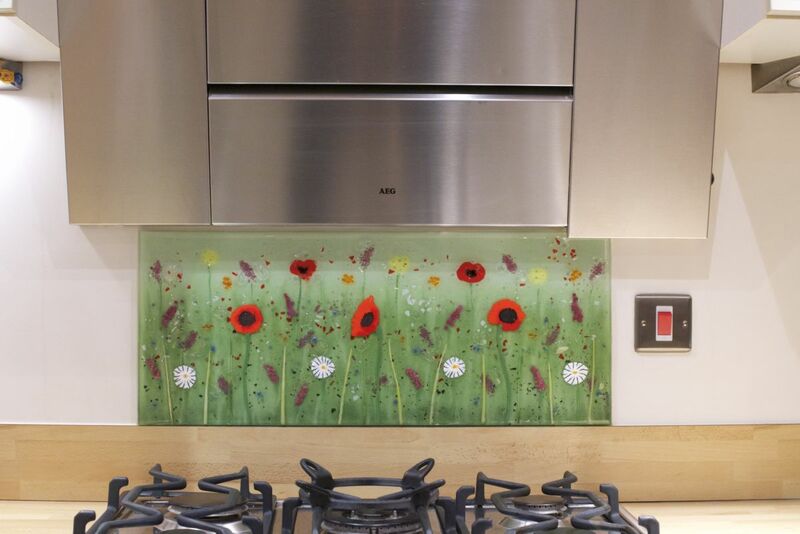 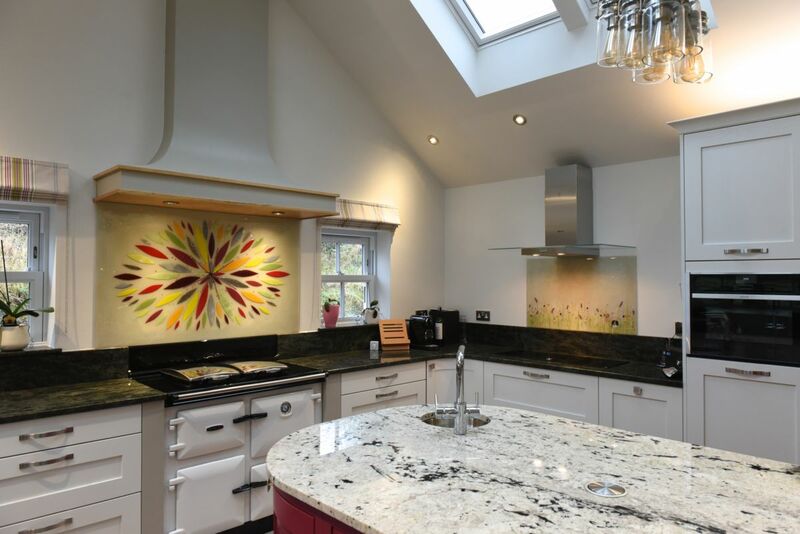 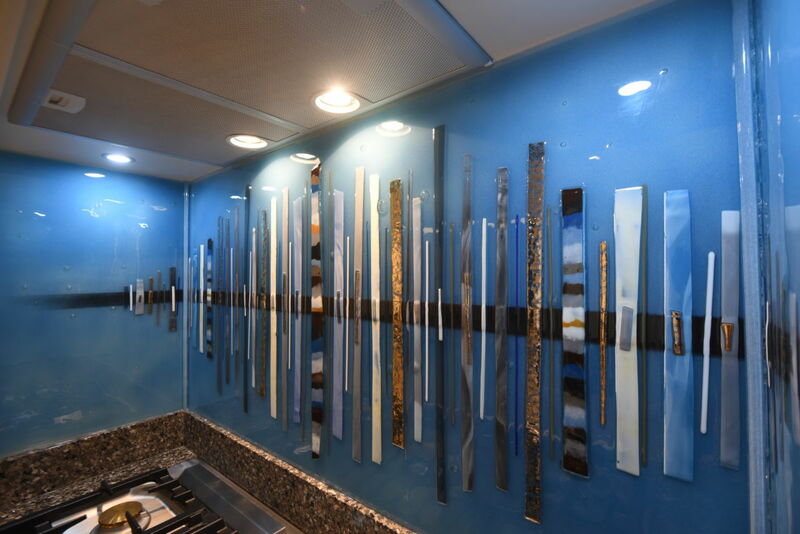 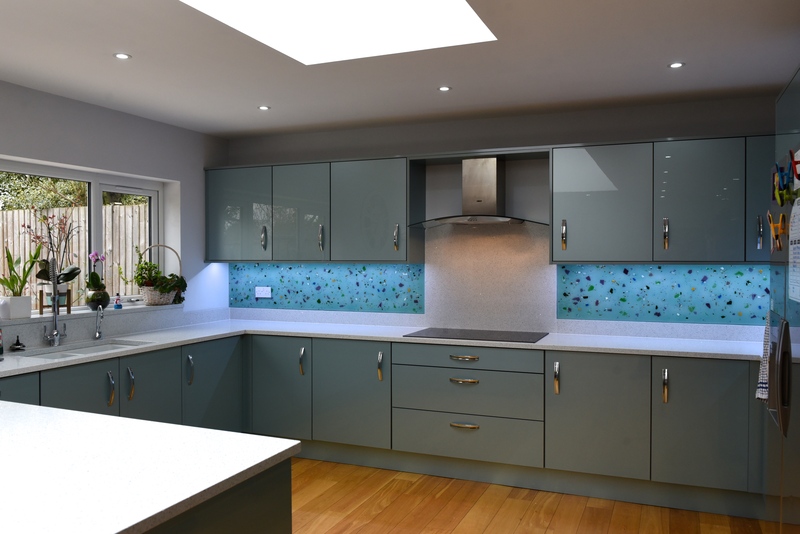 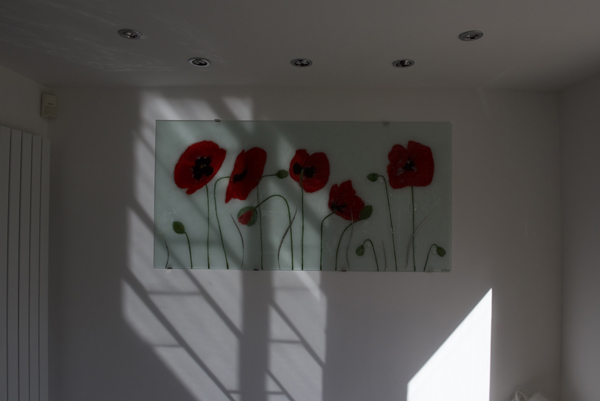 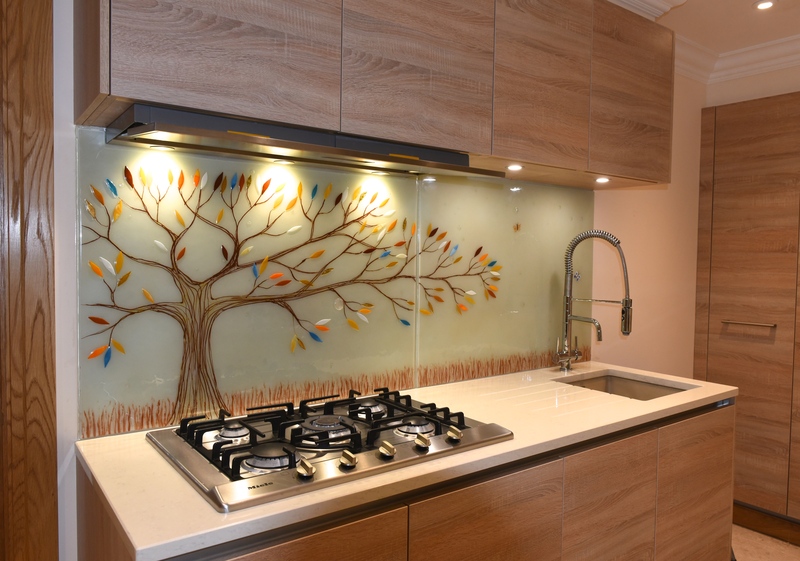 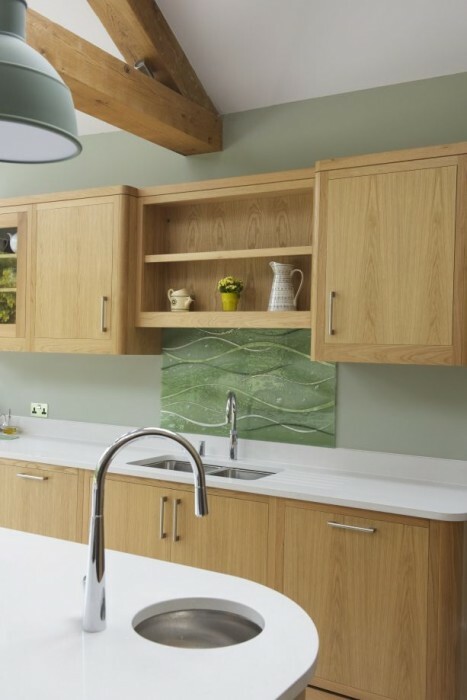 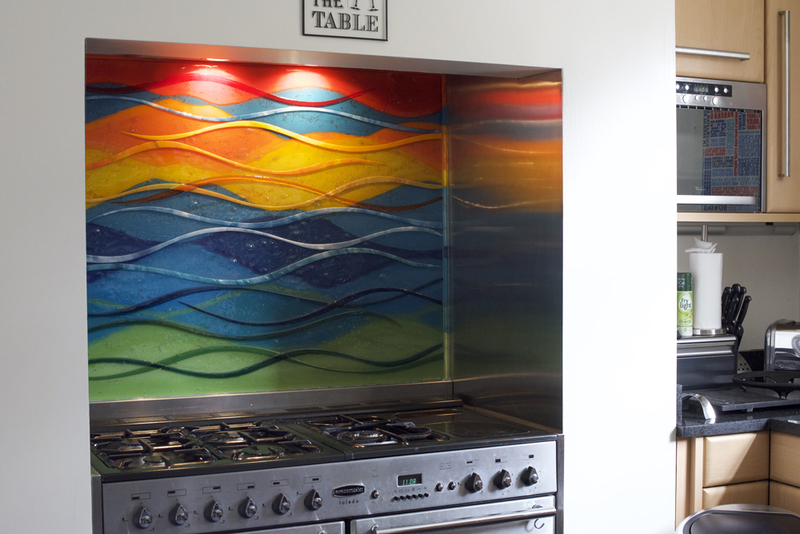 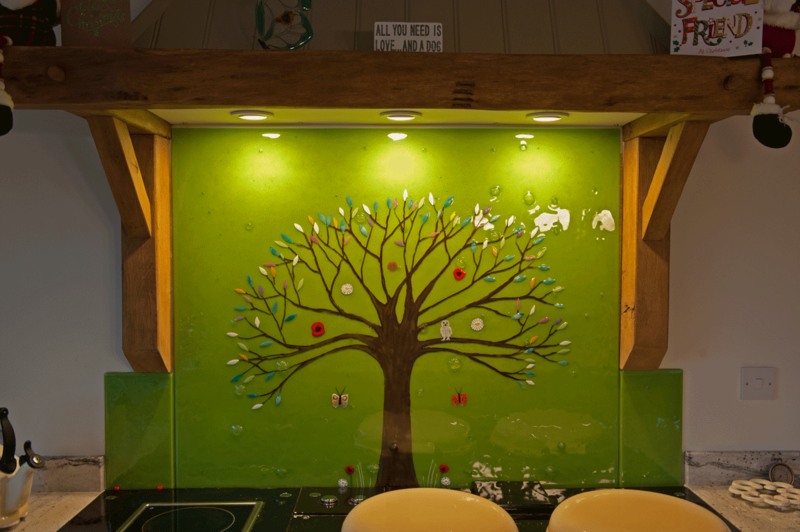 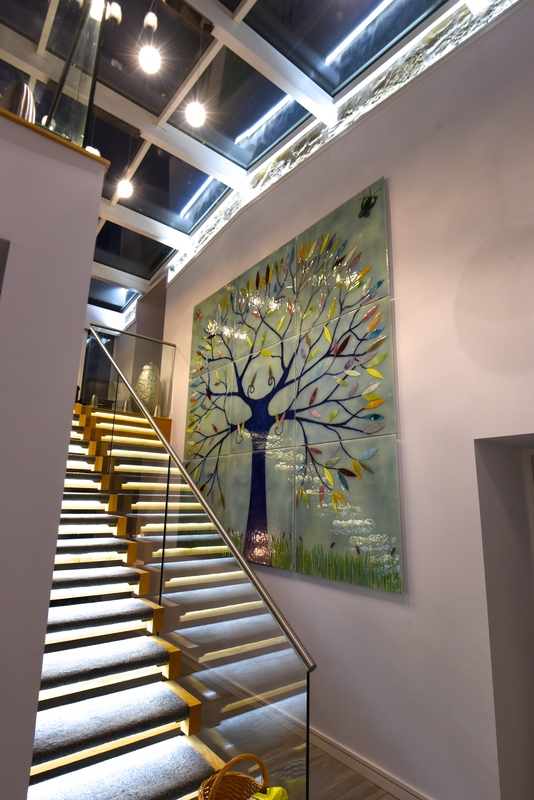 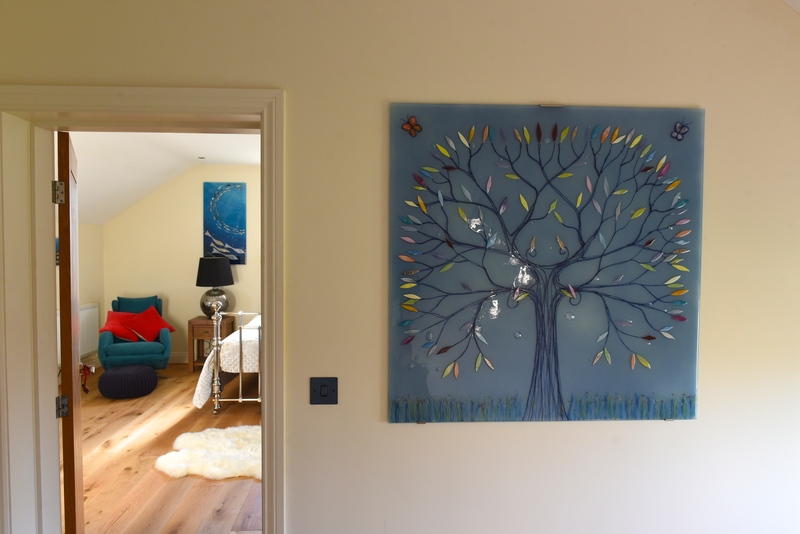 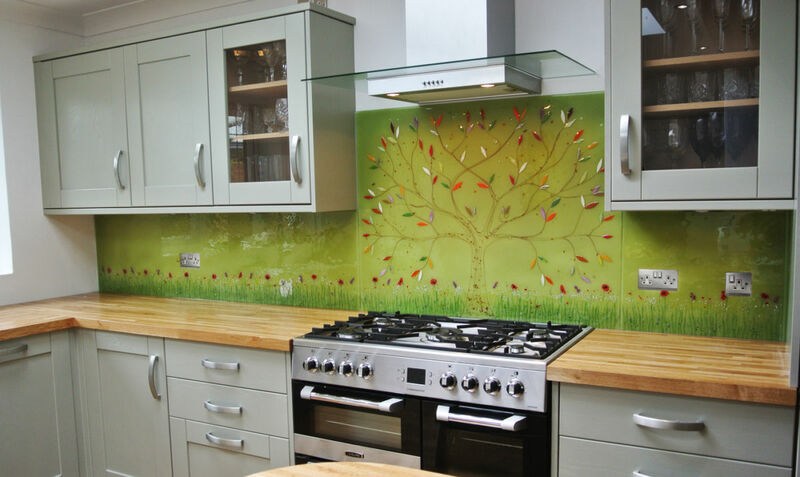 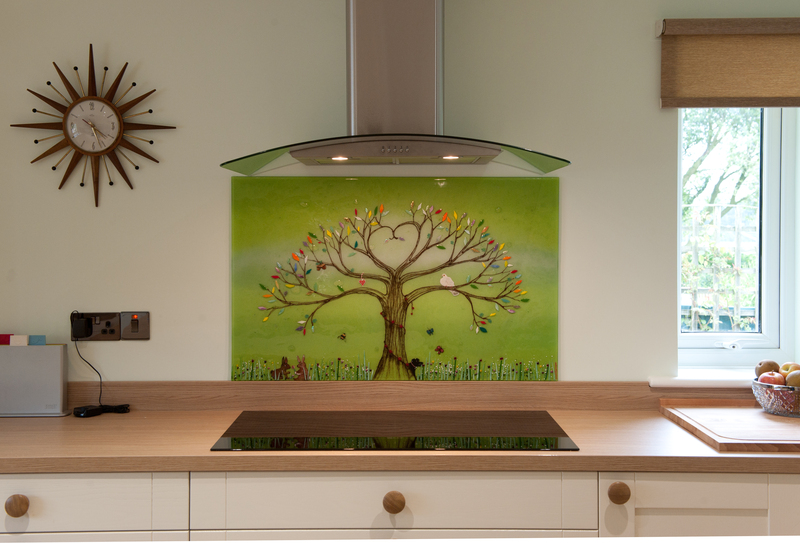 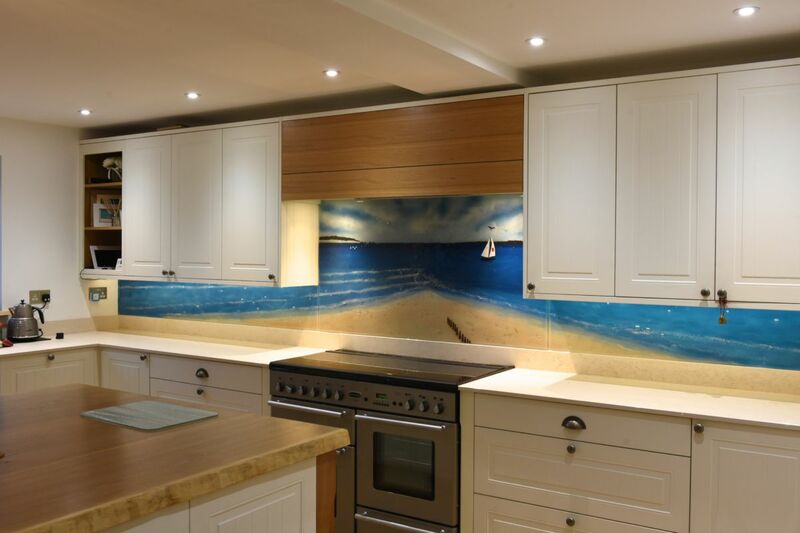 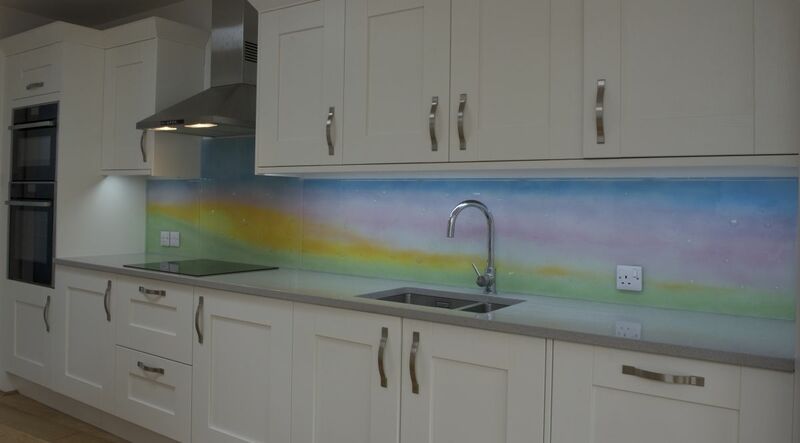 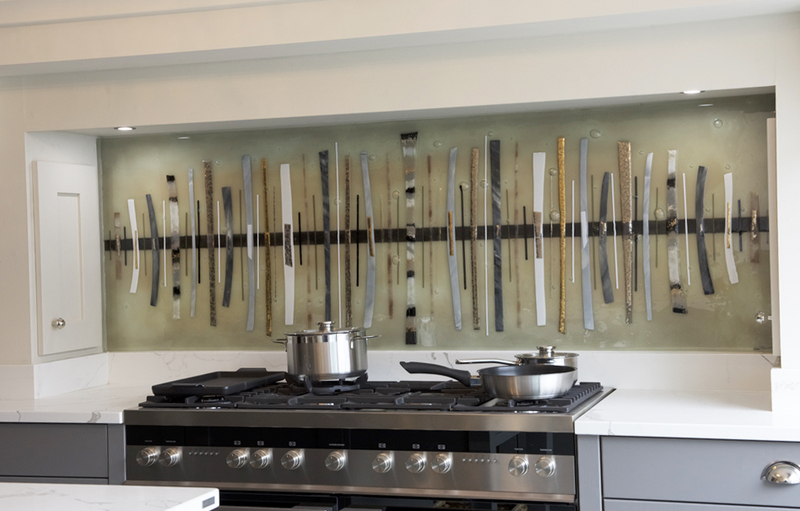 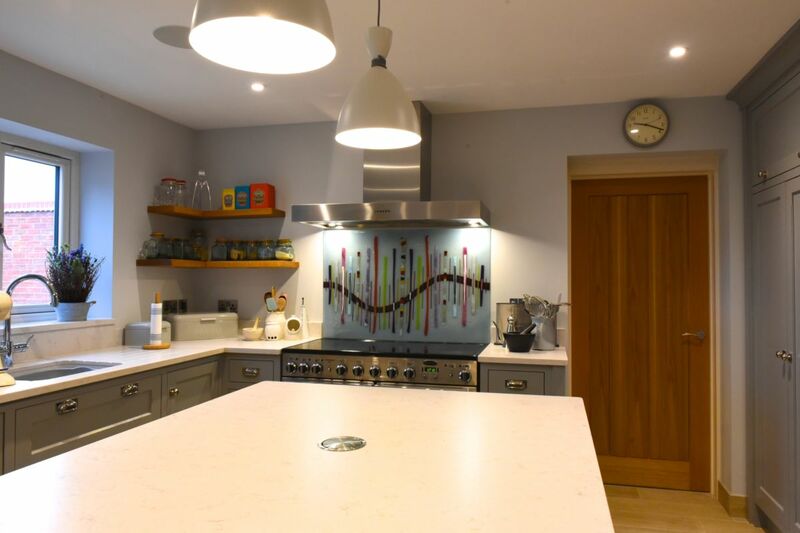 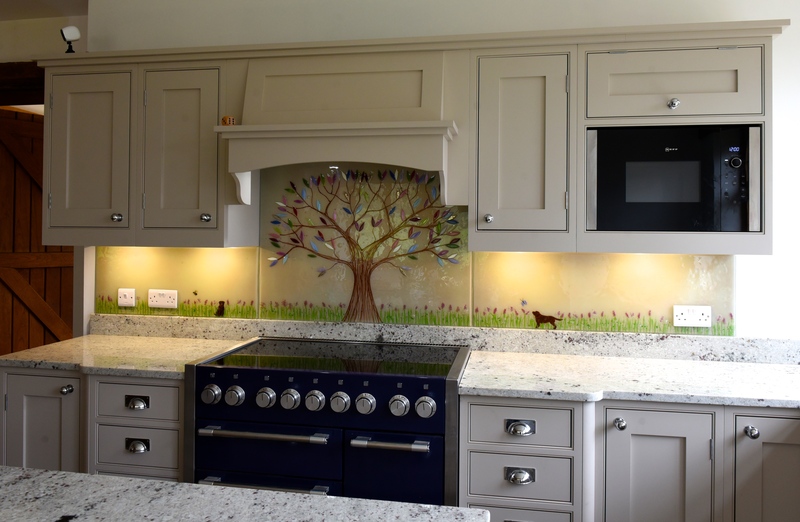 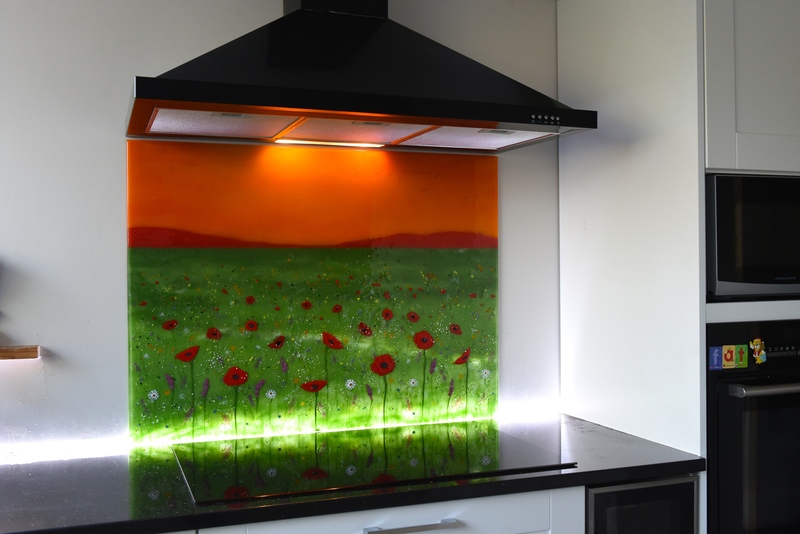 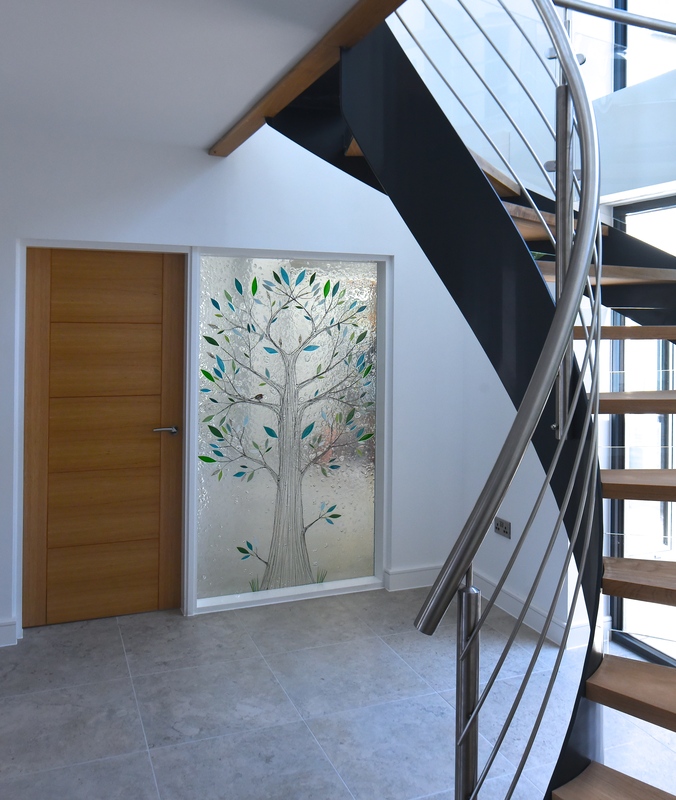 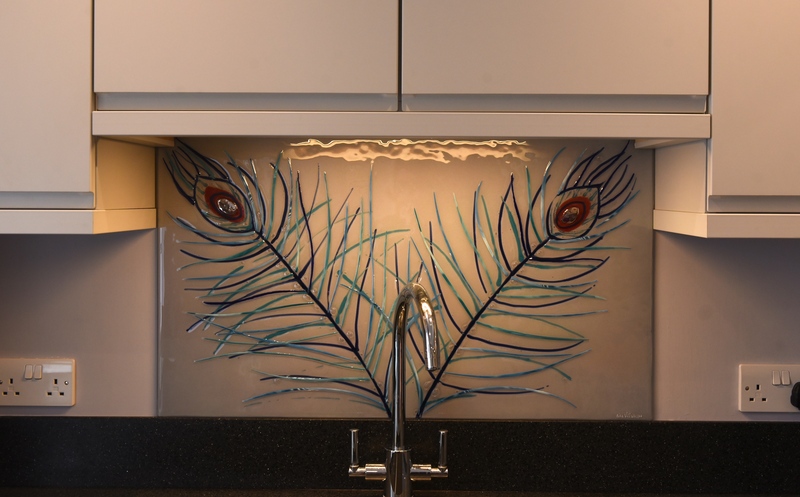 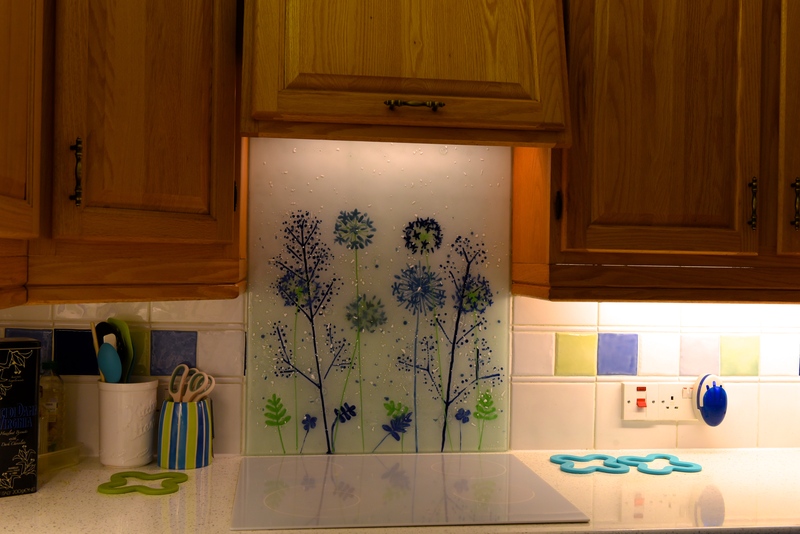 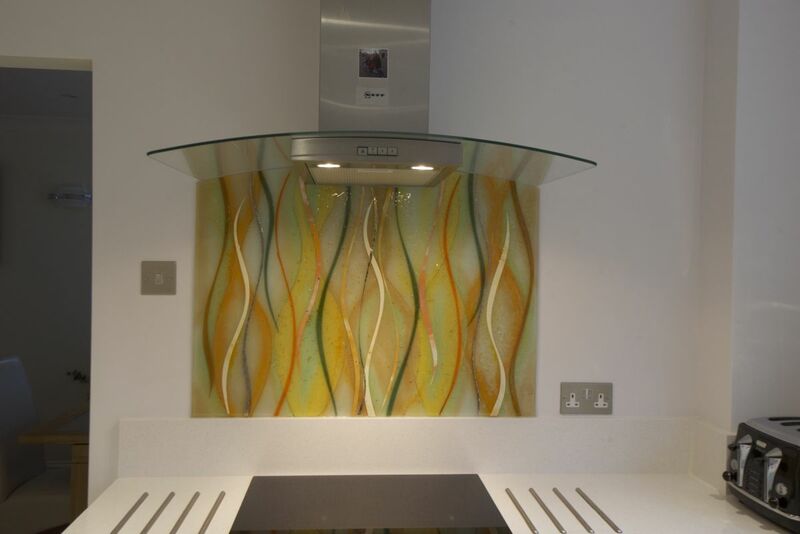 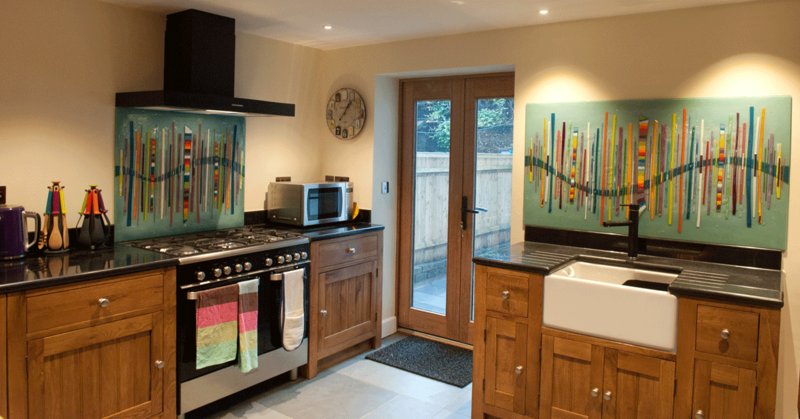 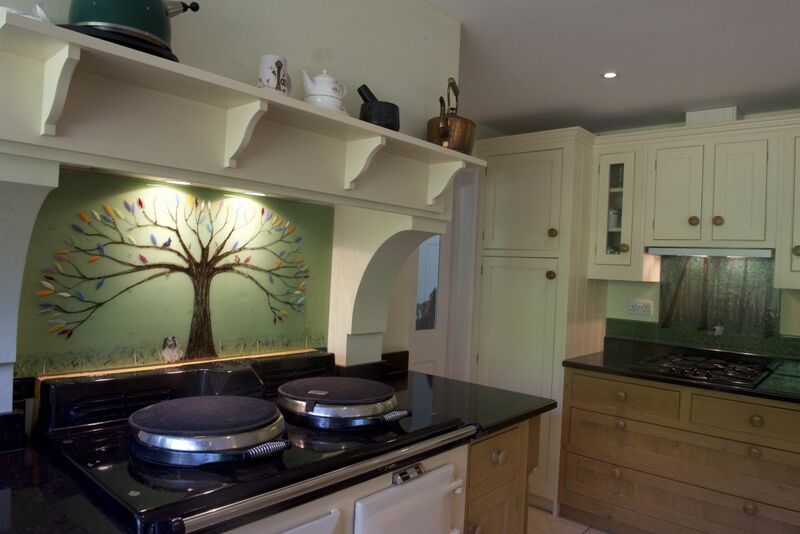 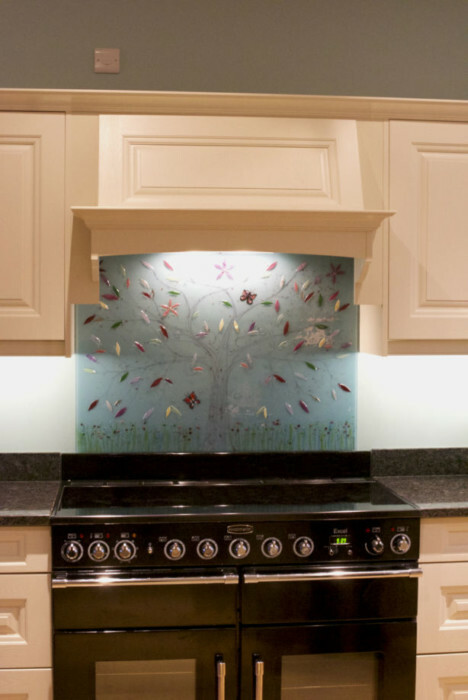 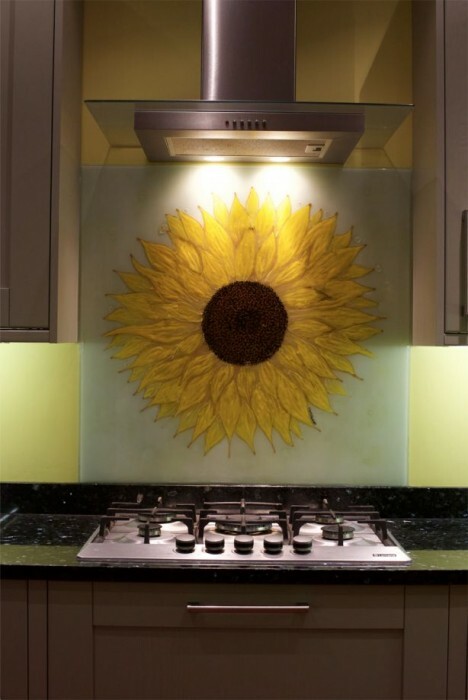 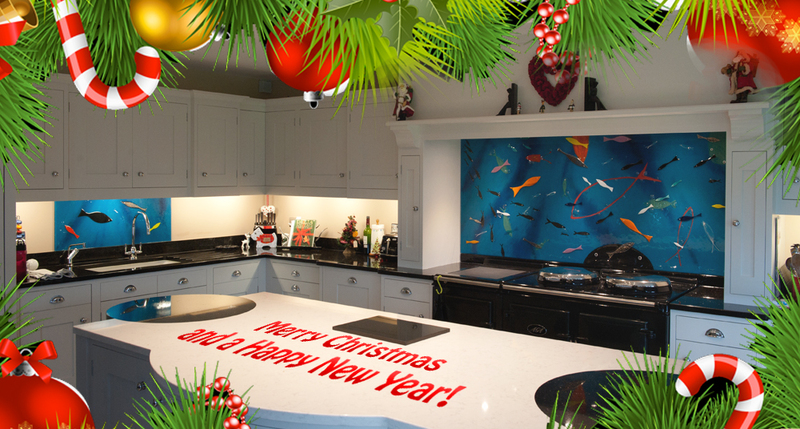 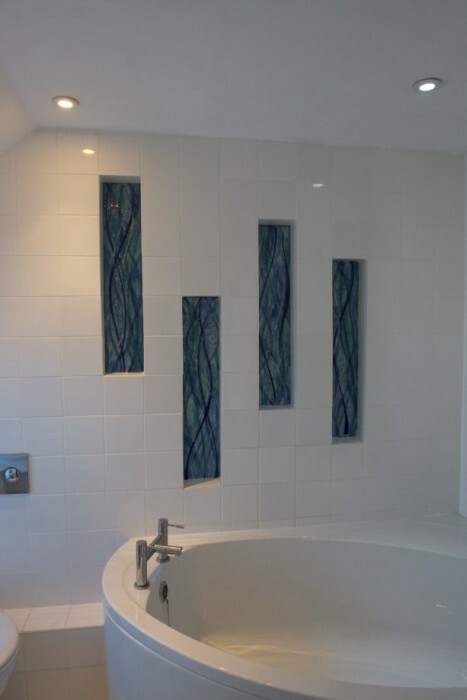 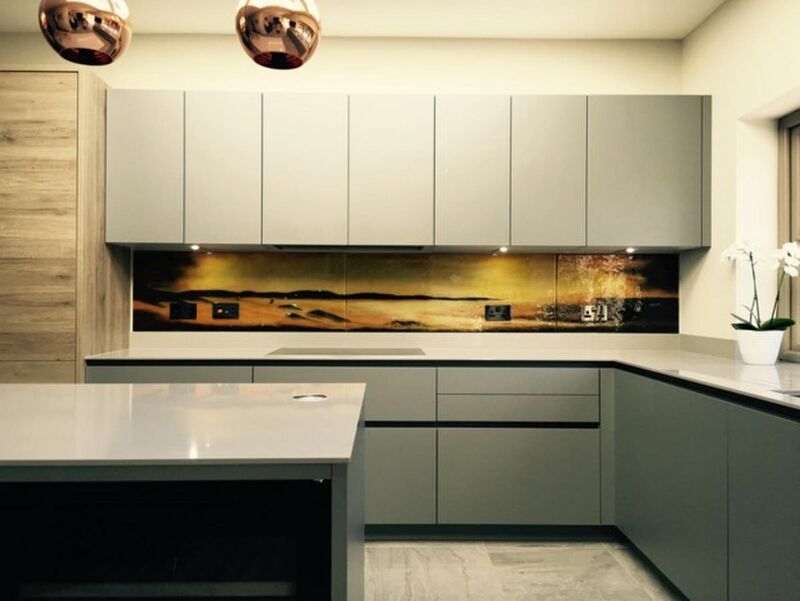 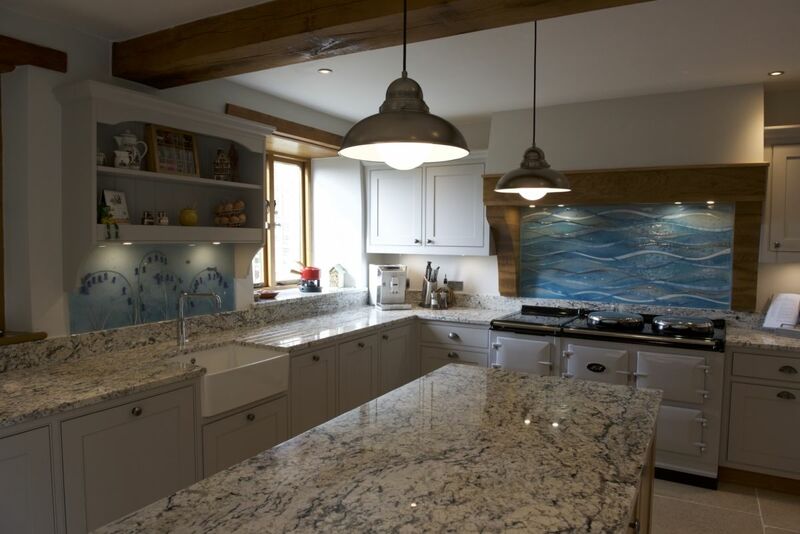 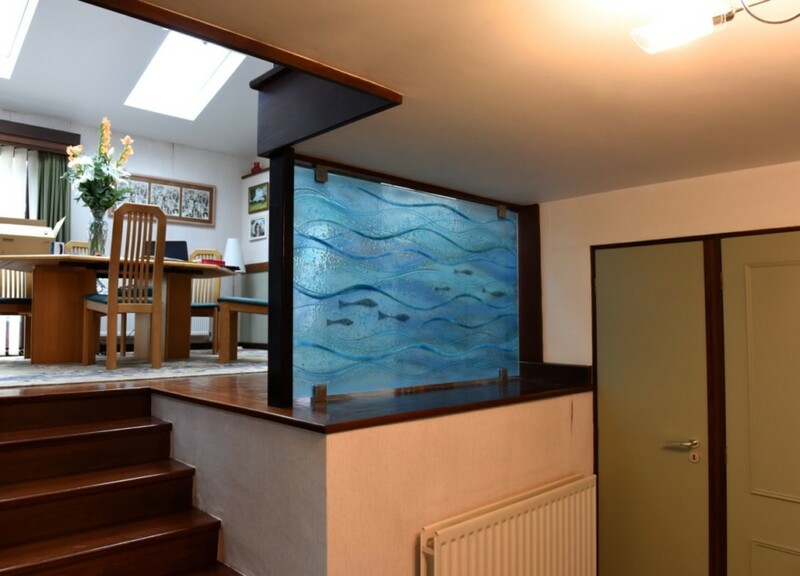 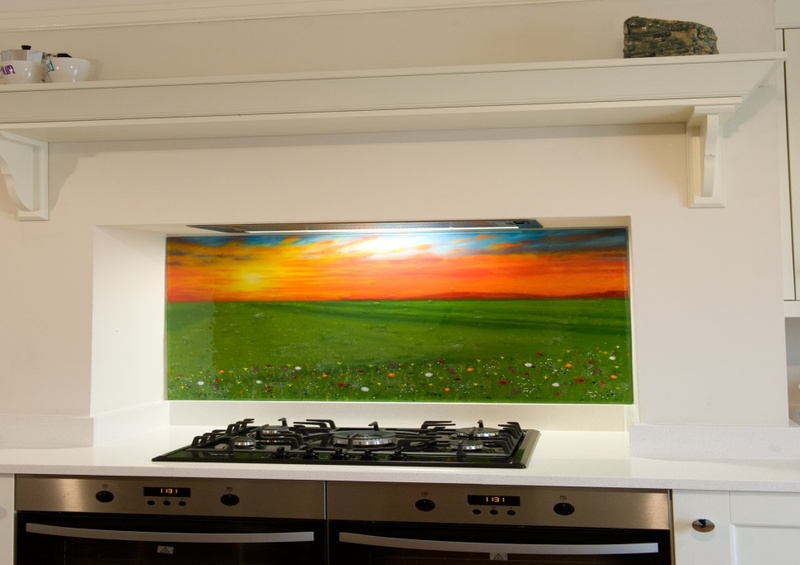 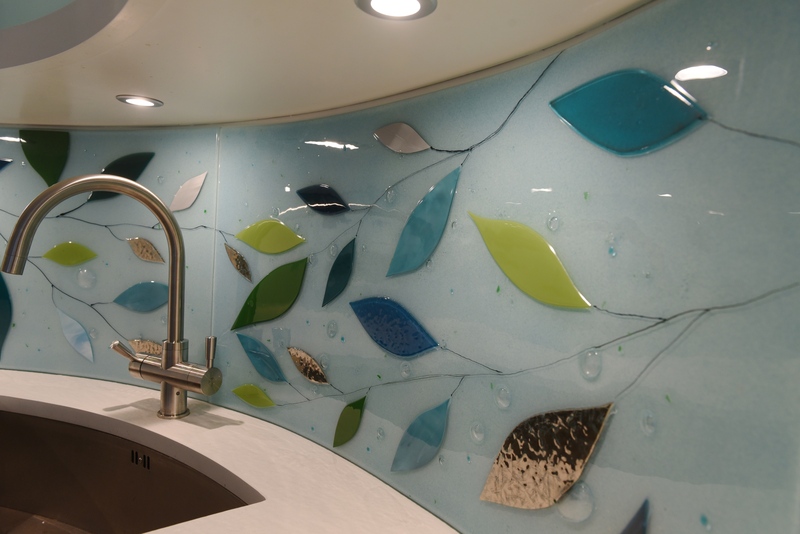 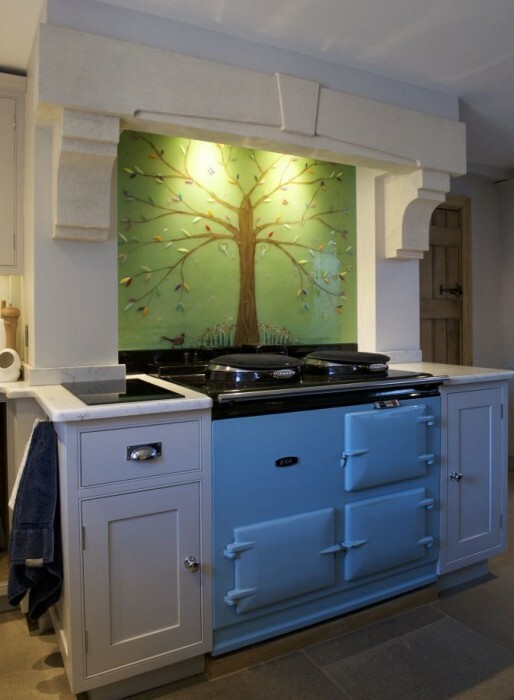 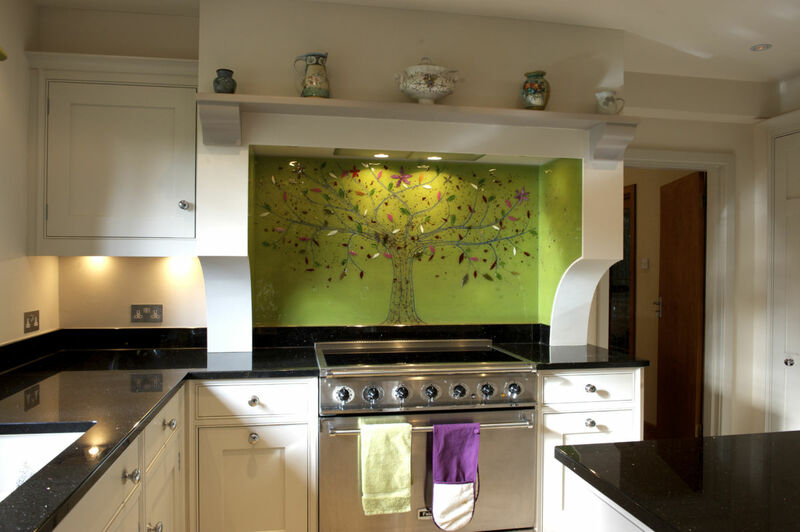 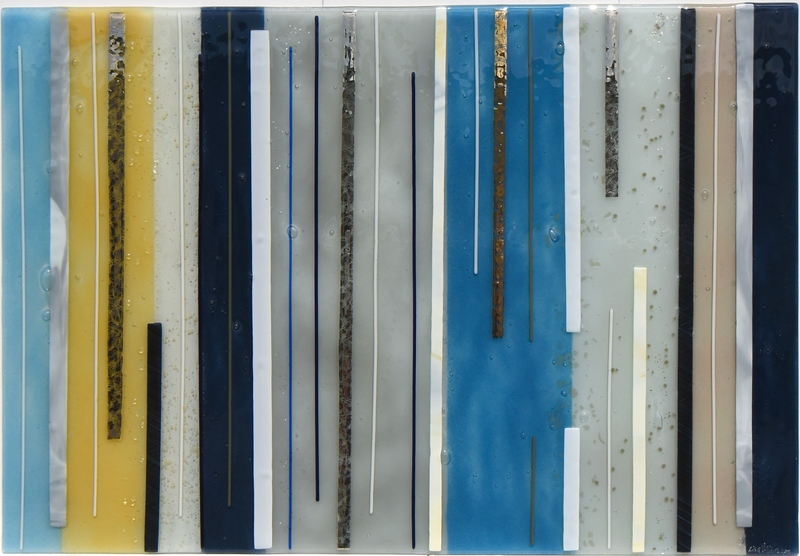 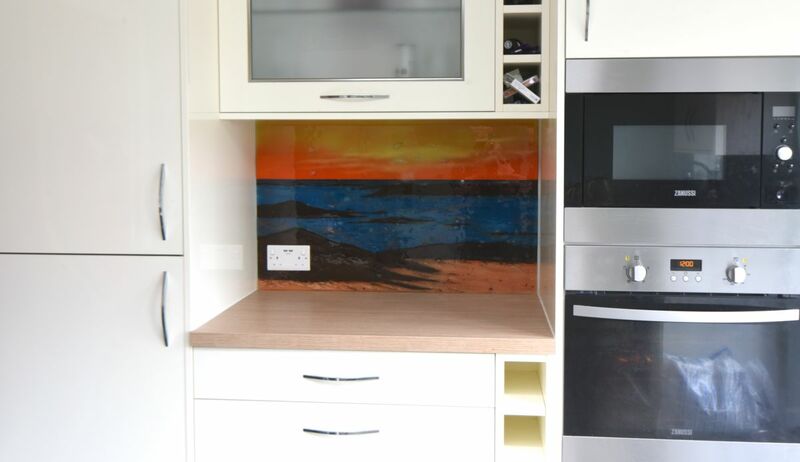 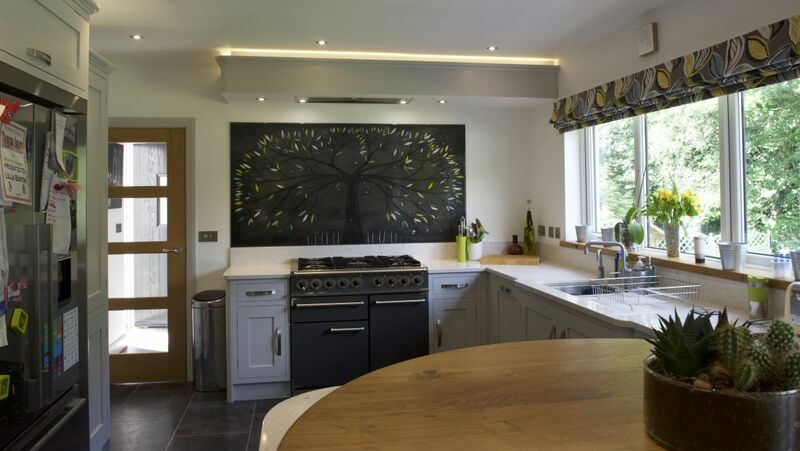 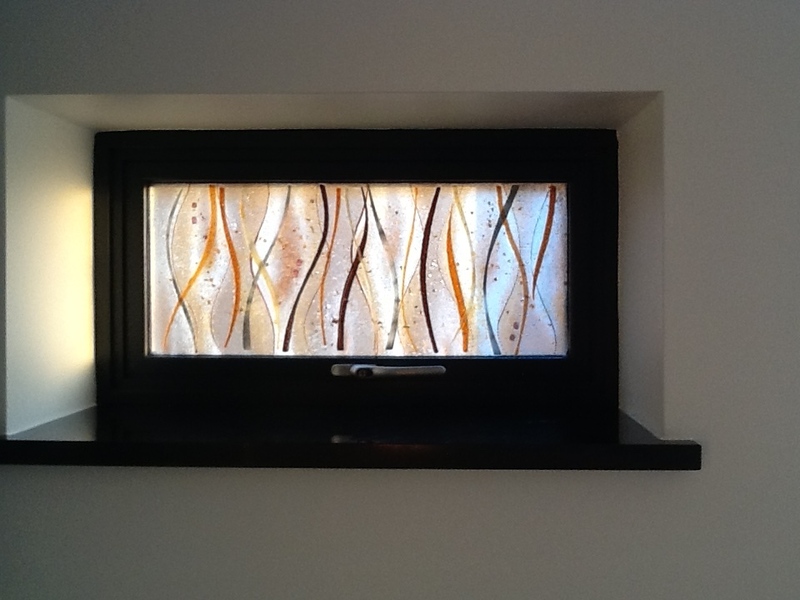 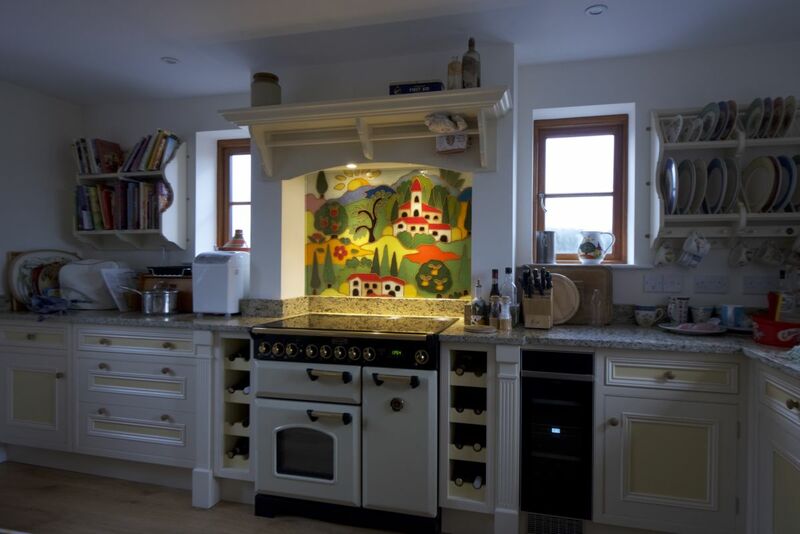 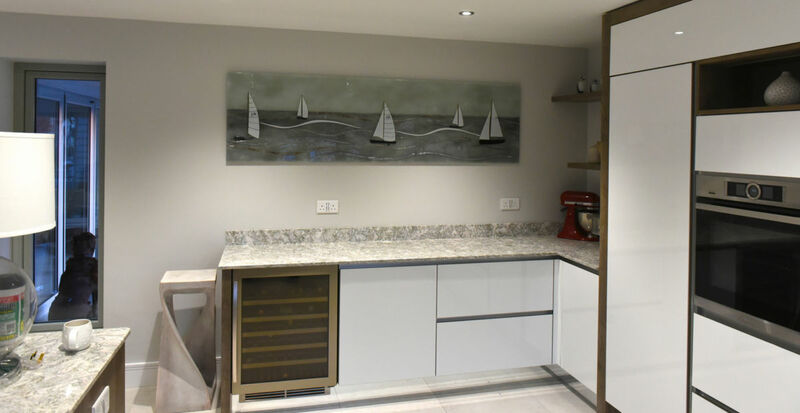 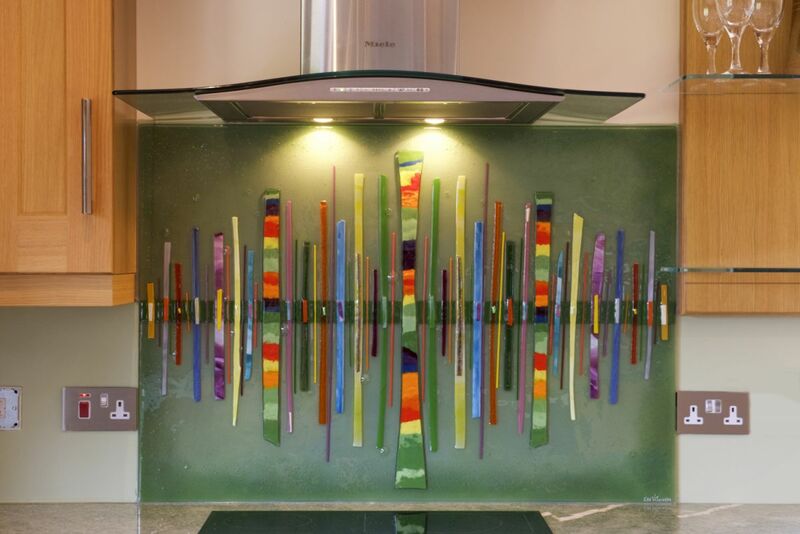 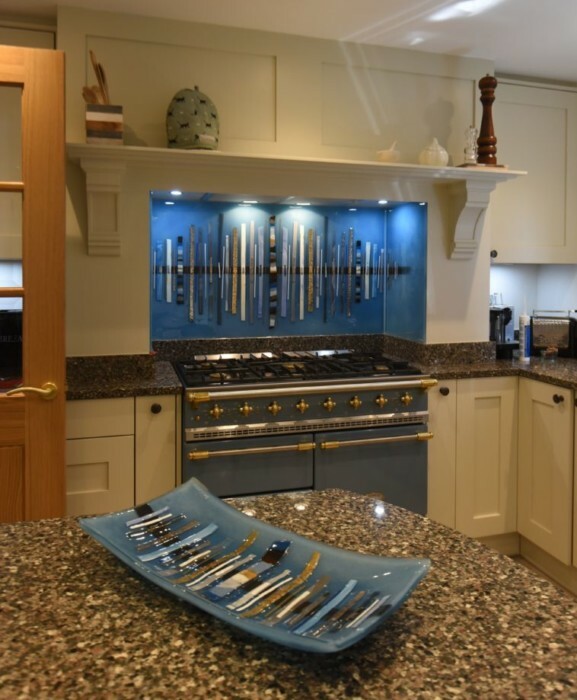 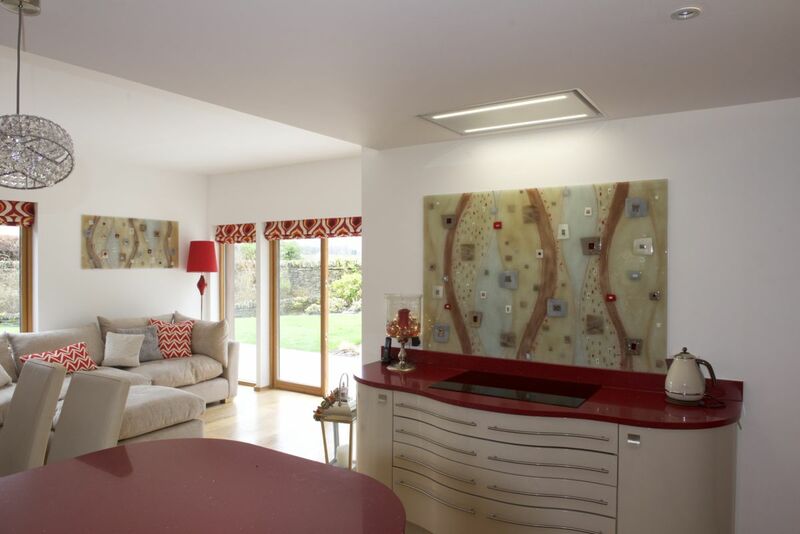 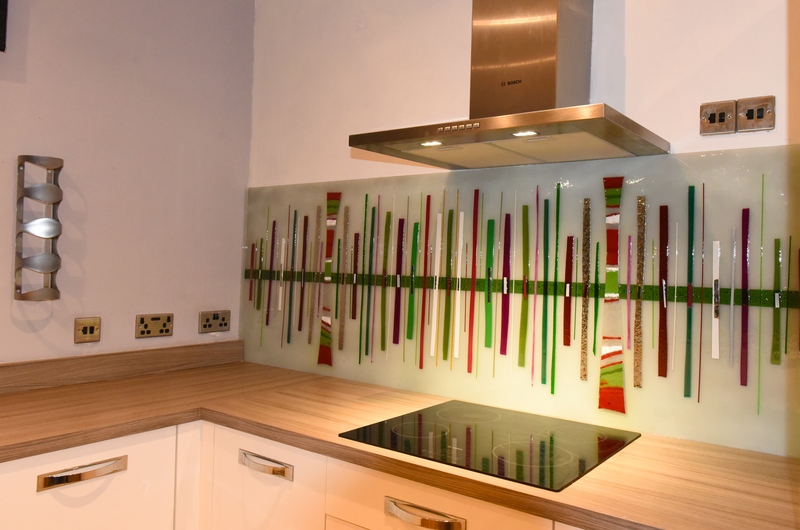 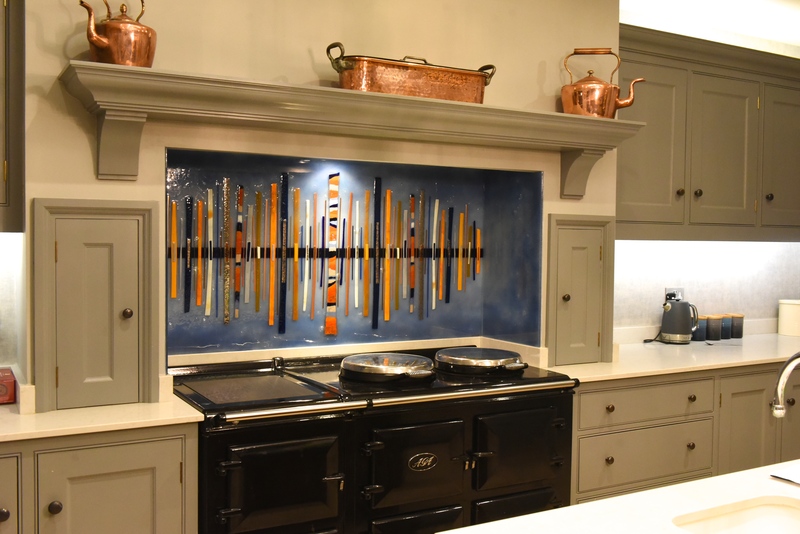 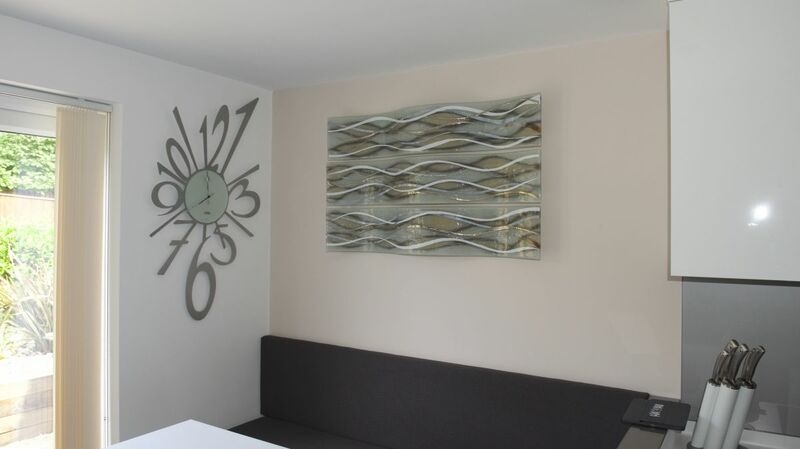 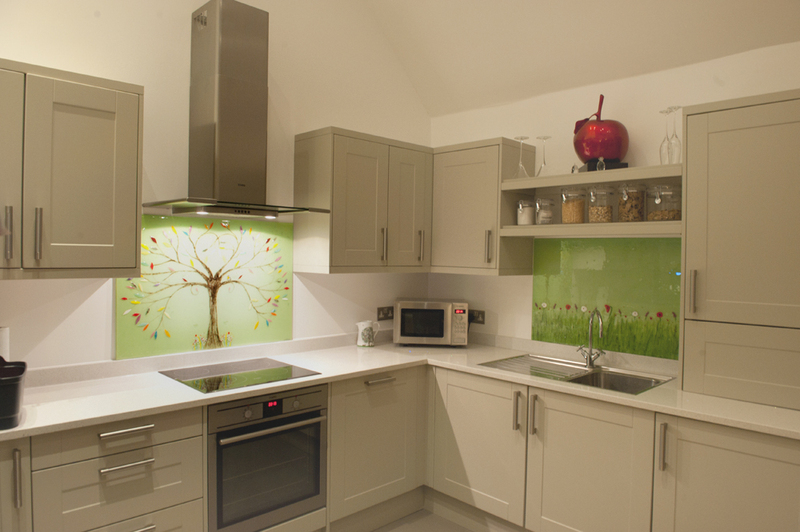 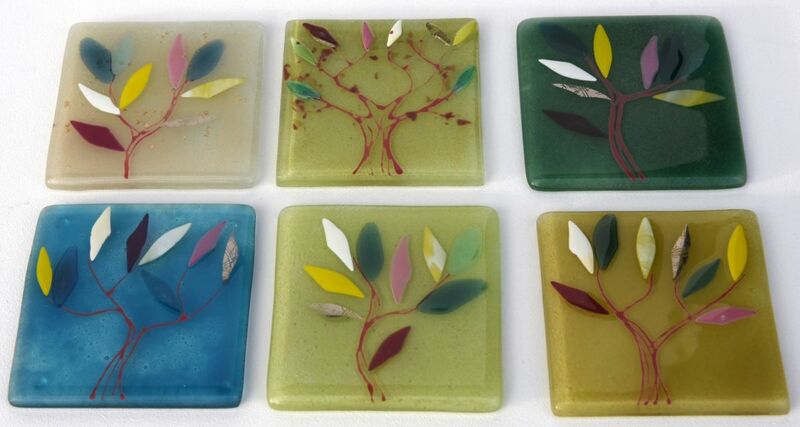 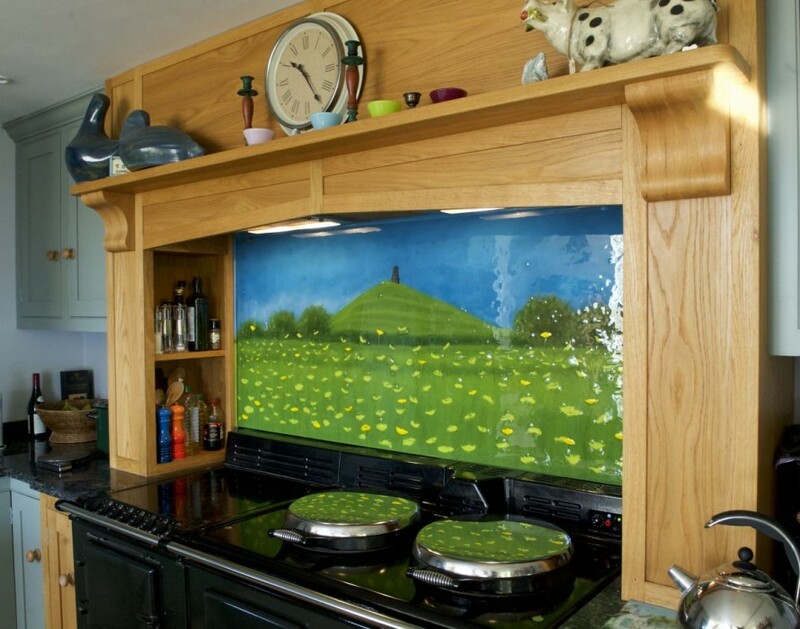 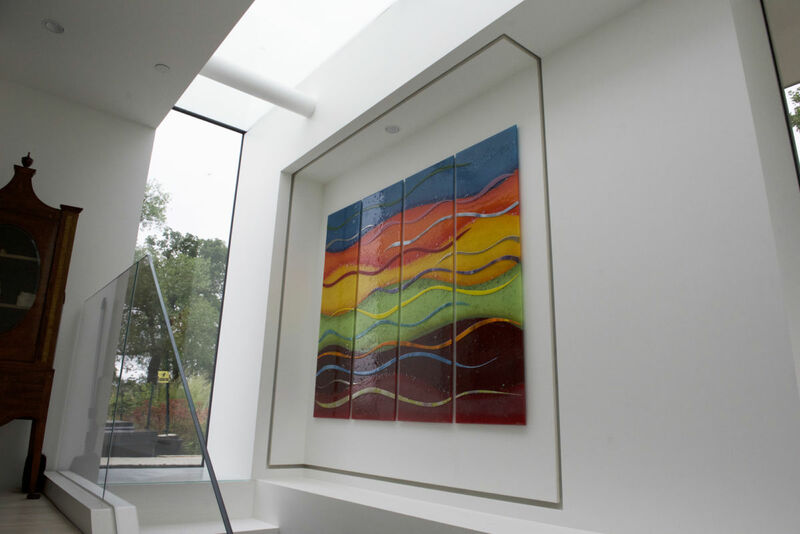 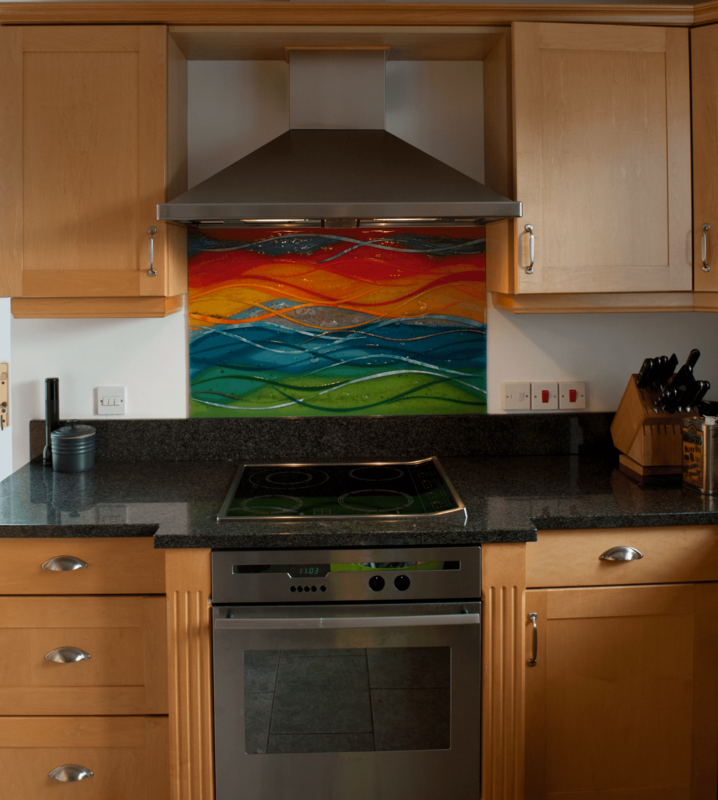 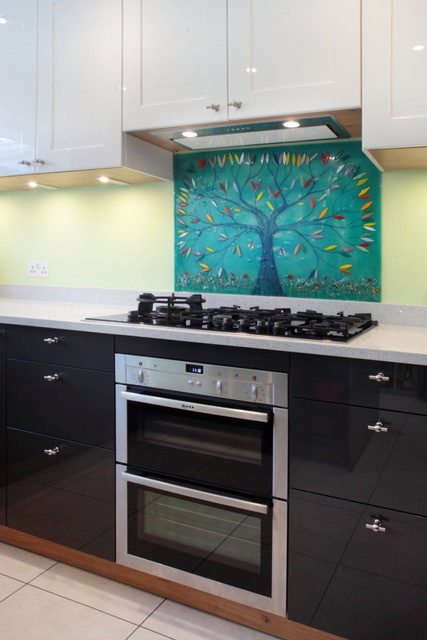 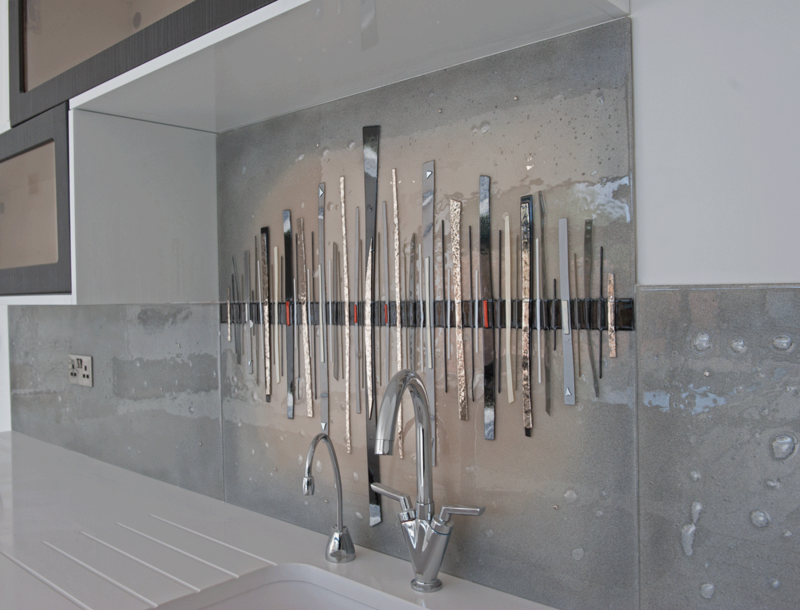 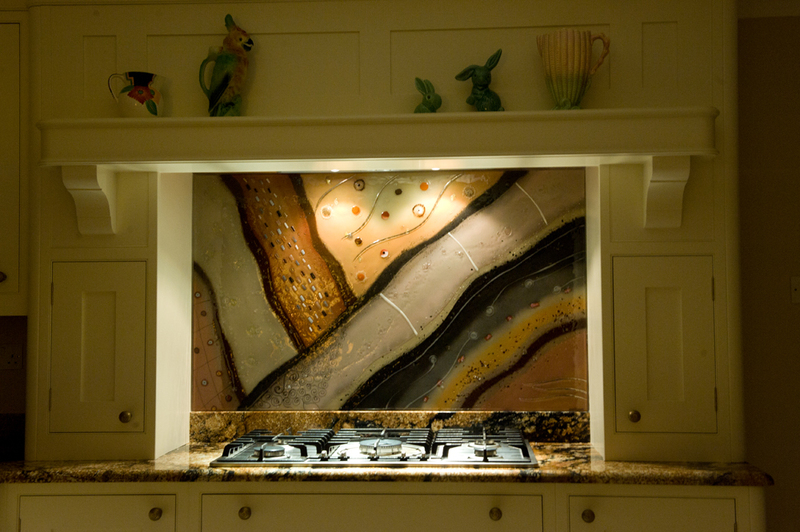 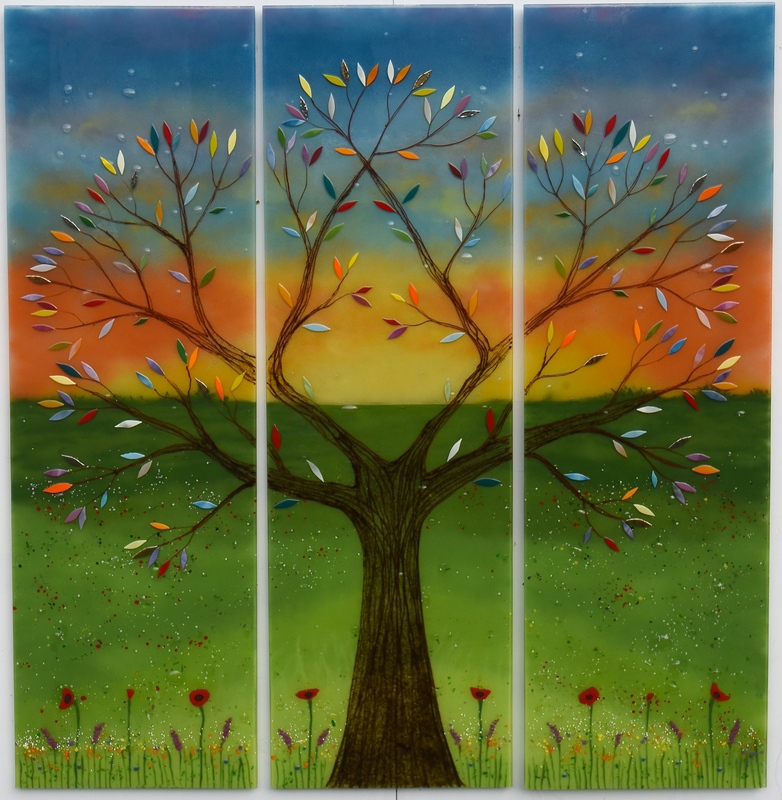 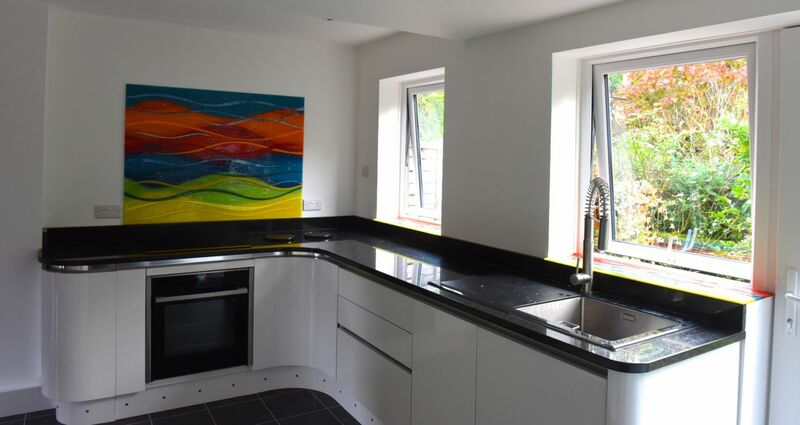 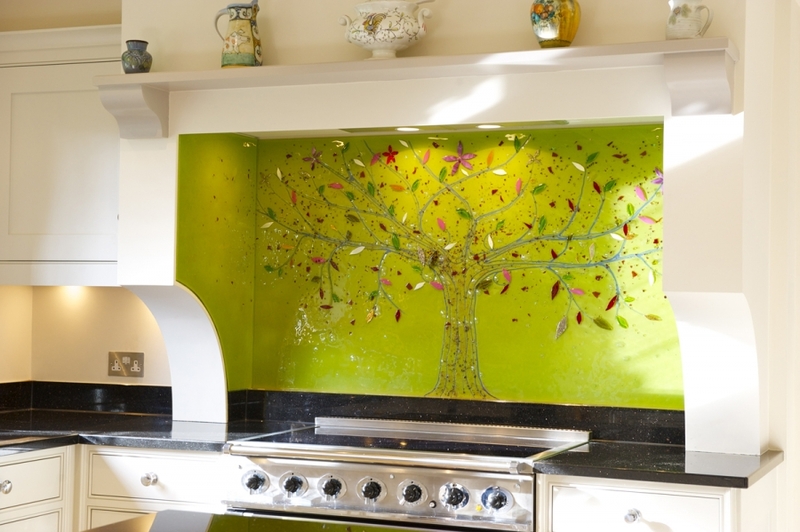 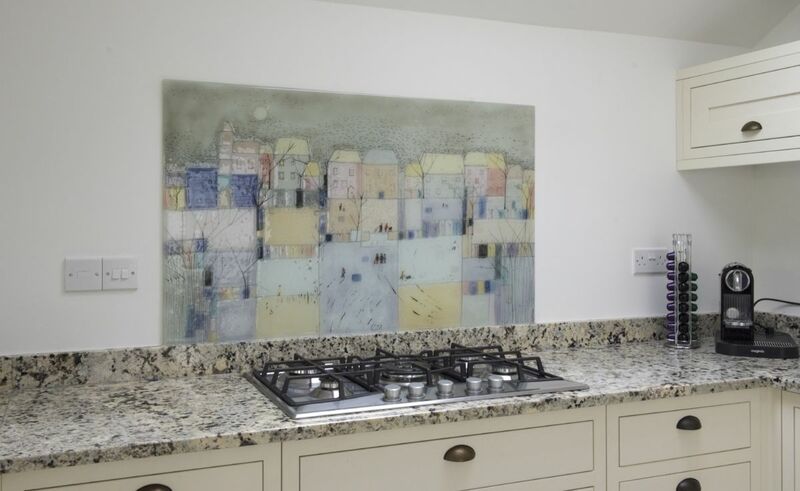 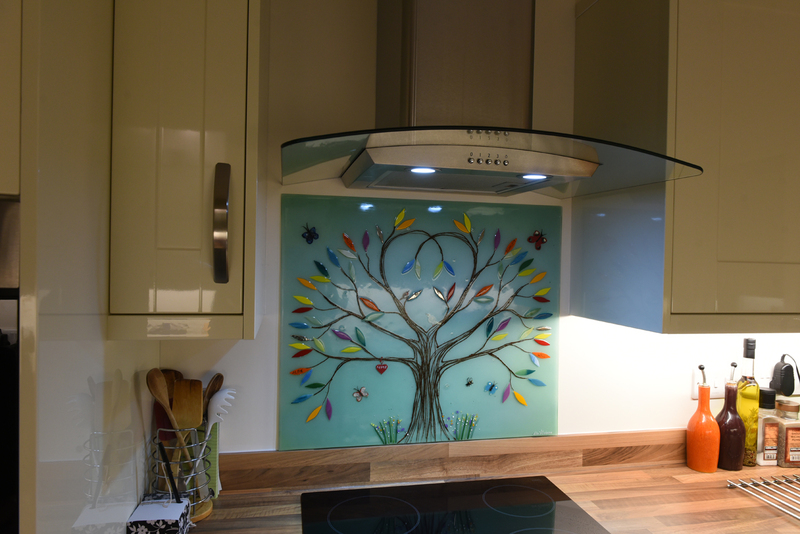 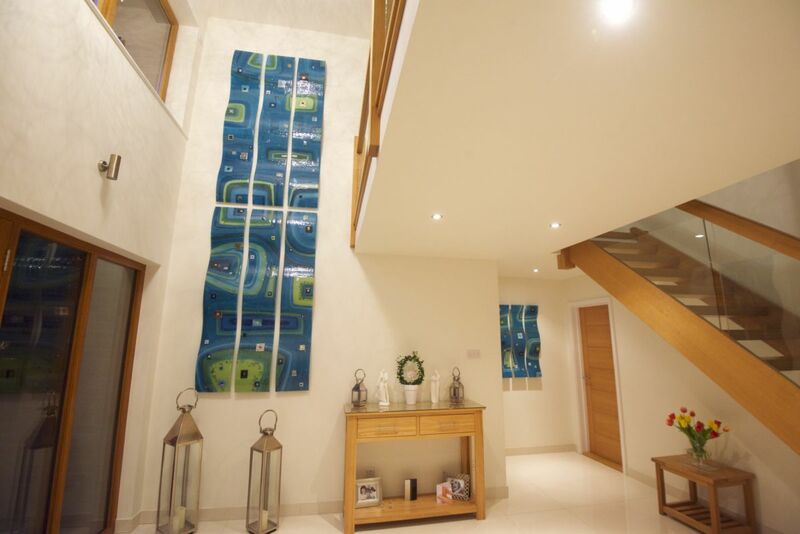 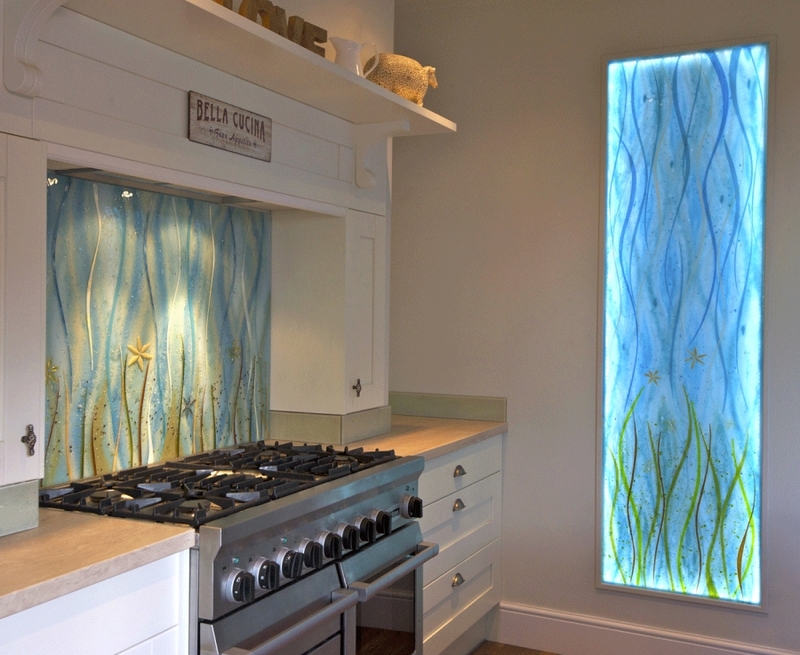 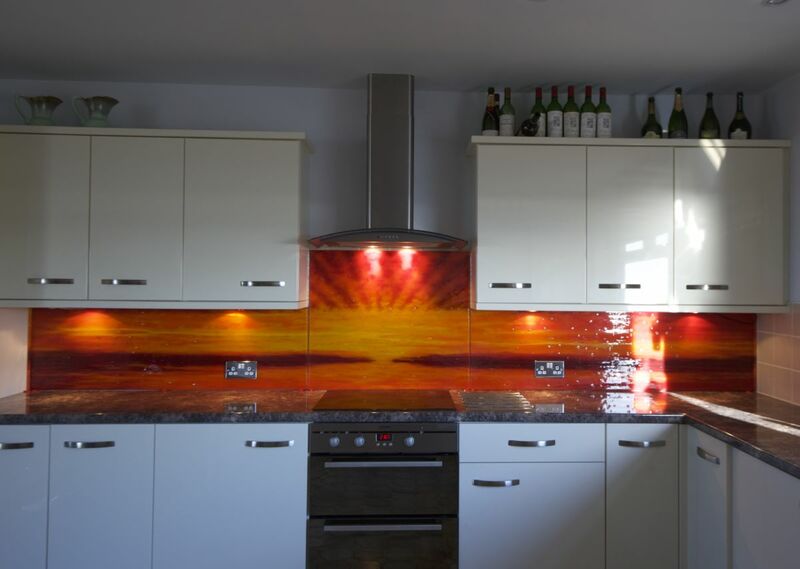 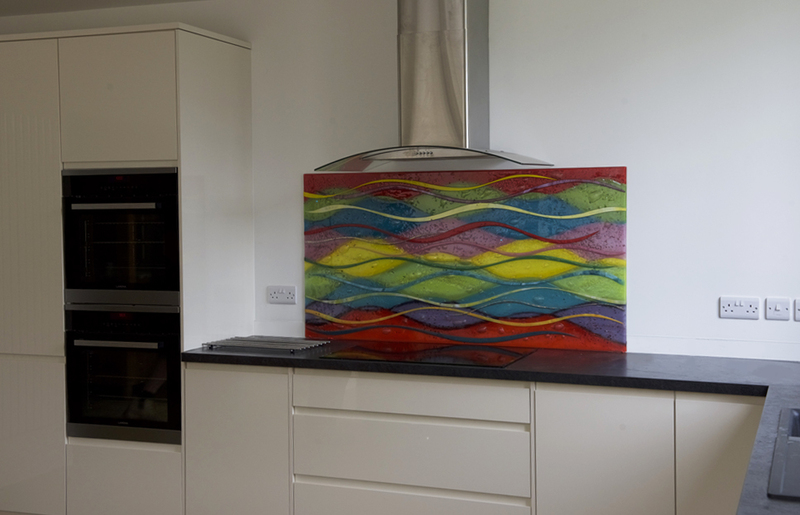 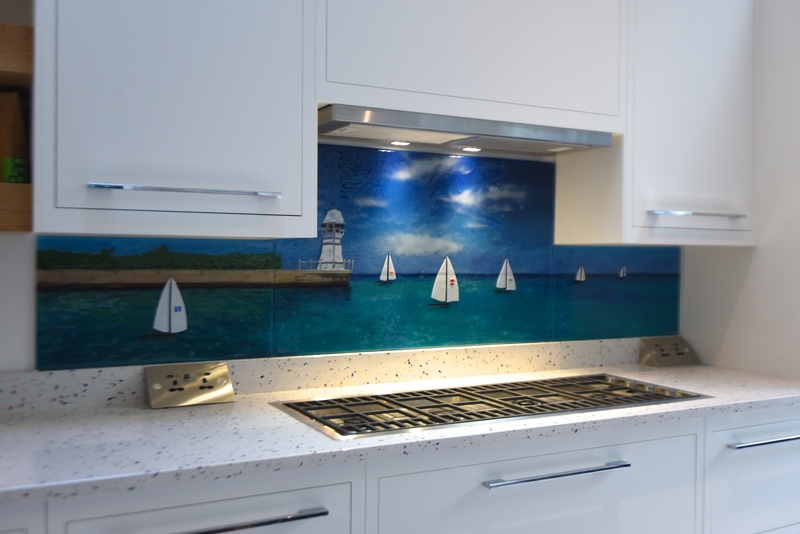 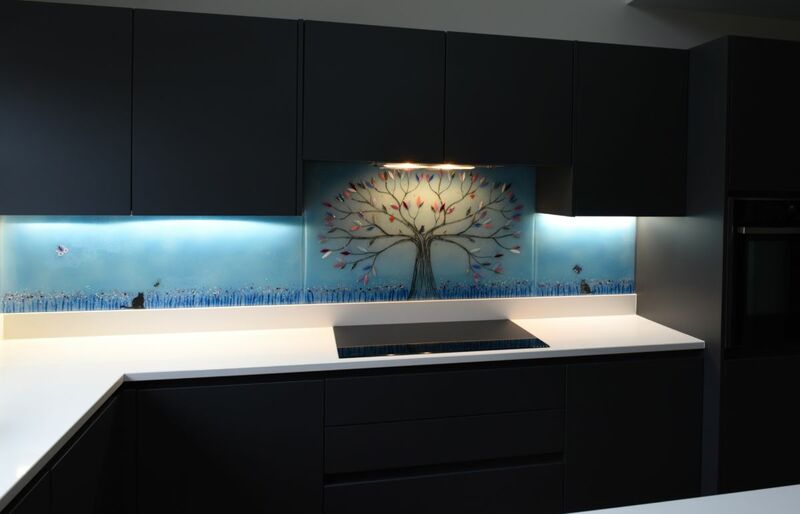 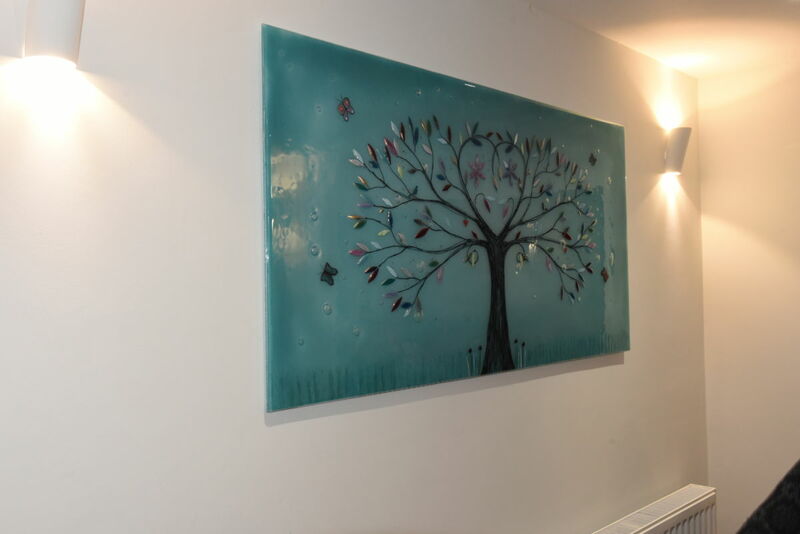 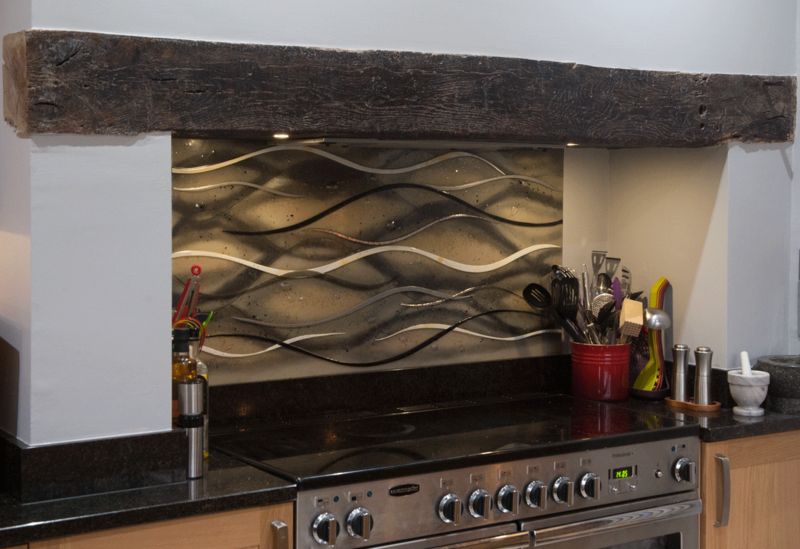 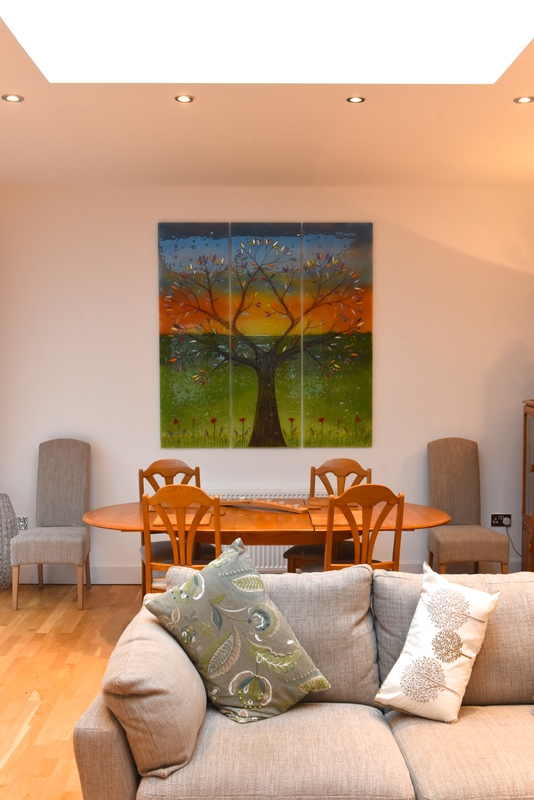 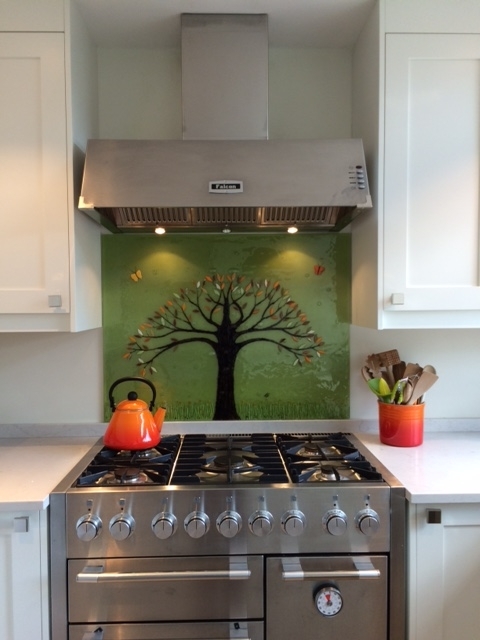 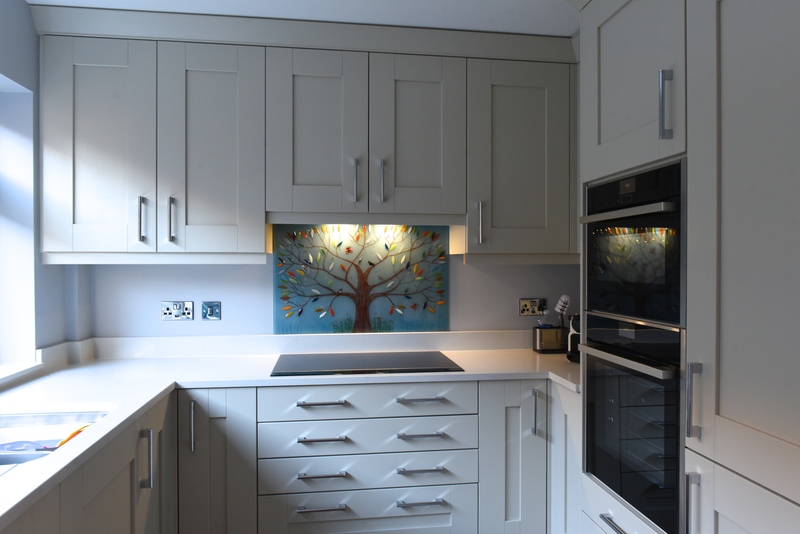 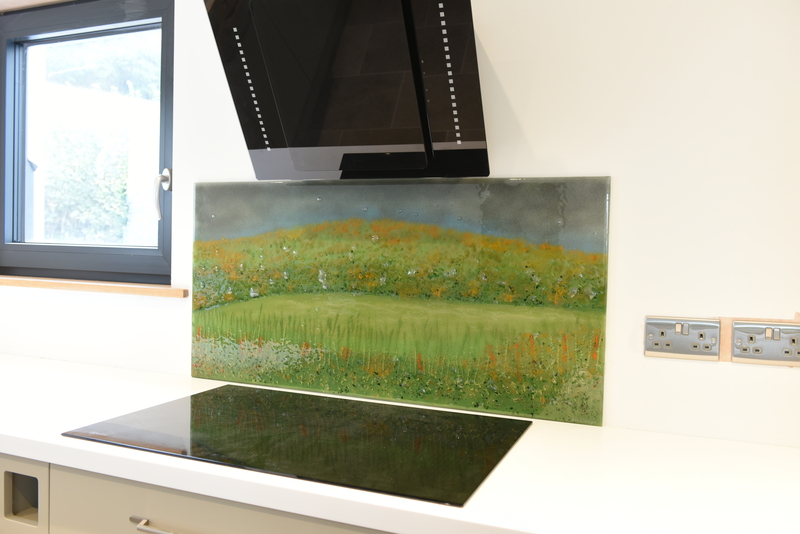 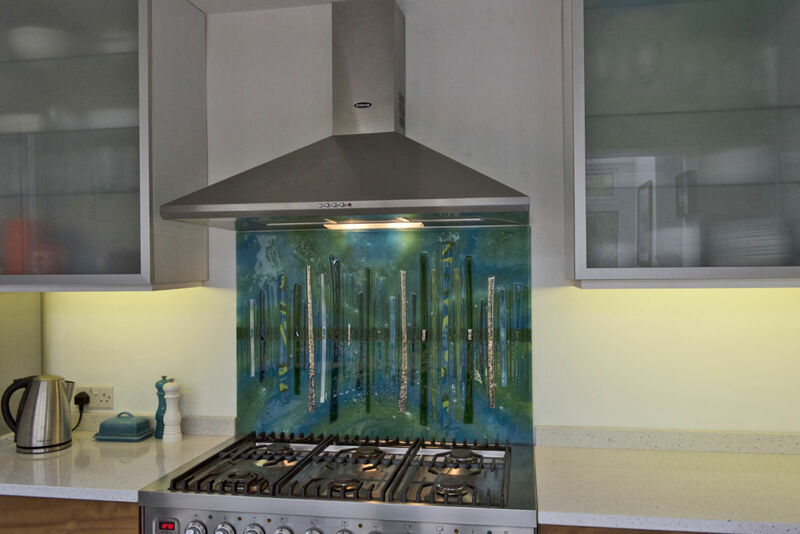 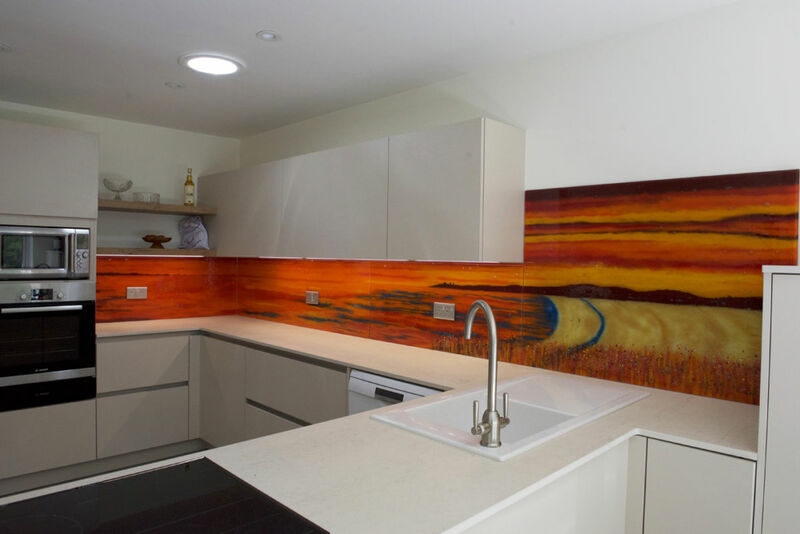 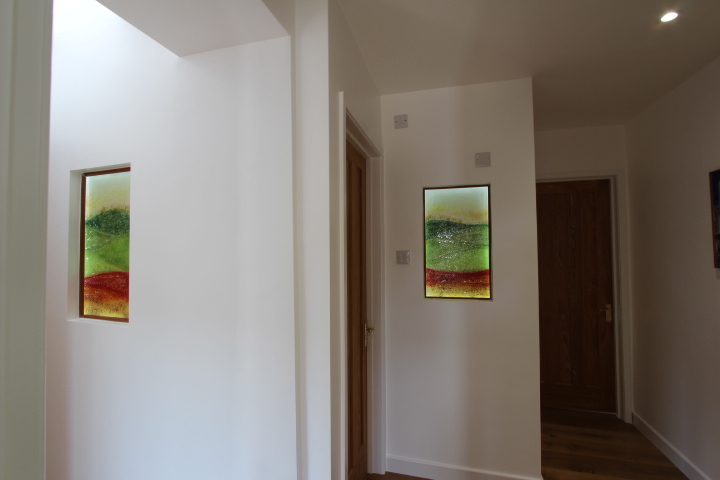 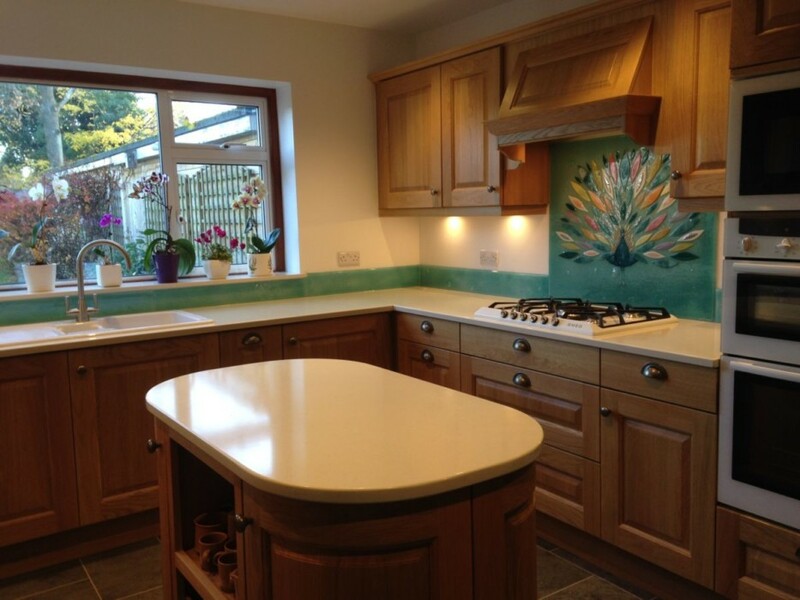 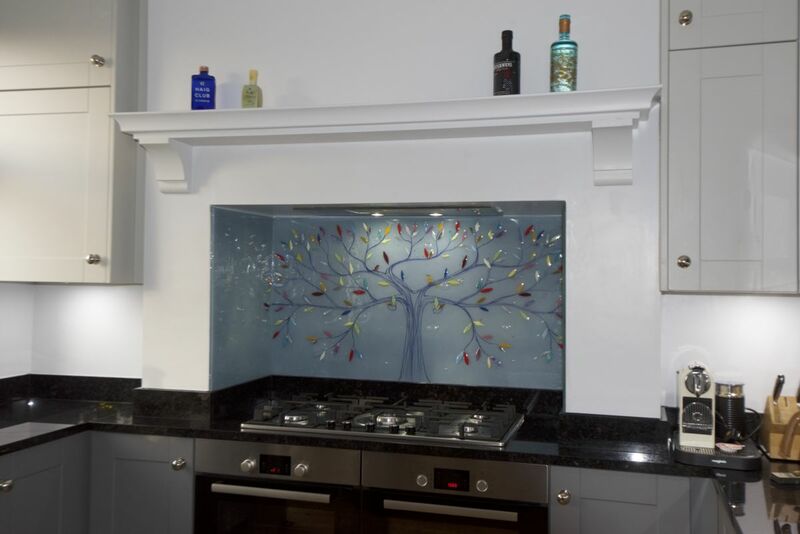 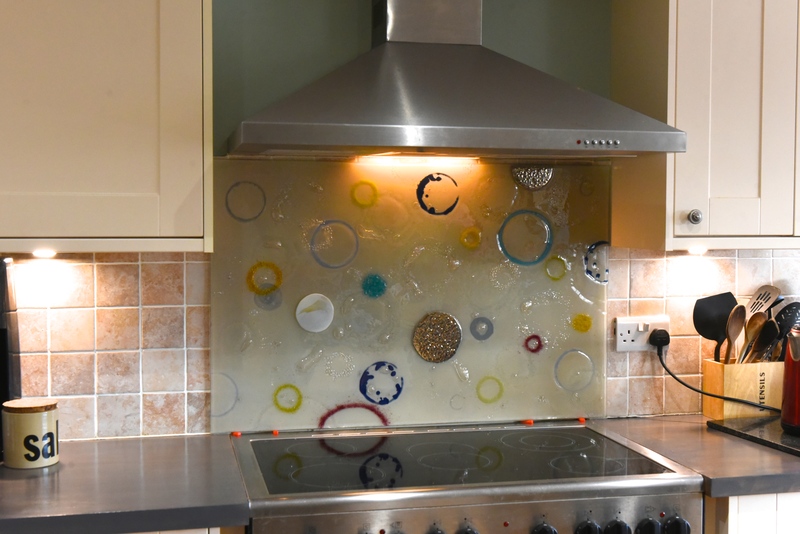 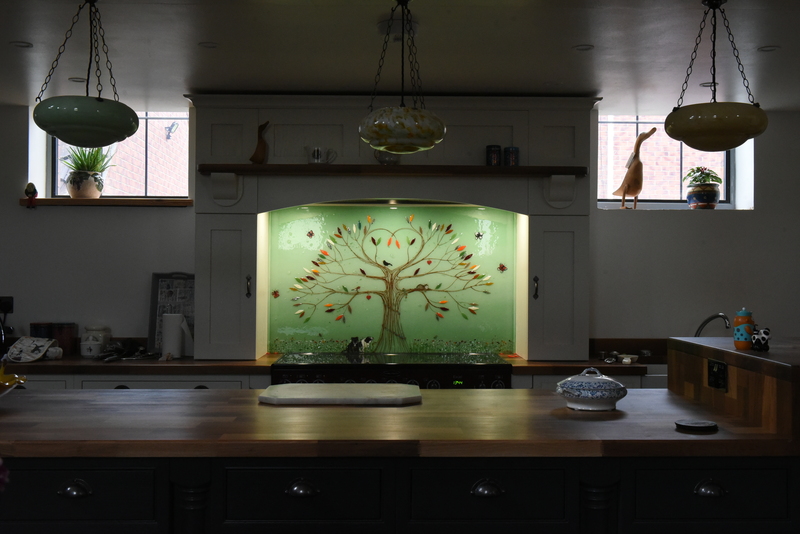 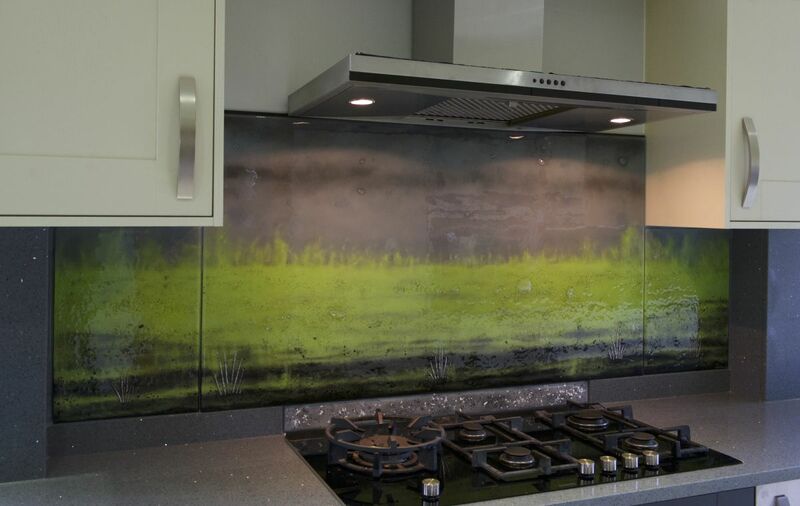 This beautiful fused glass art splashback is a Tree of Life, bringing a very natural feeling to the kitchen it found a home in. 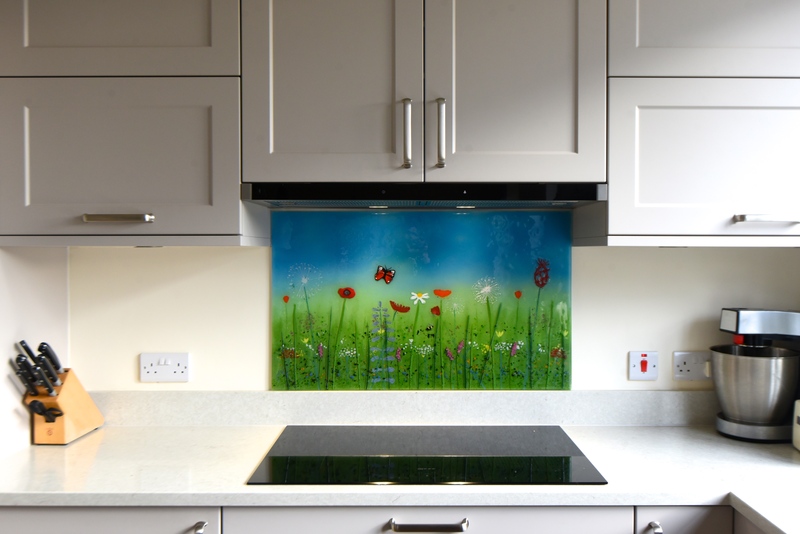 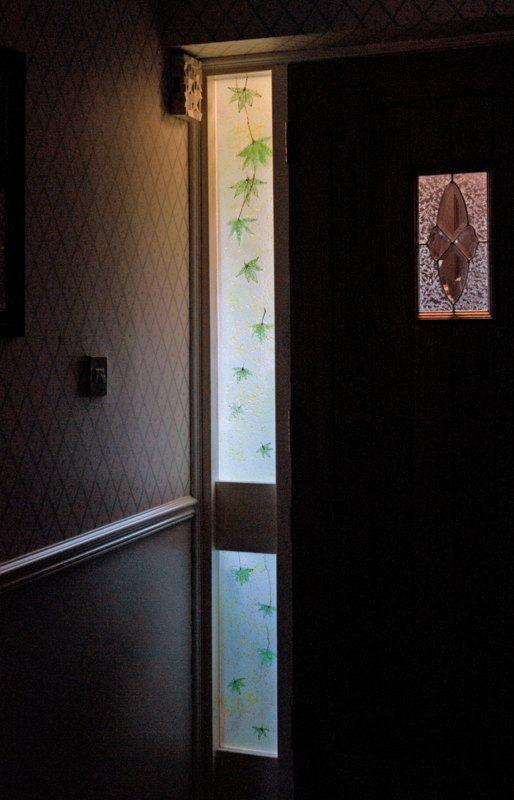 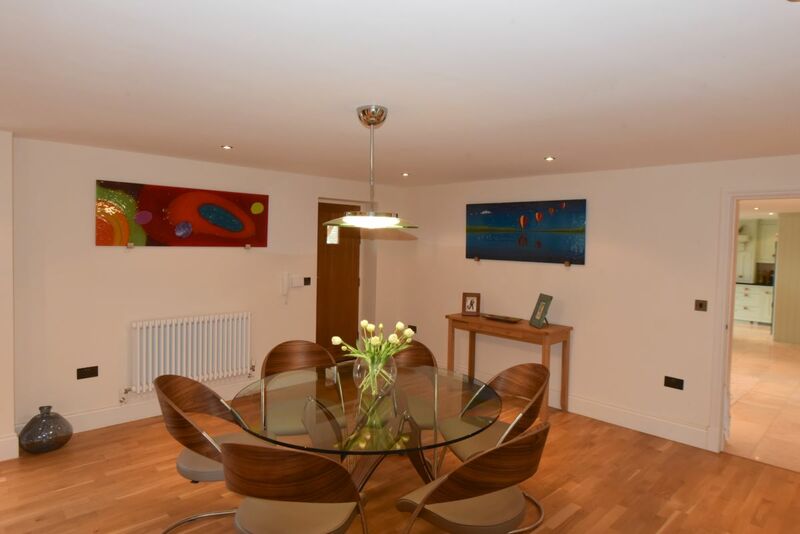 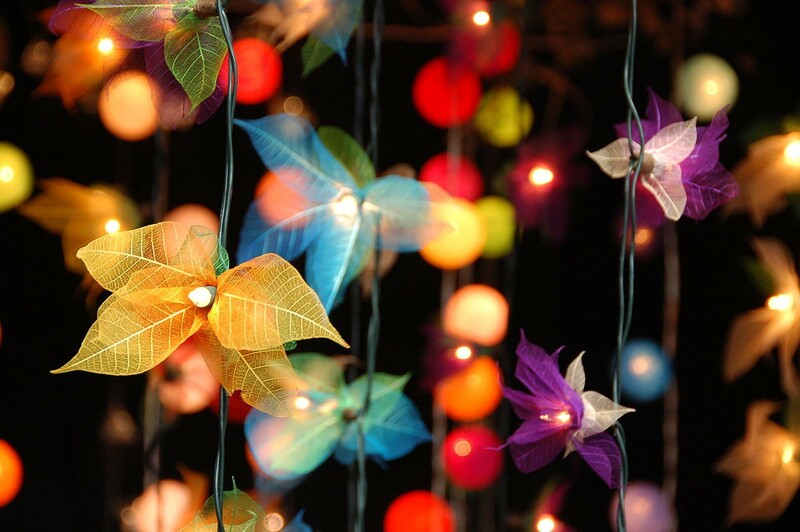 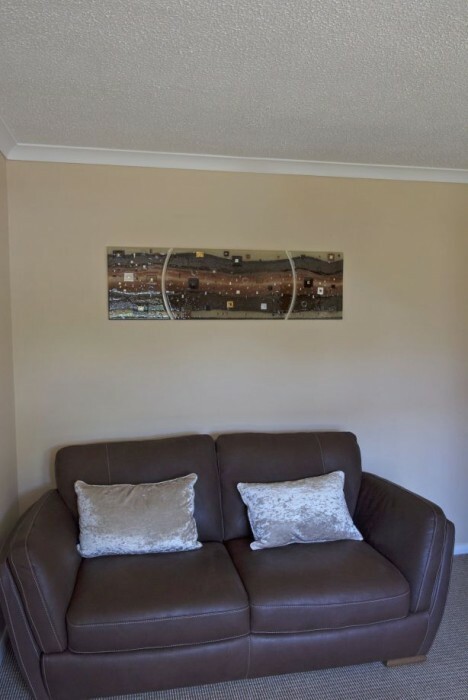 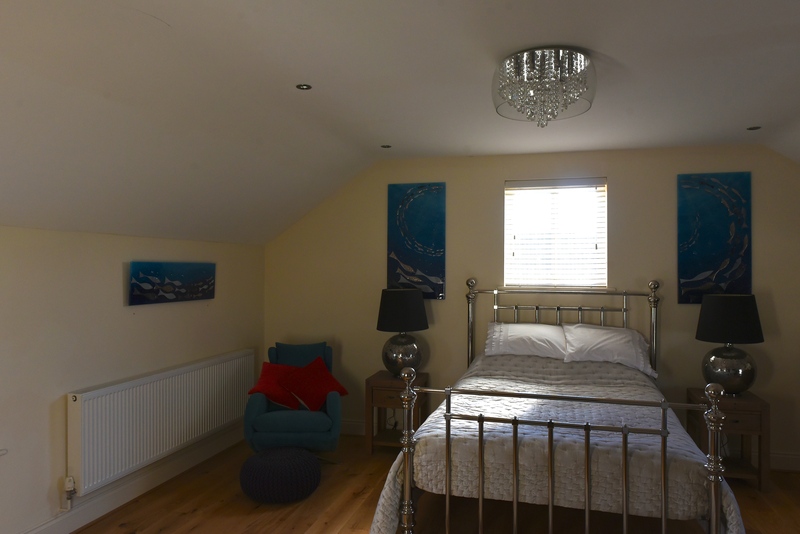 It even has accompanying butterflies to really bring the best parts of the great outdoors indoors! 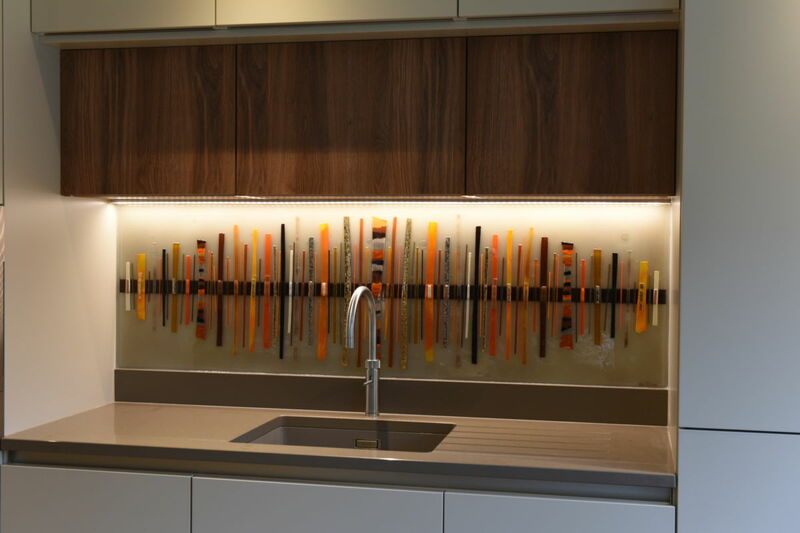 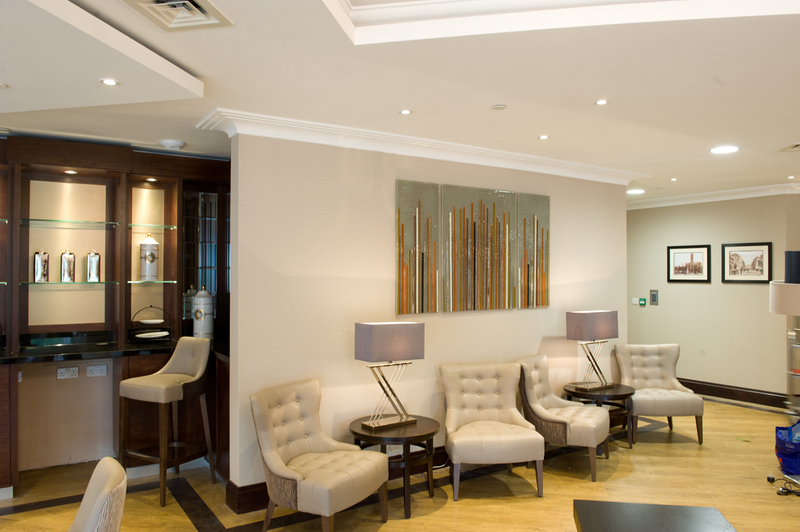 The client took full advantage of our ability to create pieces that are completely personalised, providing a piece of fabric which consisted of olive hues and autumnal oranges. 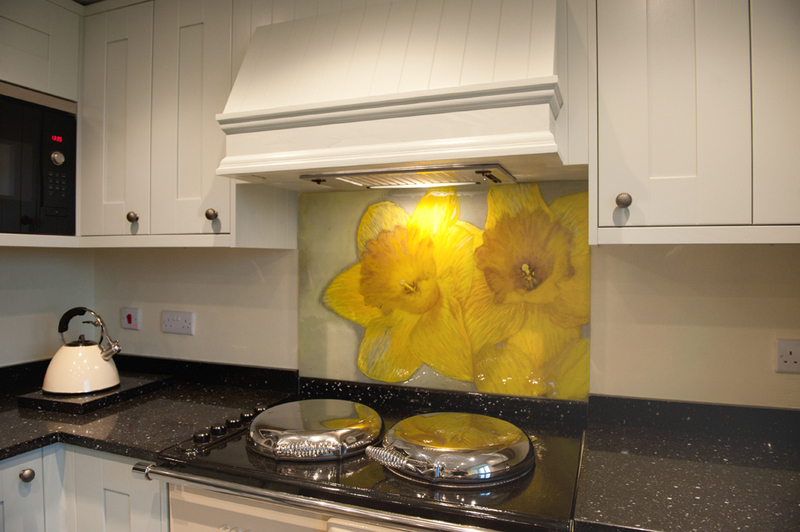 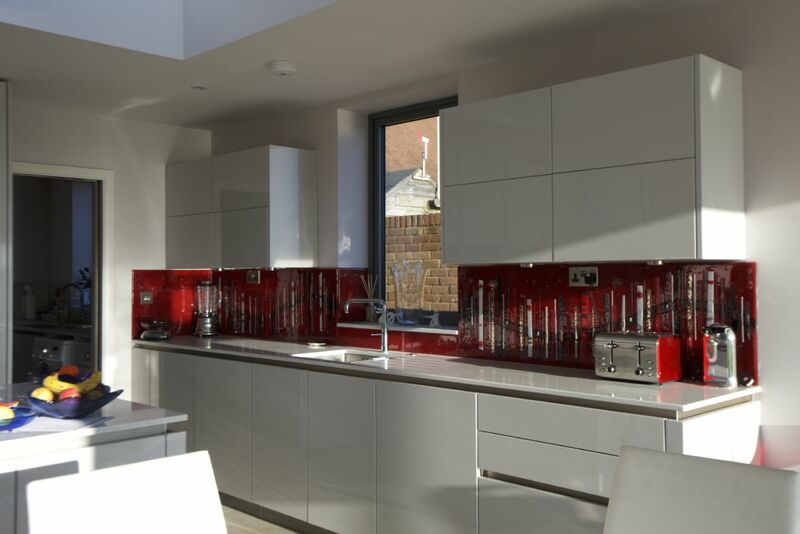 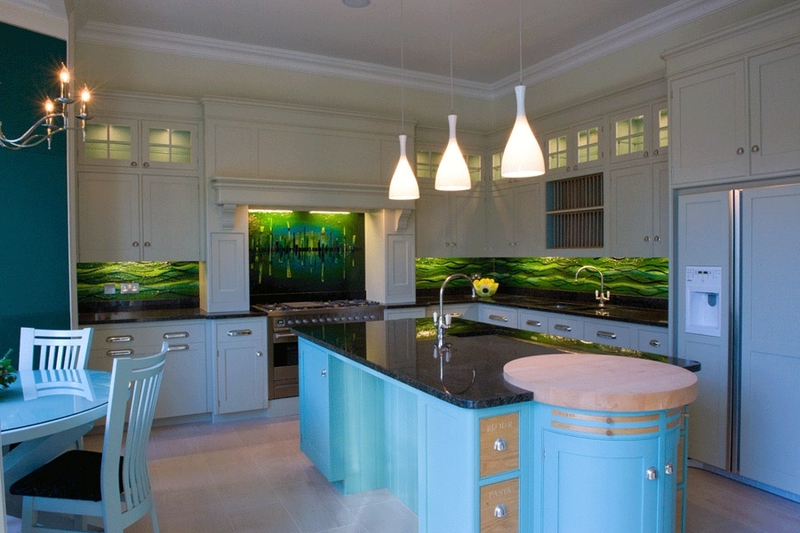 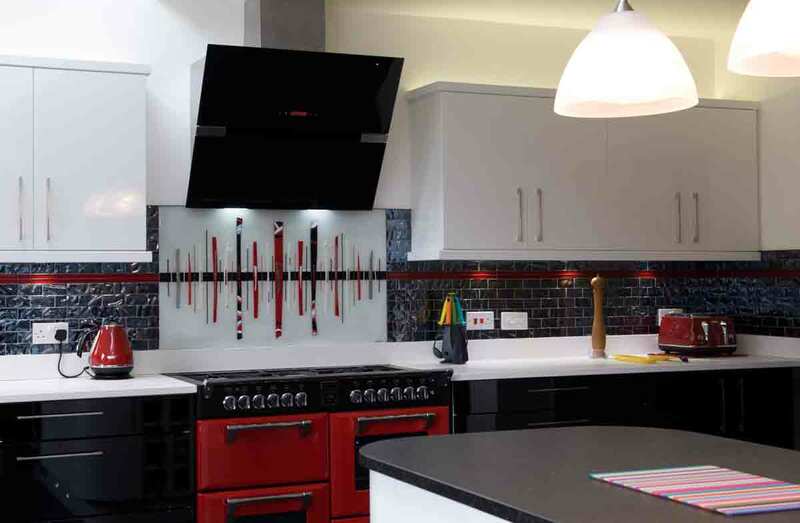 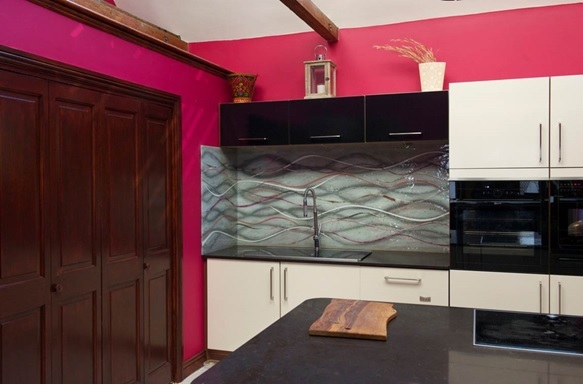 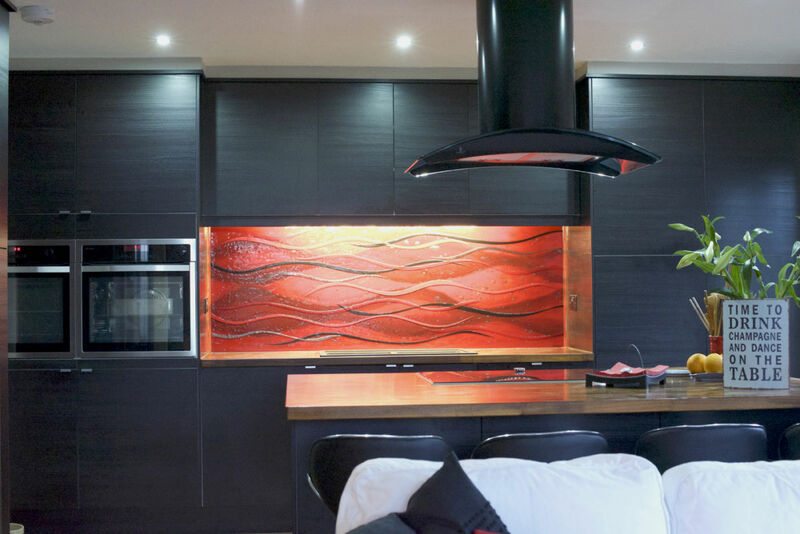 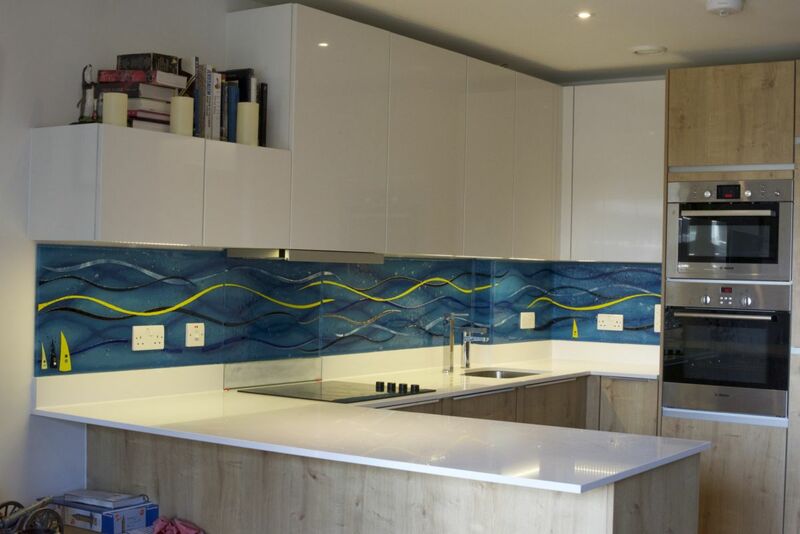 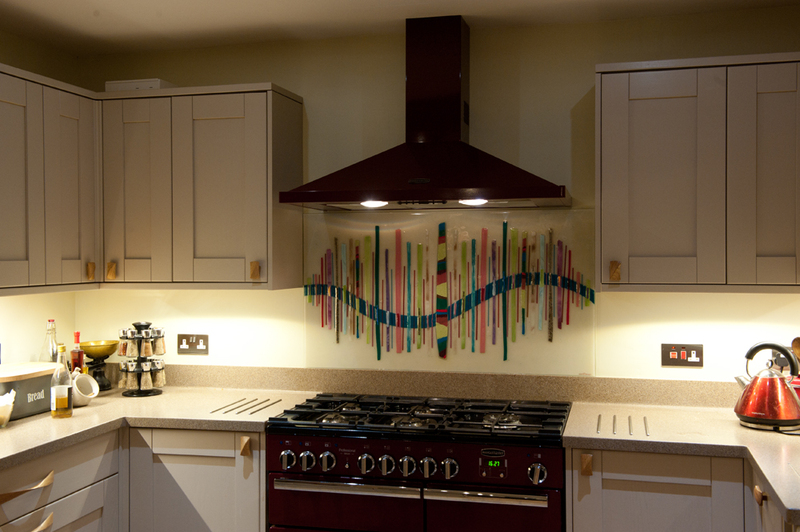 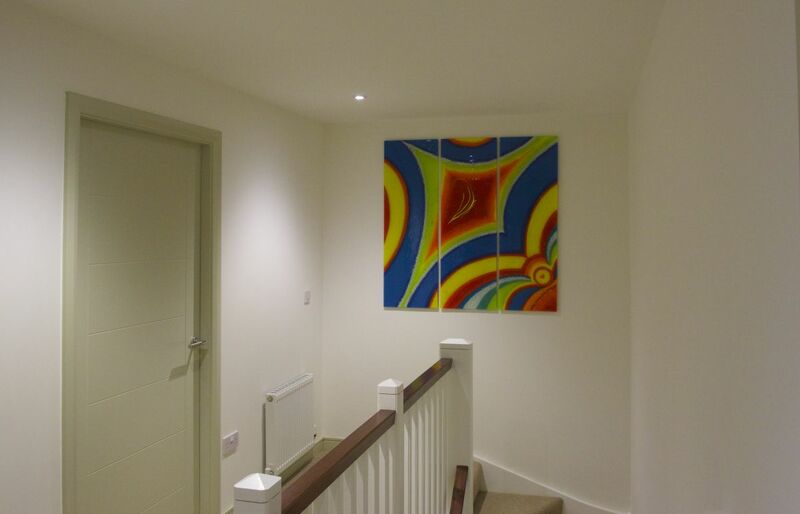 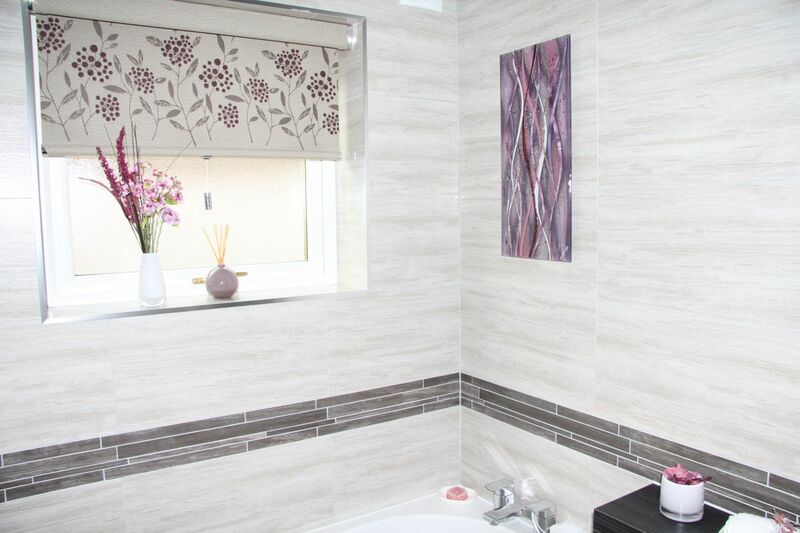 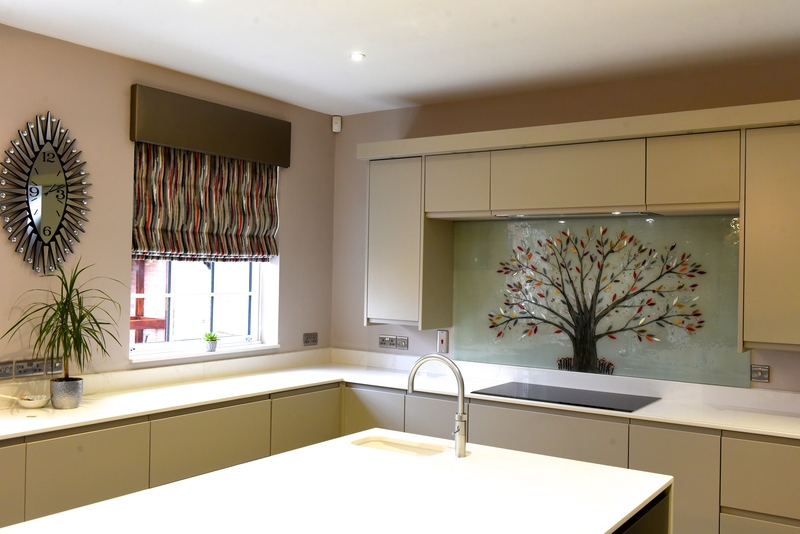 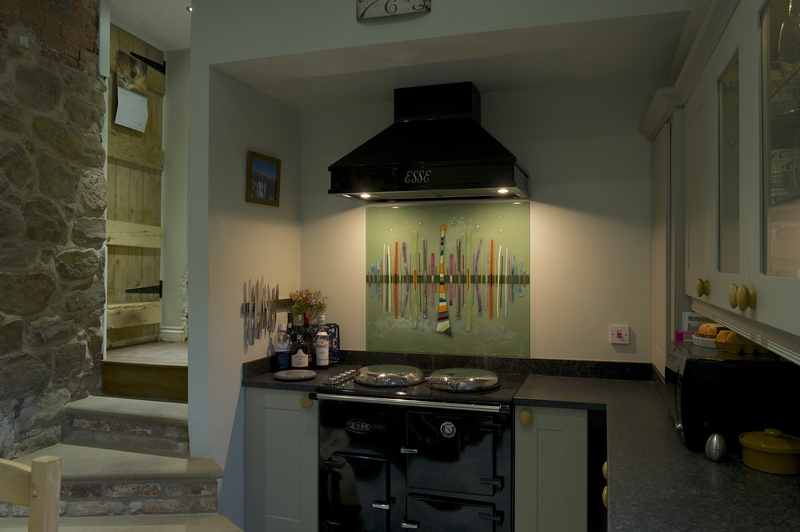 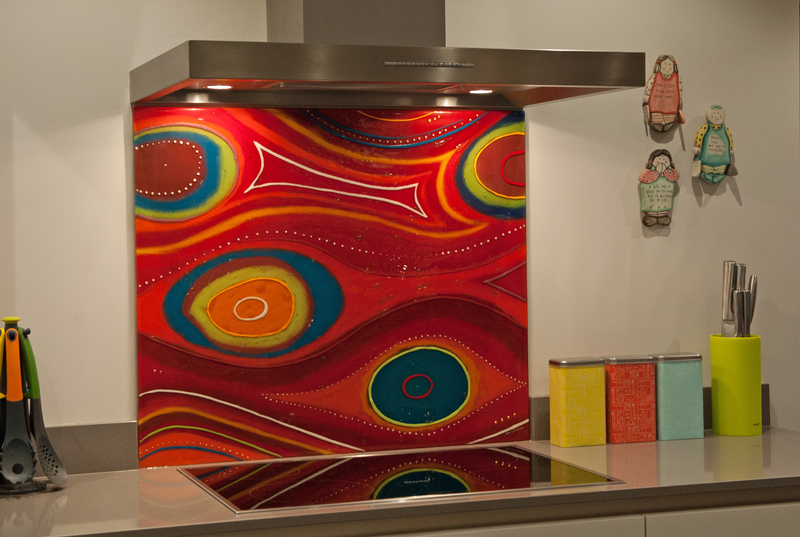 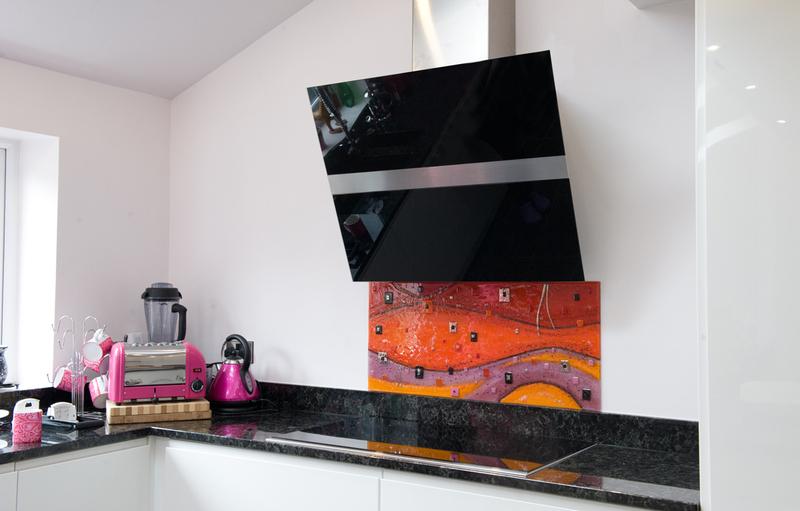 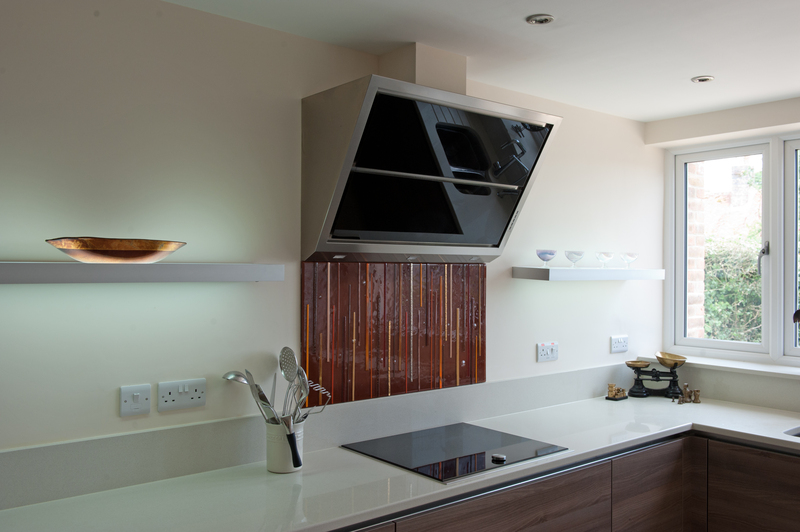 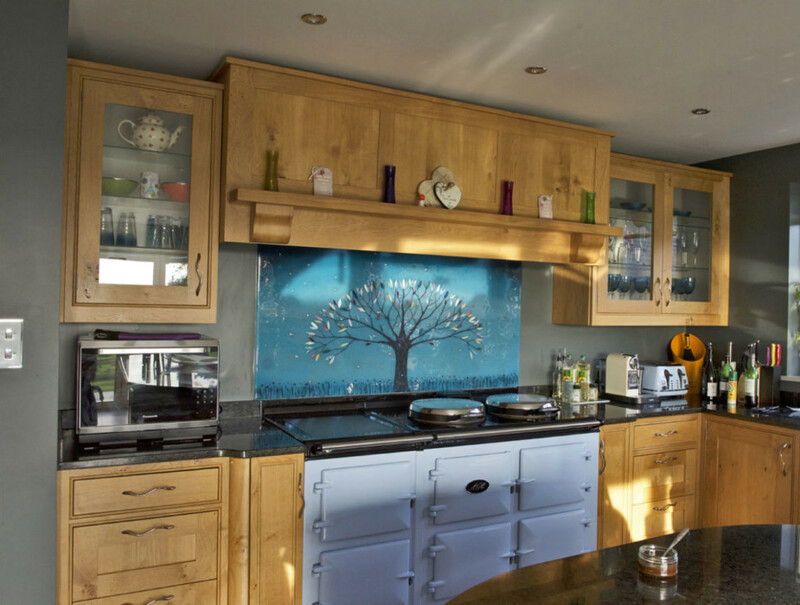 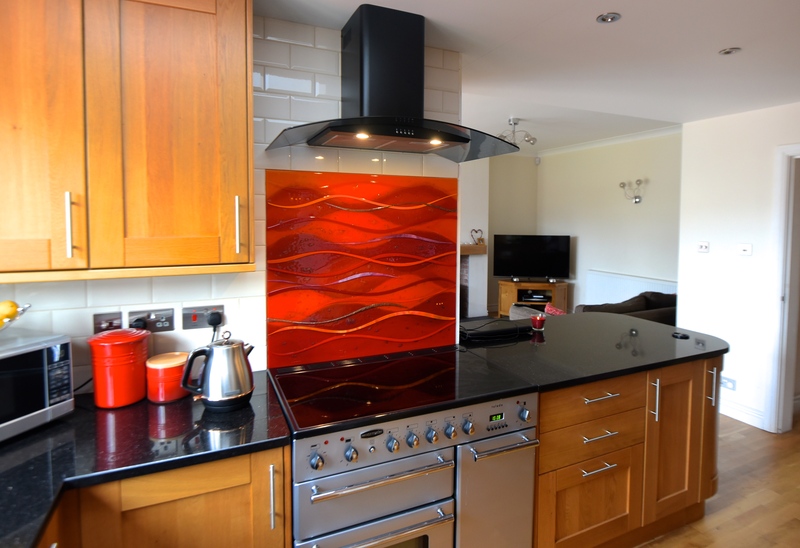 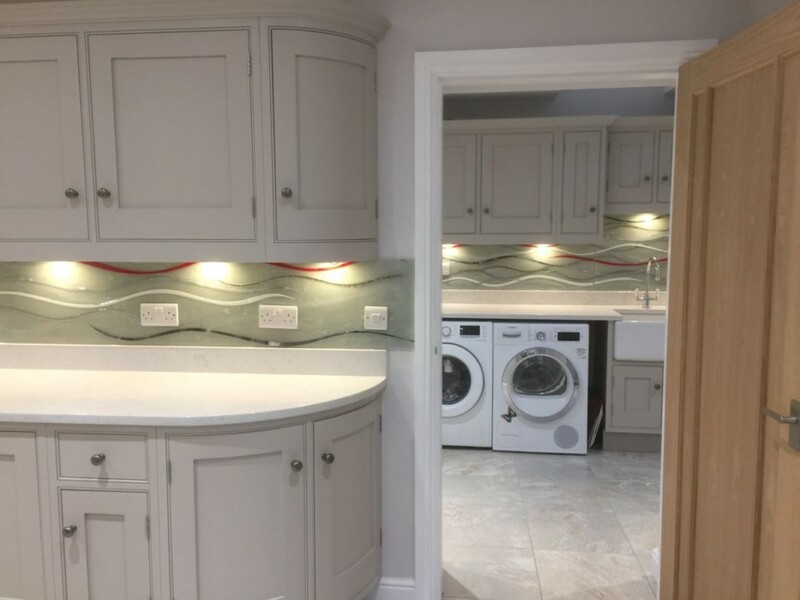 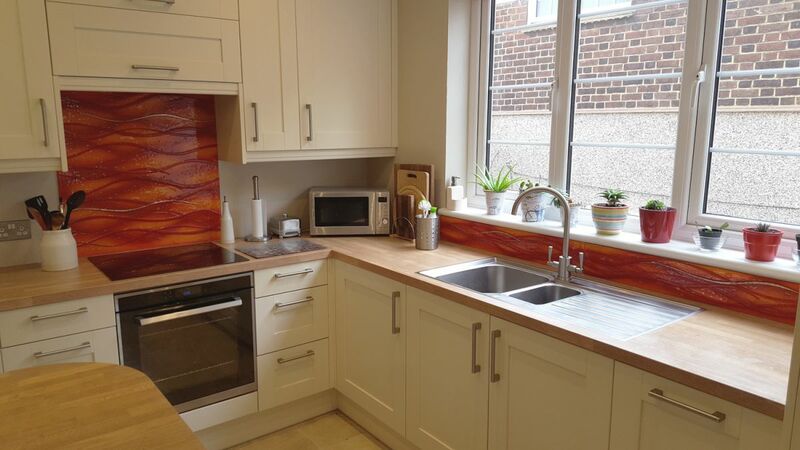 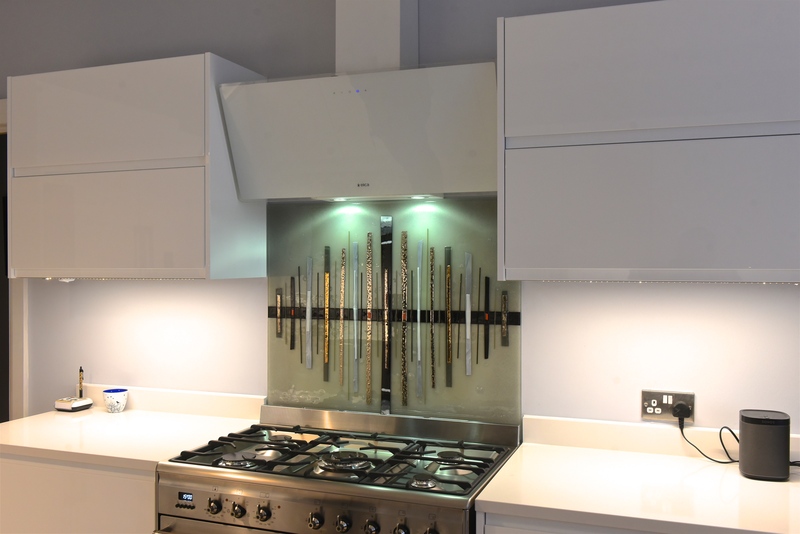 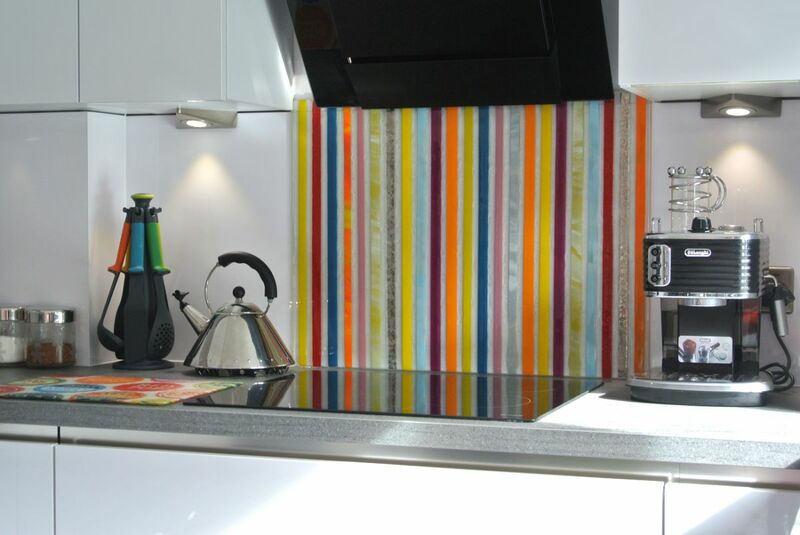 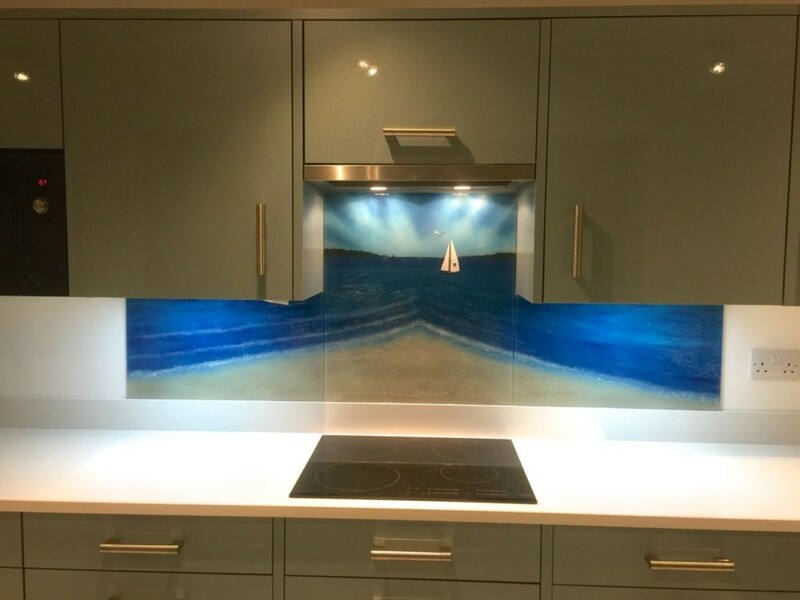 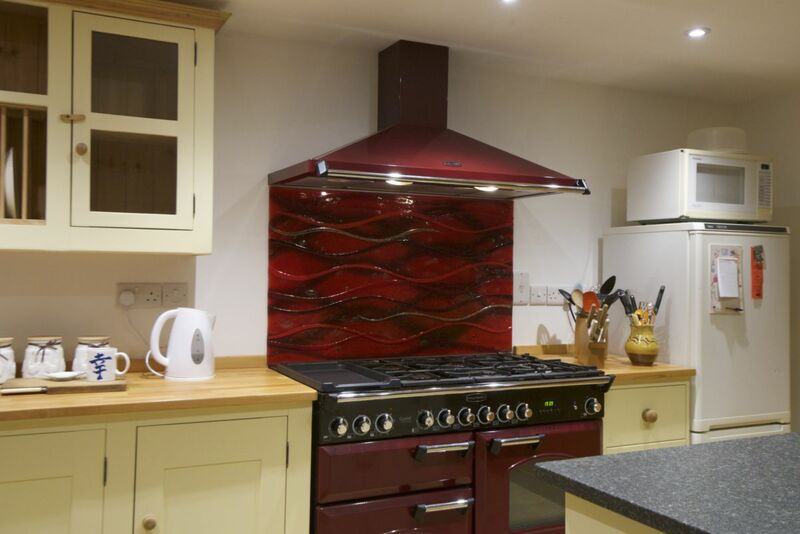 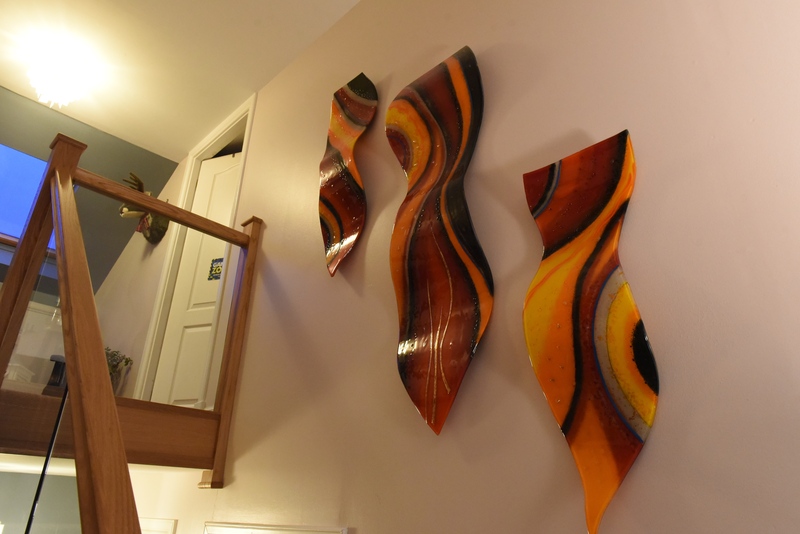 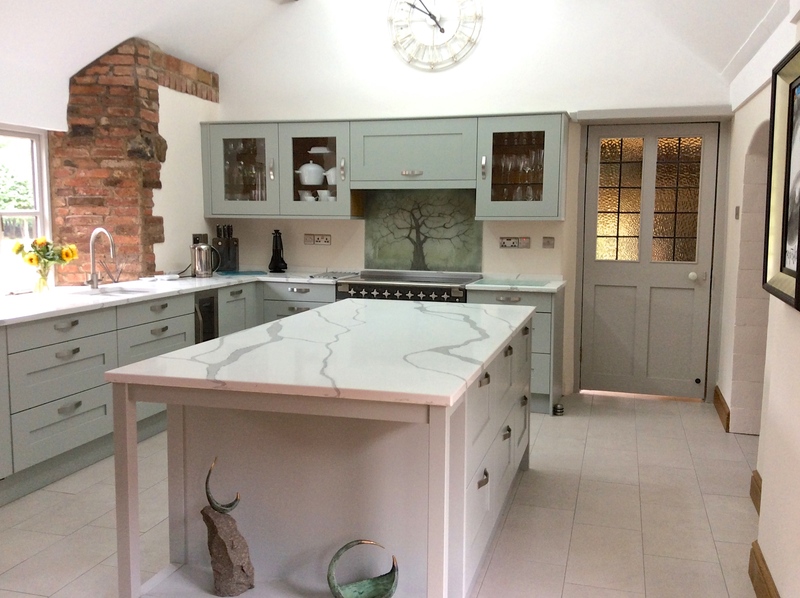 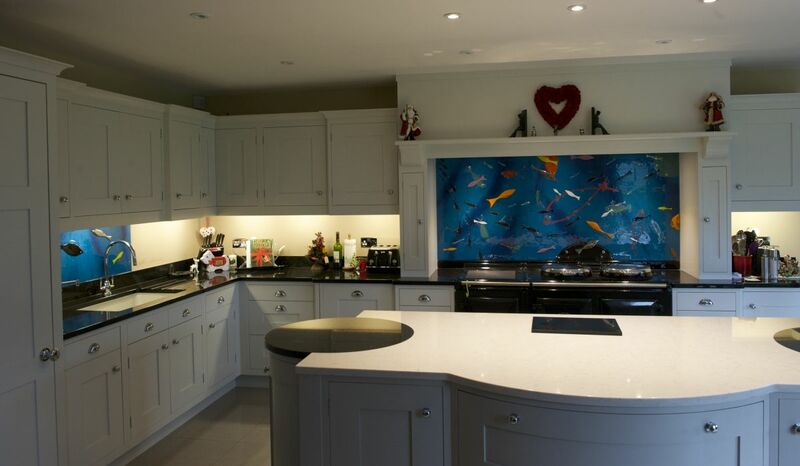 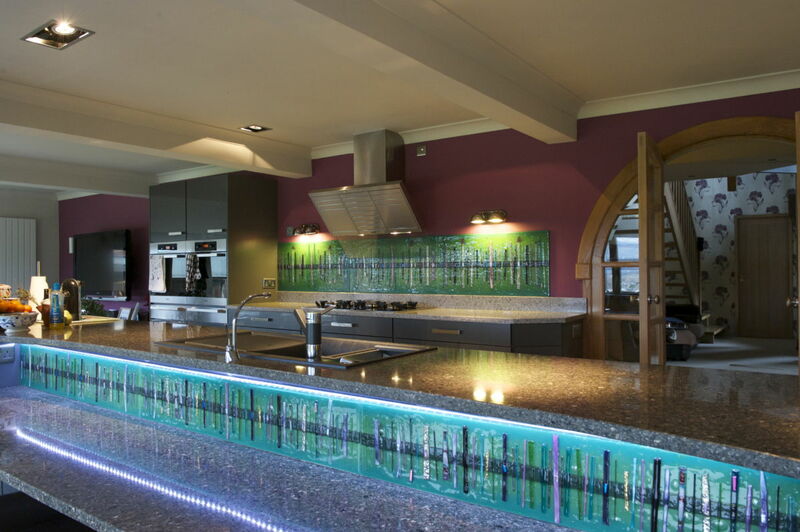 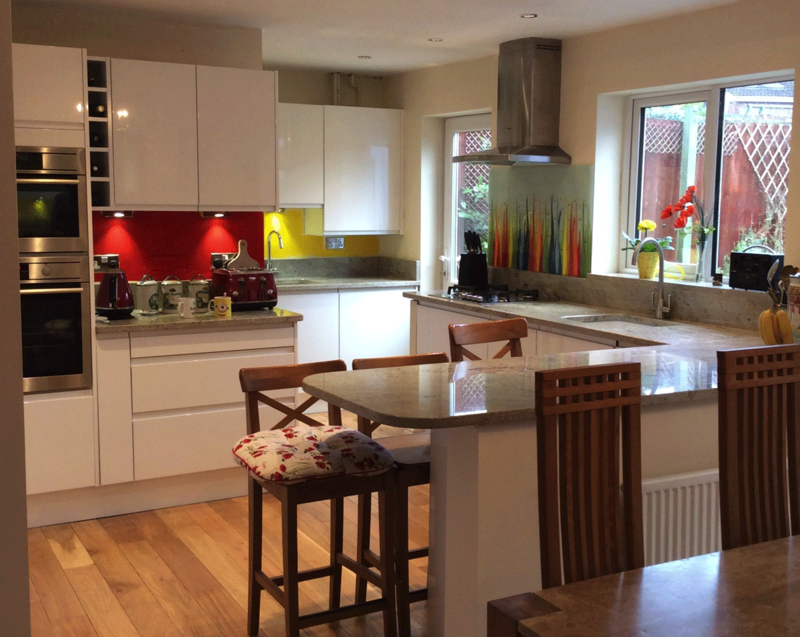 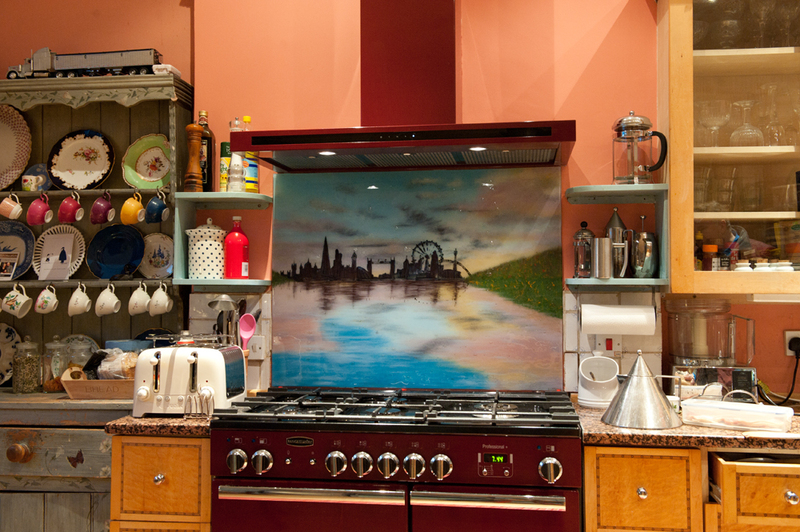 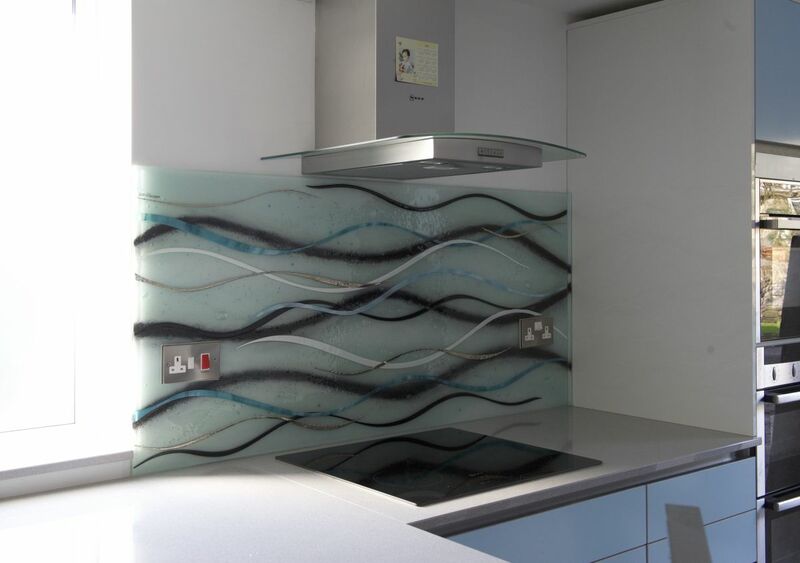 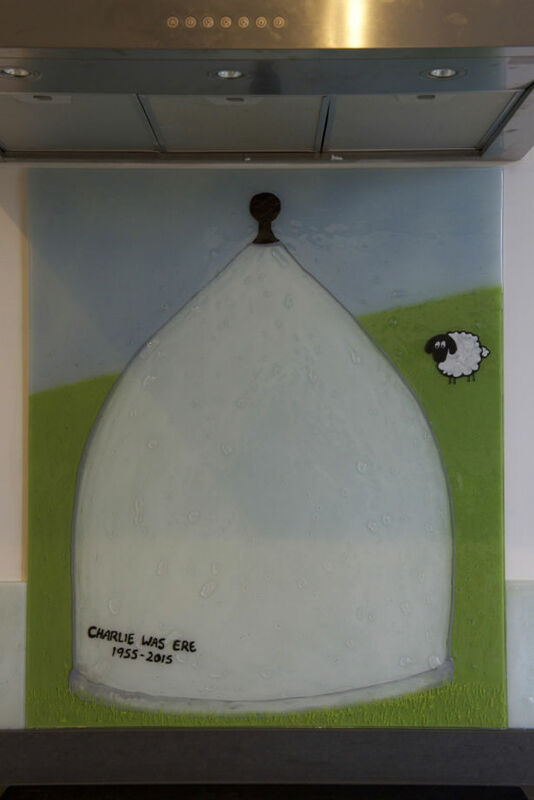 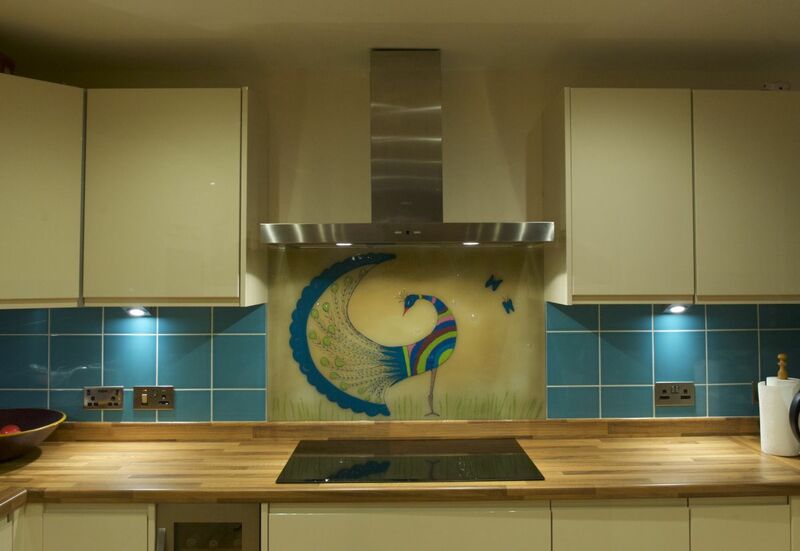 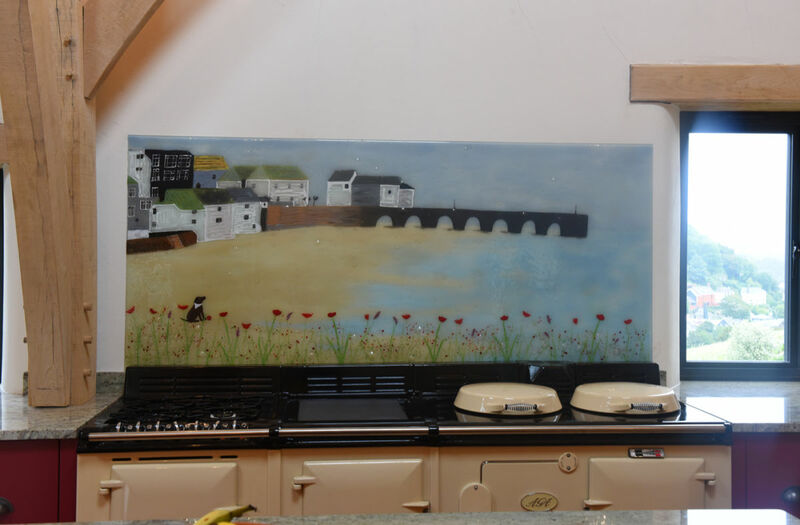 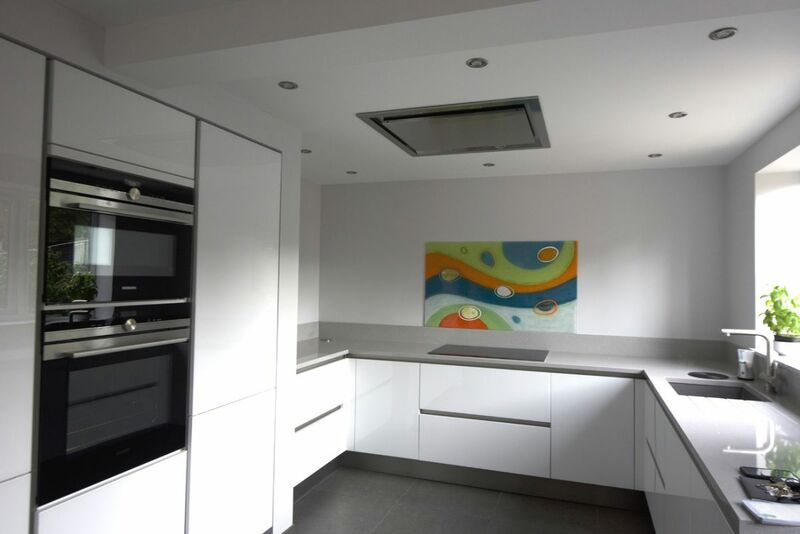 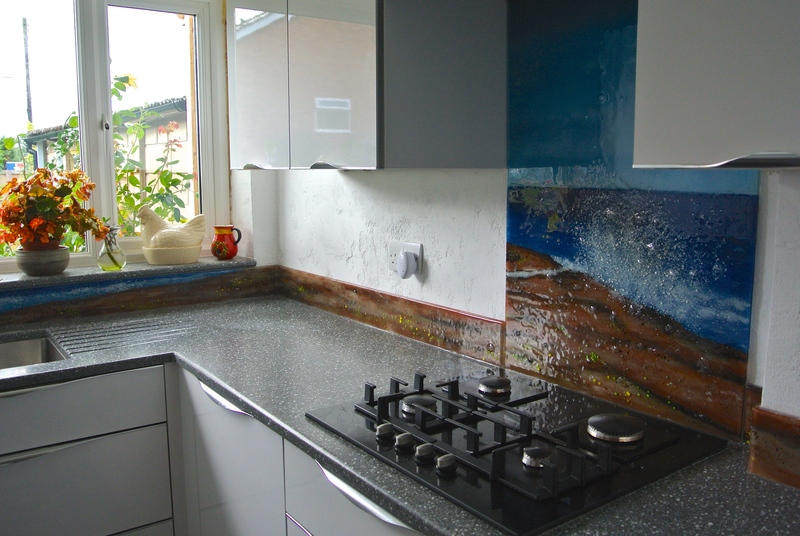 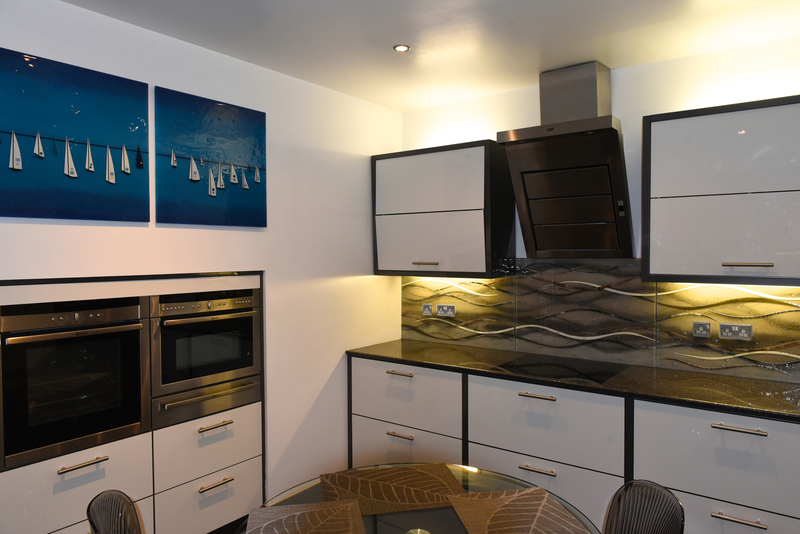 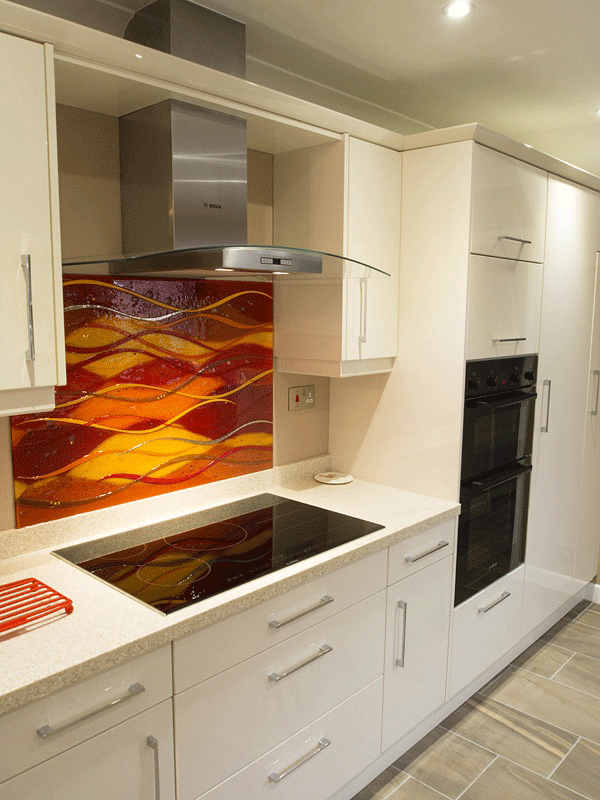 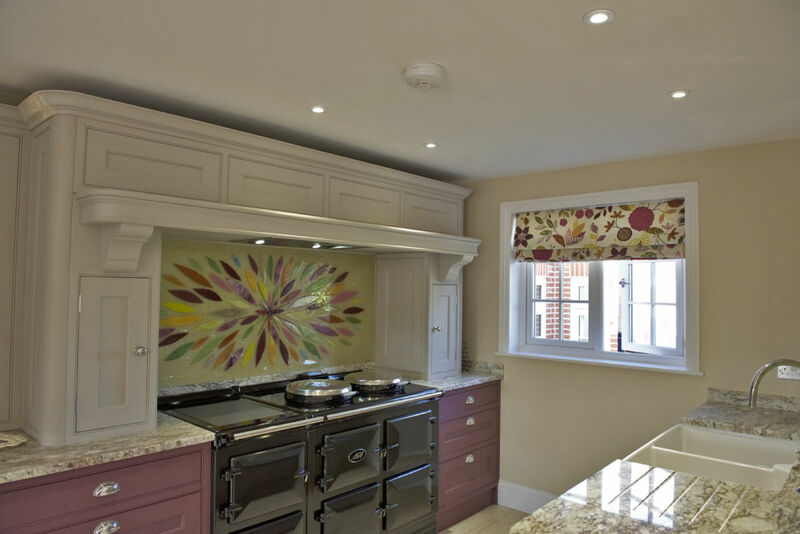 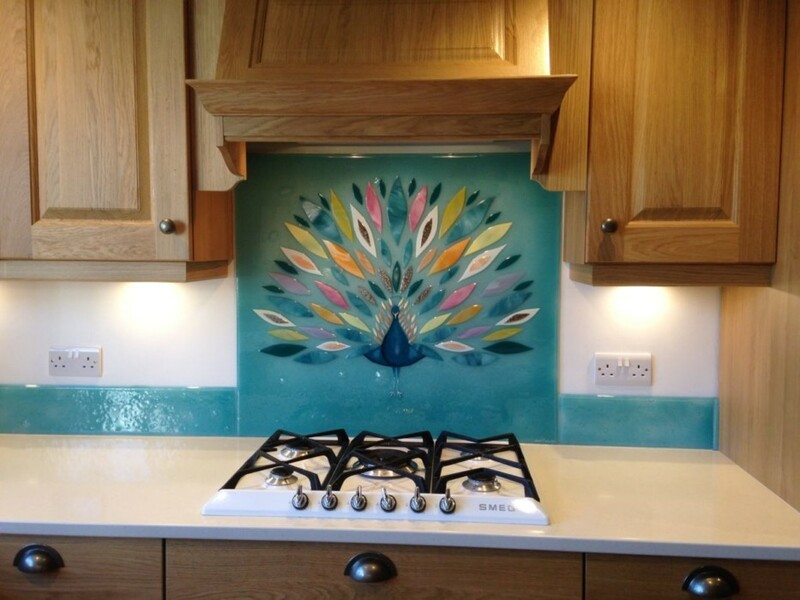 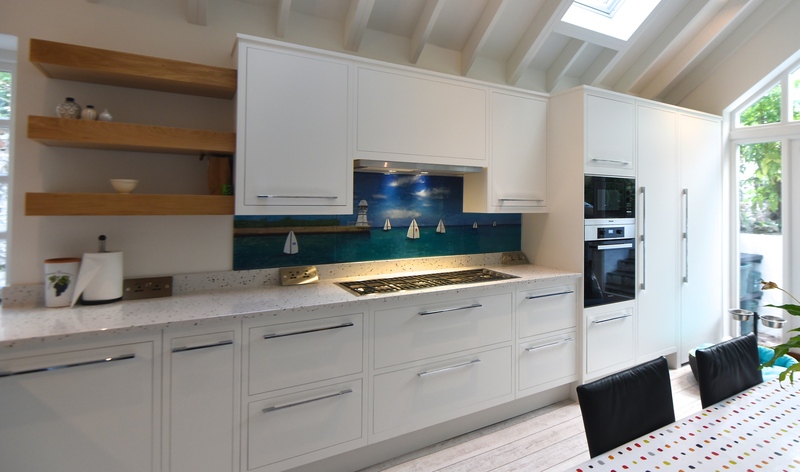 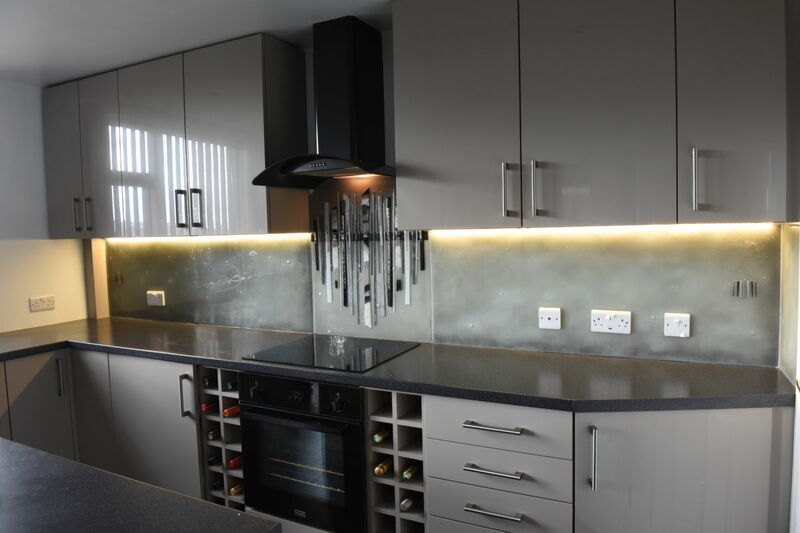 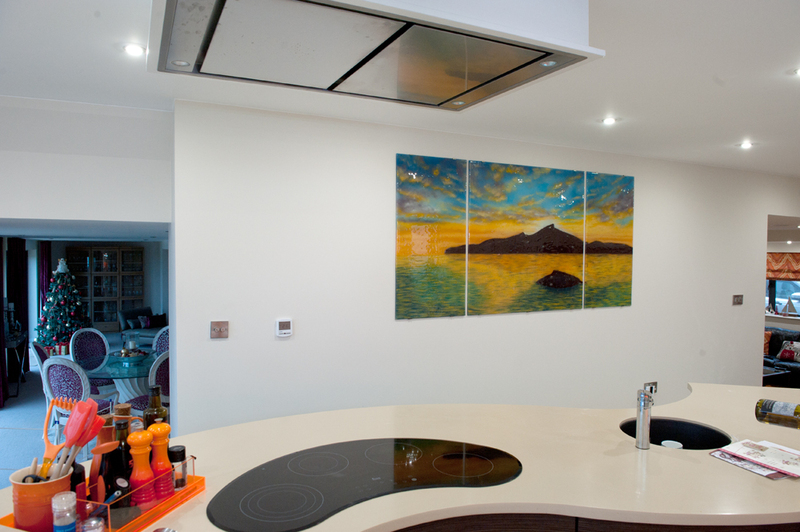 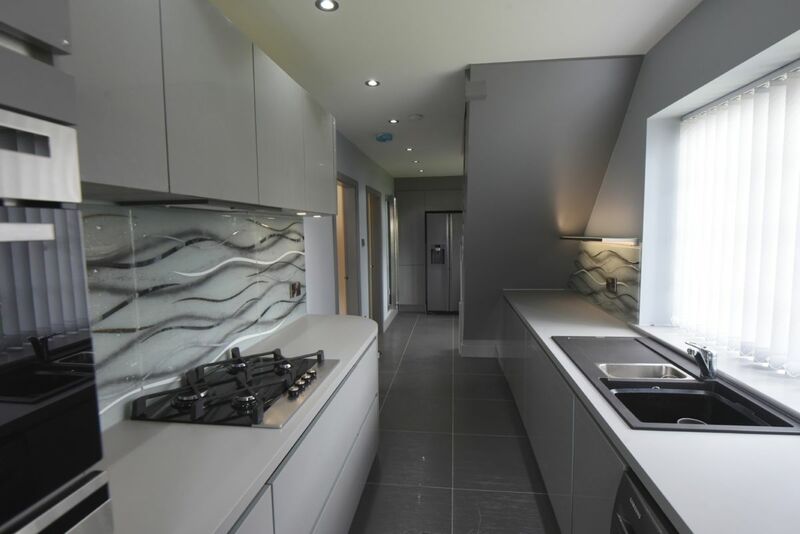 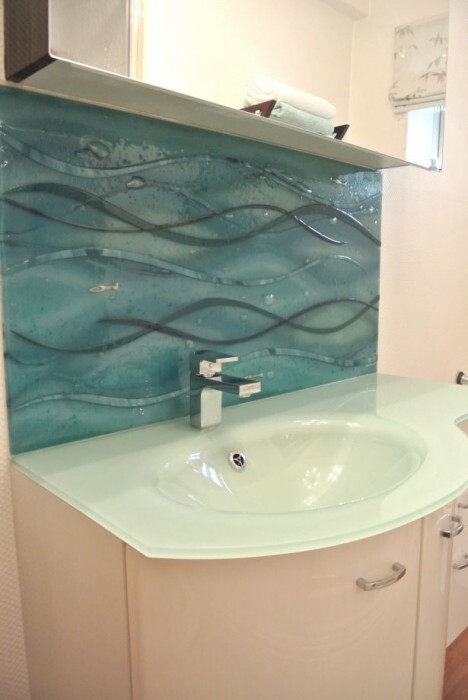 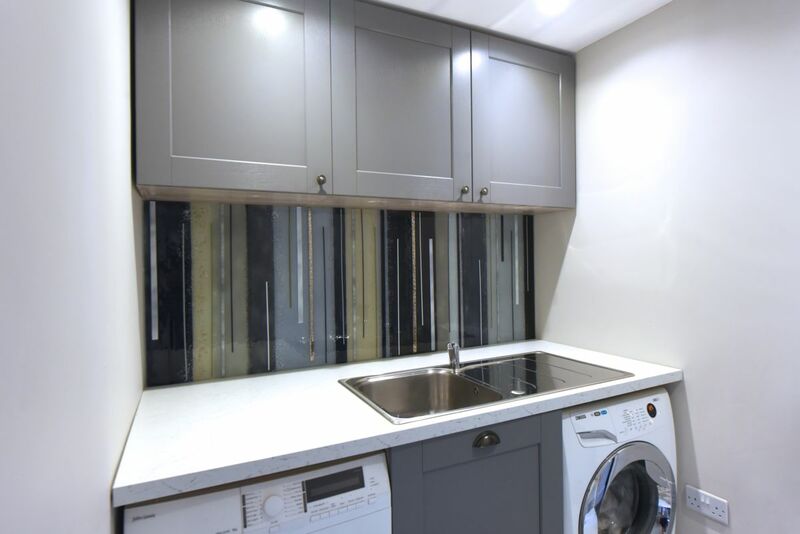 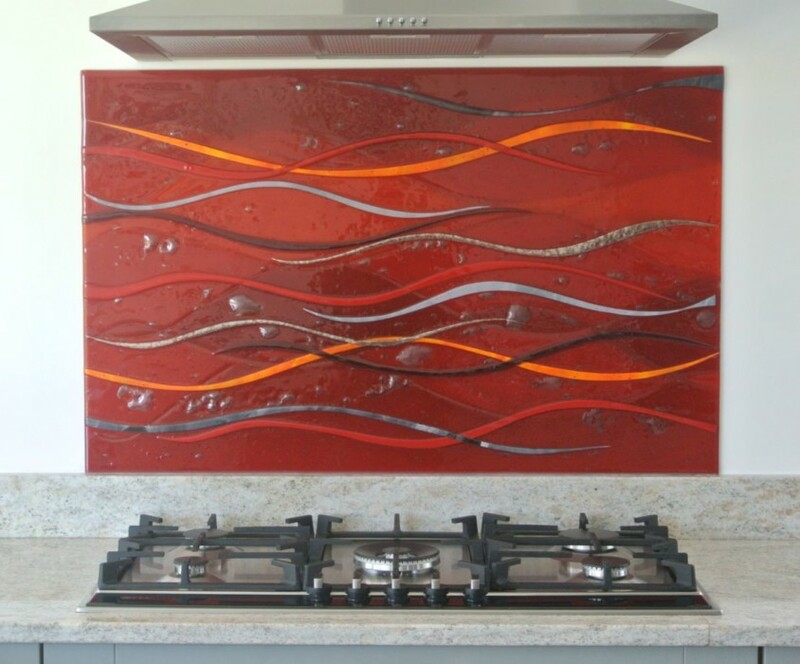 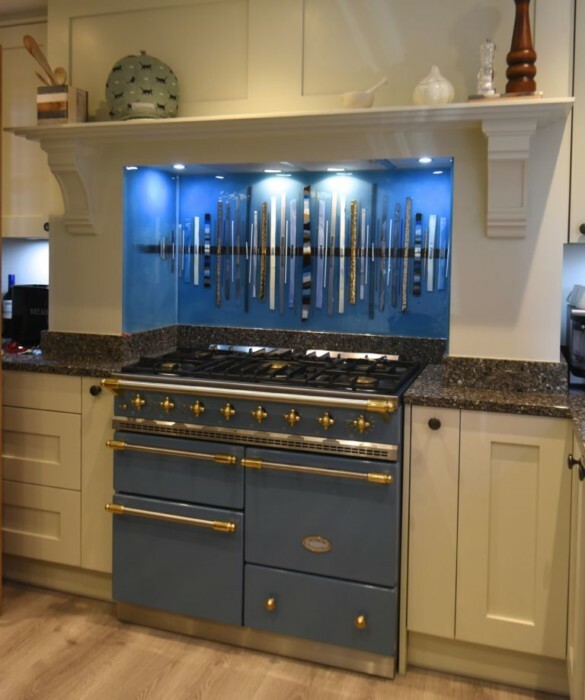 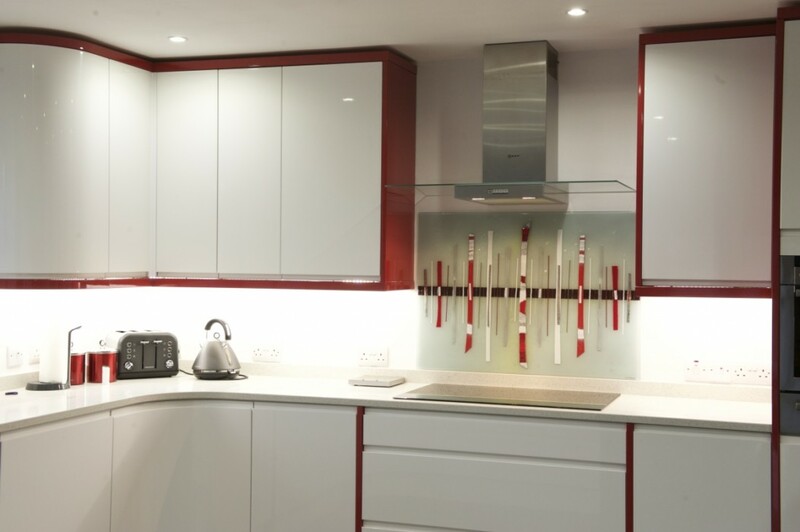 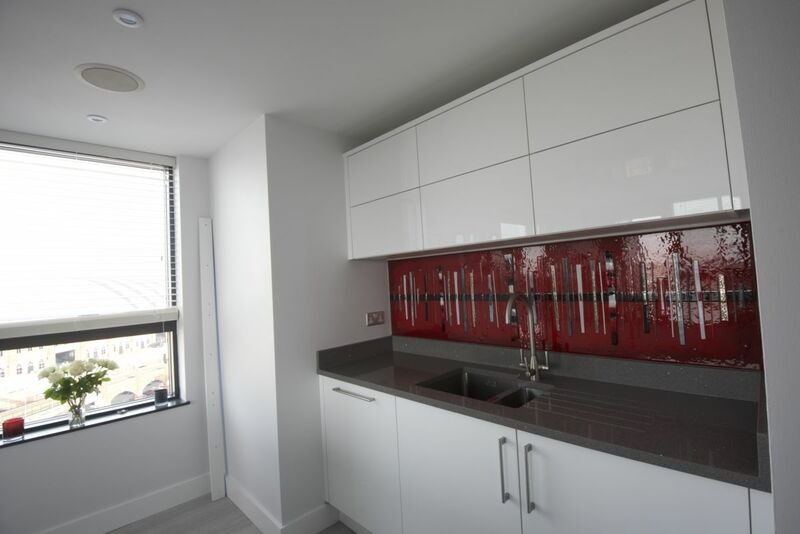 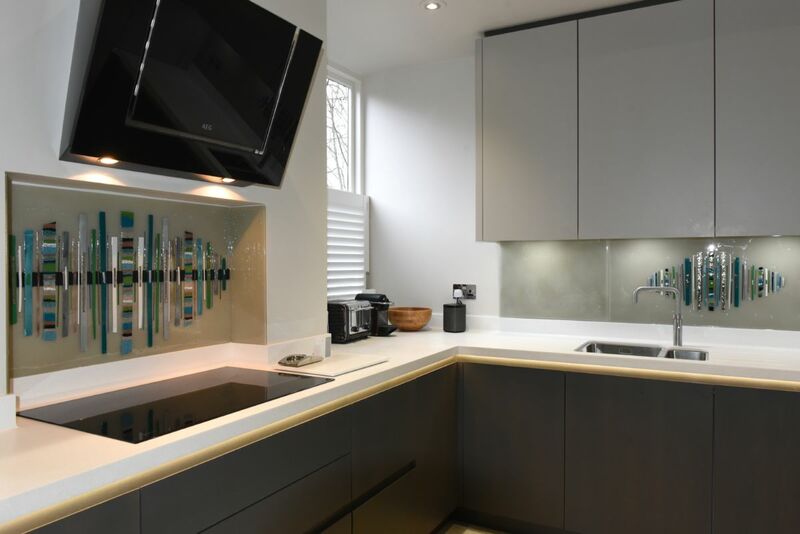 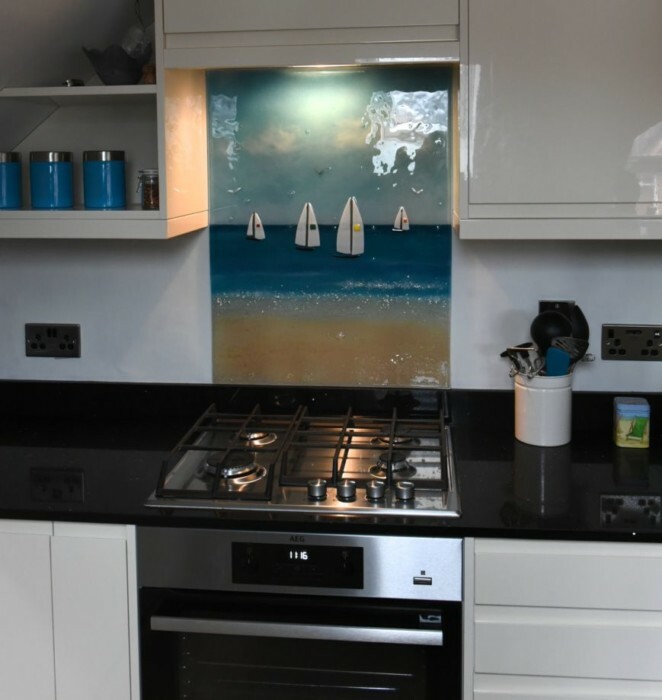 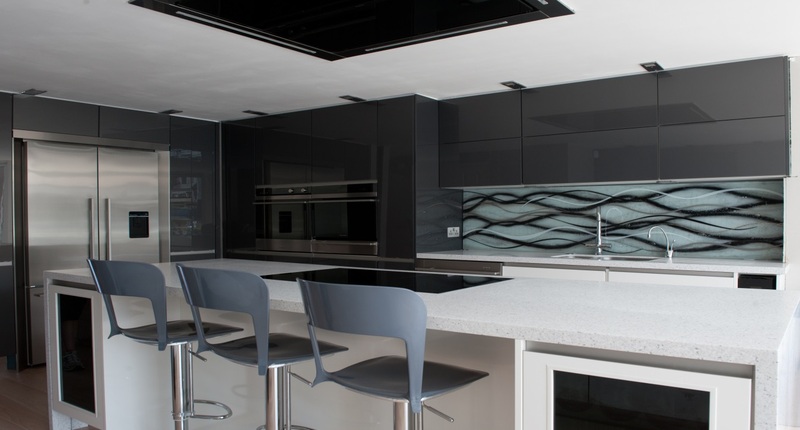 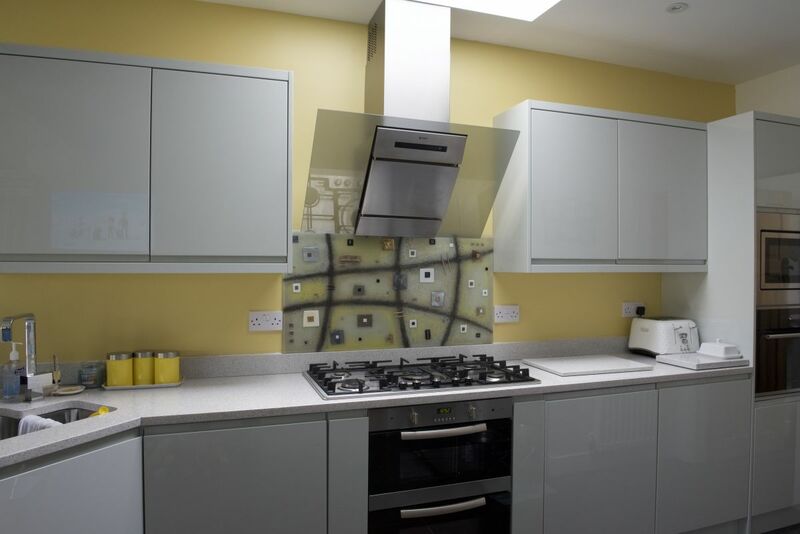 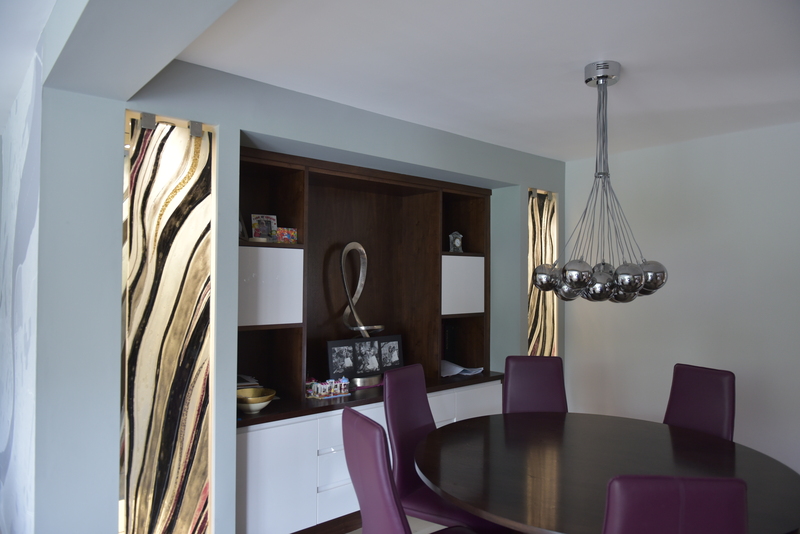 She wanted her splashback to perfectly match these colours, so the sample was a big help in making that a reality. 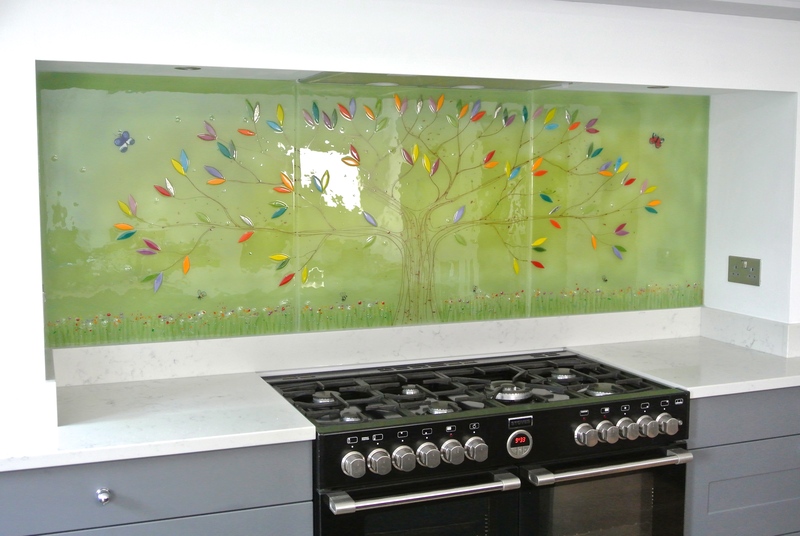 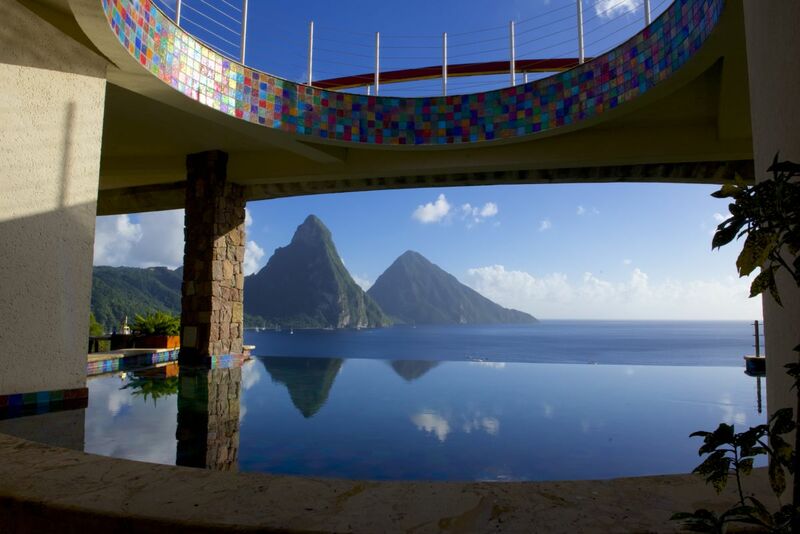 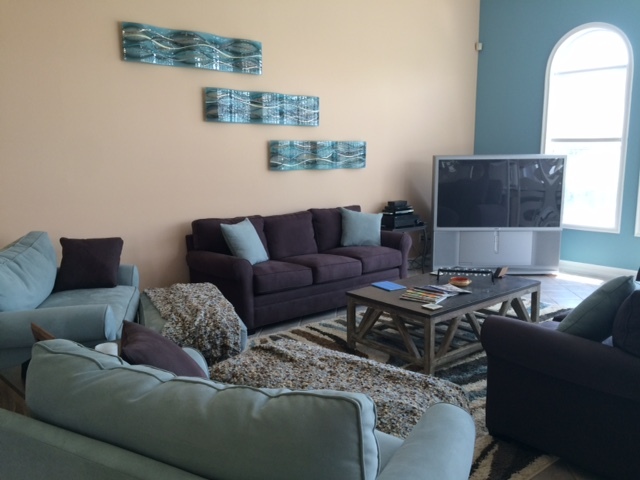 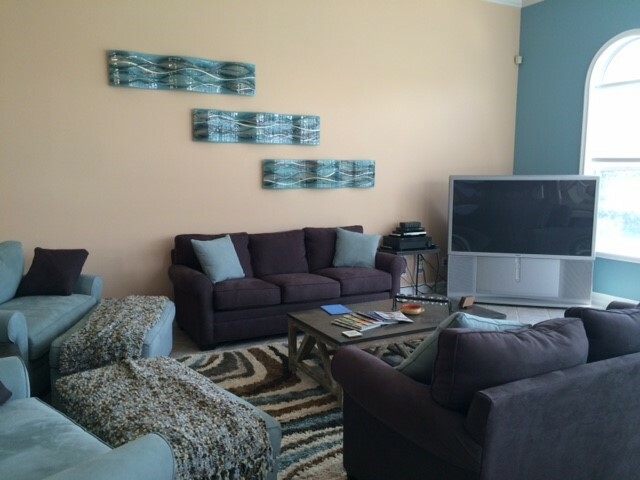 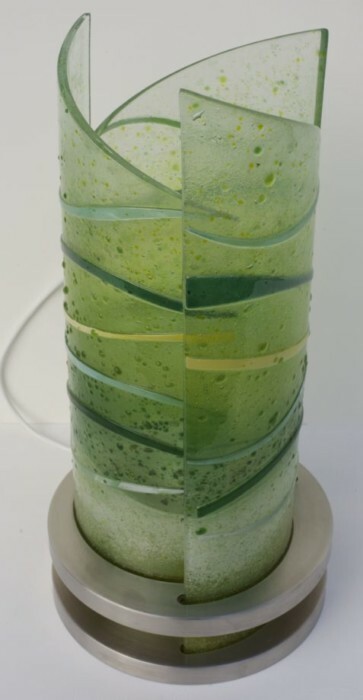 As you can see from the image above, the glass was created with a soft green background to match that theme. 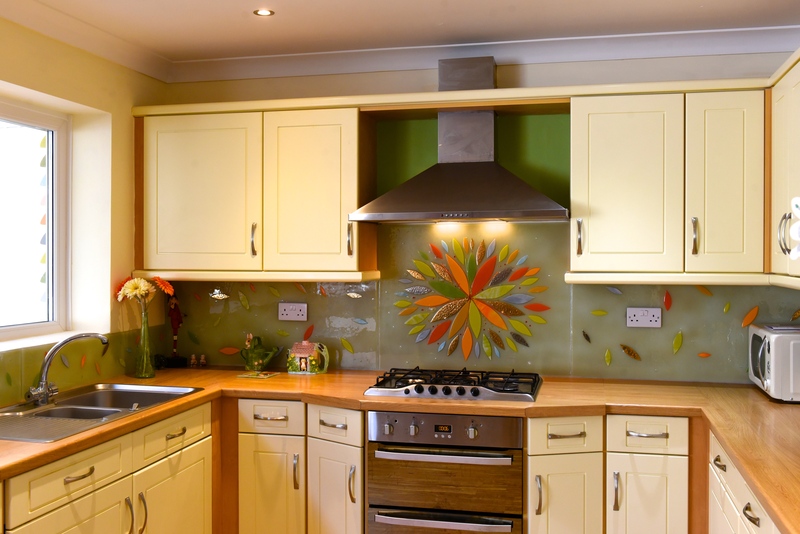 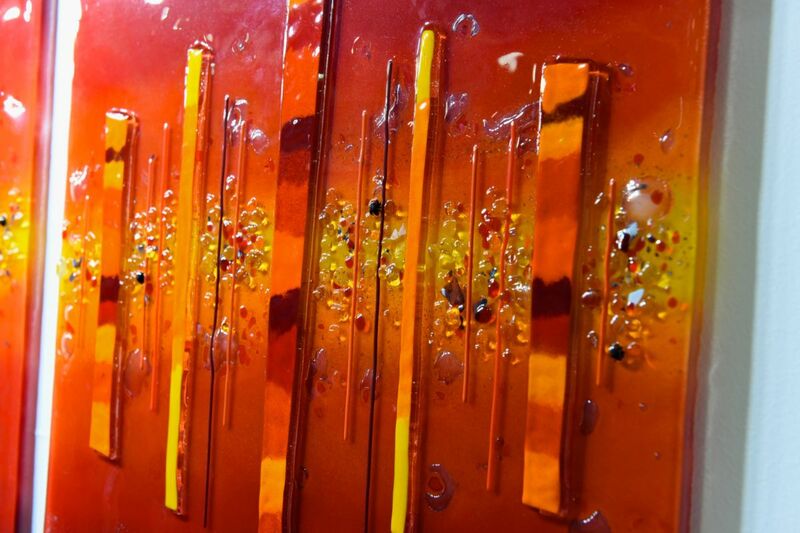 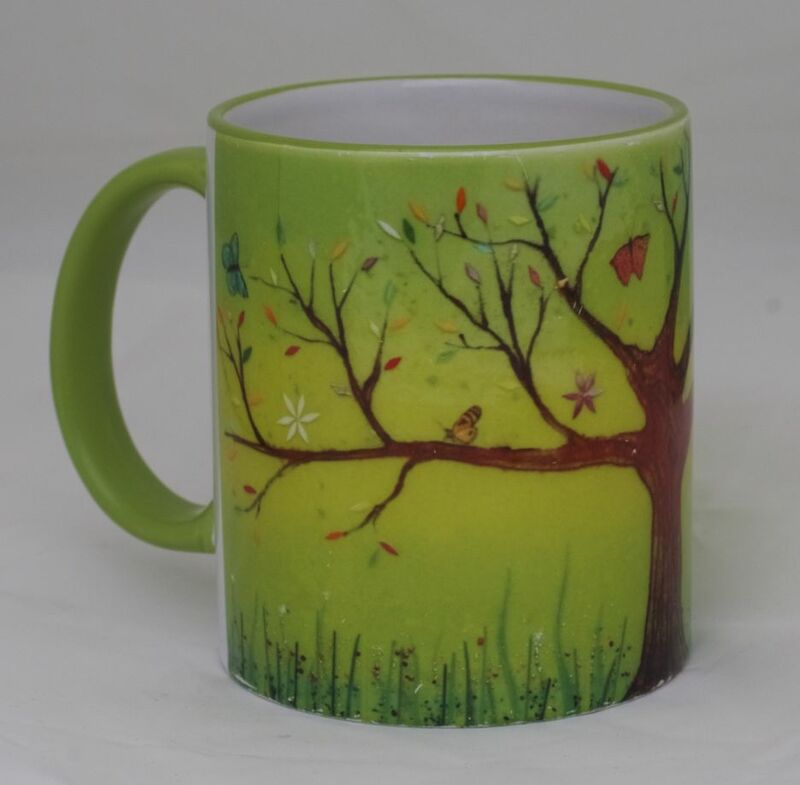 The orange found its way into the highlights and details of the splashback, in the form of leaves and butterflies. 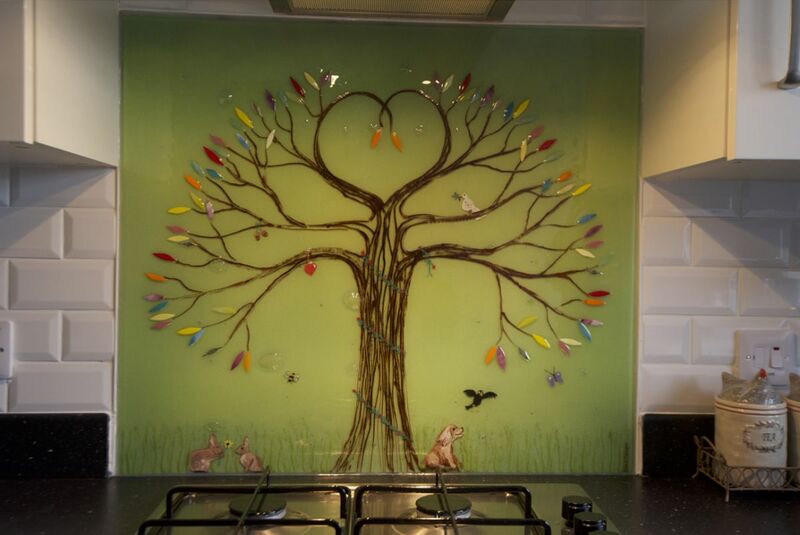 We think it’s a wonderful panel that turned out exactly as we imagined! 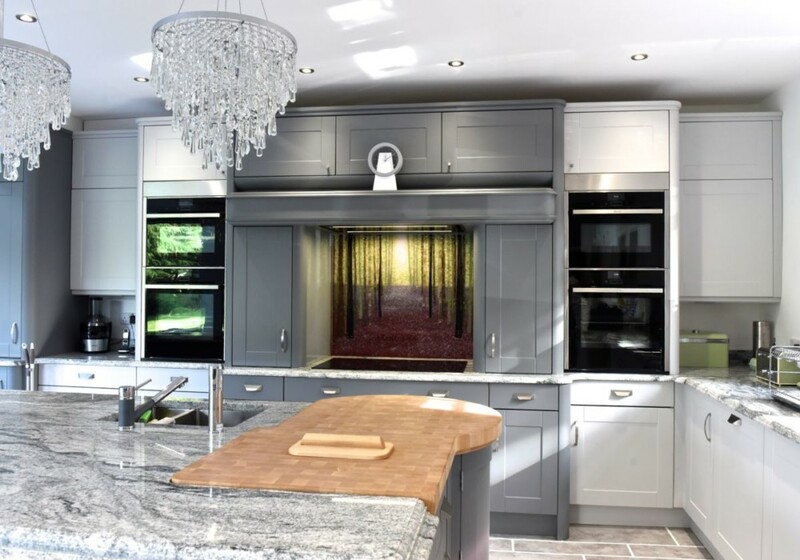 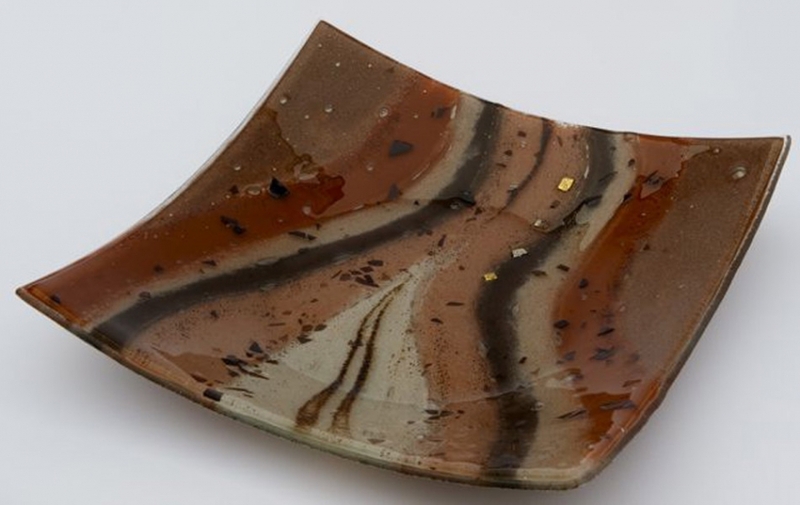 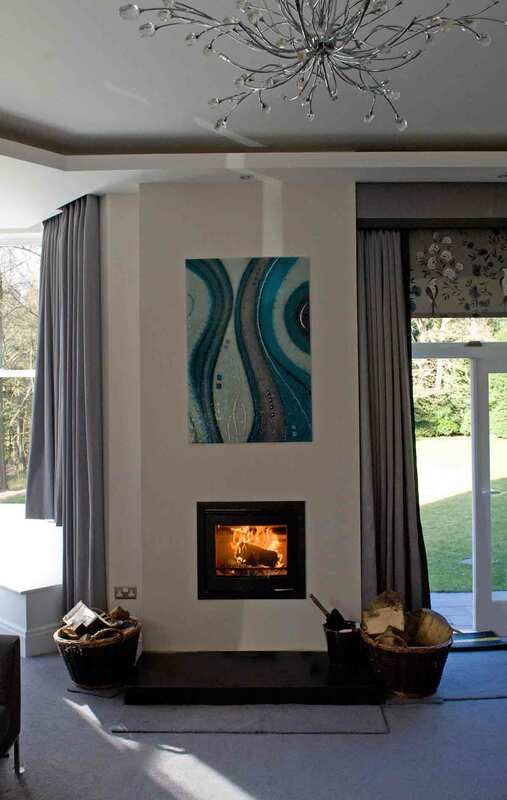 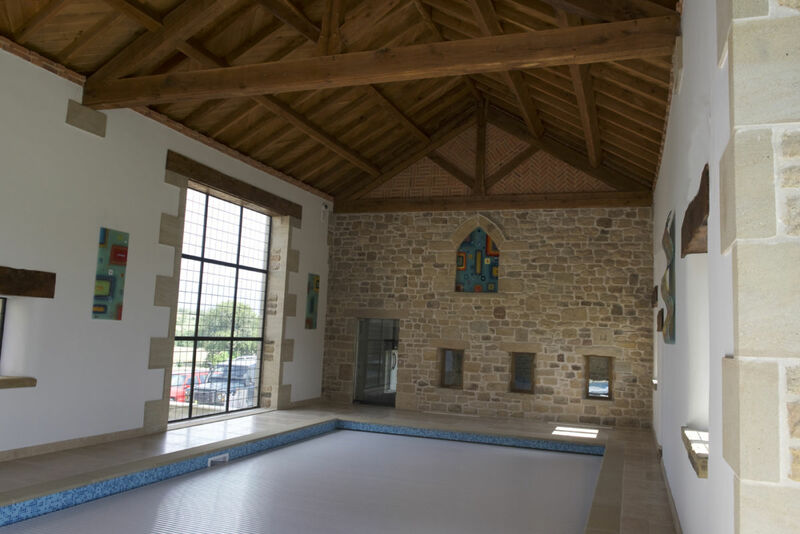 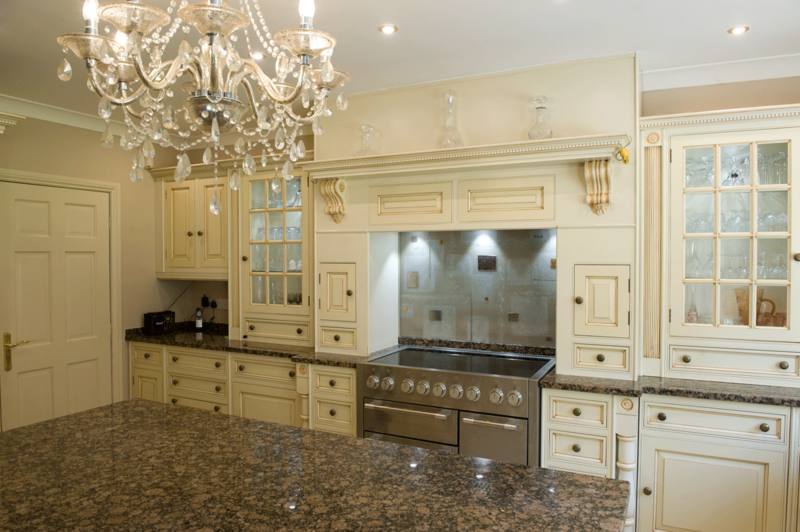 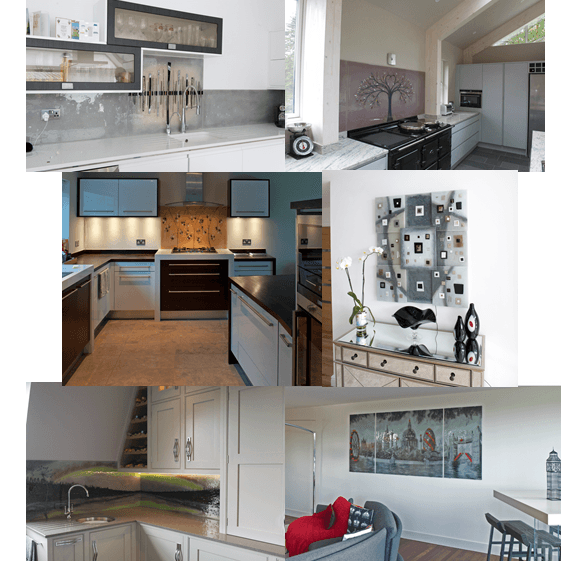 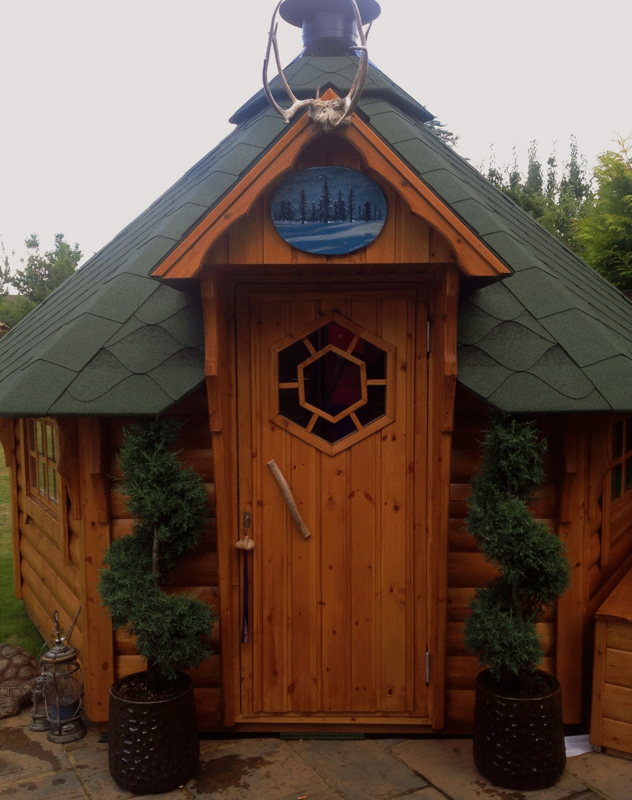 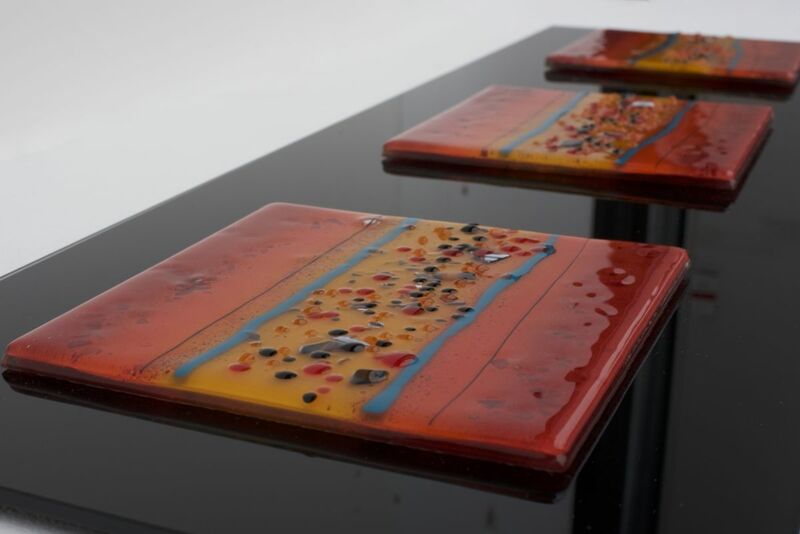 Every single piece that rolls out of our kiln is handmade and completely bespoke, so your imagination really is the limit. 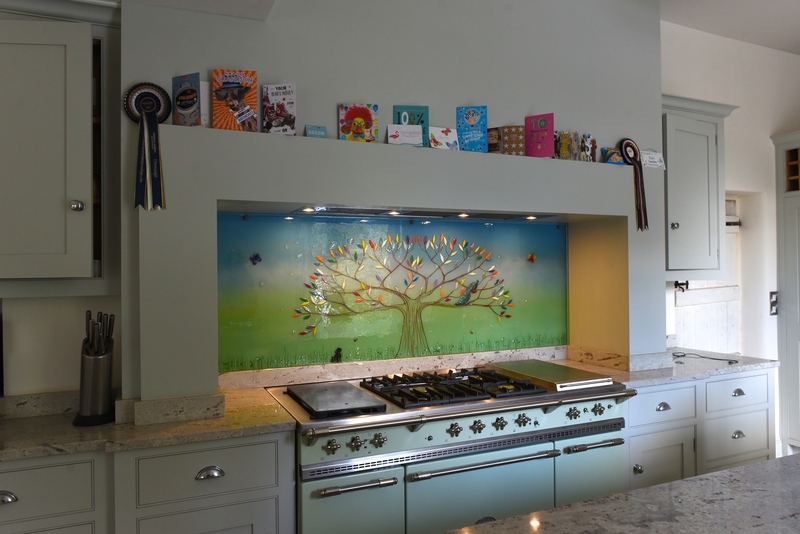 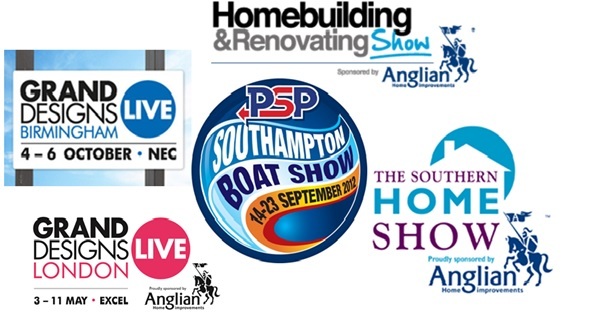 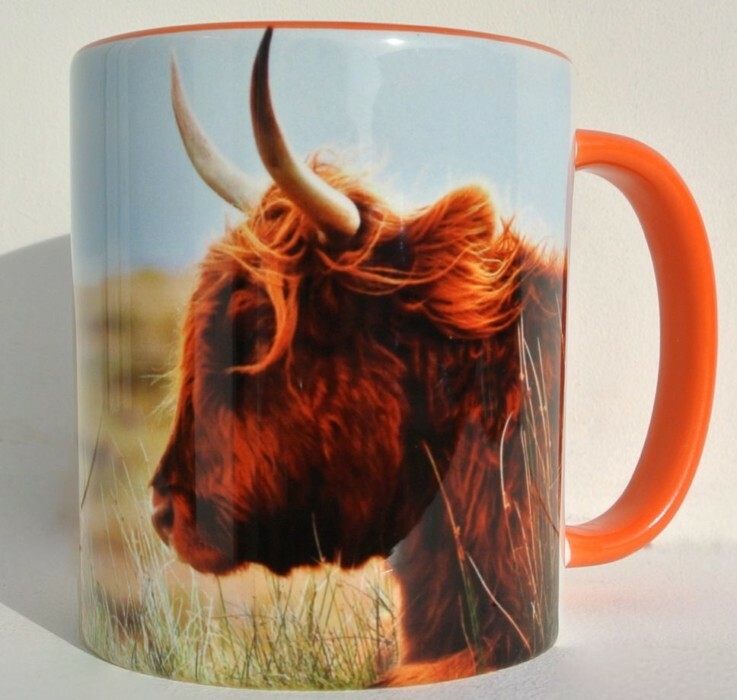 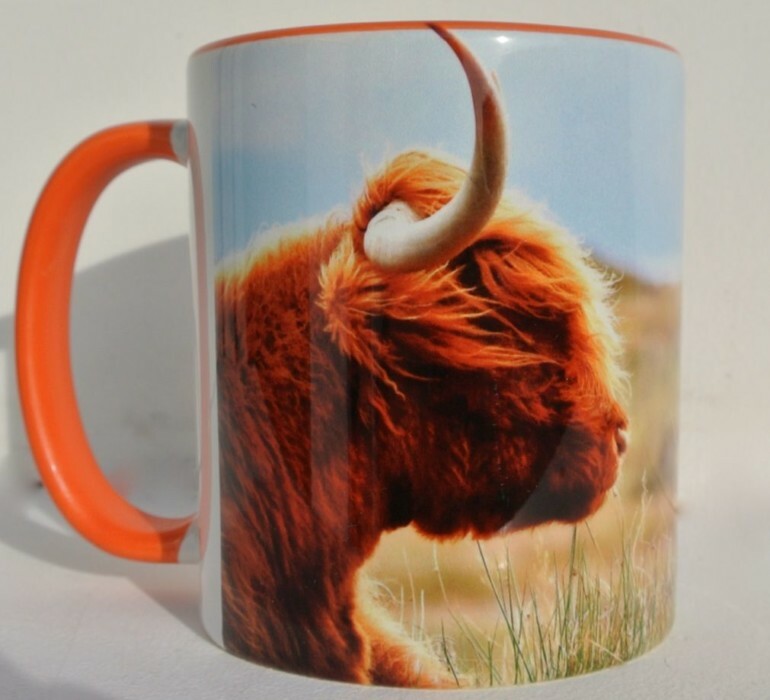 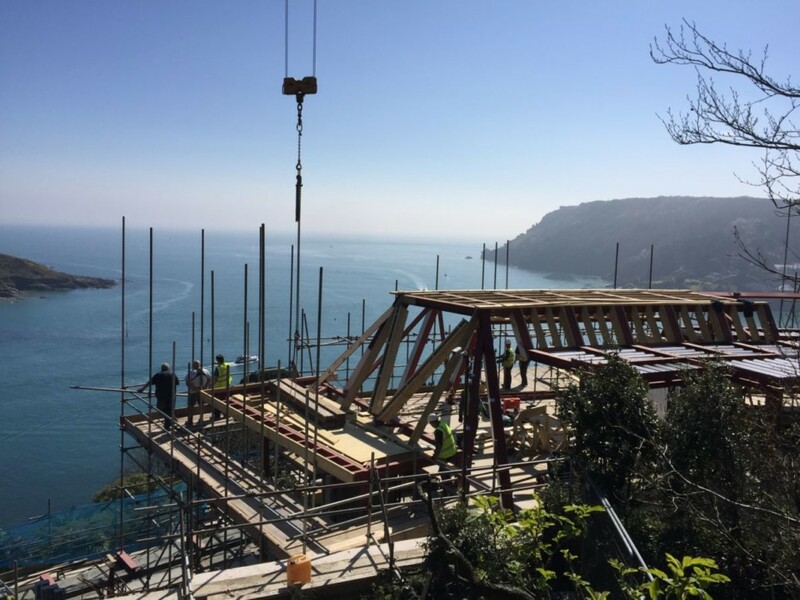 Whether you’d like a personalised design that incorporates elements with a certain meaning, a piece with a certain colour palette, or even something completely random as a surprise, we’ll make it for you. 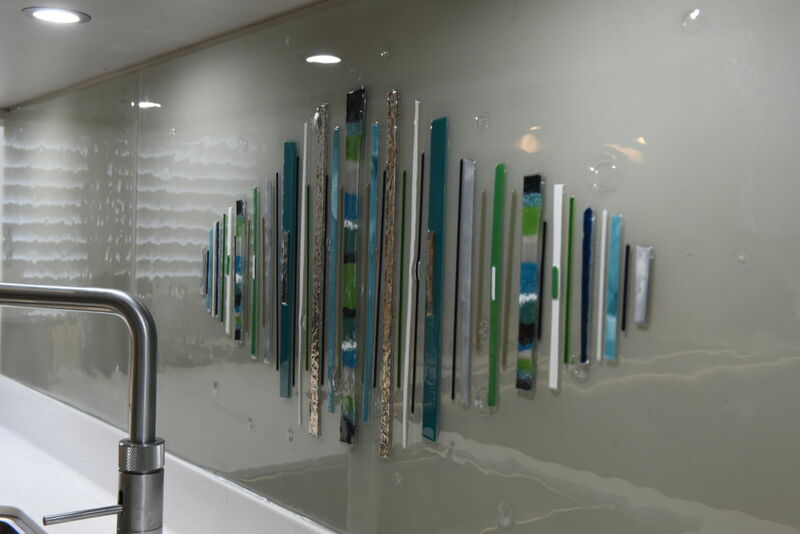 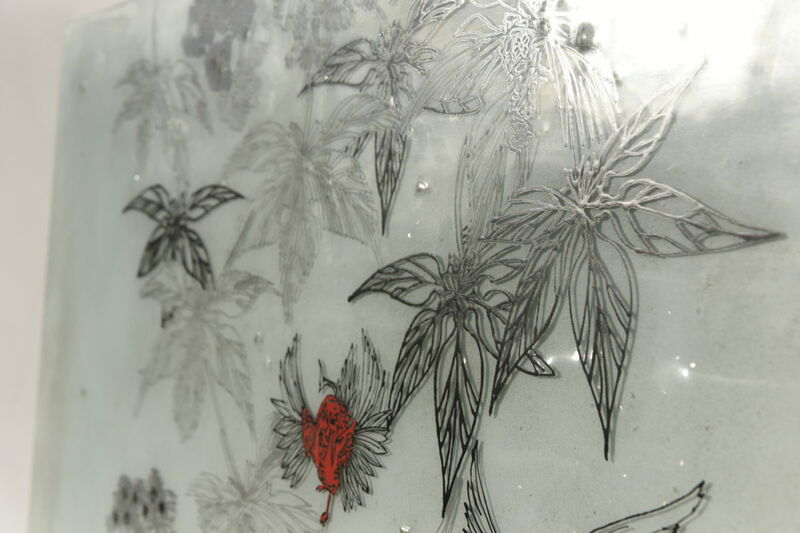 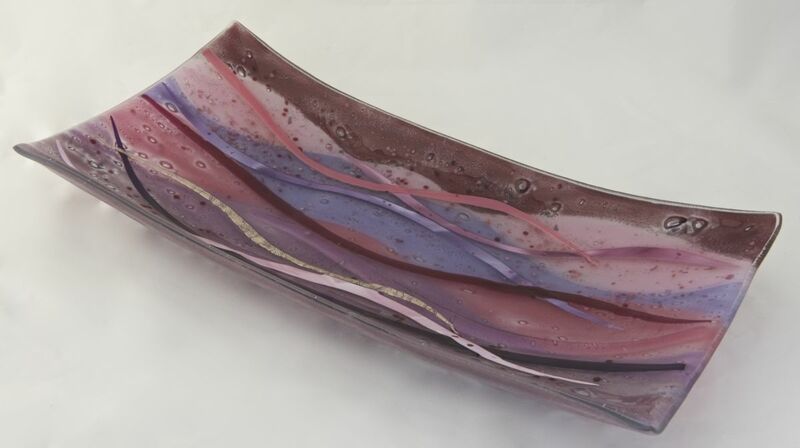 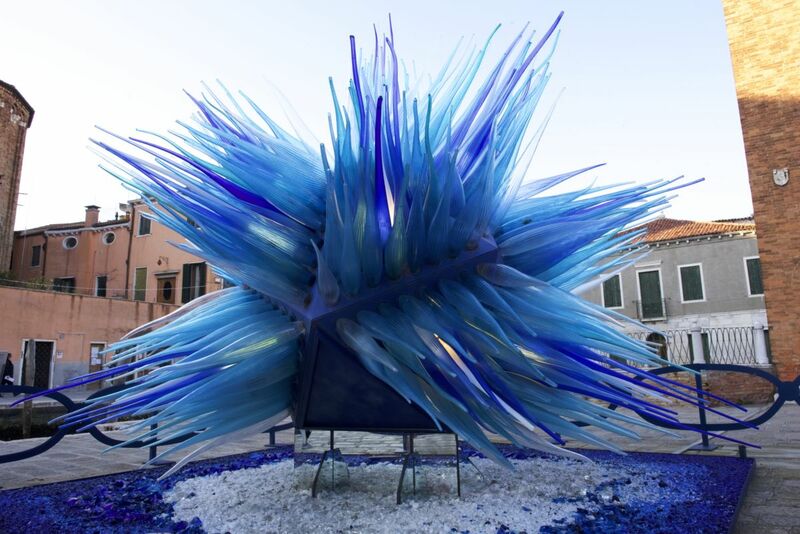 We jump at the chance to create incredible pieces just like this one, though we’ll easily get just as excited creating something completely different out of glass as well. 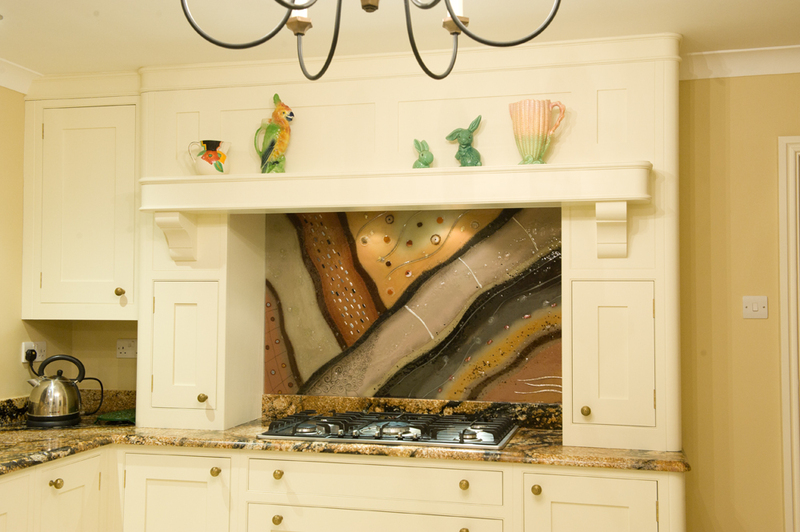 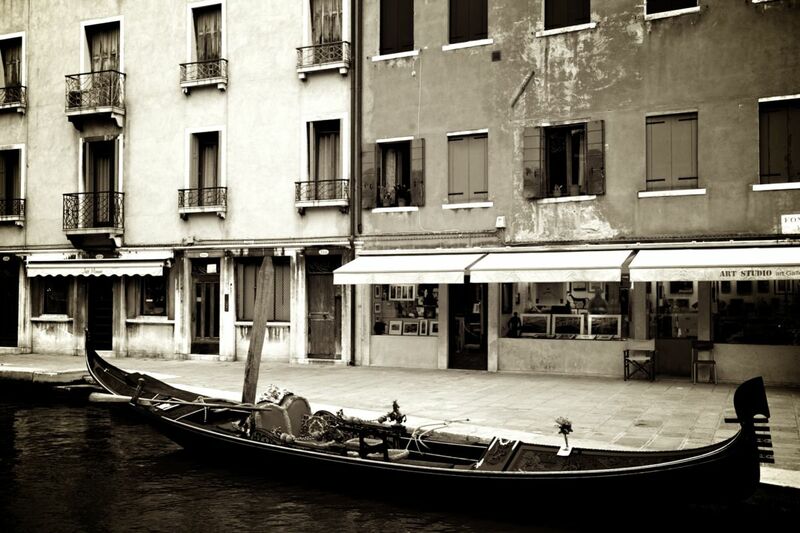 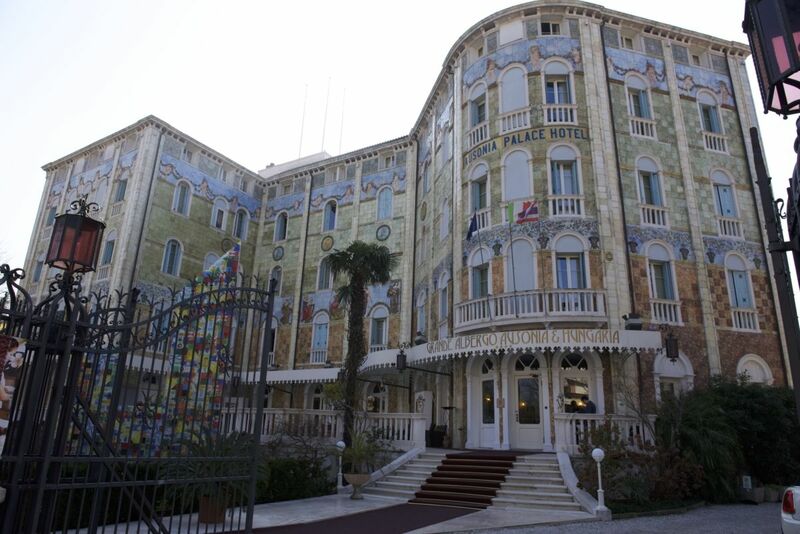 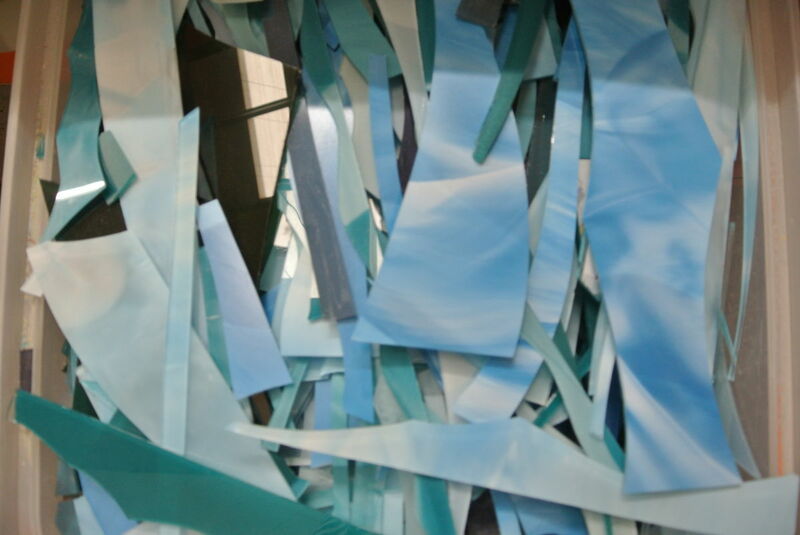 No matter what your idea might be, we’ll put everything into making it just what you wanted. 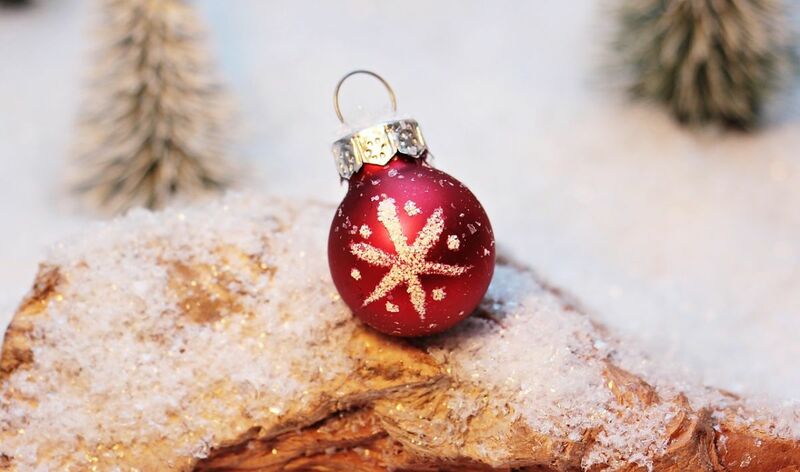 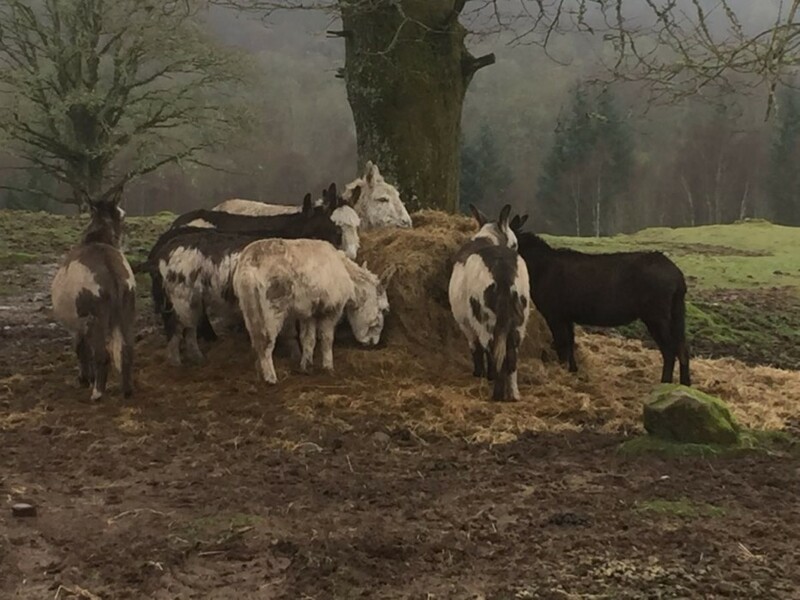 The only thing we ever need is to hear what you’re looking for! 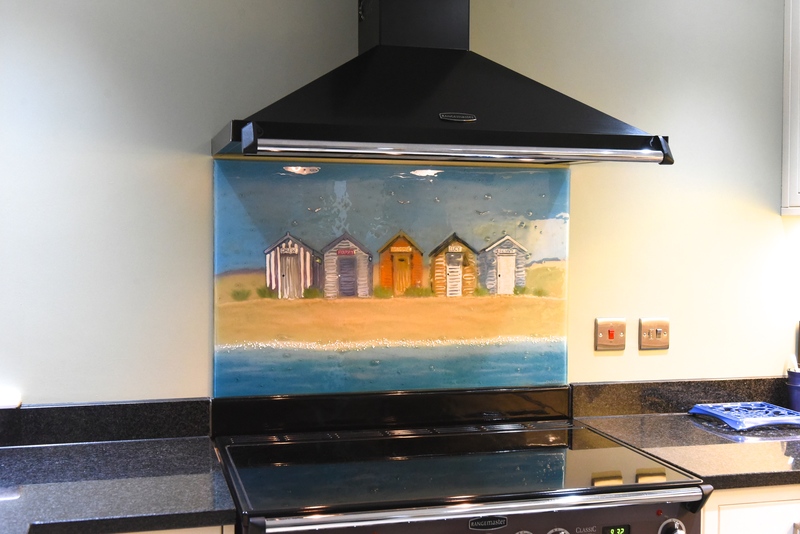 Here at The House of Ugly Fish, creating gorgeous fused glass art is a passion of ours that isn’t going to go away any time soon. 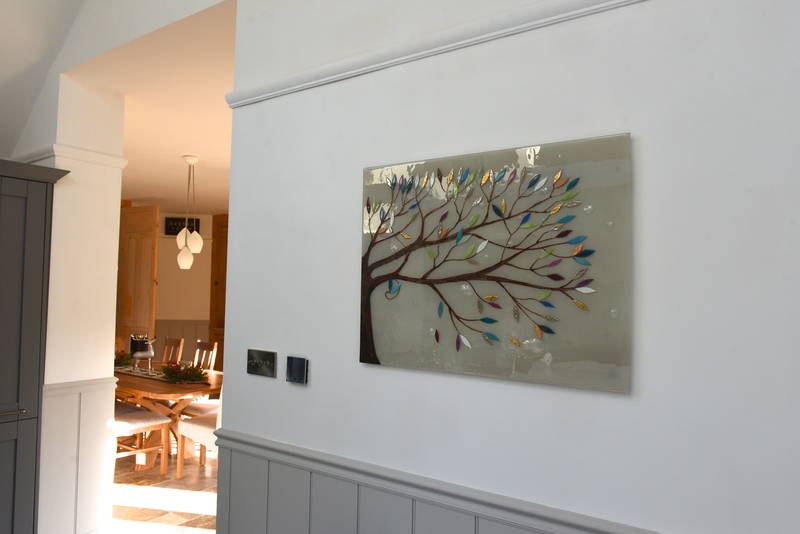 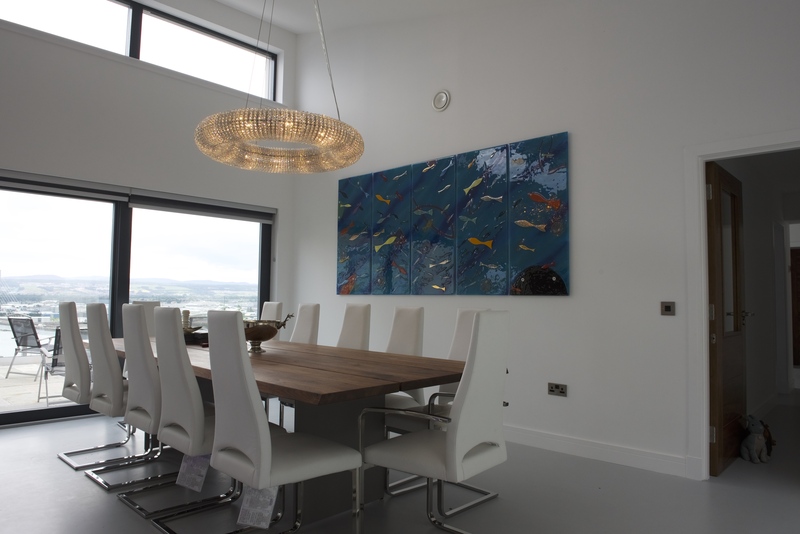 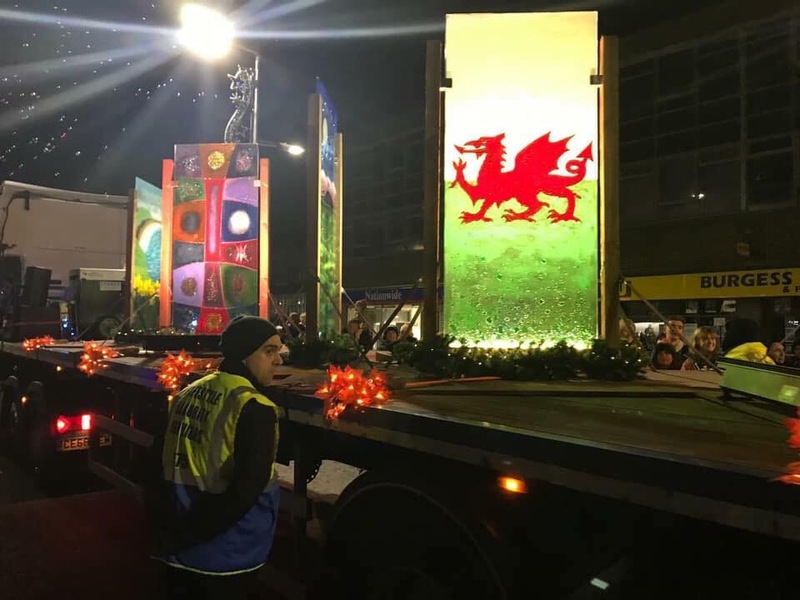 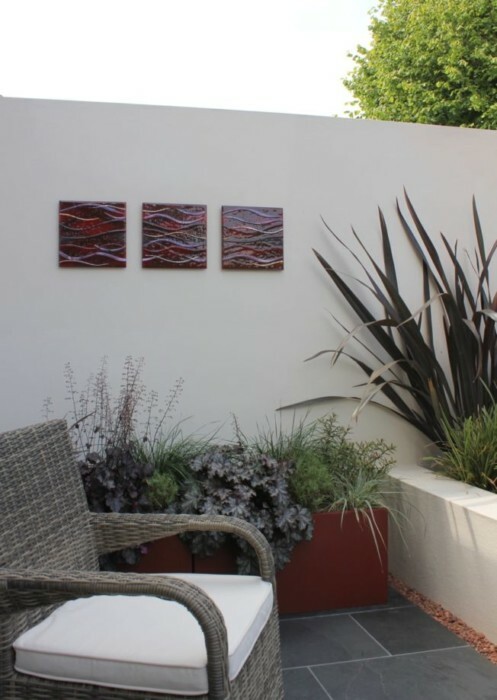 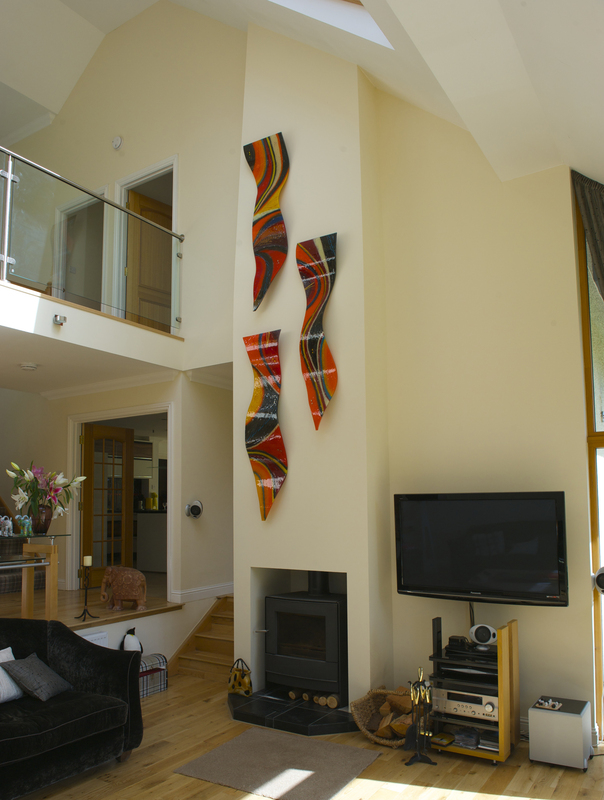 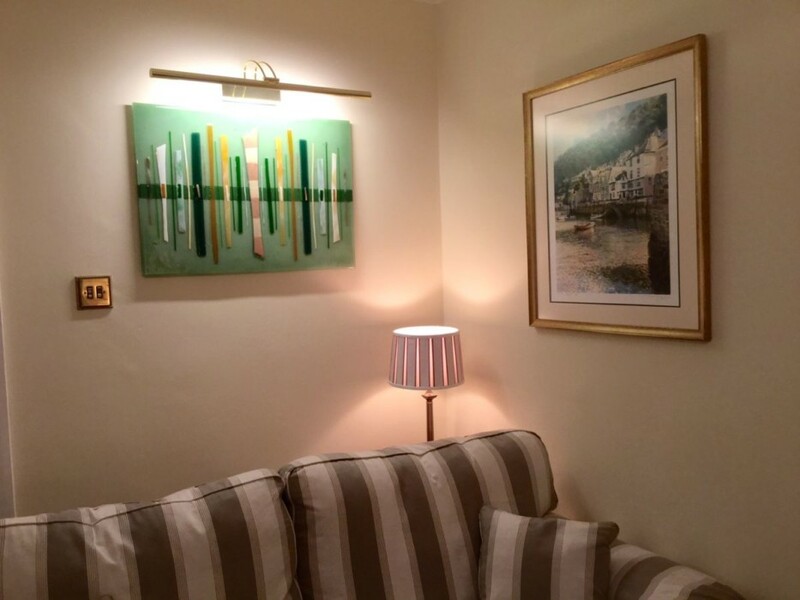 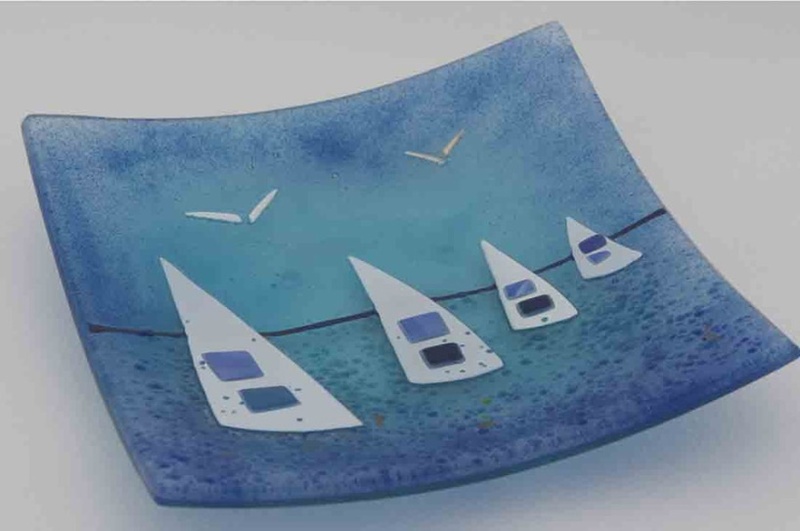 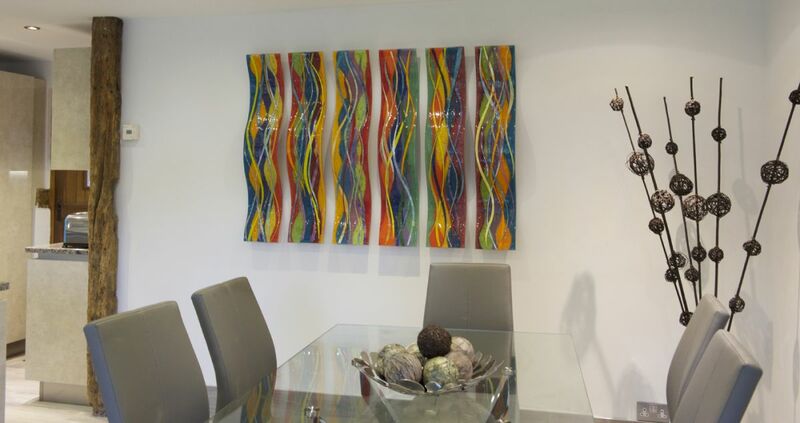 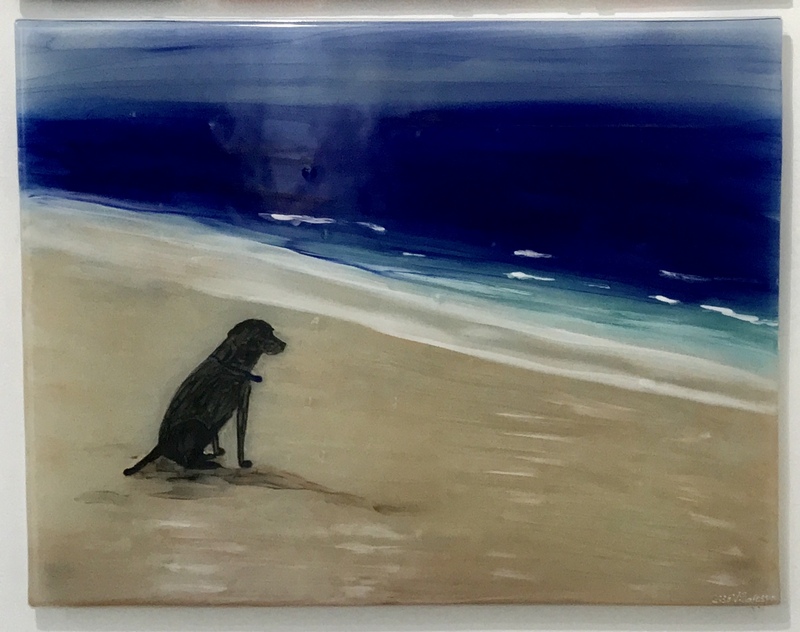 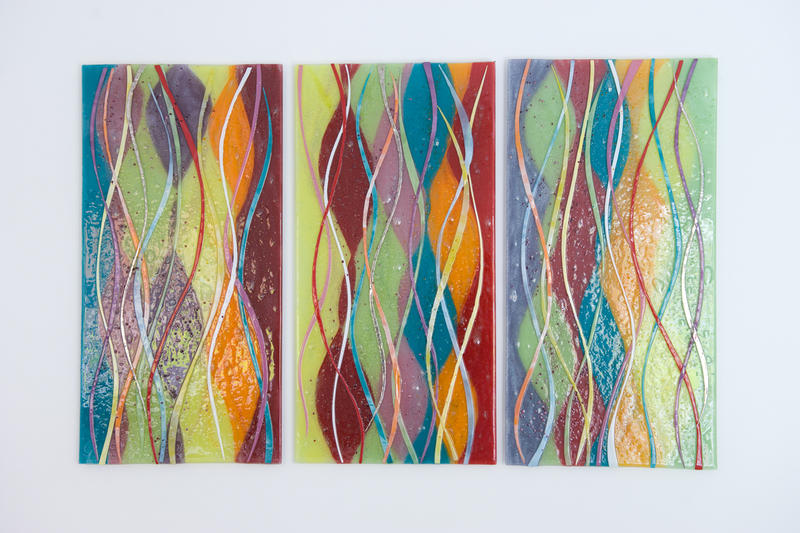 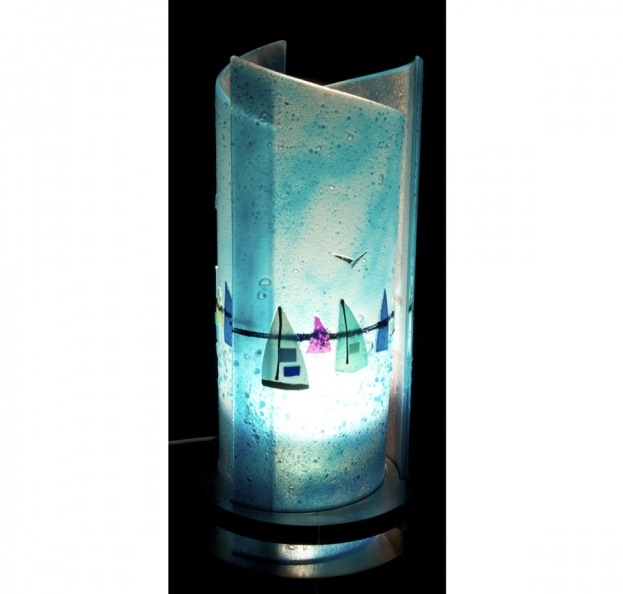 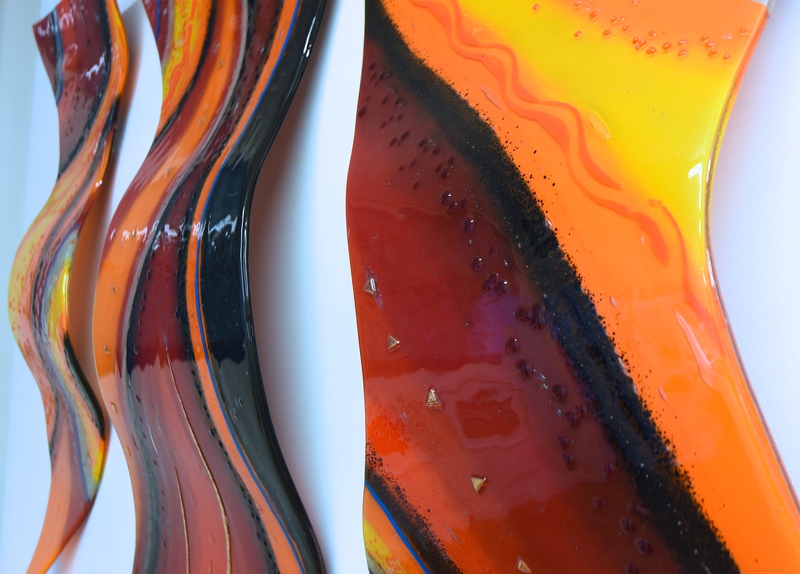 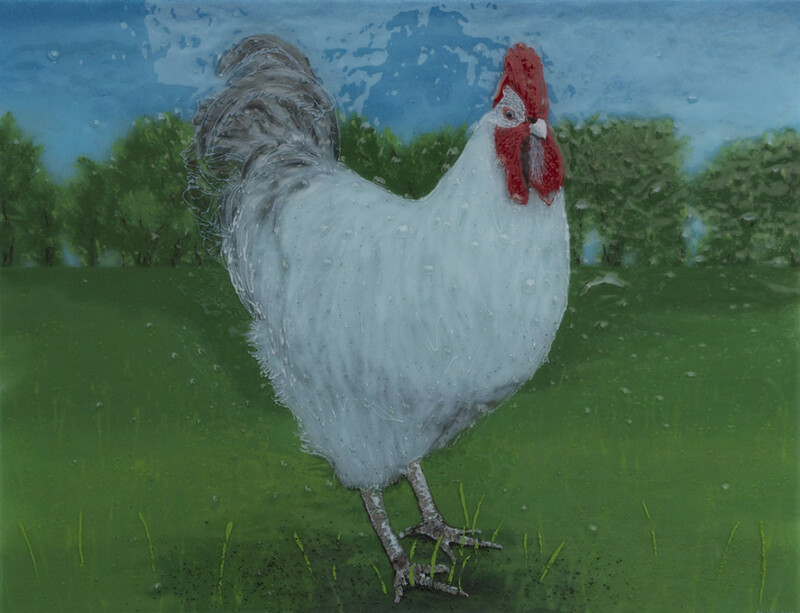 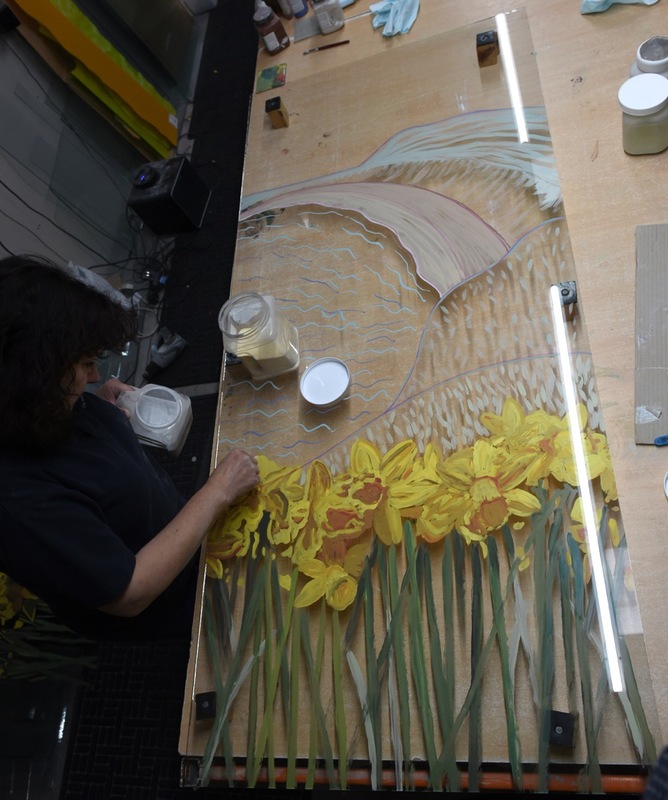 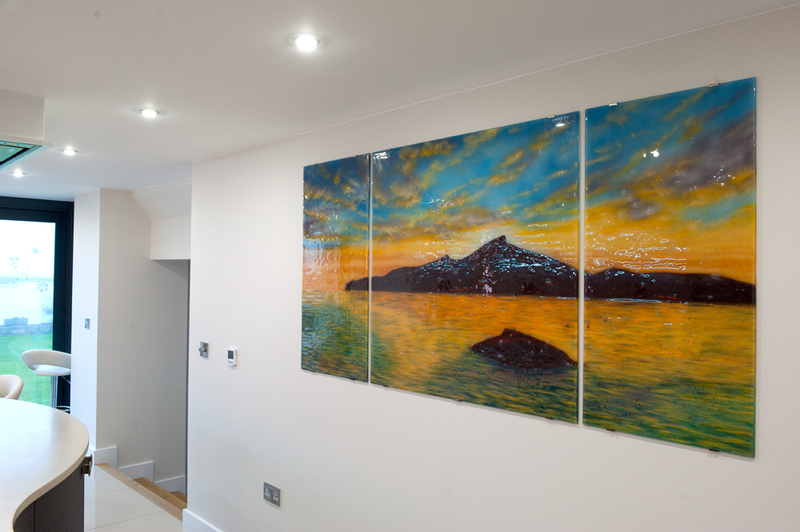 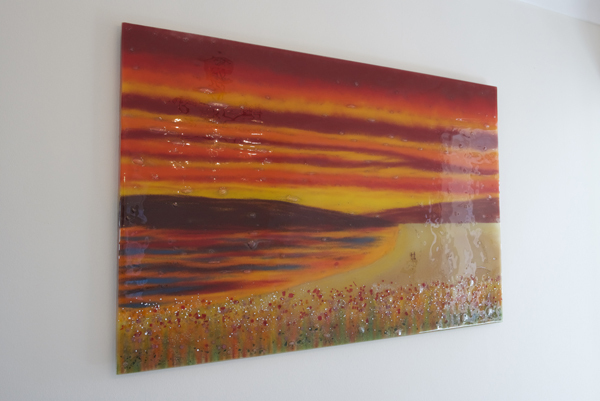 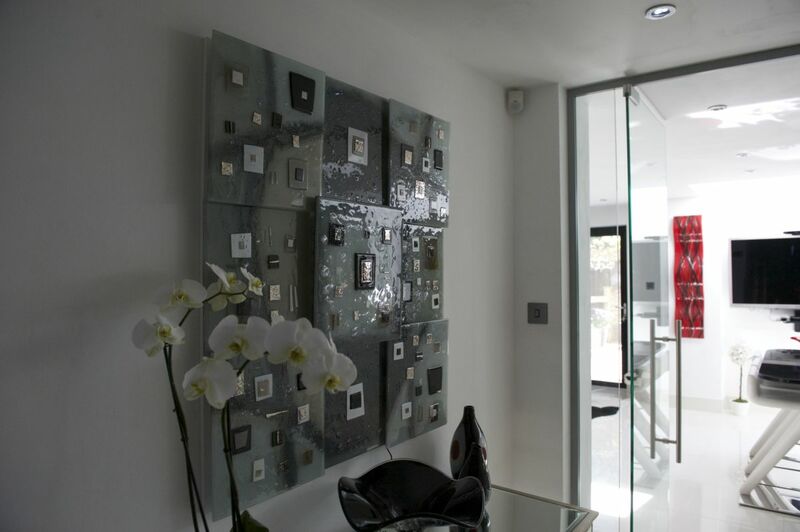 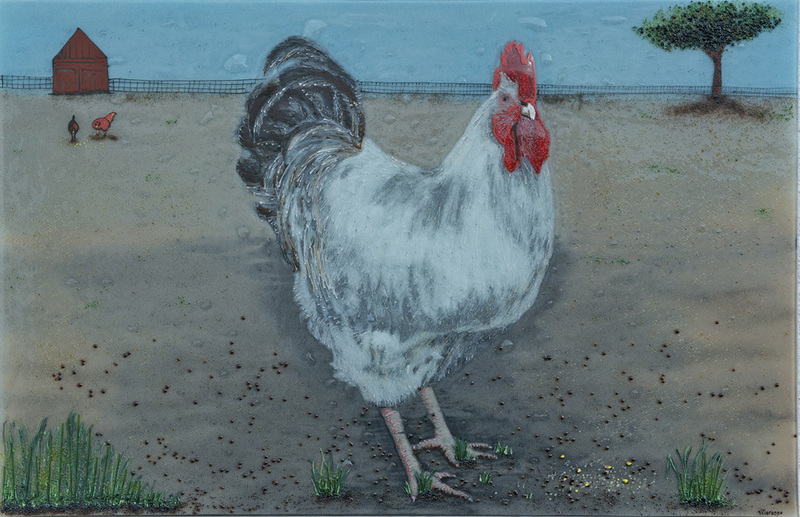 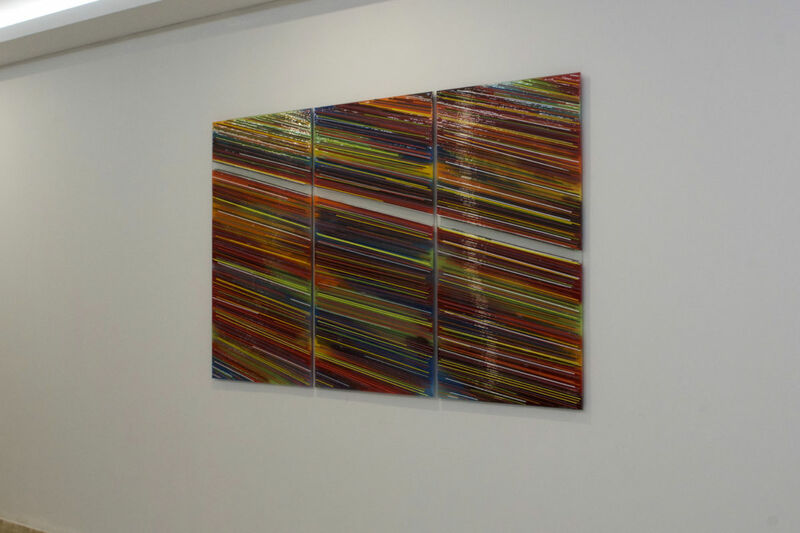 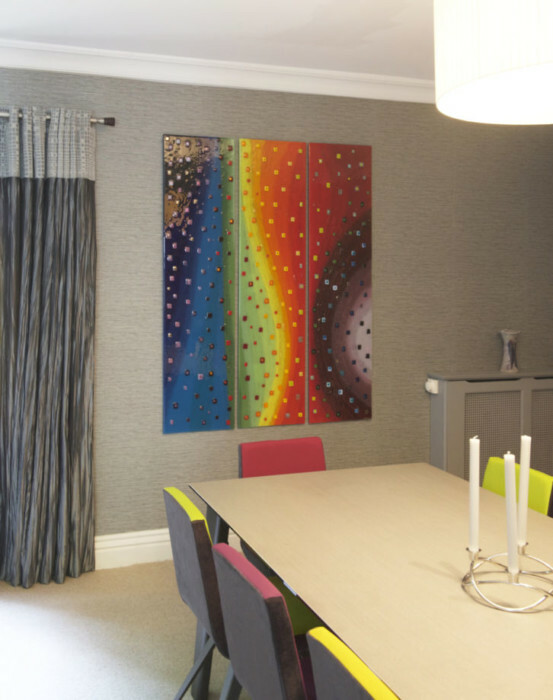 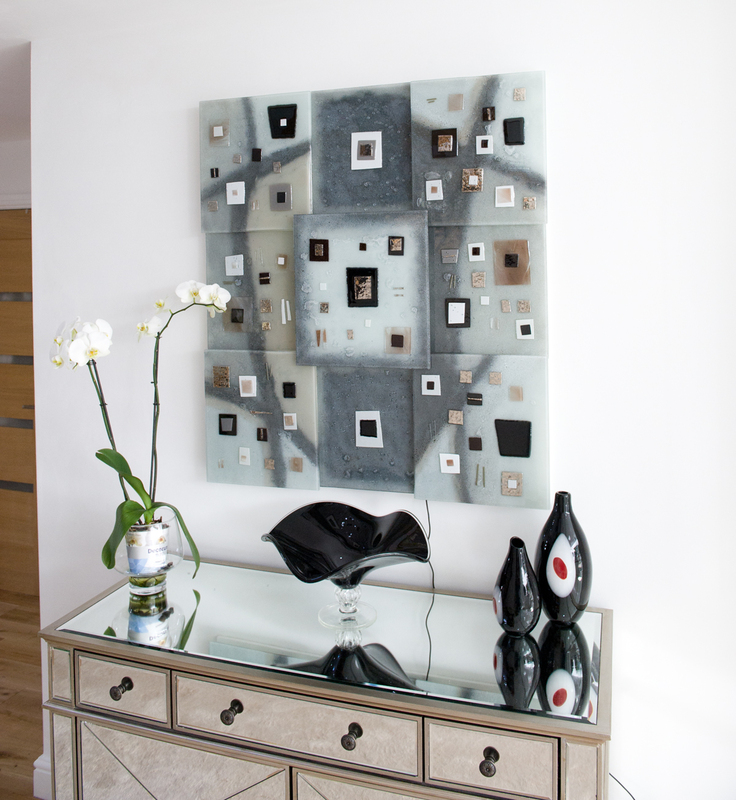 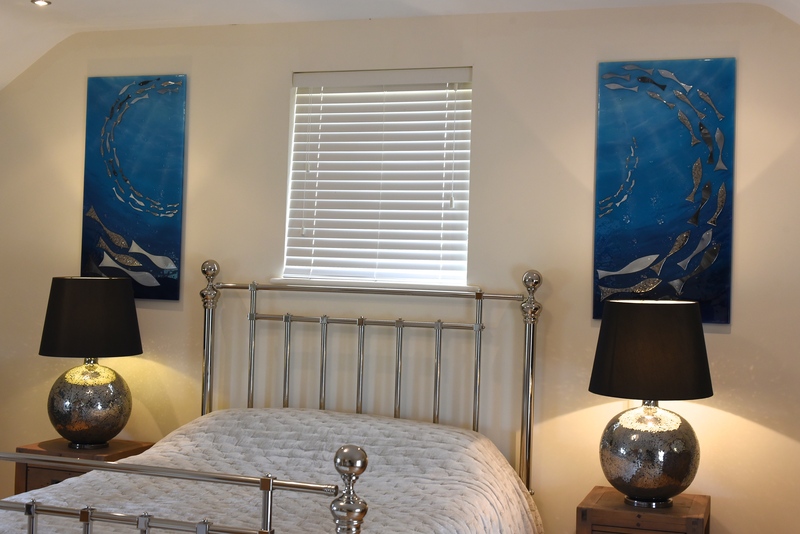 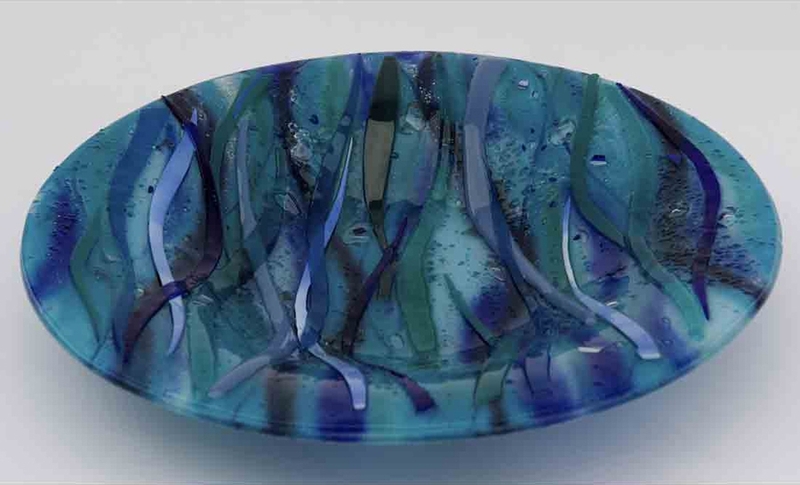 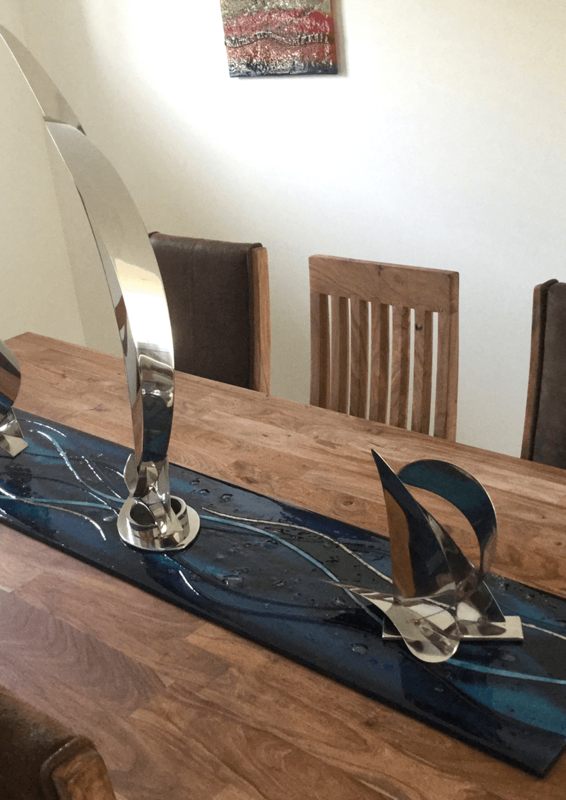 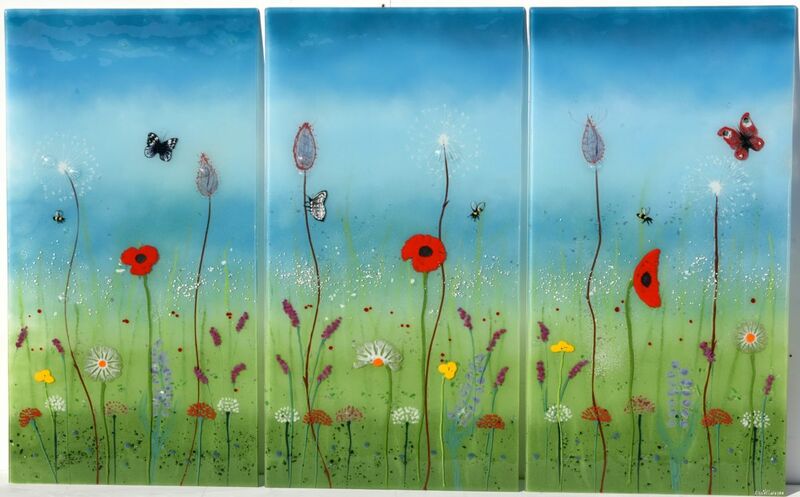 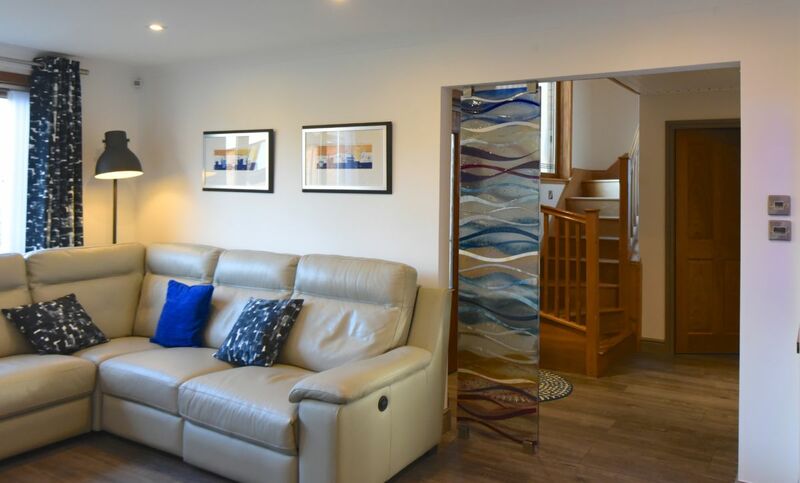 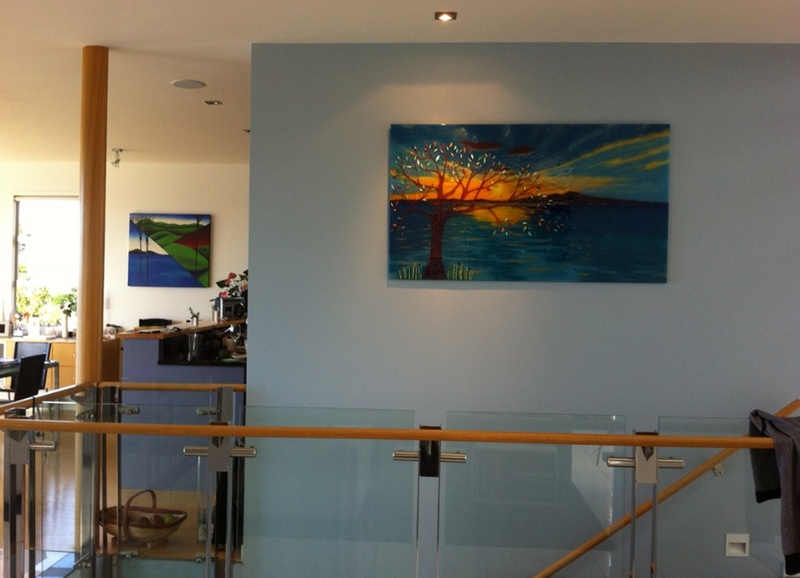 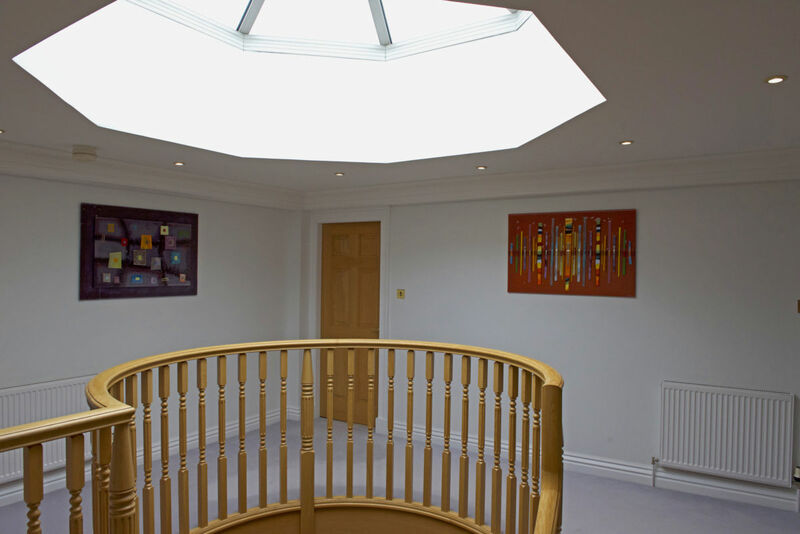 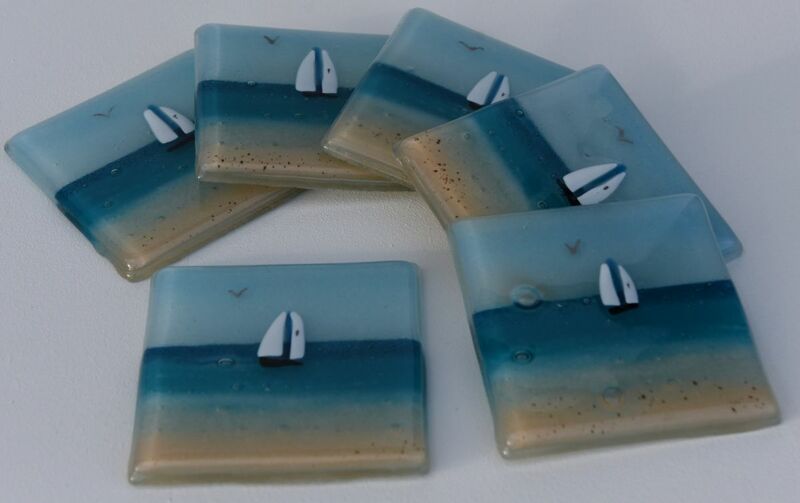 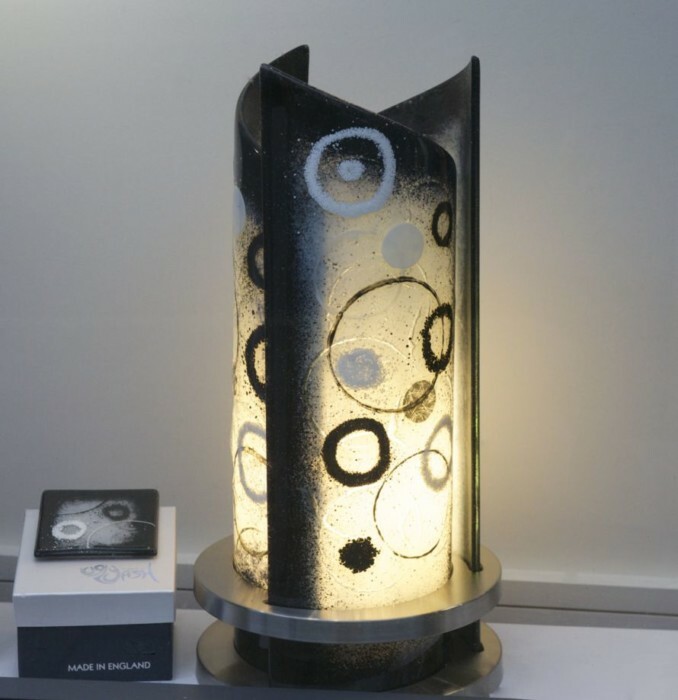 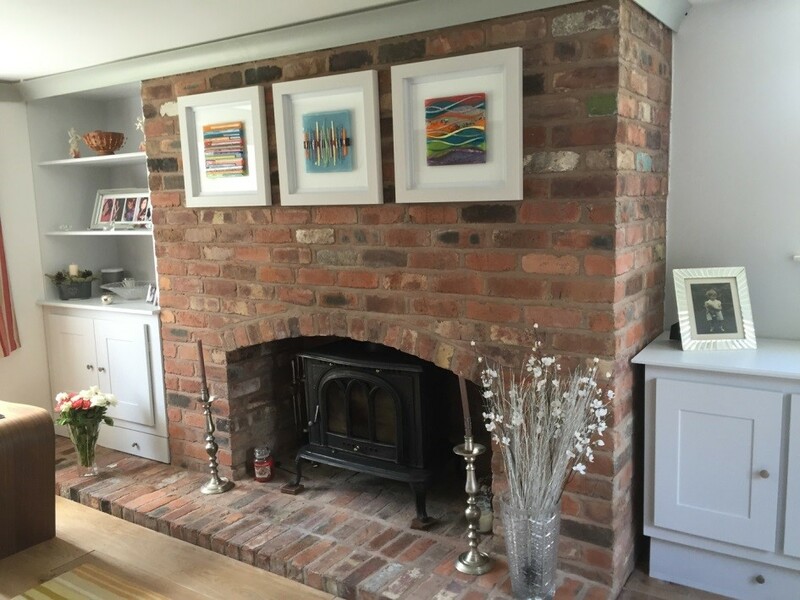 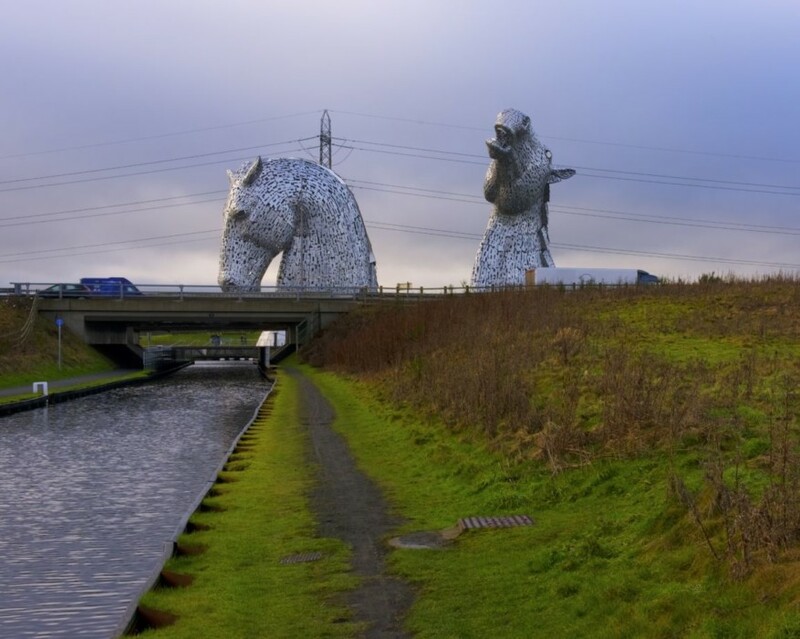 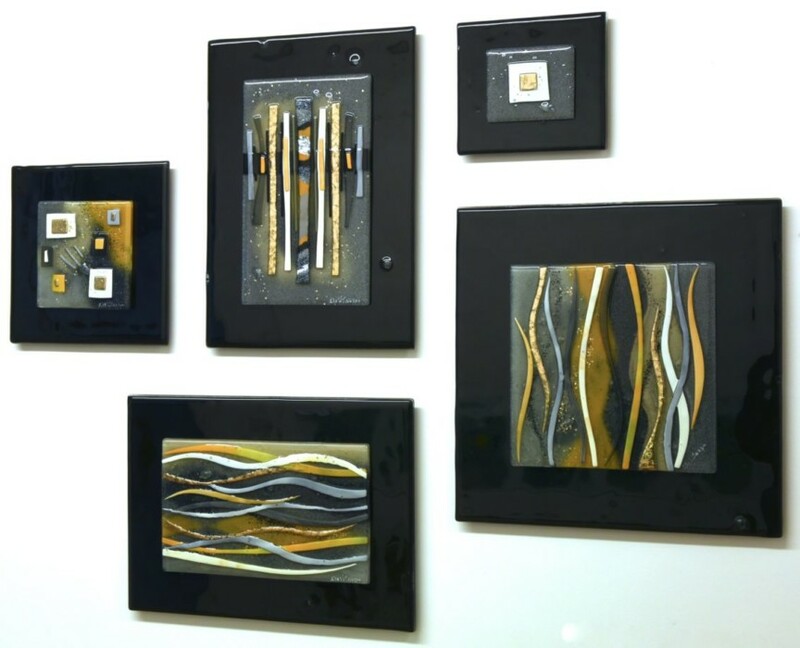 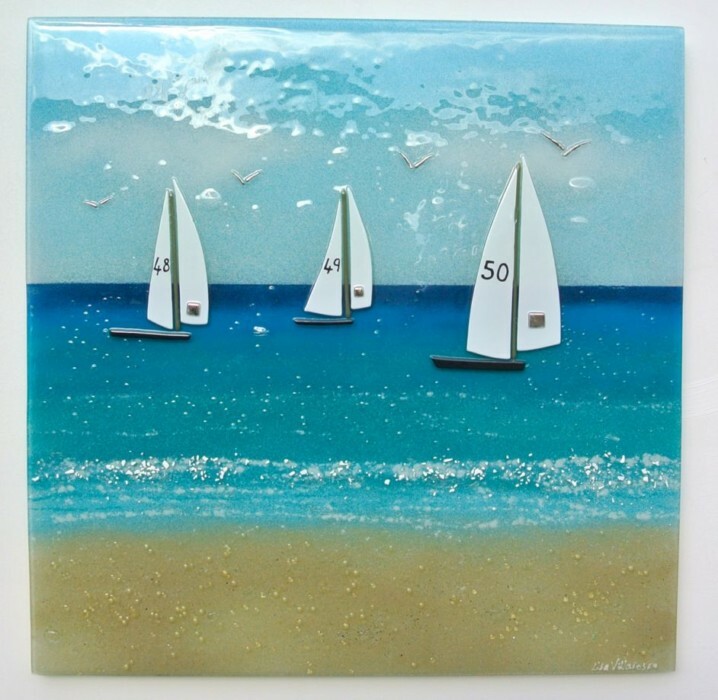 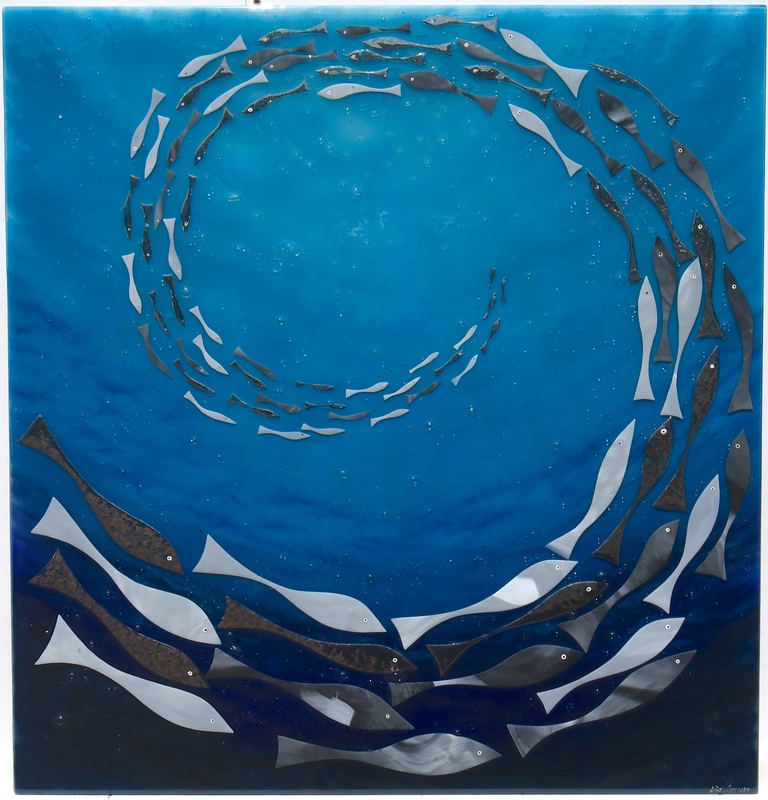 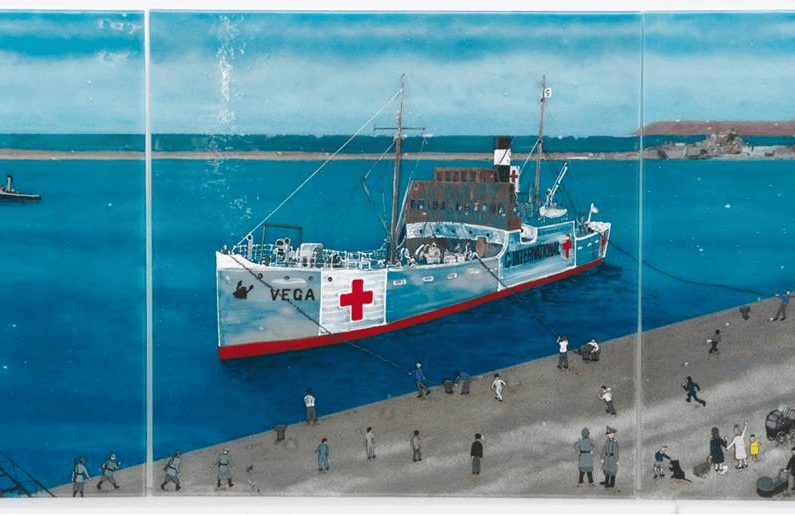 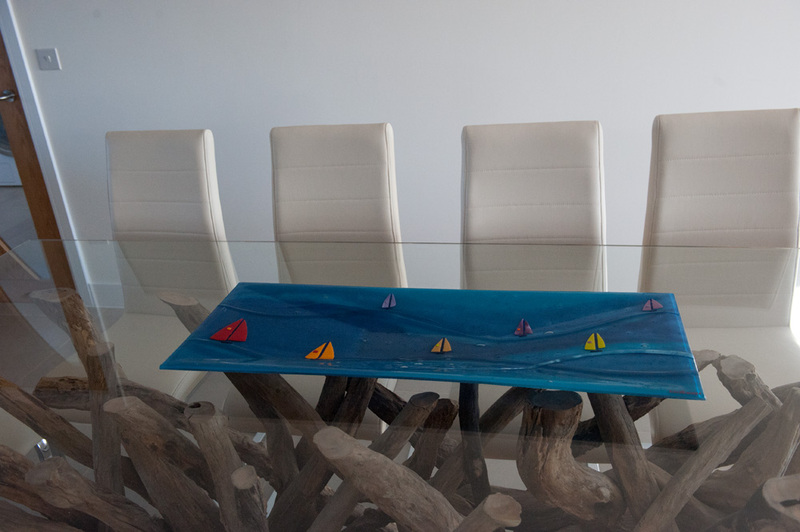 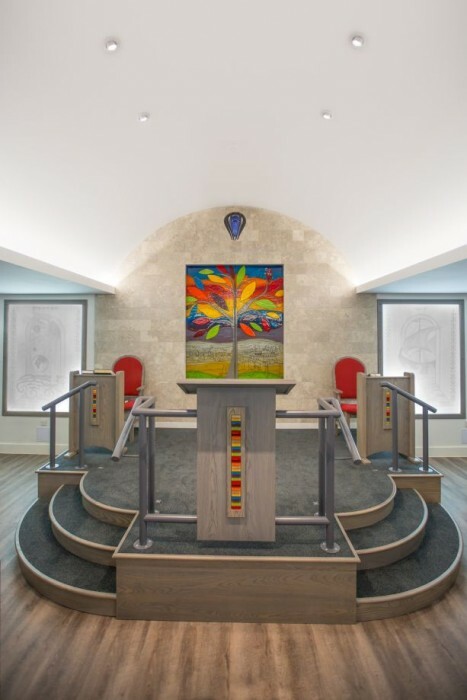 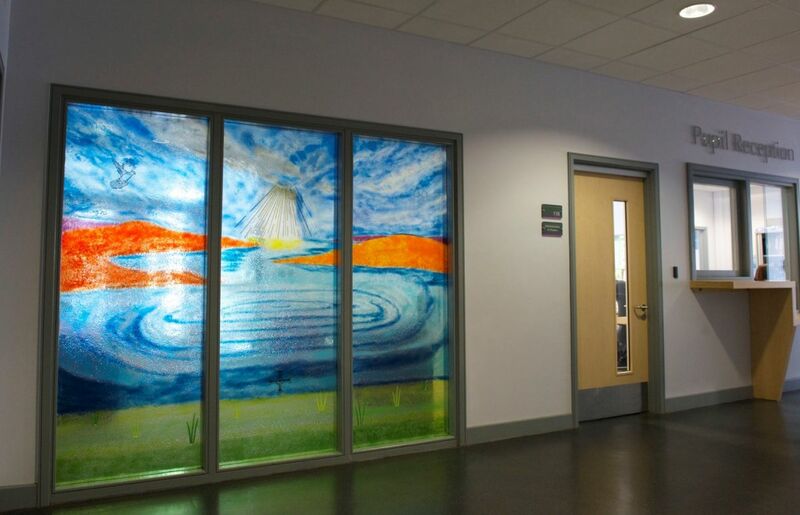 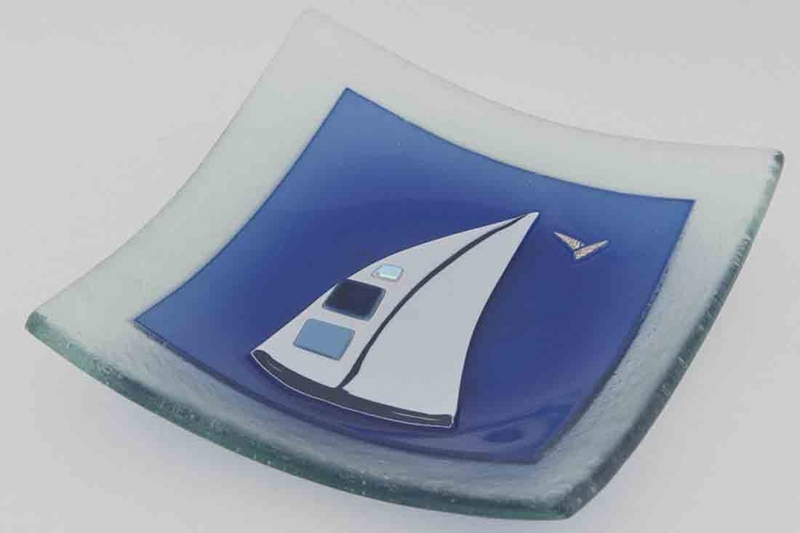 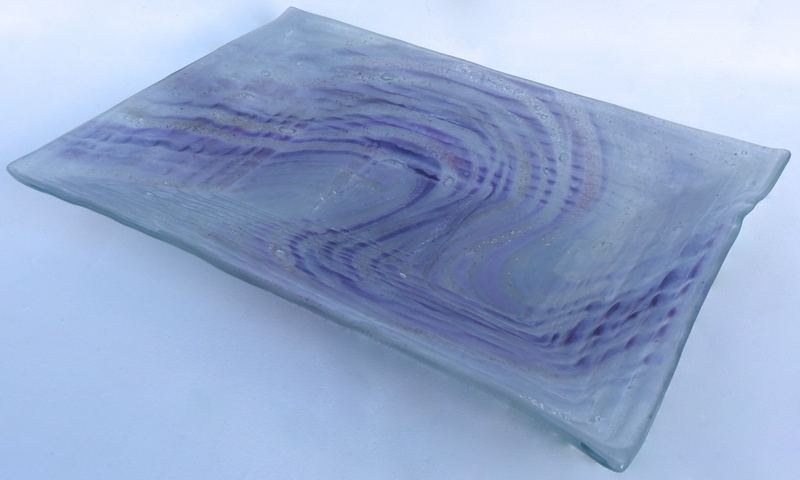 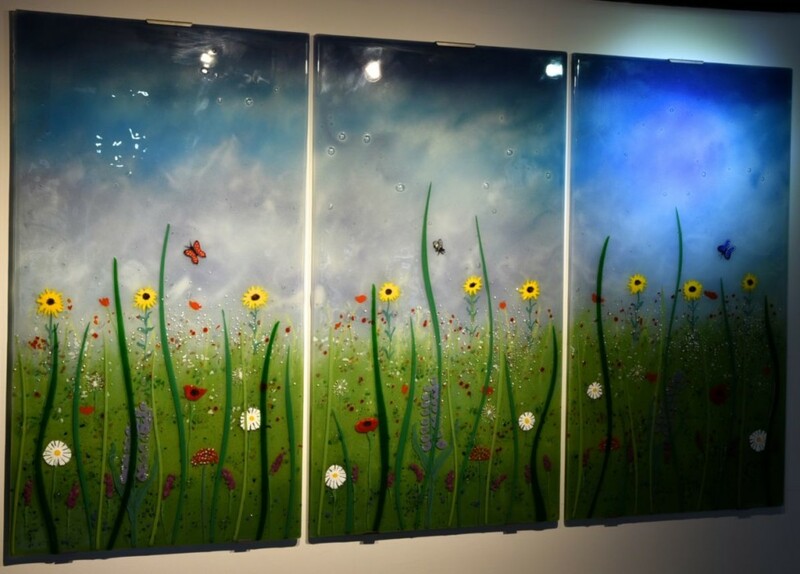 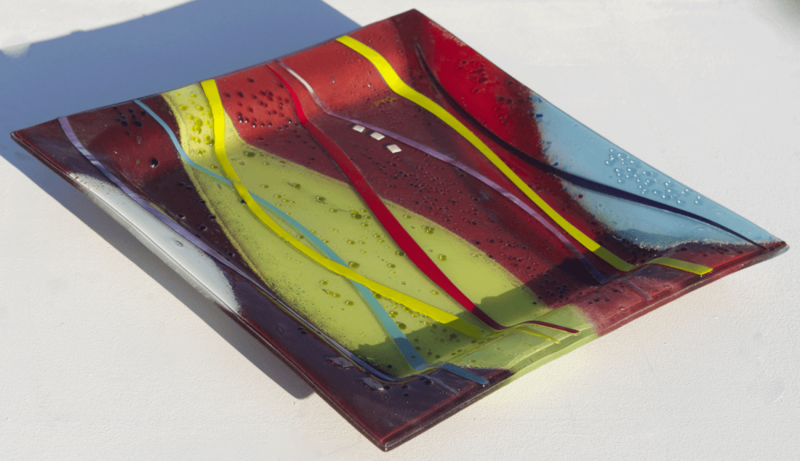 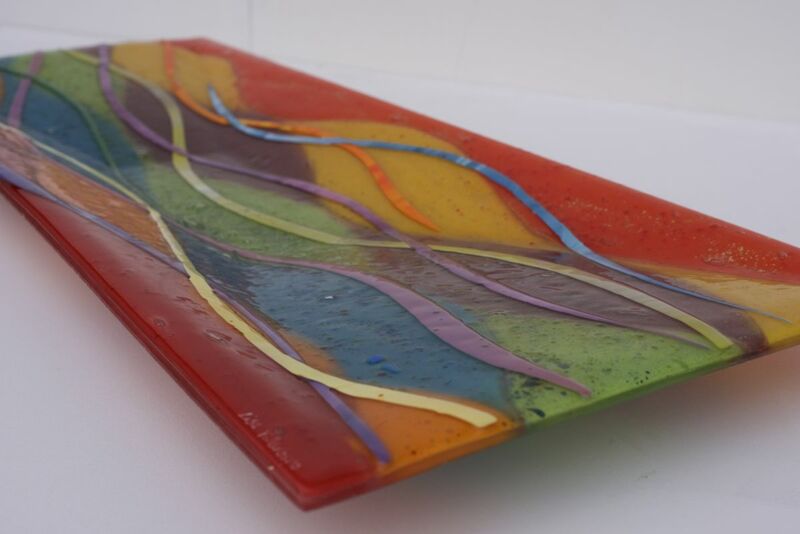 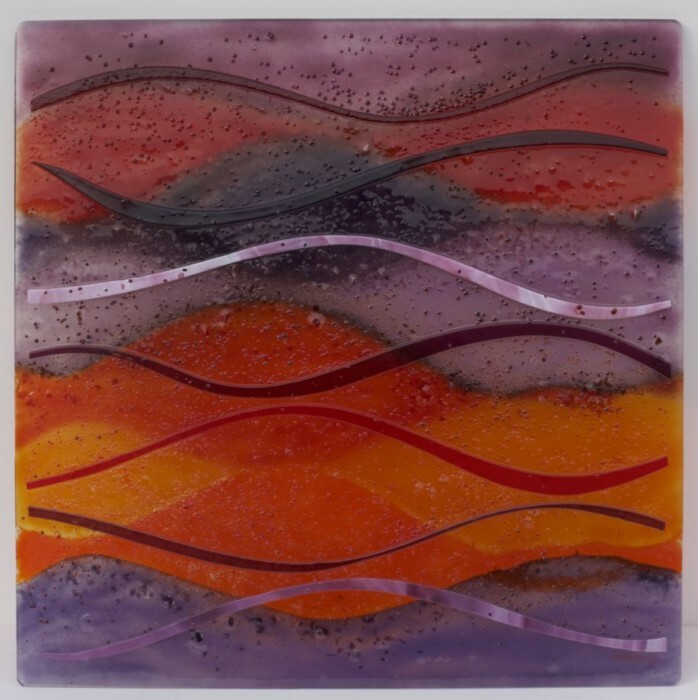 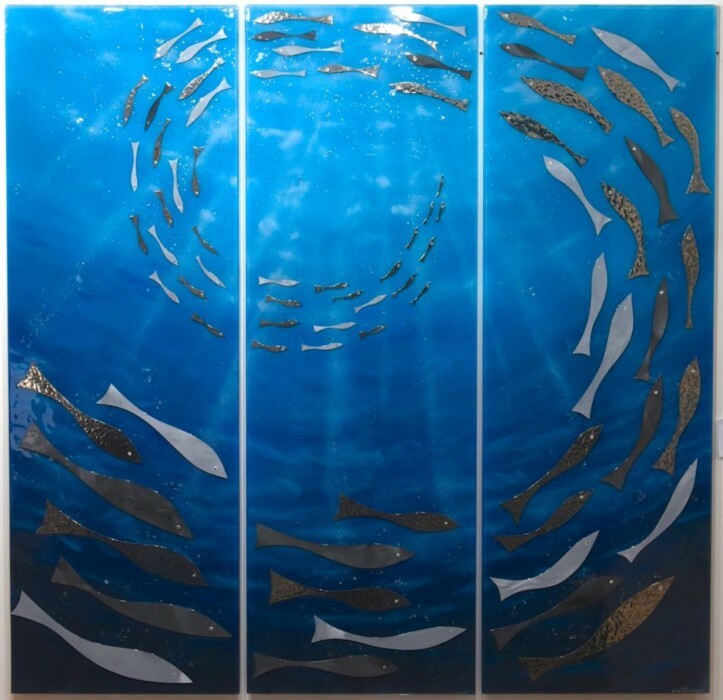 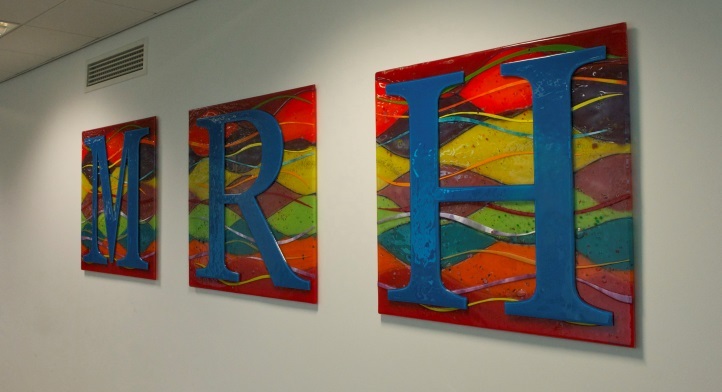 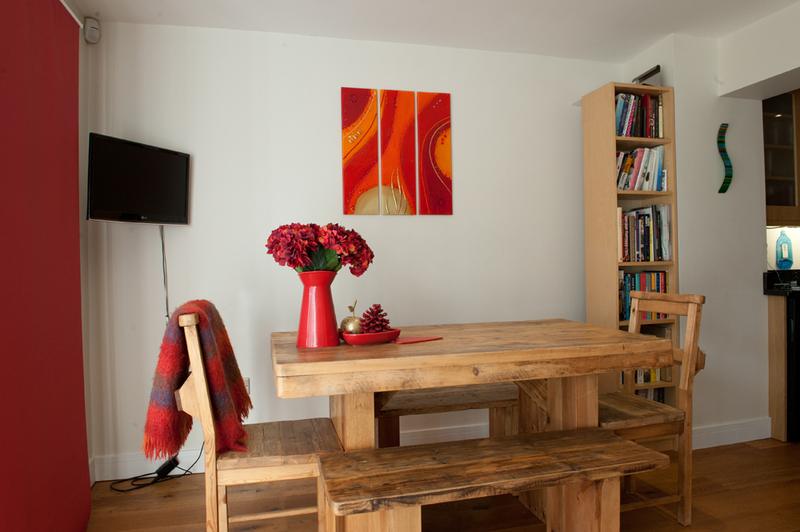 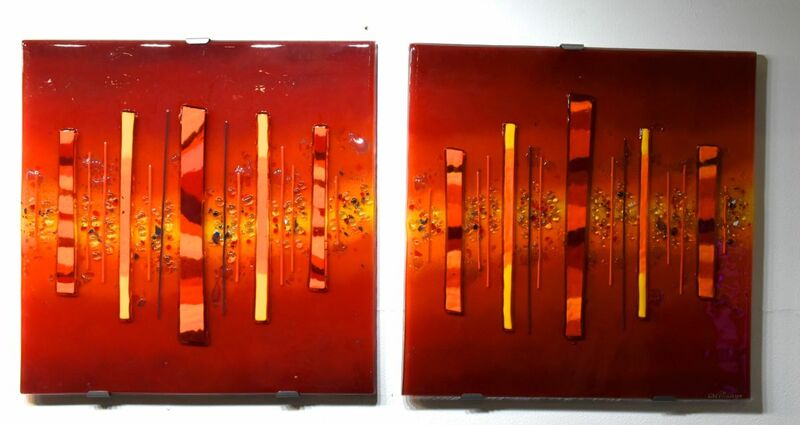 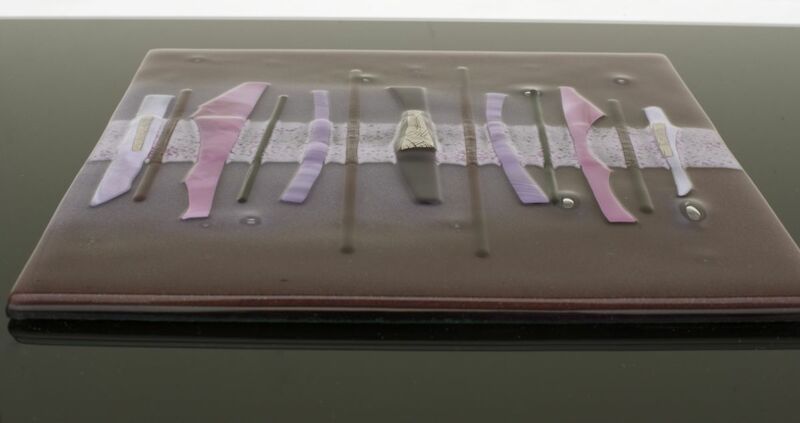 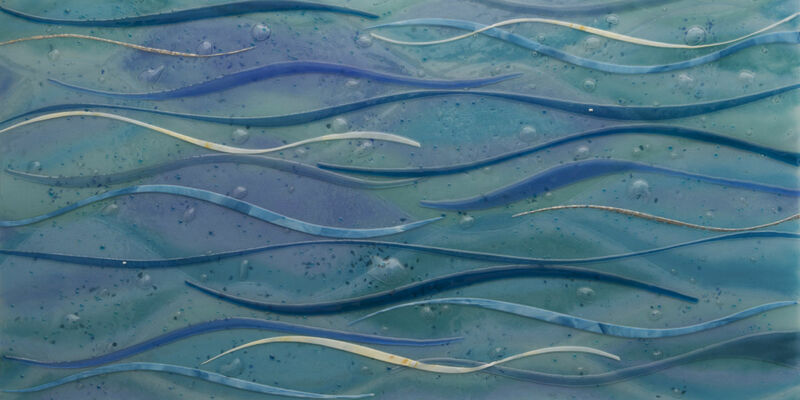 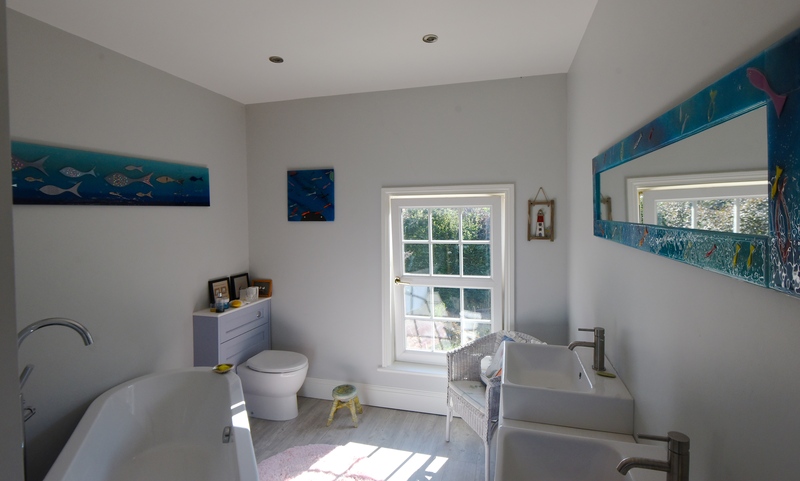 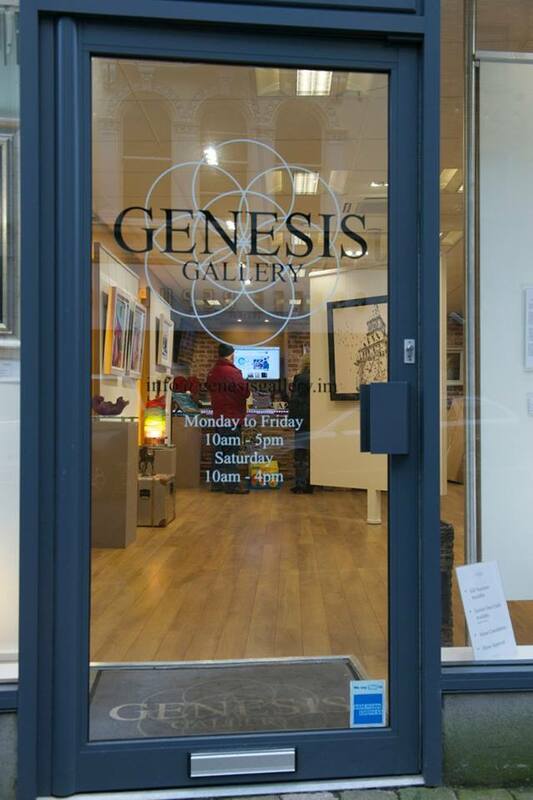 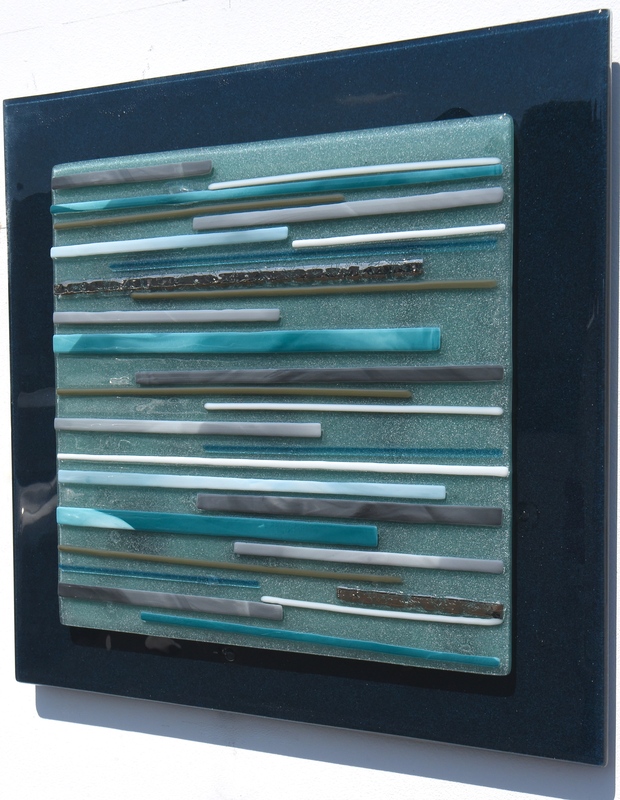 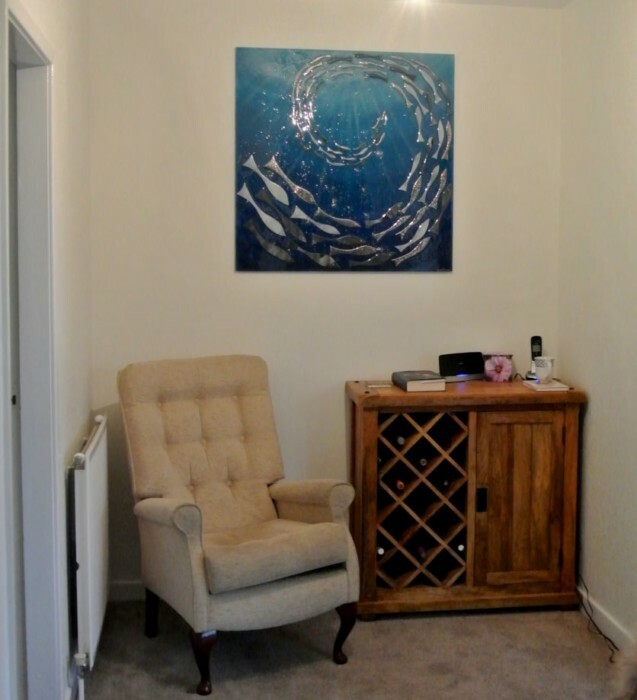 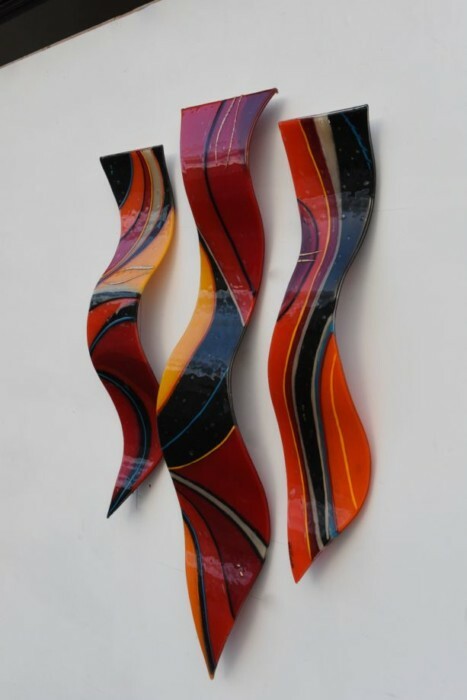 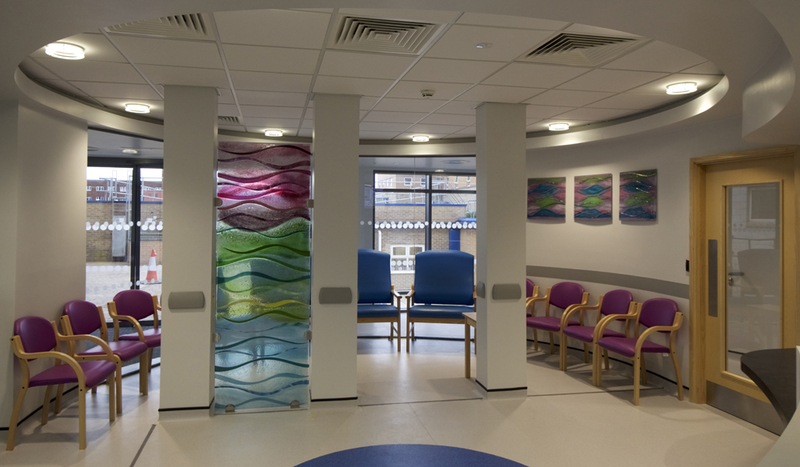 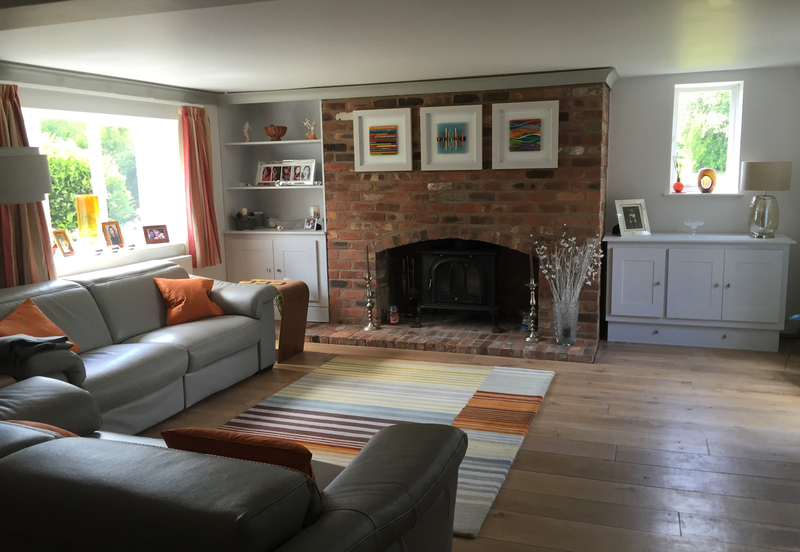 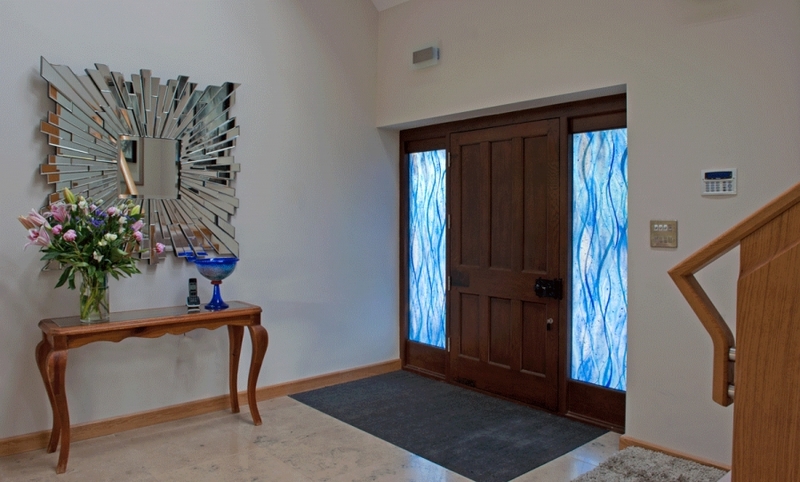 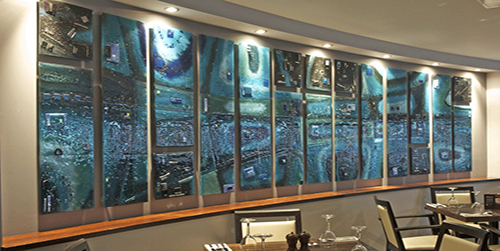 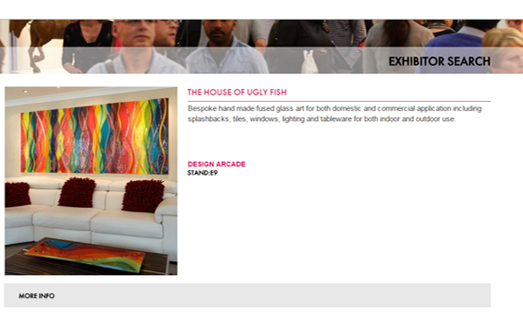 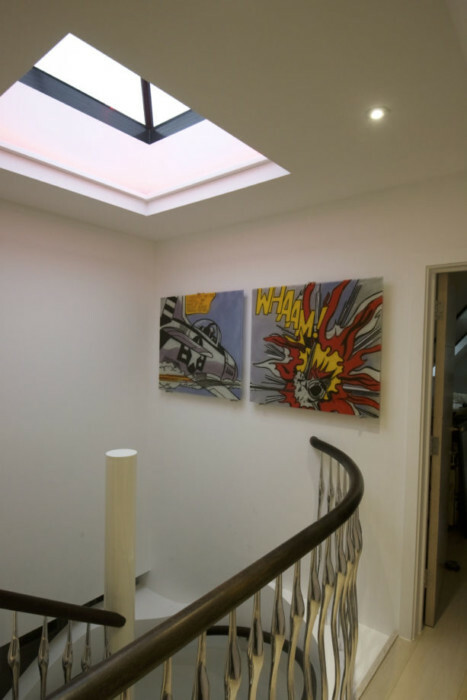 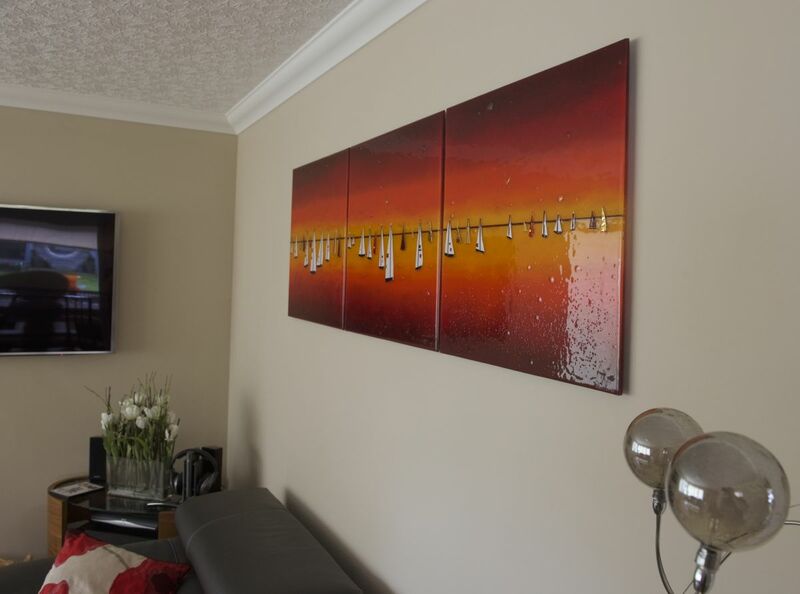 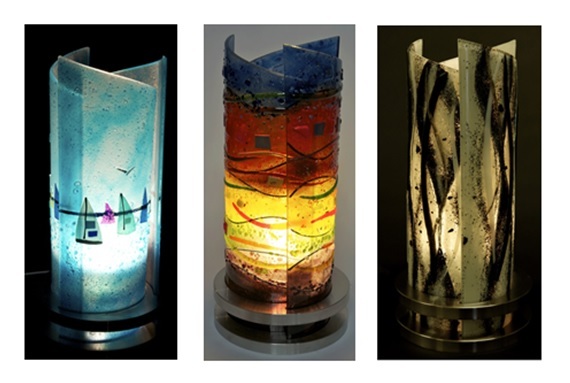 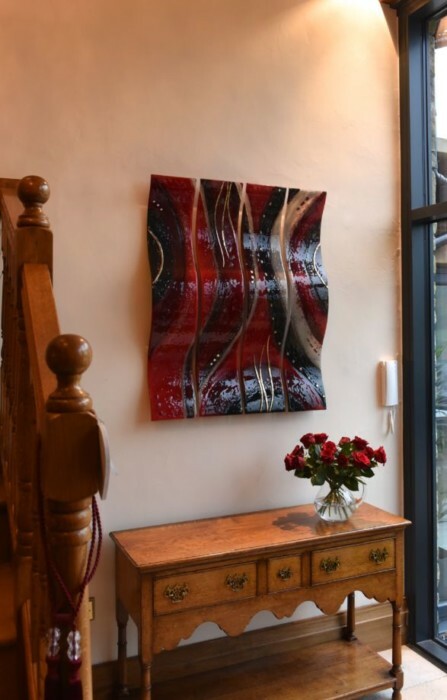 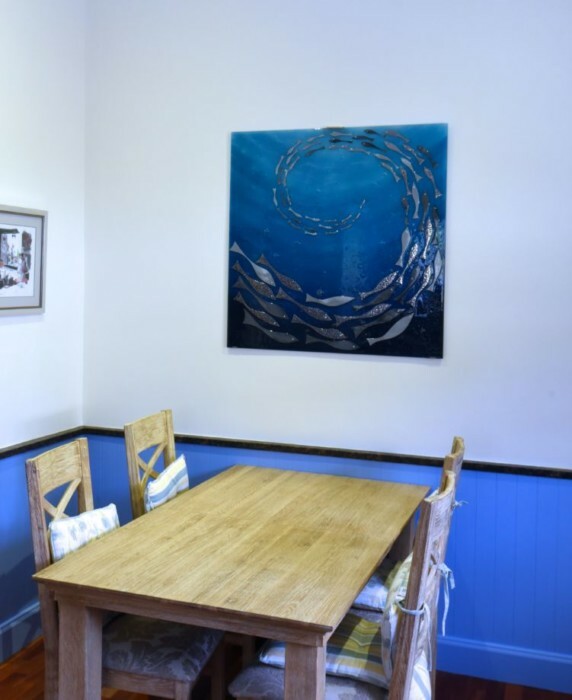 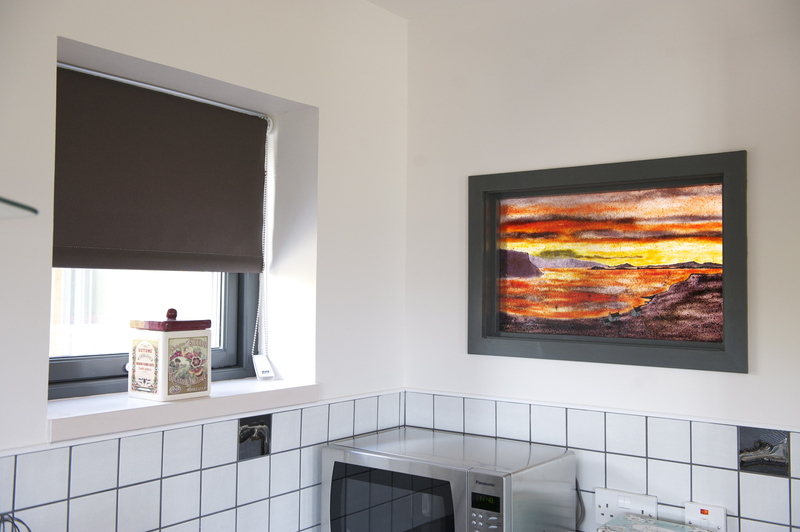 What’s more, getting in contact with us has never been easier, and there’s certainly never been a better time to get yourself a piece of fused glass art, so why wait? 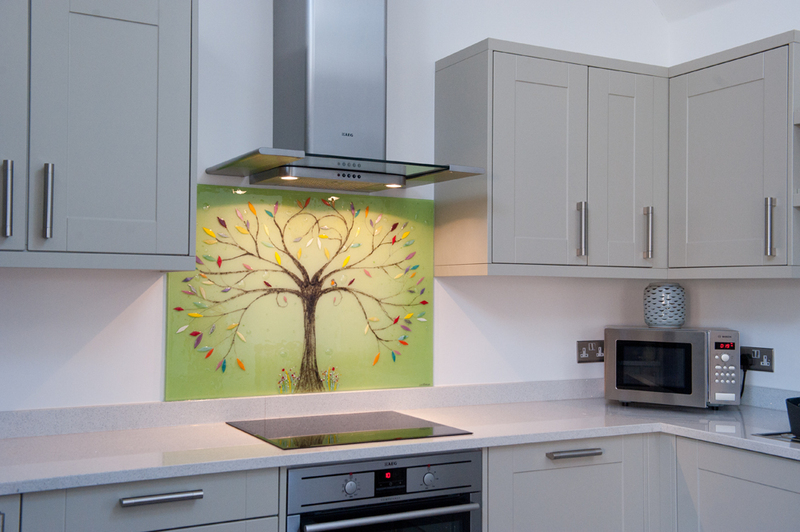 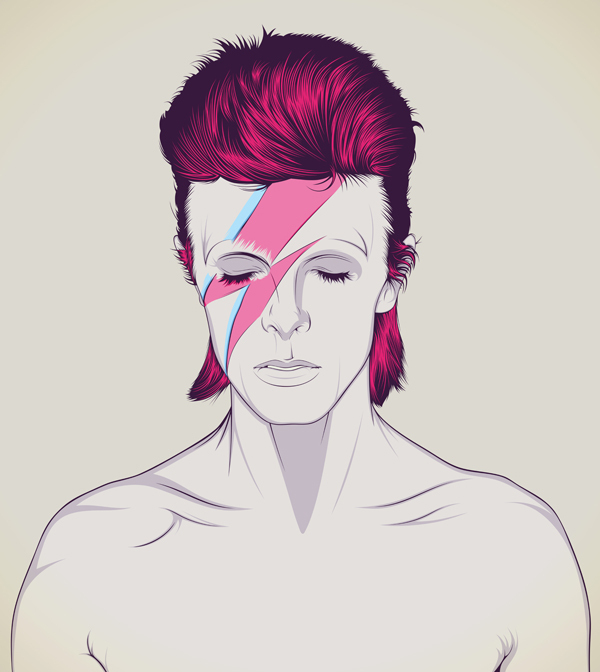 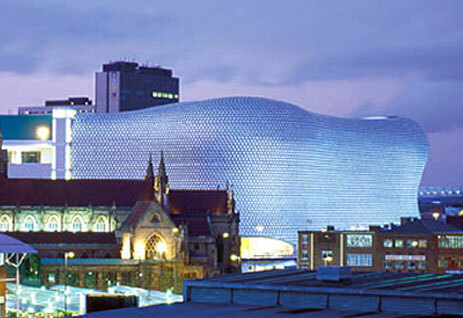 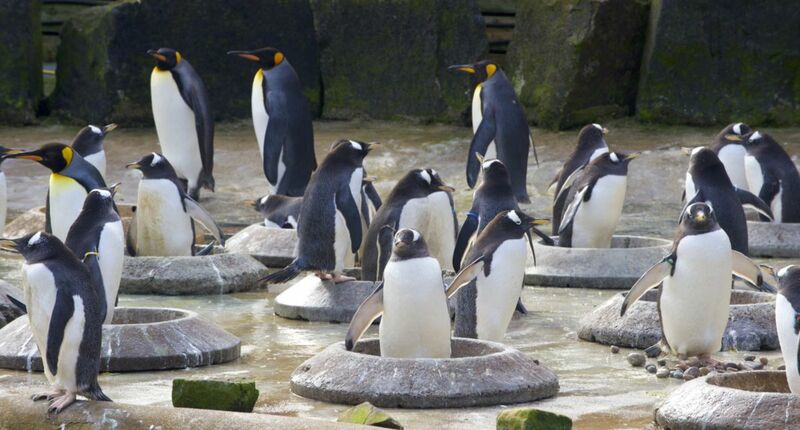 Pick up the phone or drop us an email, and we’ll soon be bringing your ideas to life. 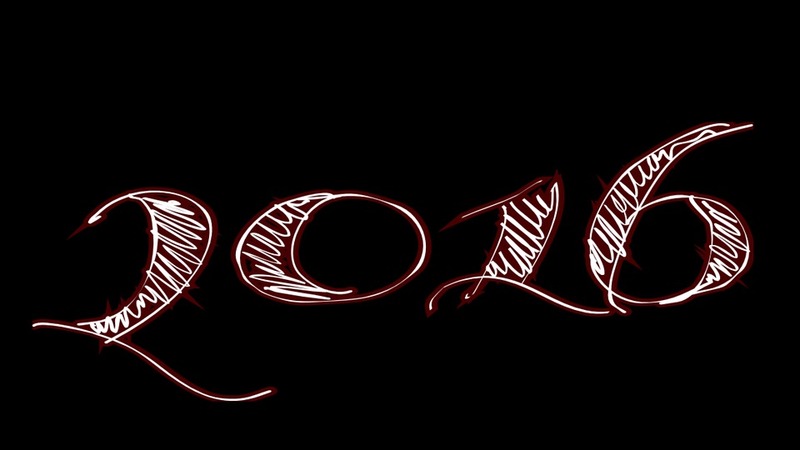 Hopefully, we’ll hear from you soon!